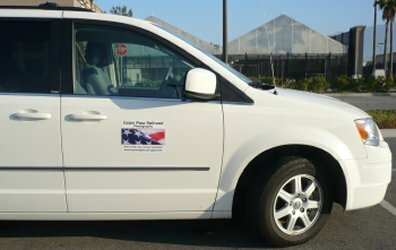 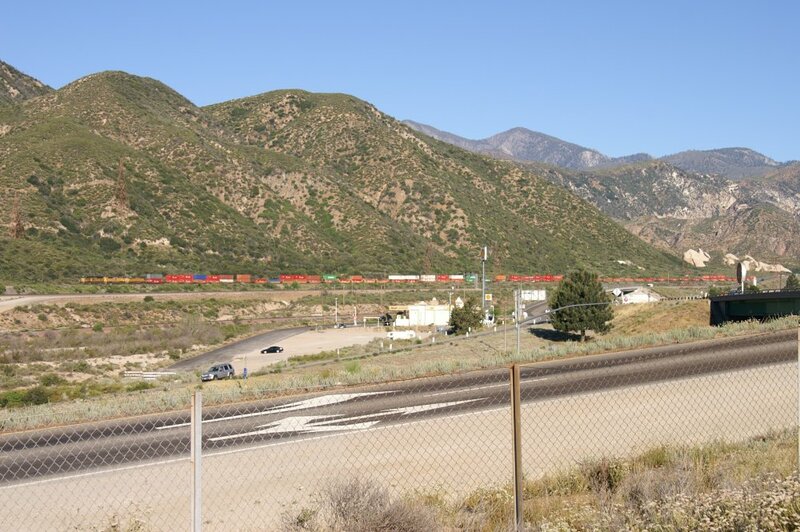 On day 5, I started my usual procedure driving Cajon Blvd. 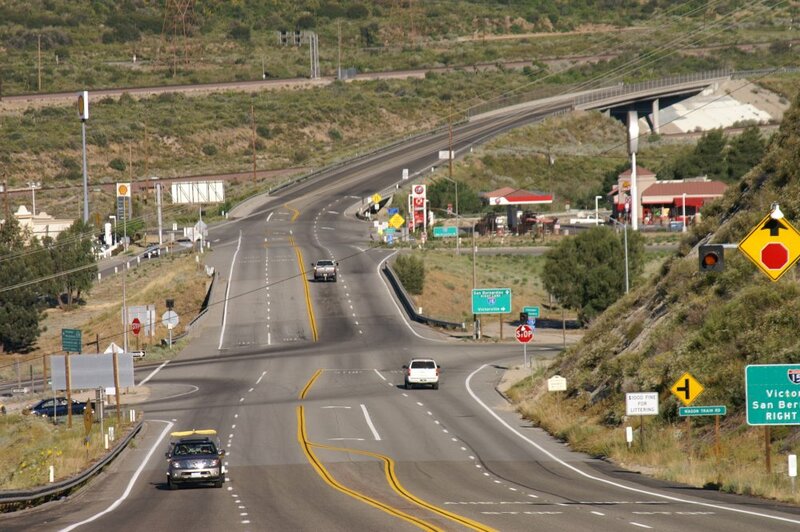 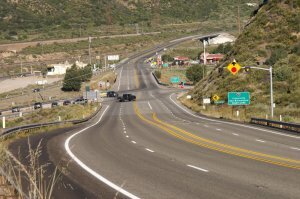 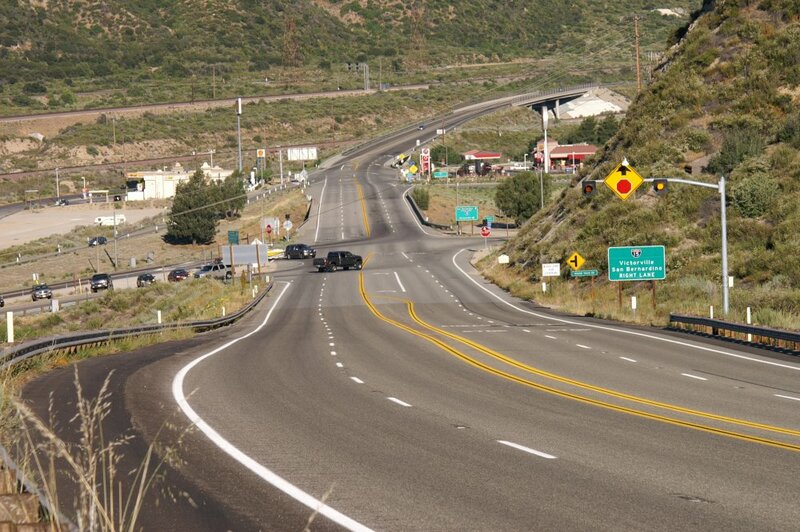 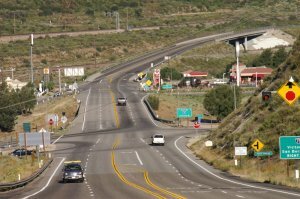 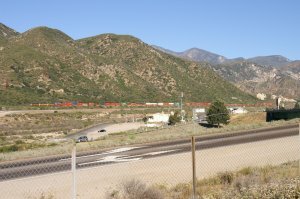 (old Route 66) from Kenwood Ave. Exit 124 (I-15) up to Hwy 138. 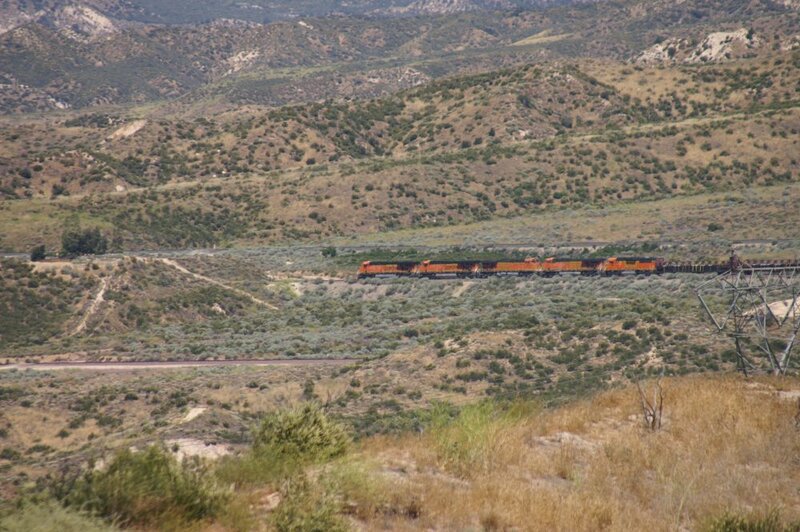 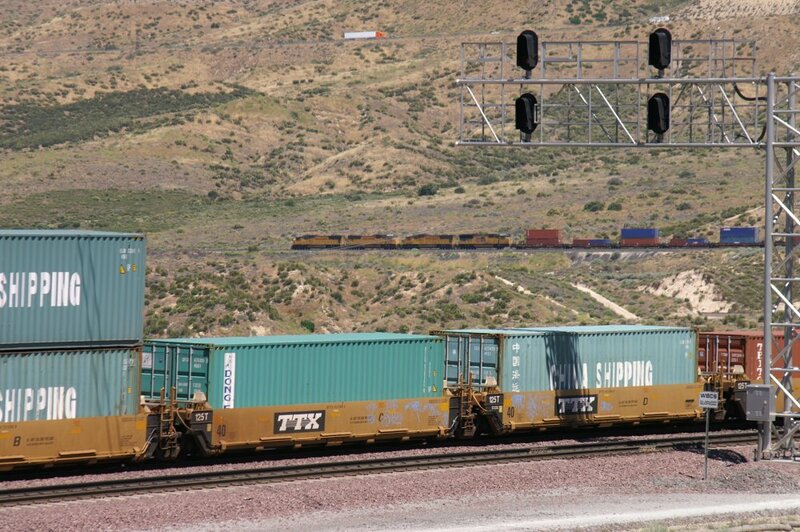 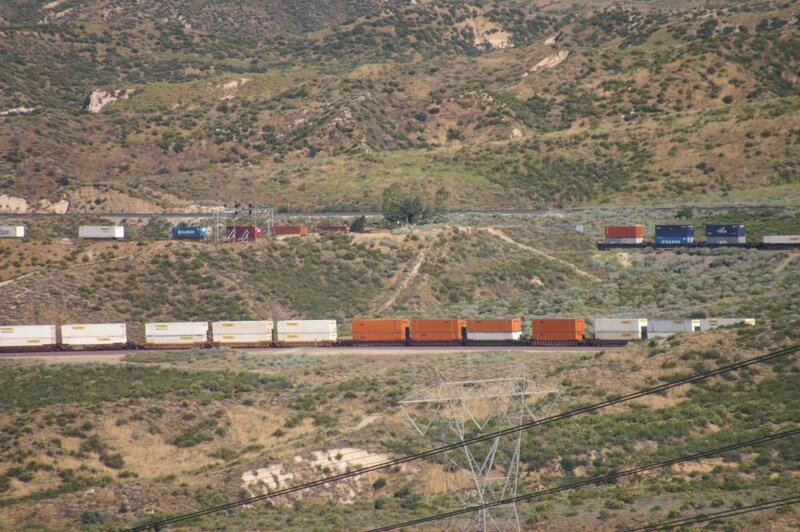 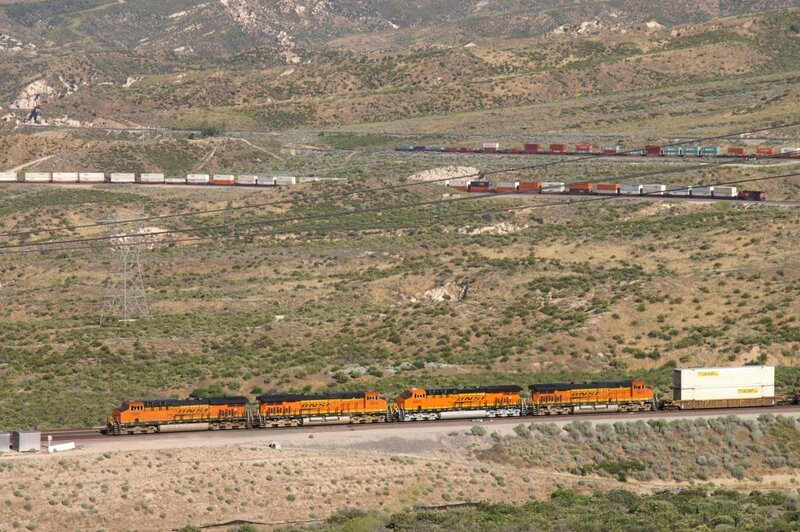 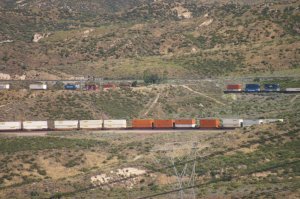 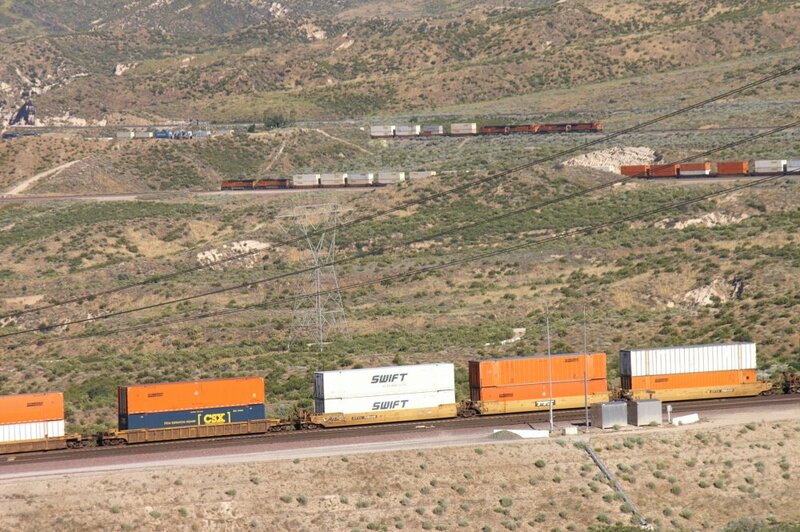 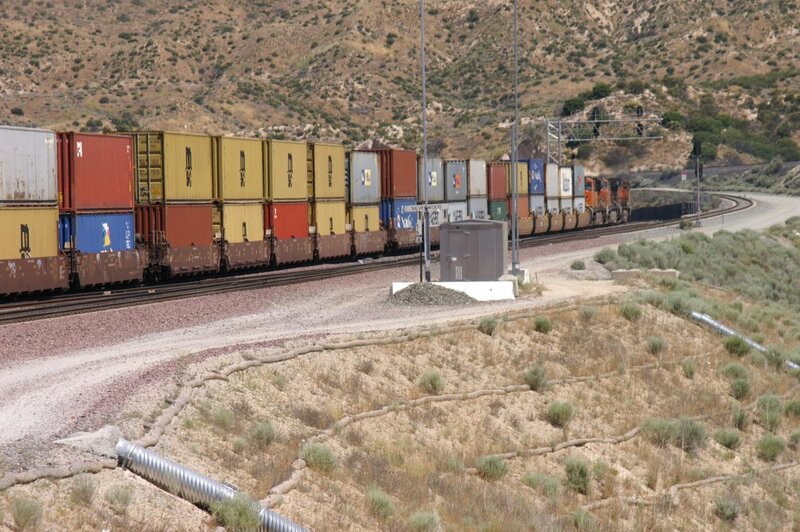 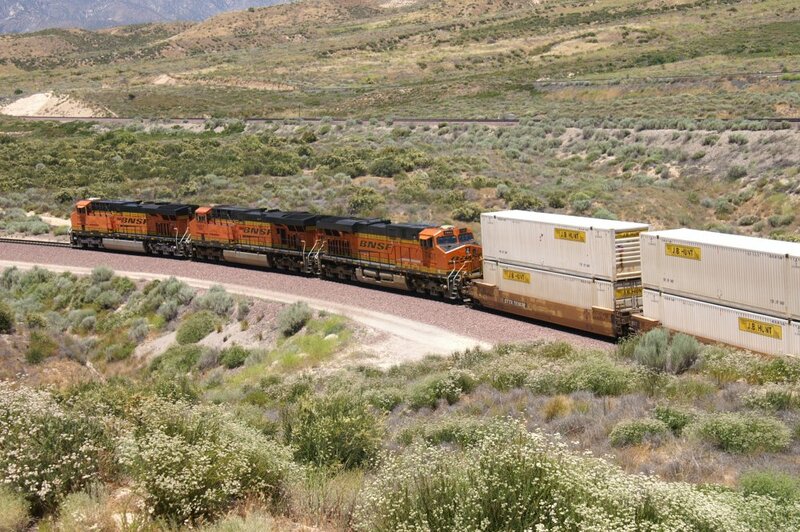 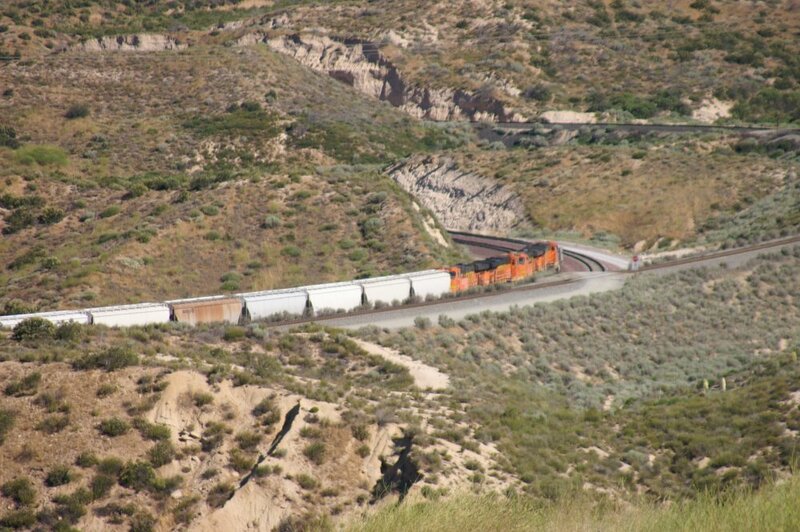 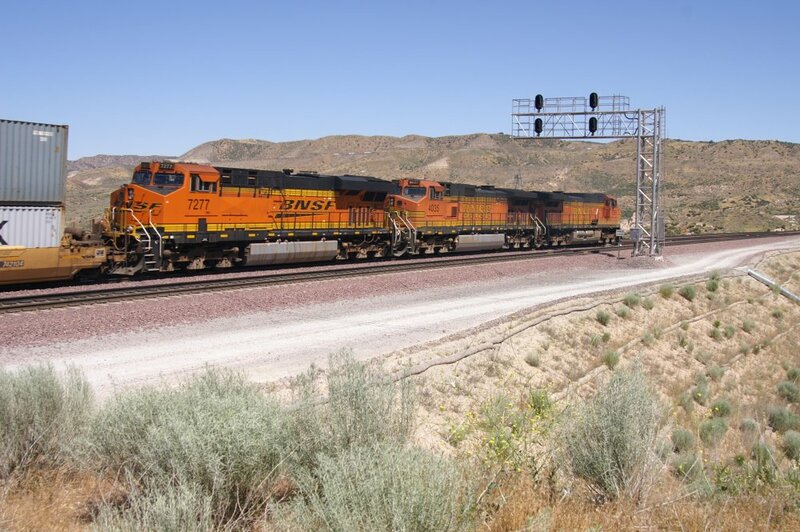 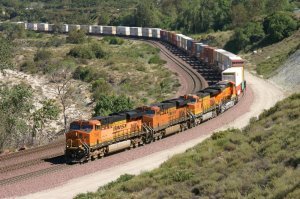 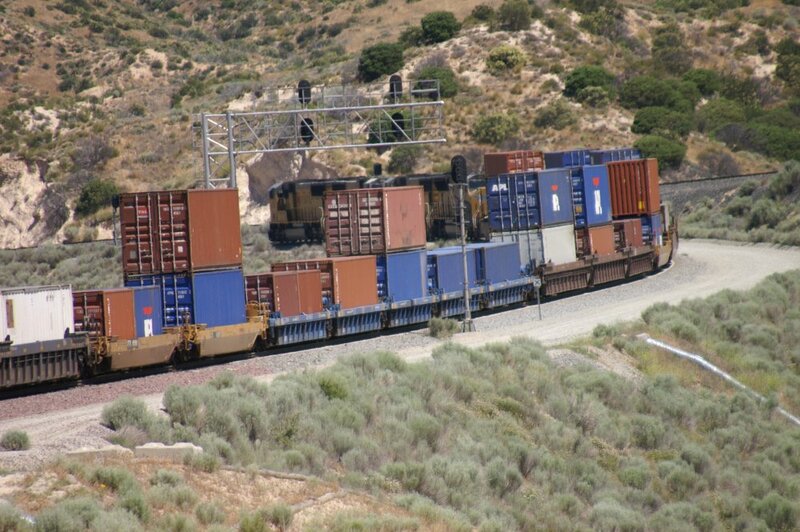 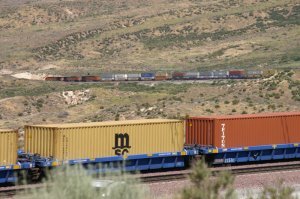 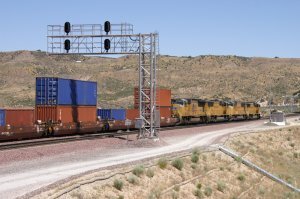 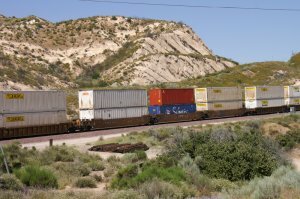 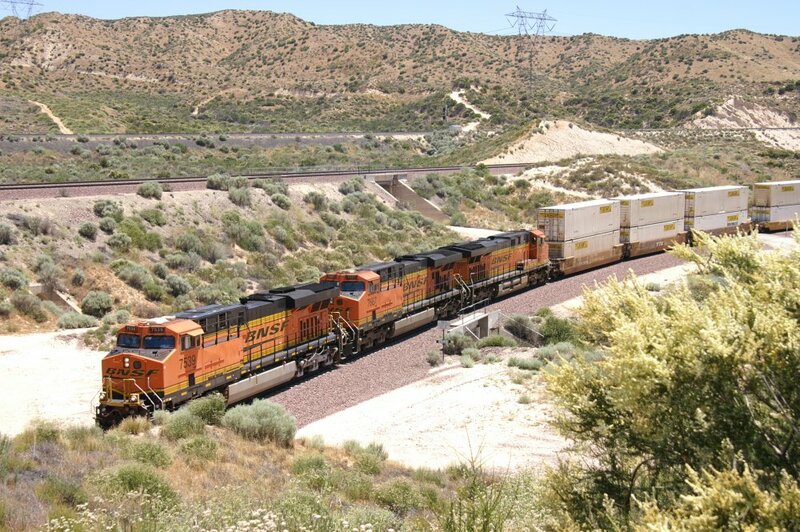 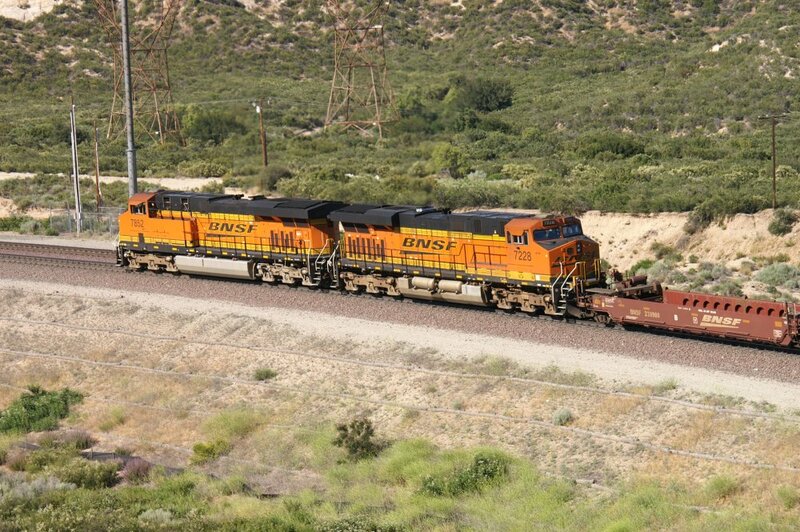 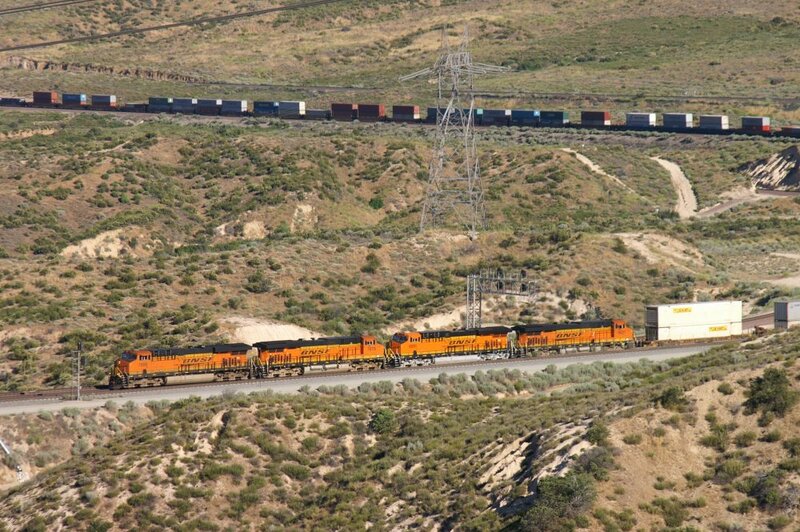 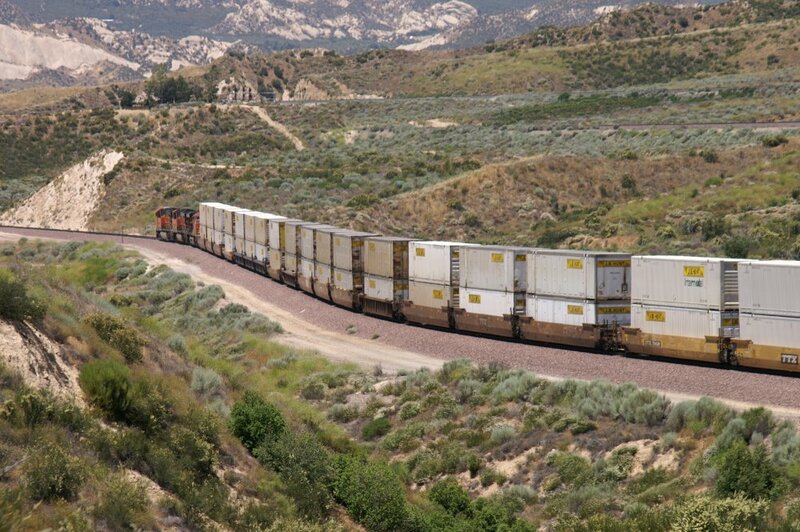 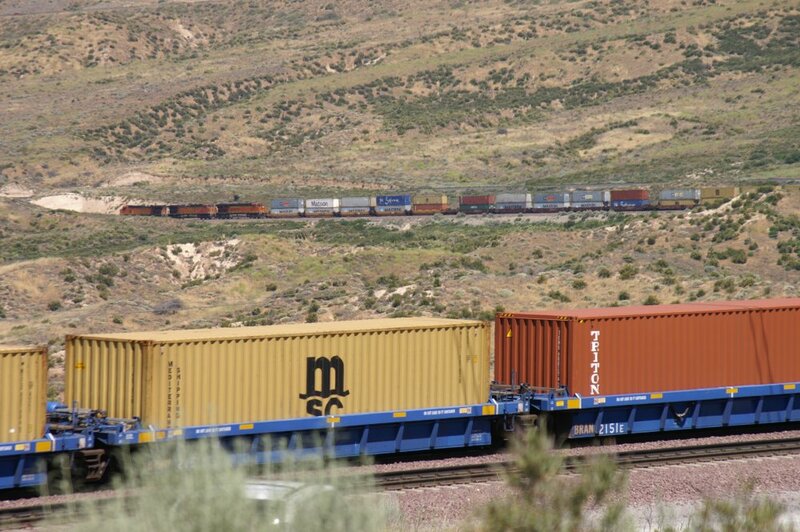 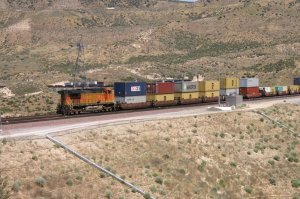 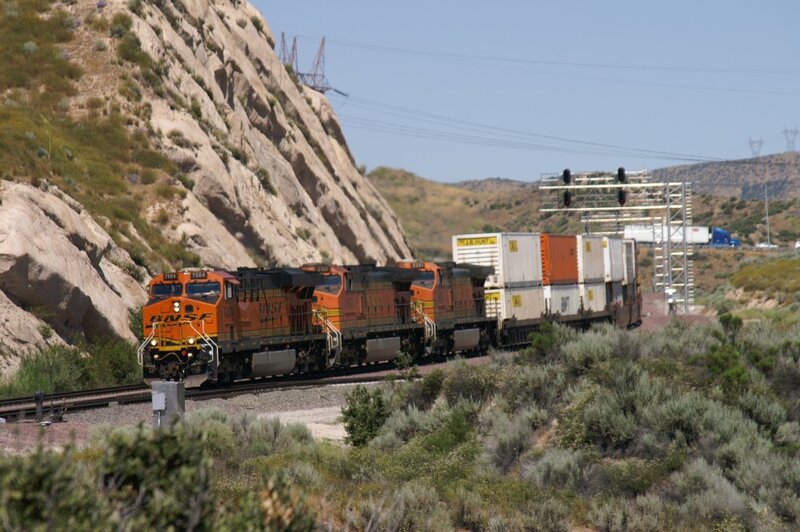 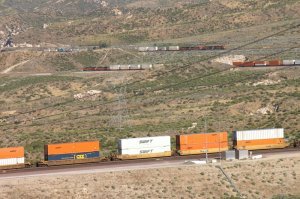 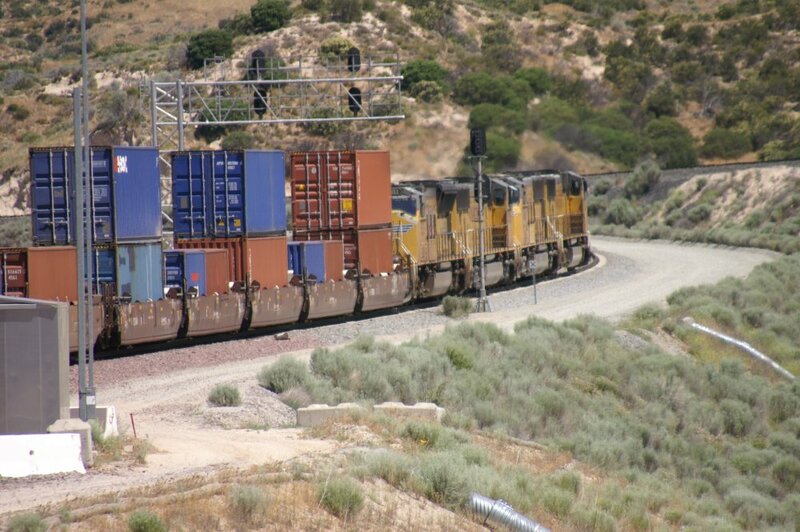 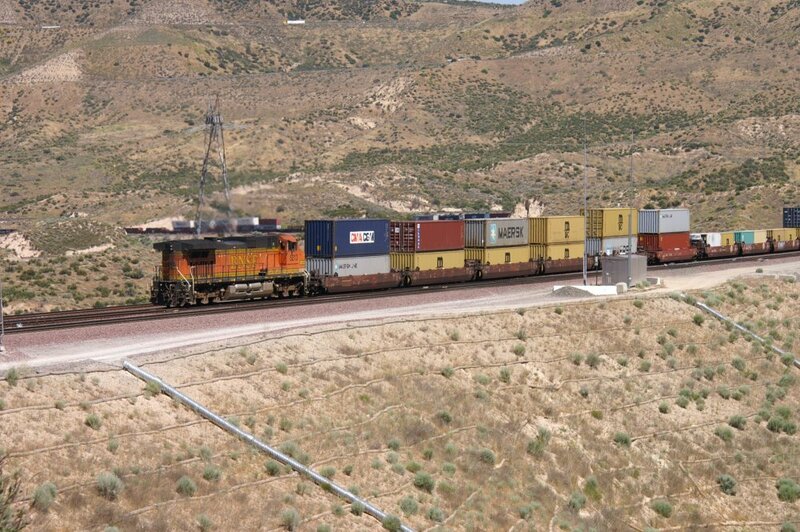 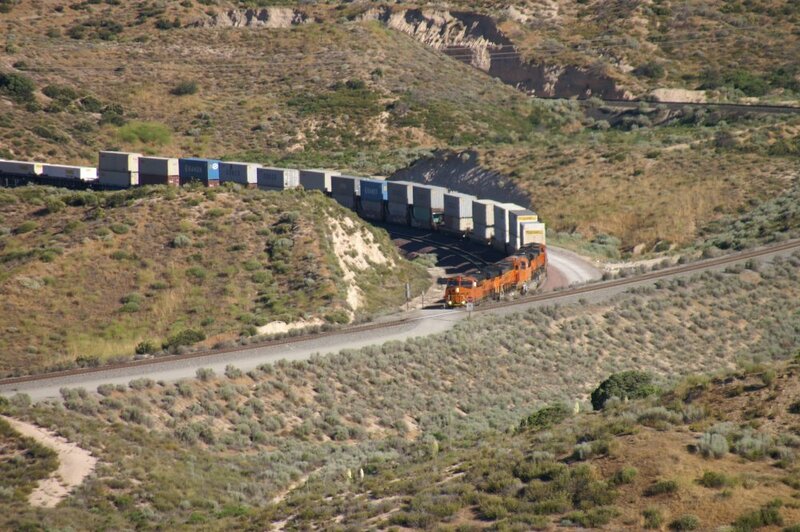 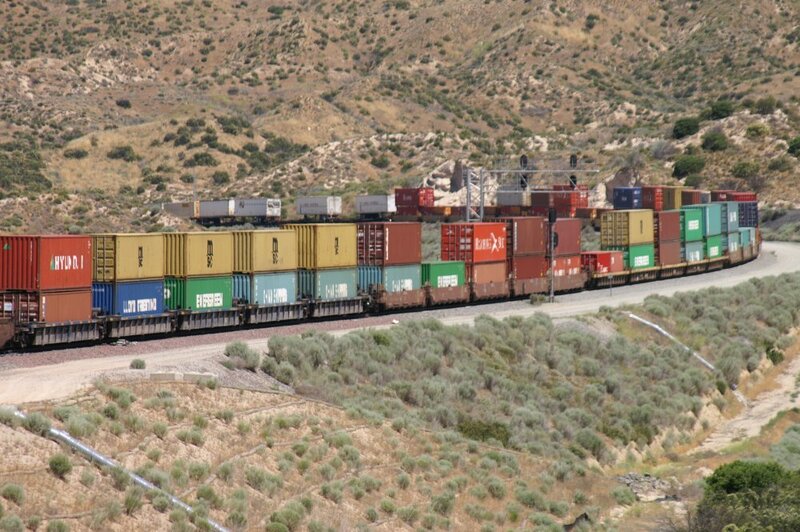 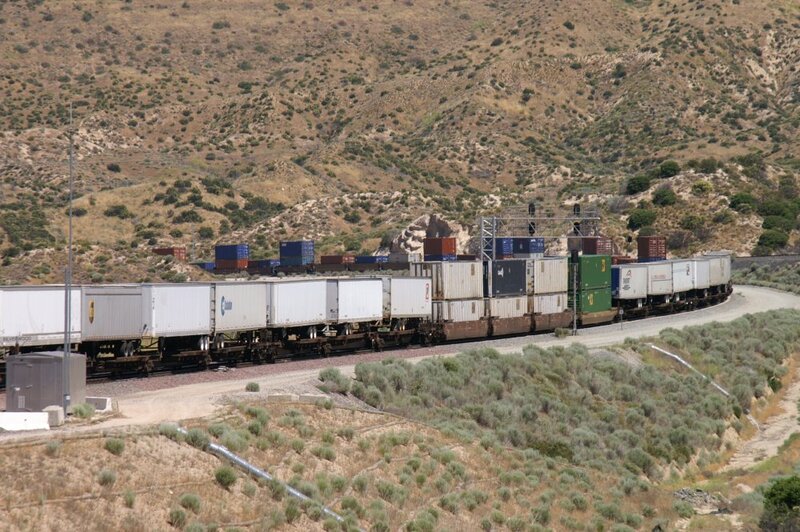 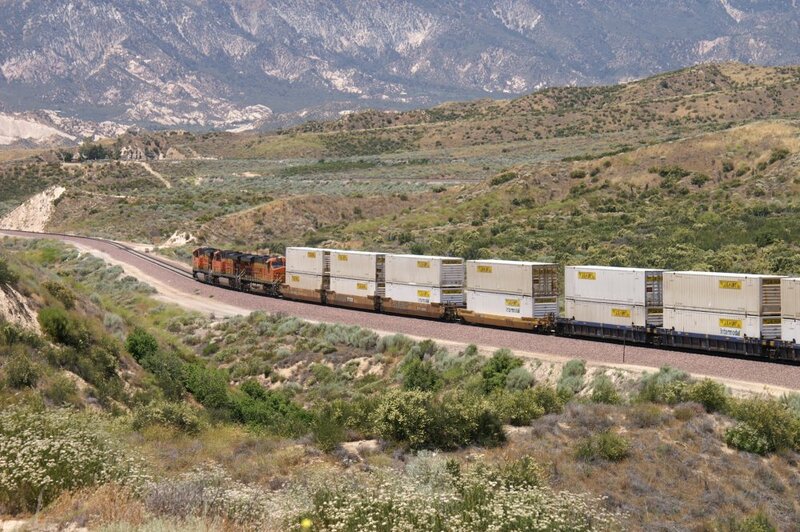 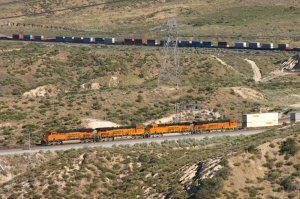 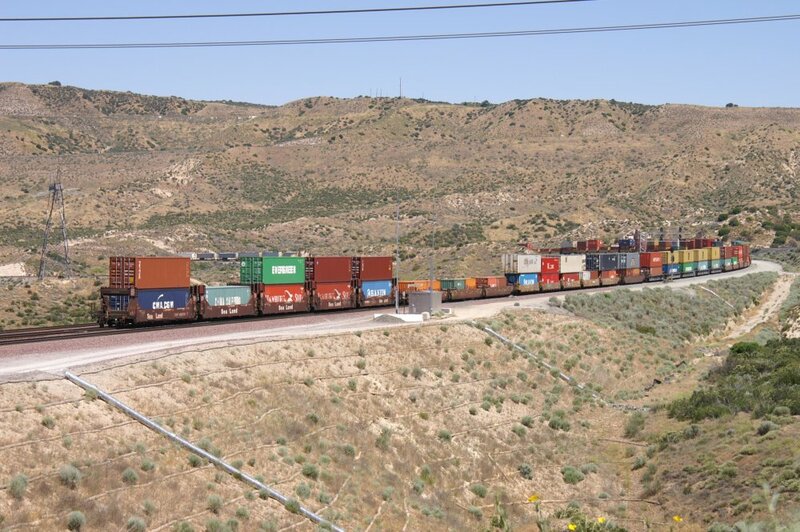 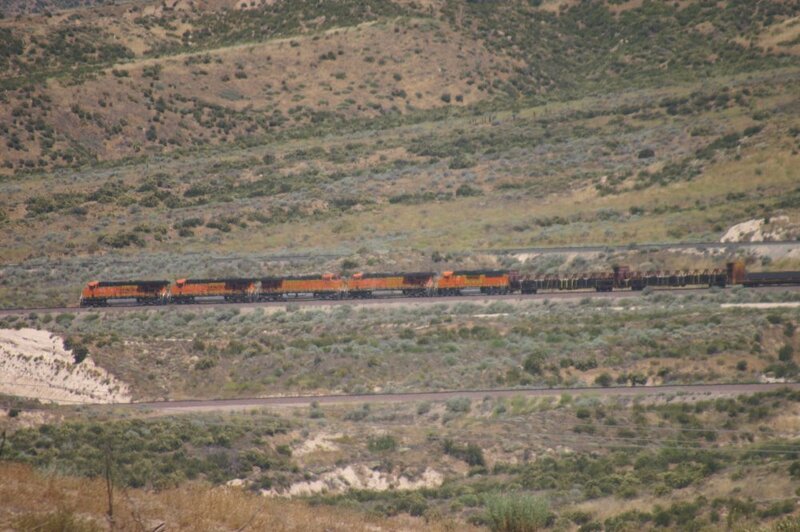 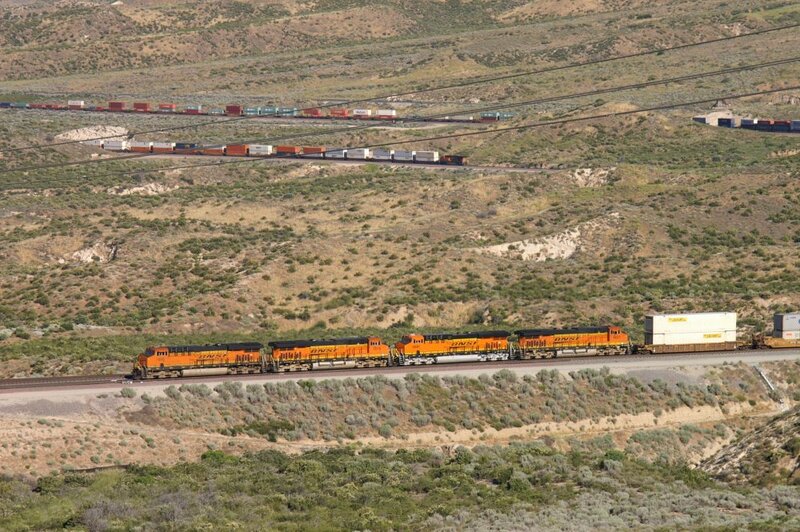 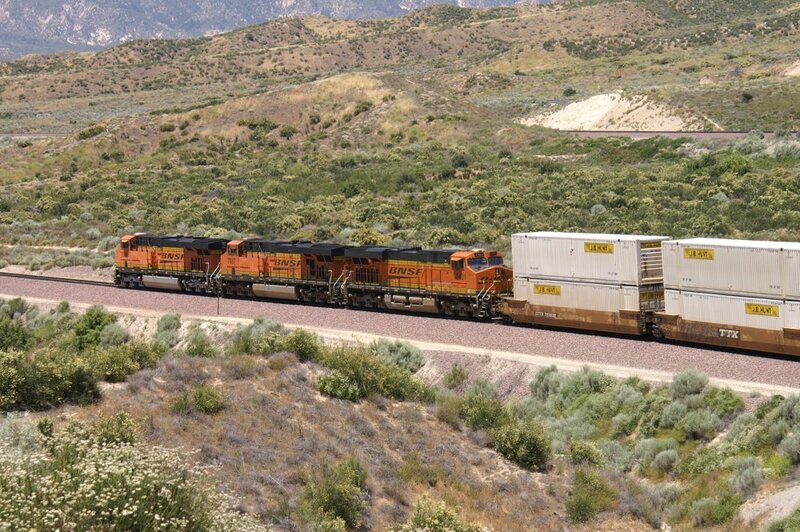 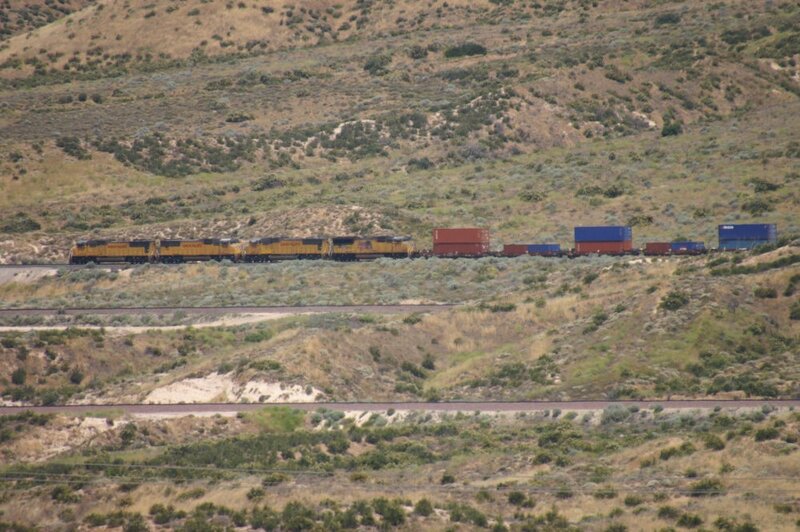 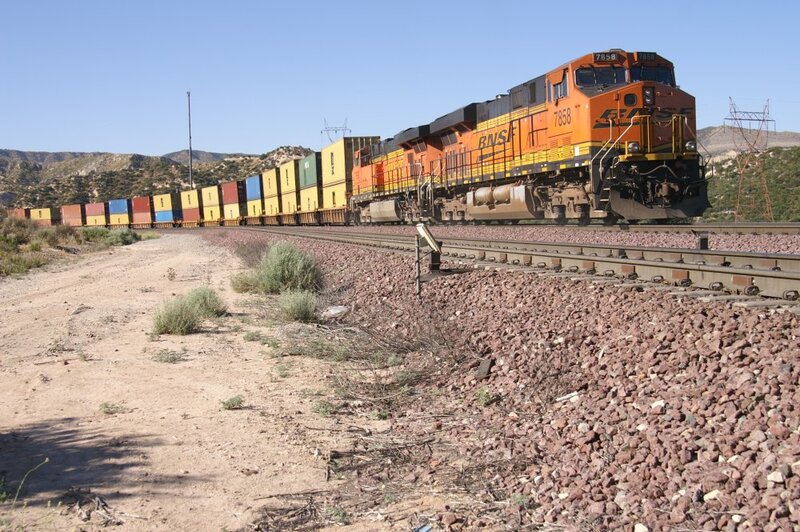 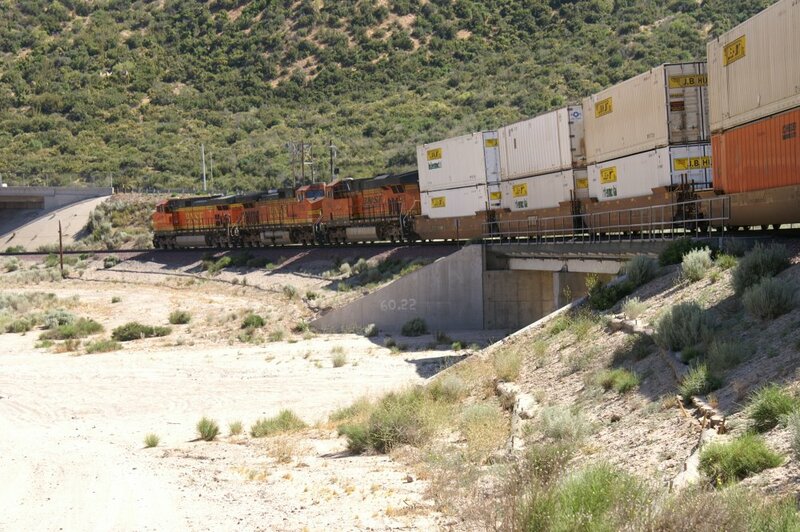 At 06.51 h, a BNSF EB Intermodal Trains is going uphill. 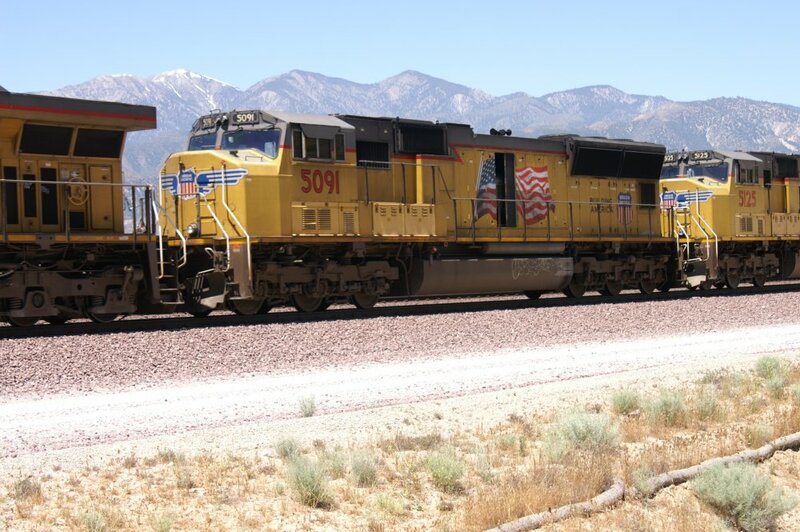 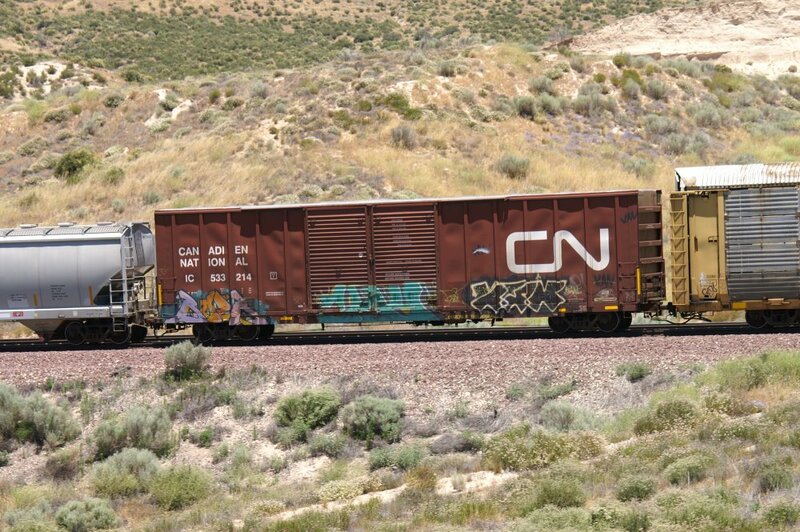 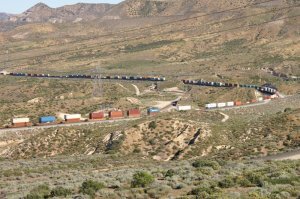 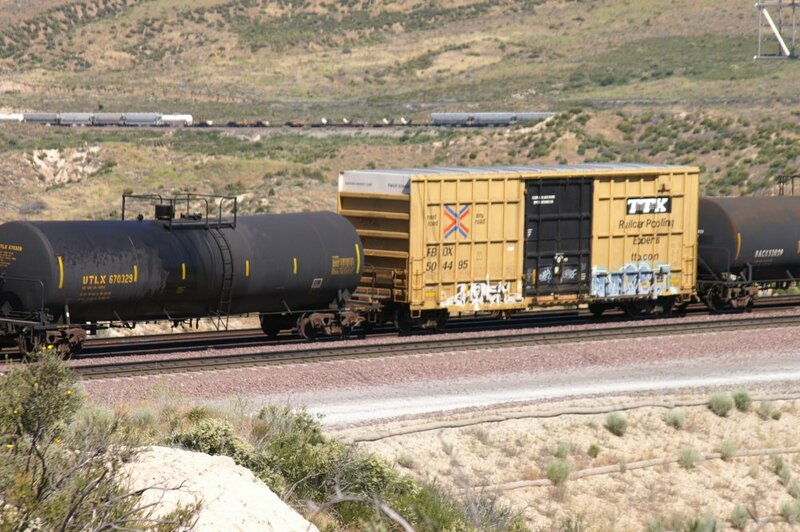 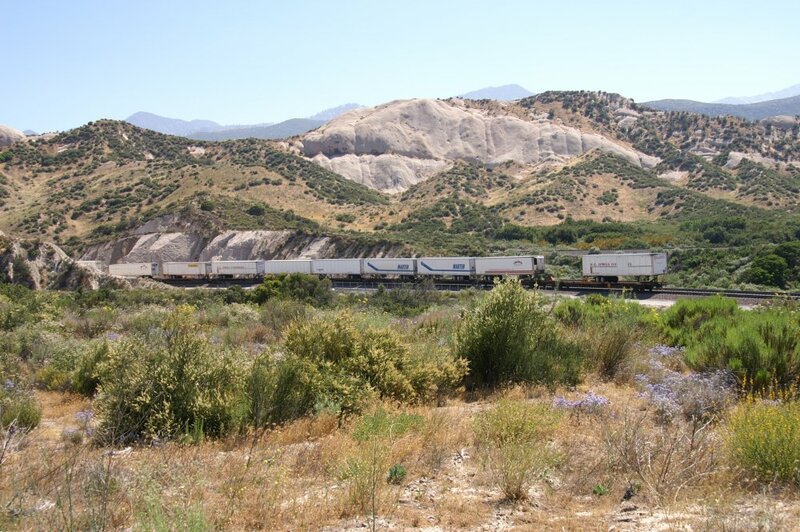 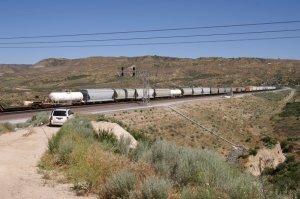 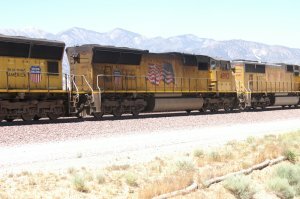 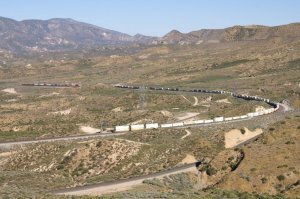 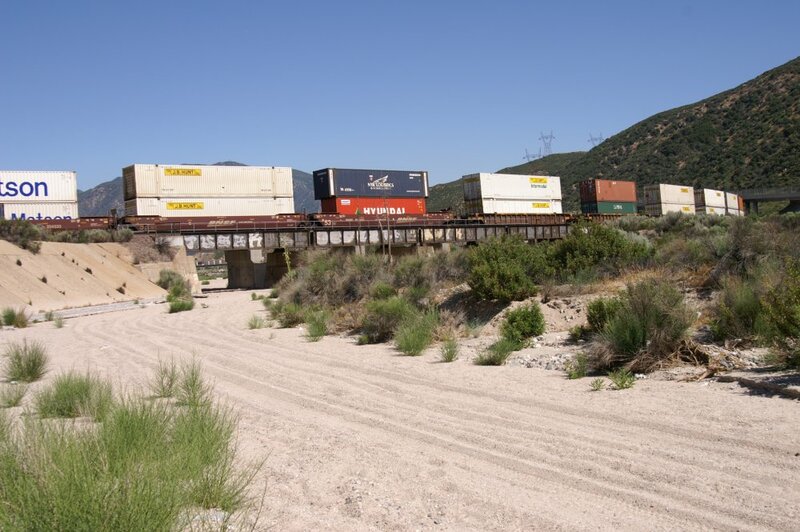 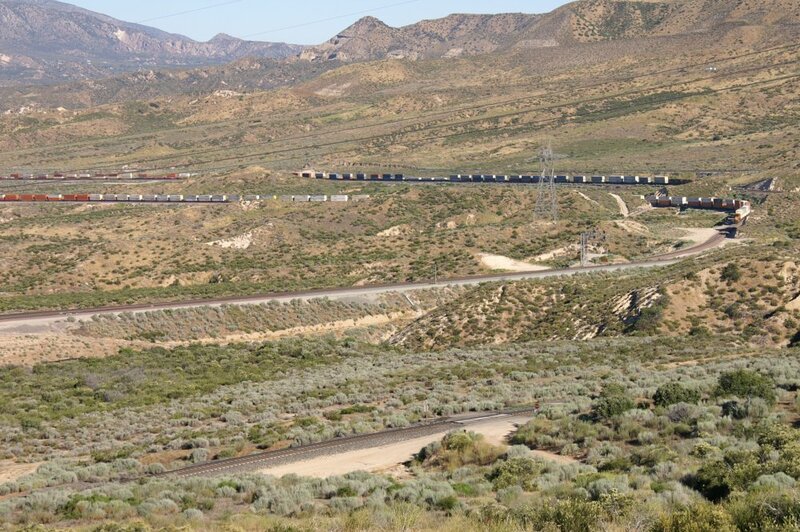 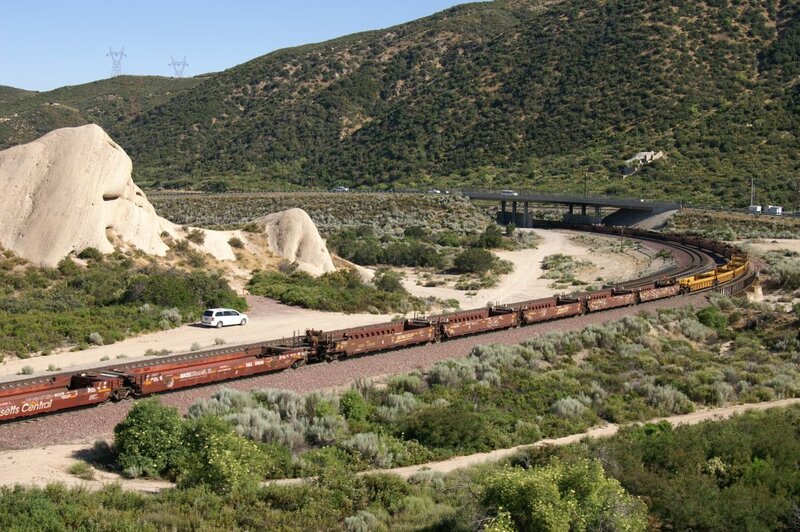 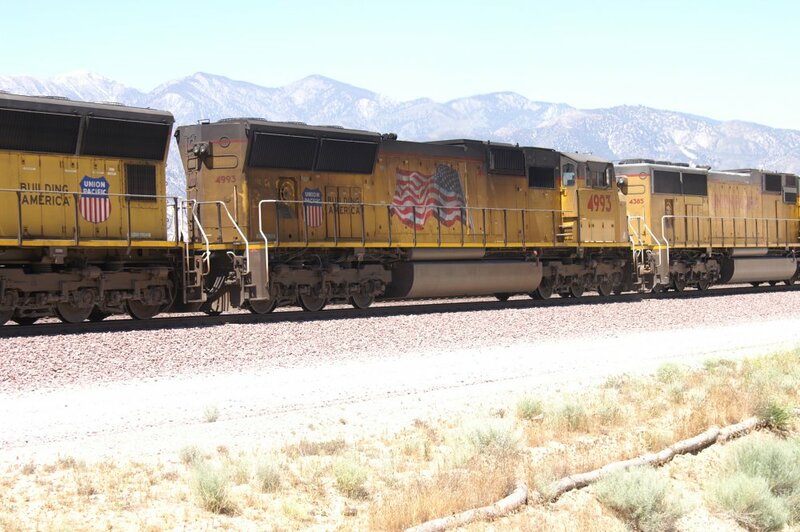 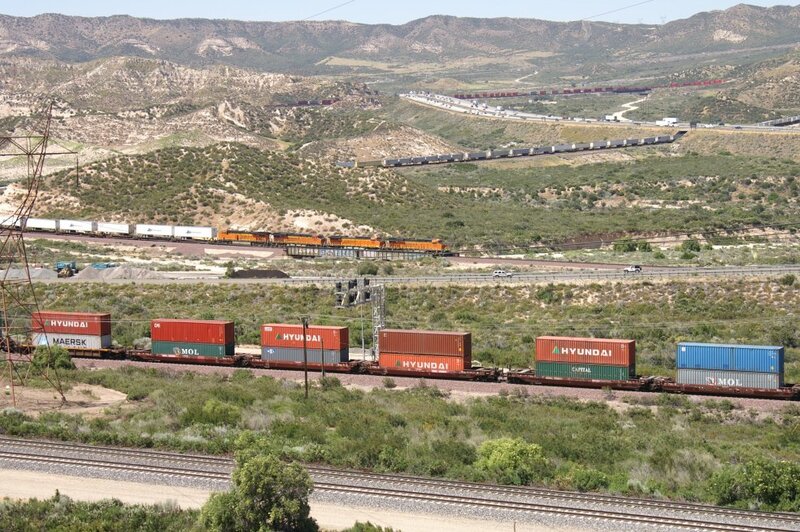 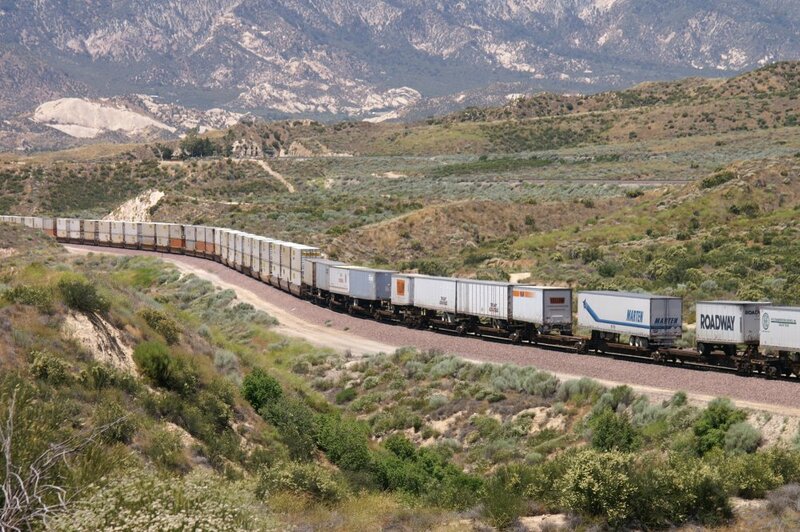 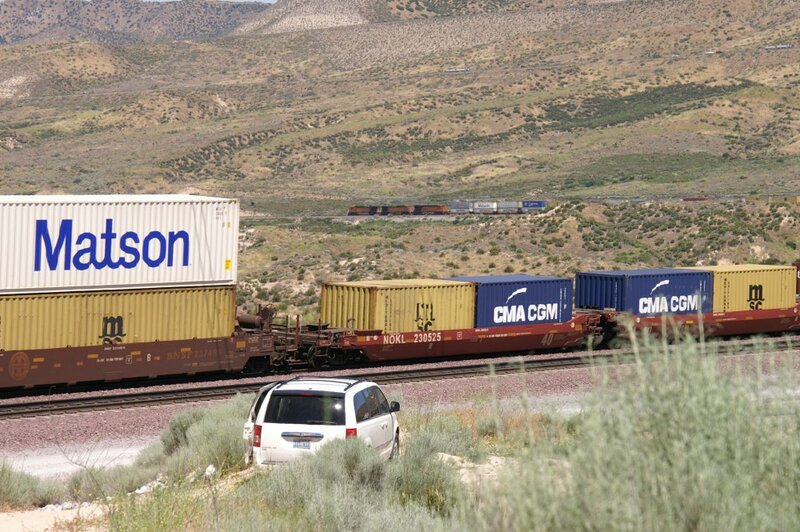 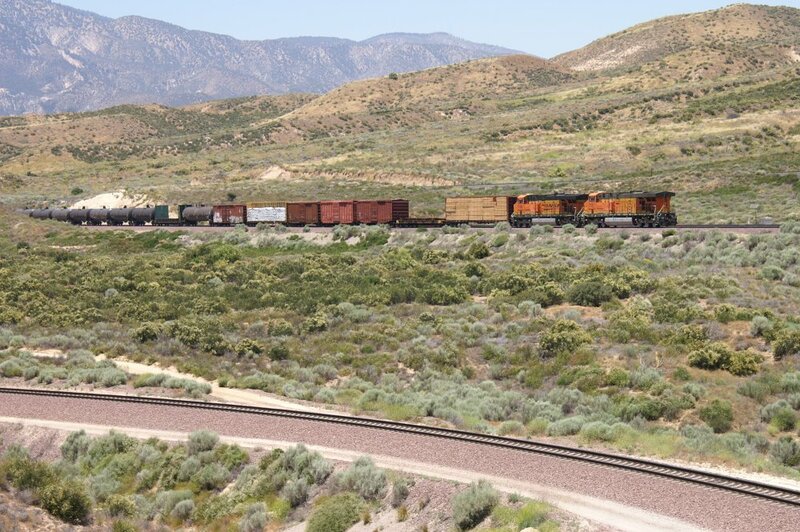 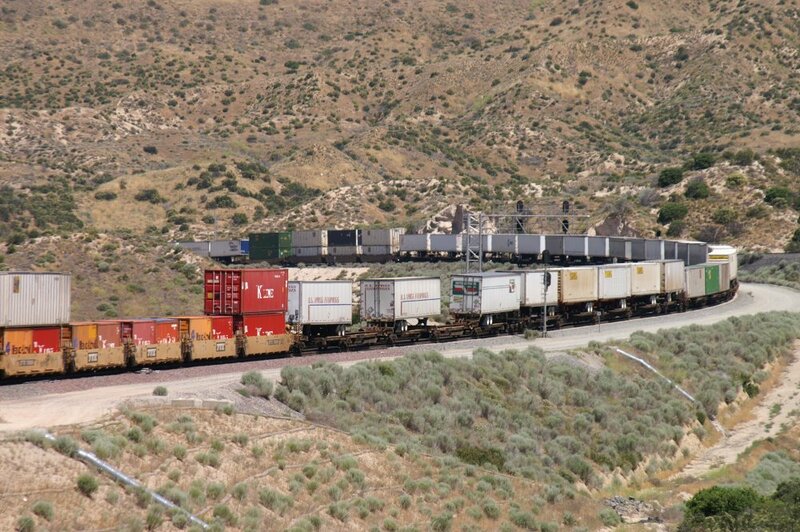 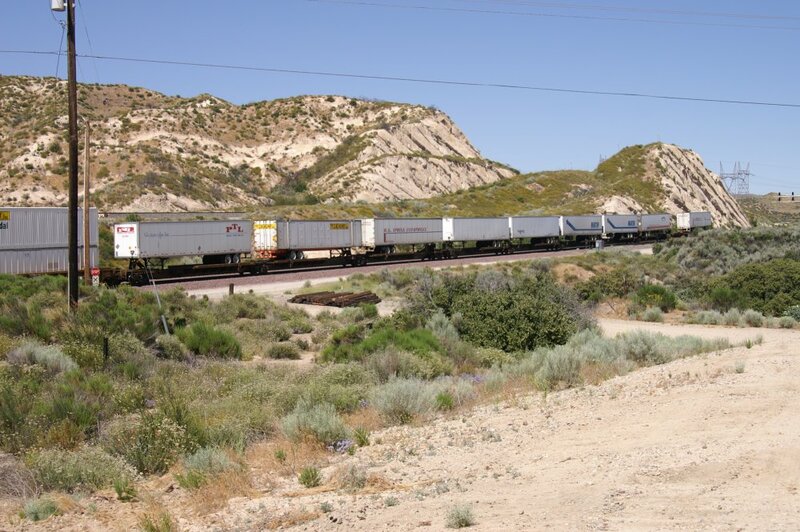 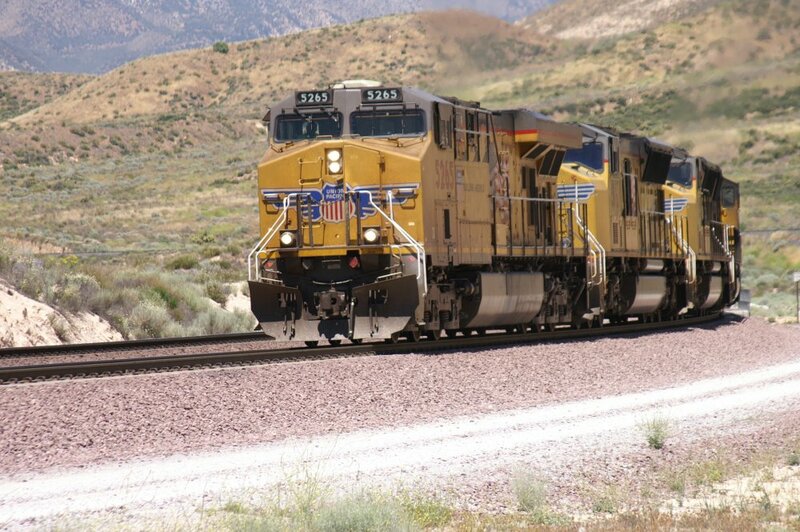 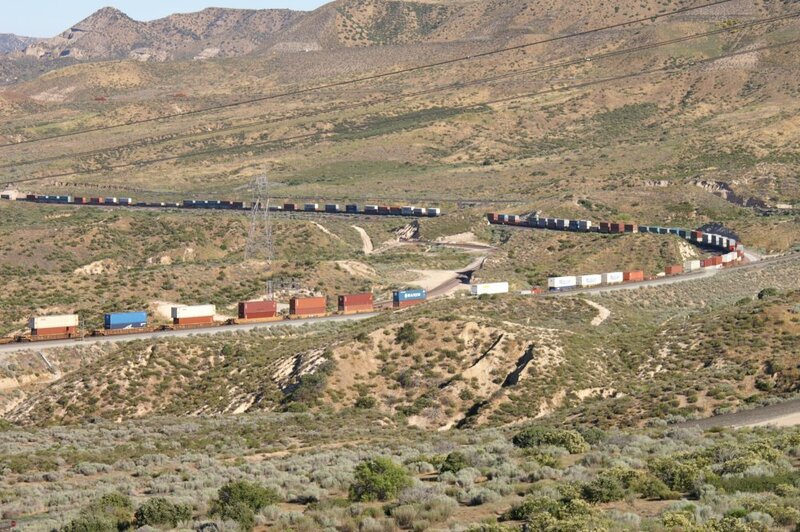 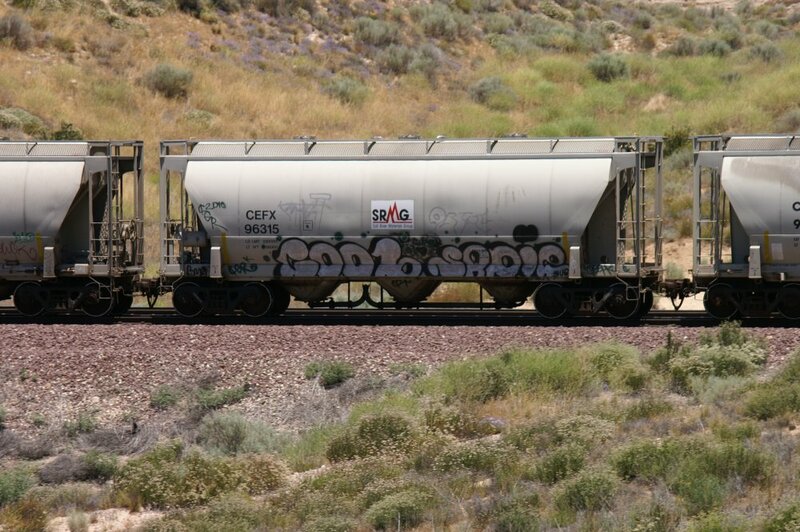 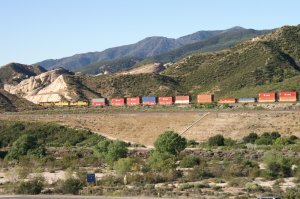 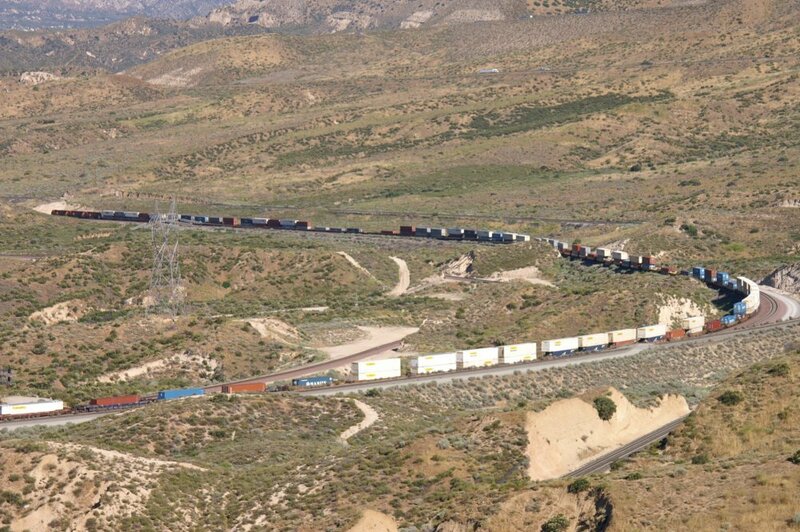 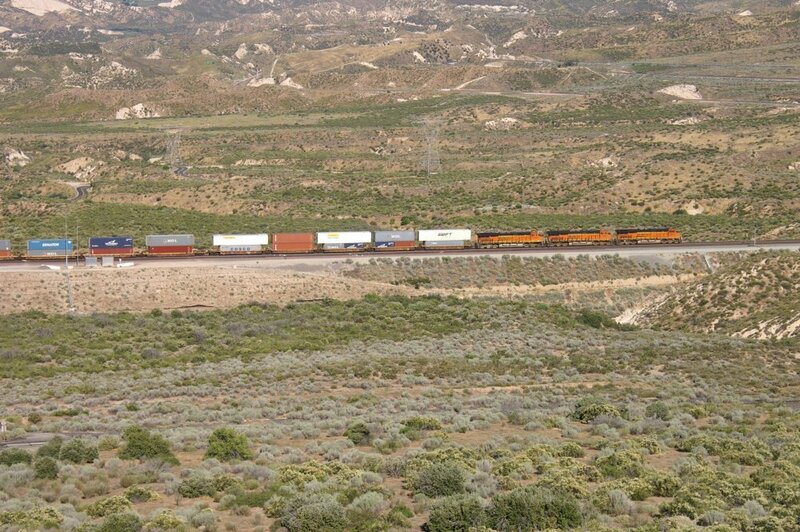 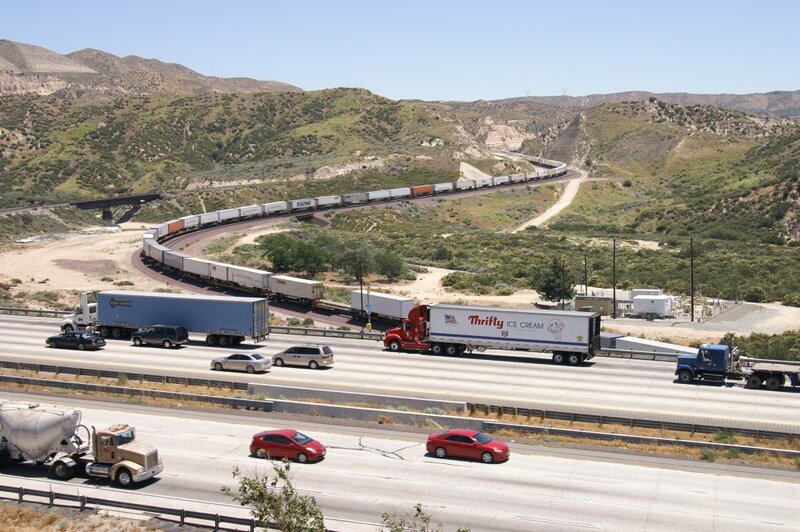 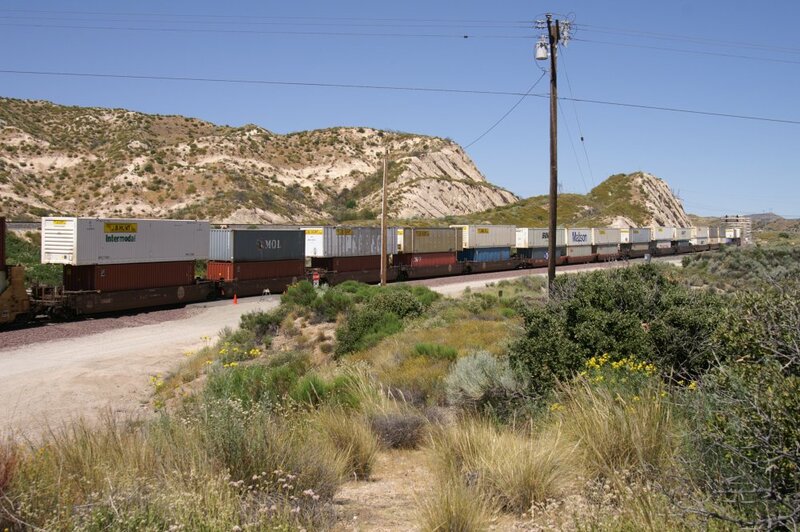 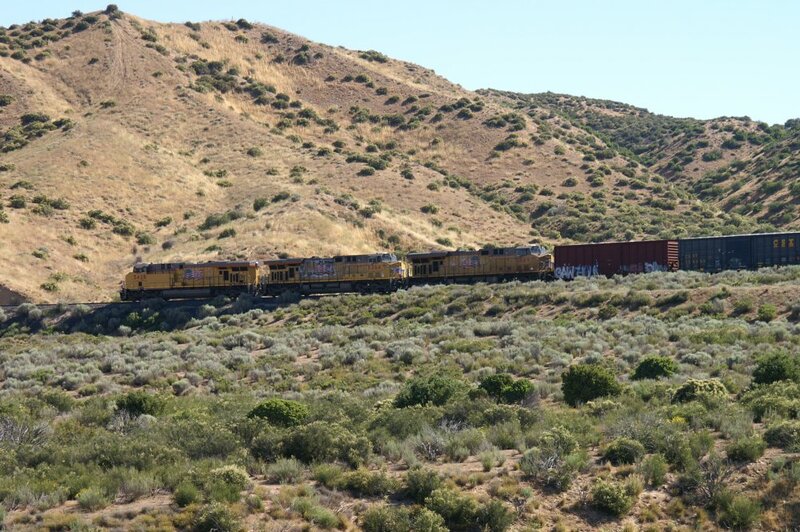 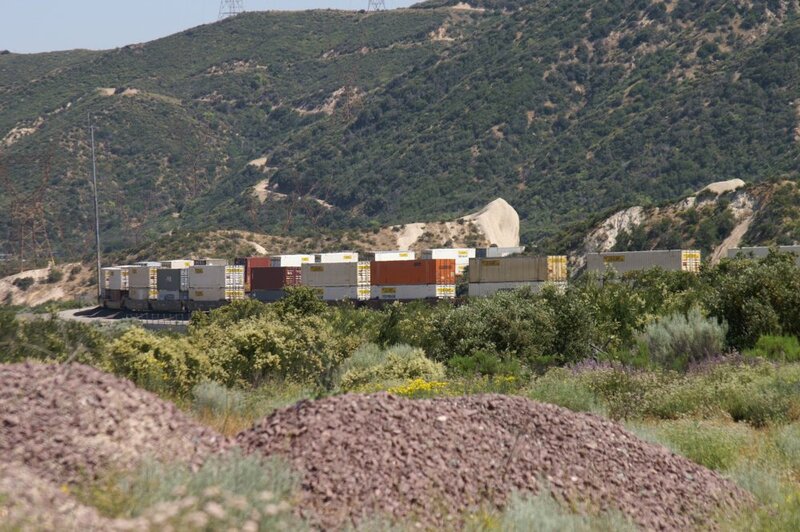 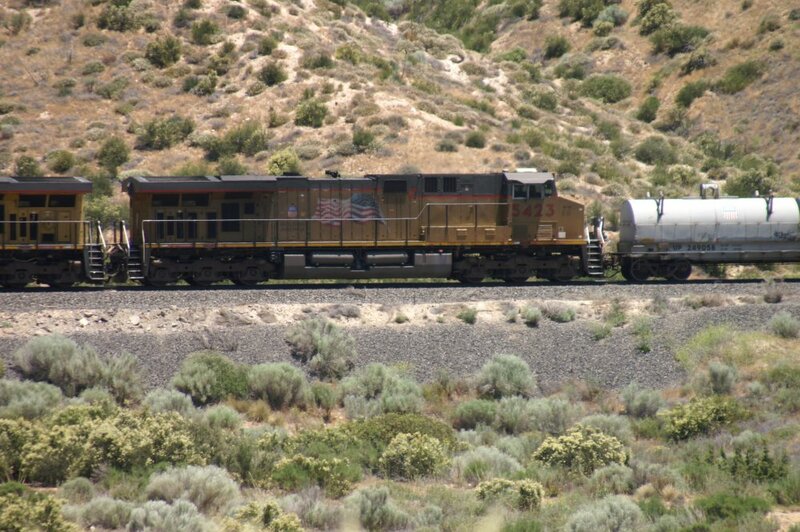 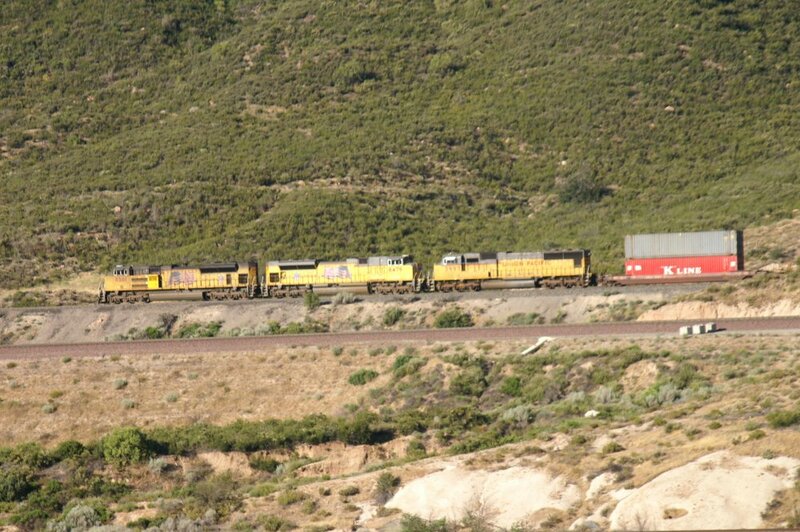 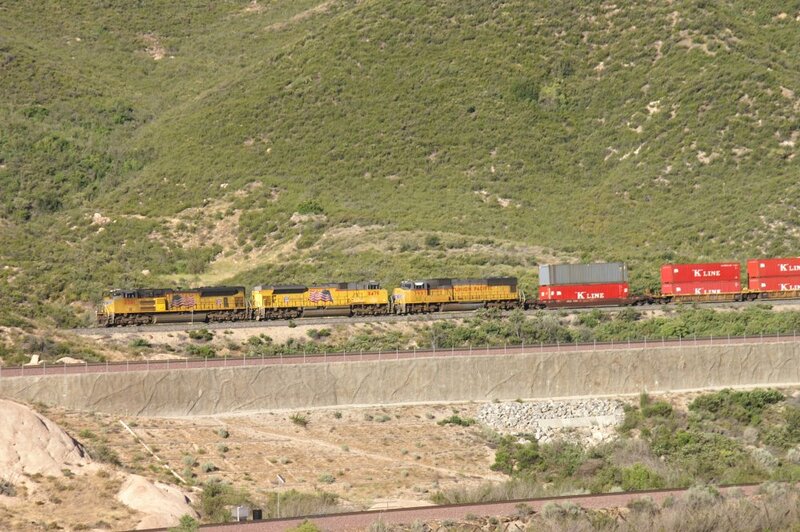 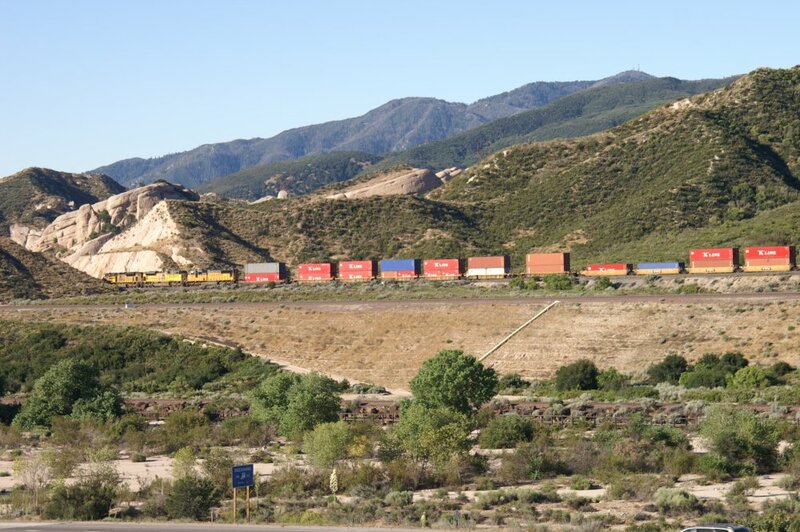 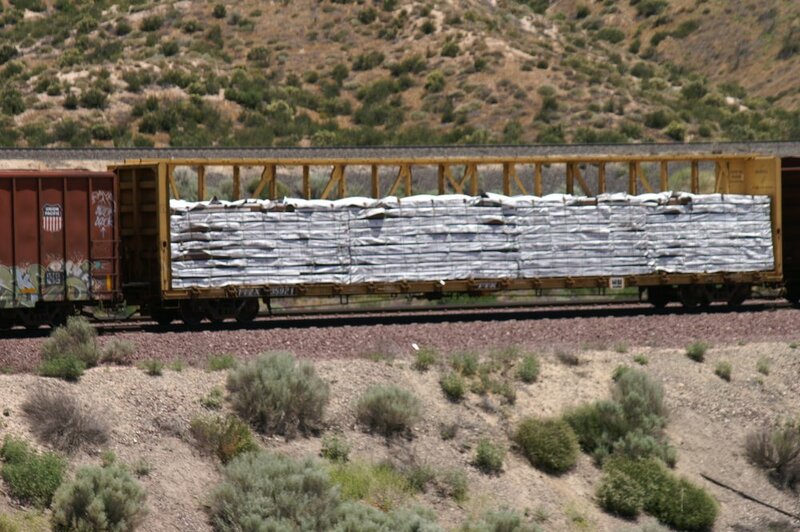 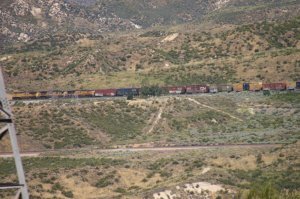 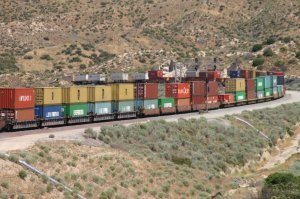 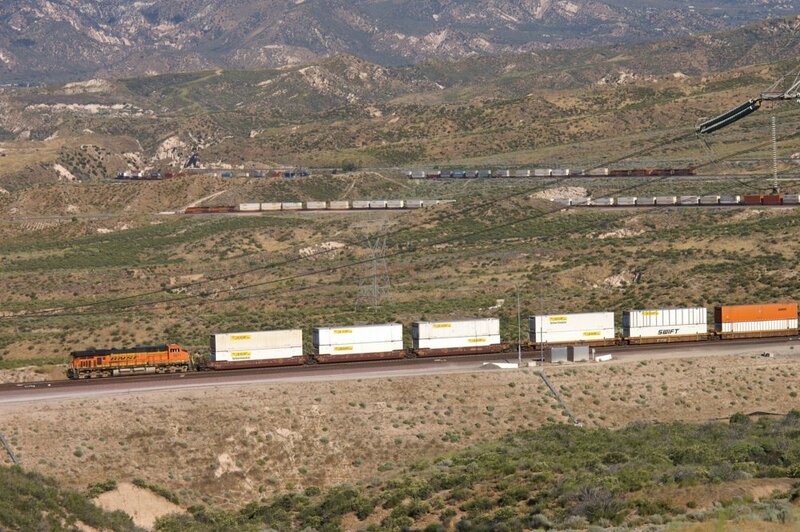 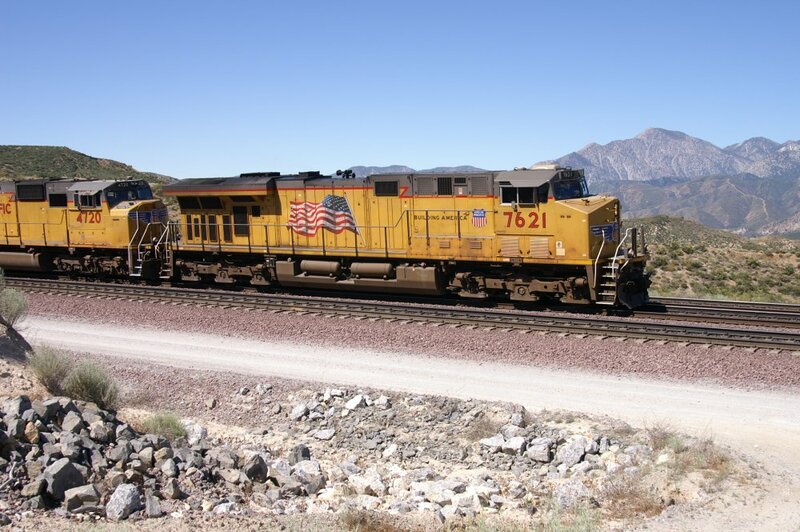 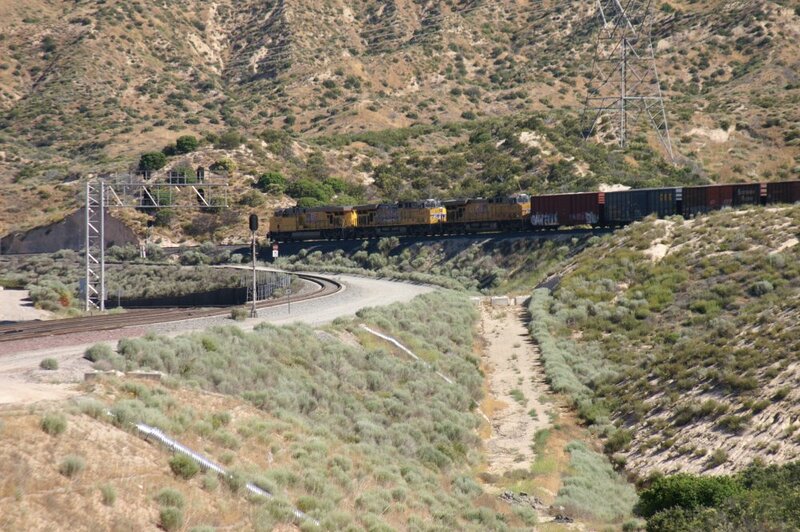 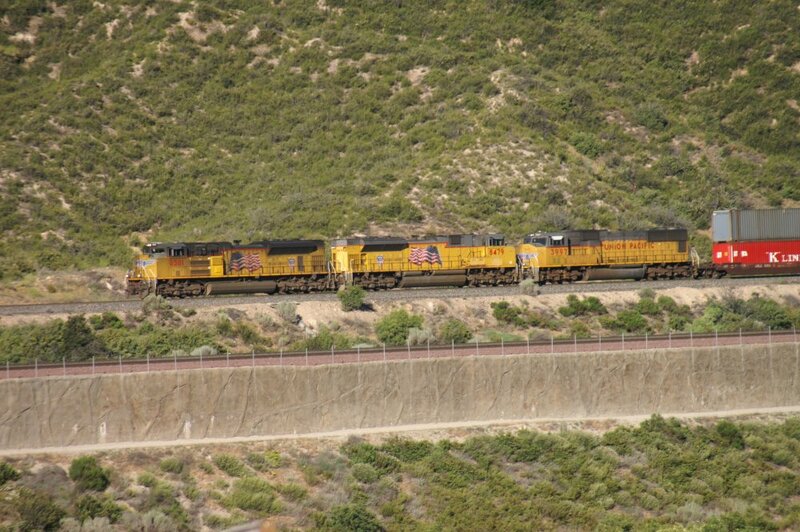 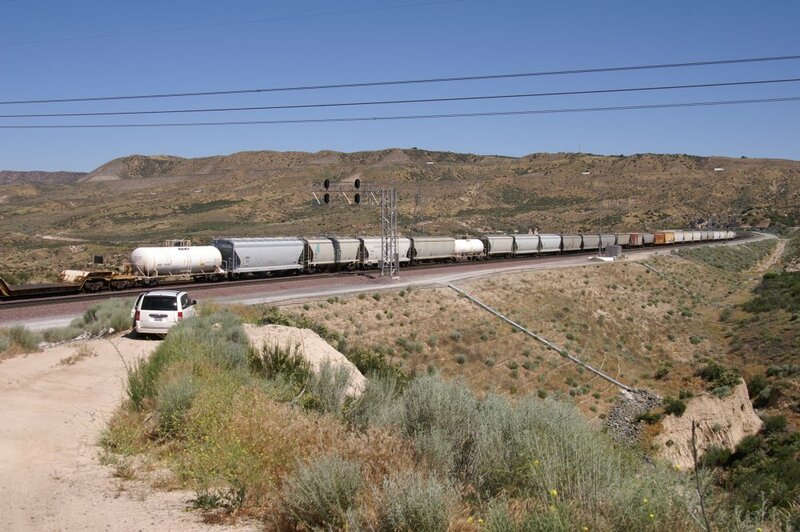 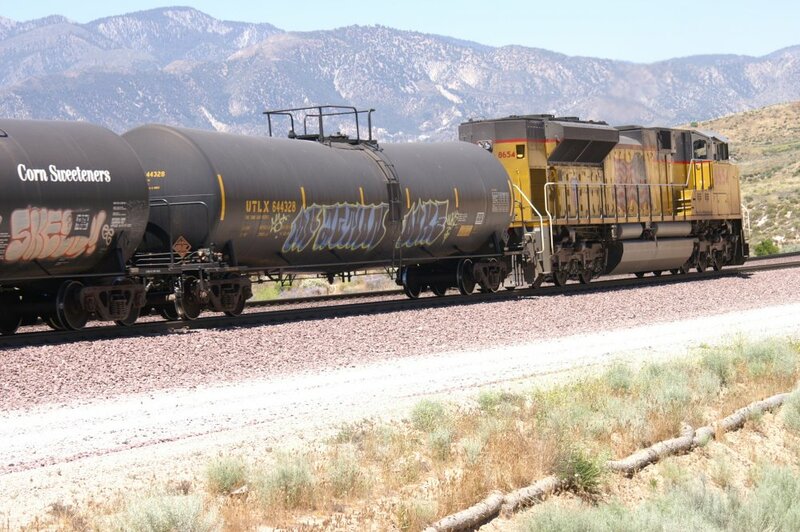 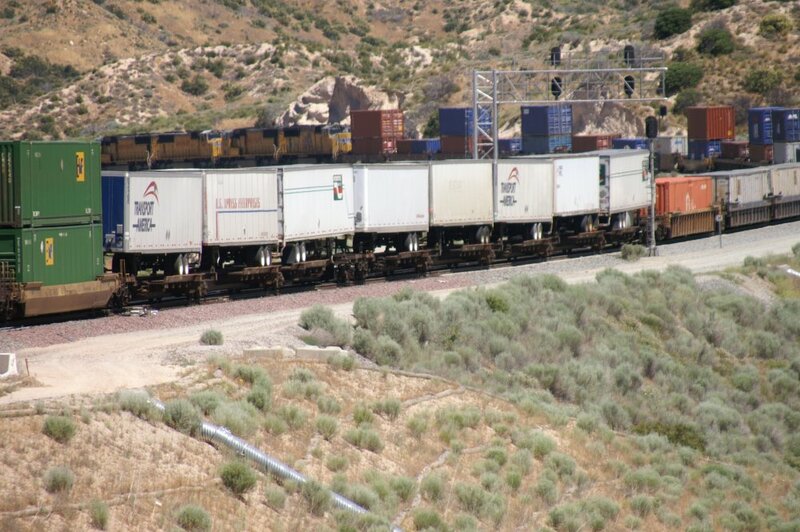 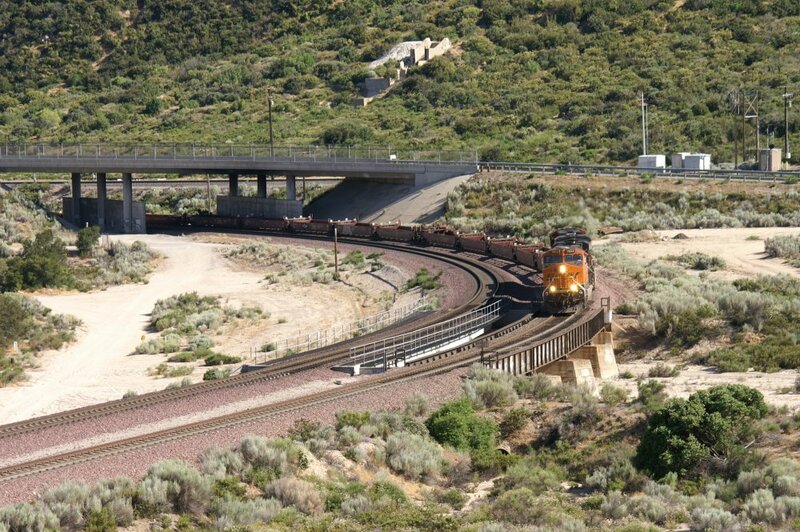 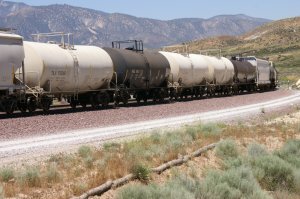 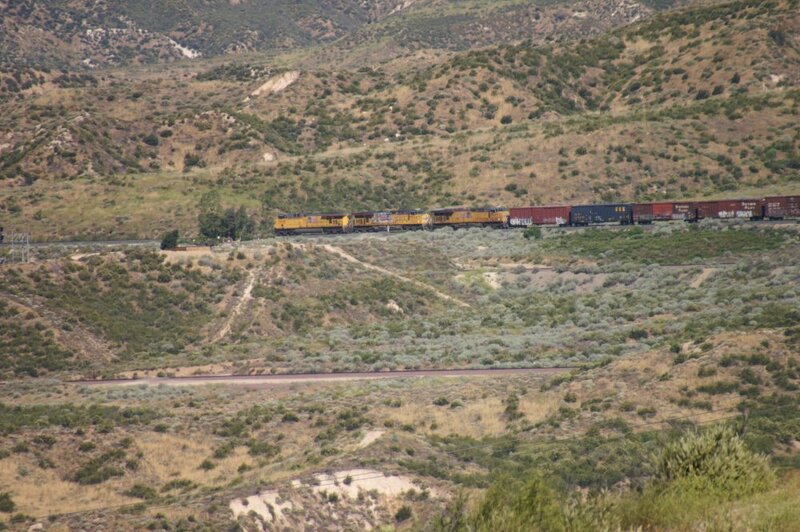 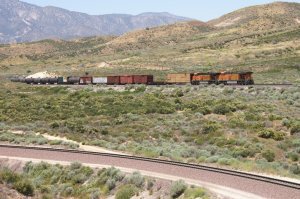 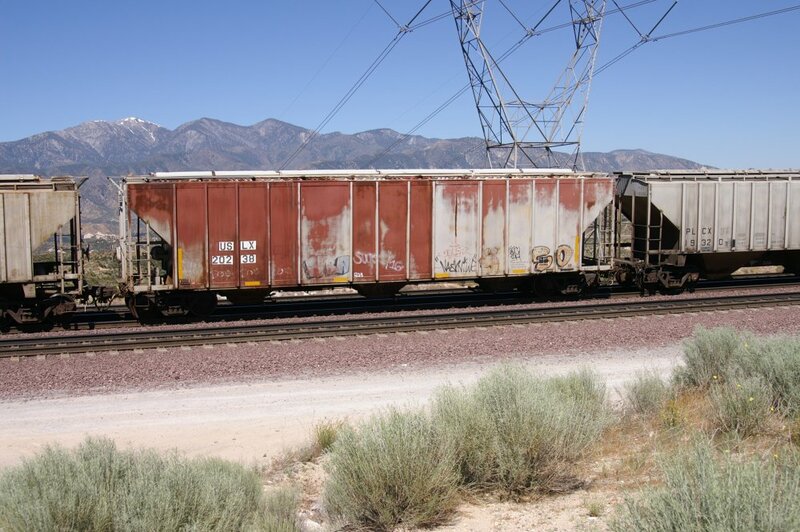 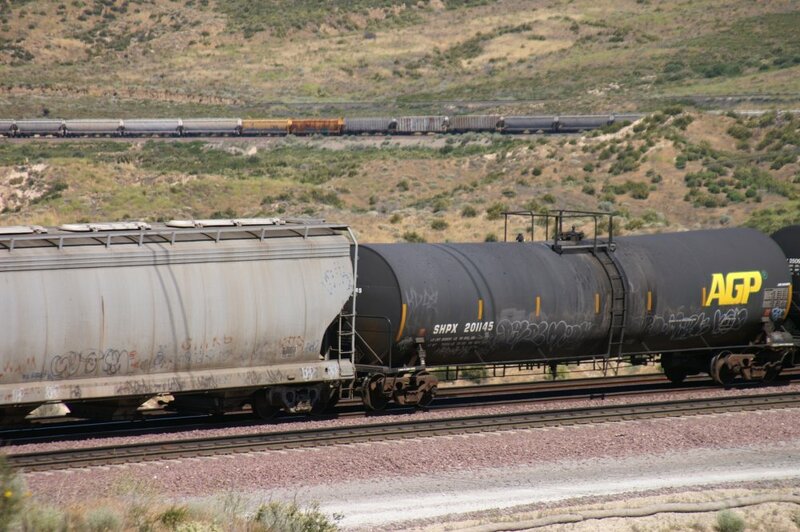 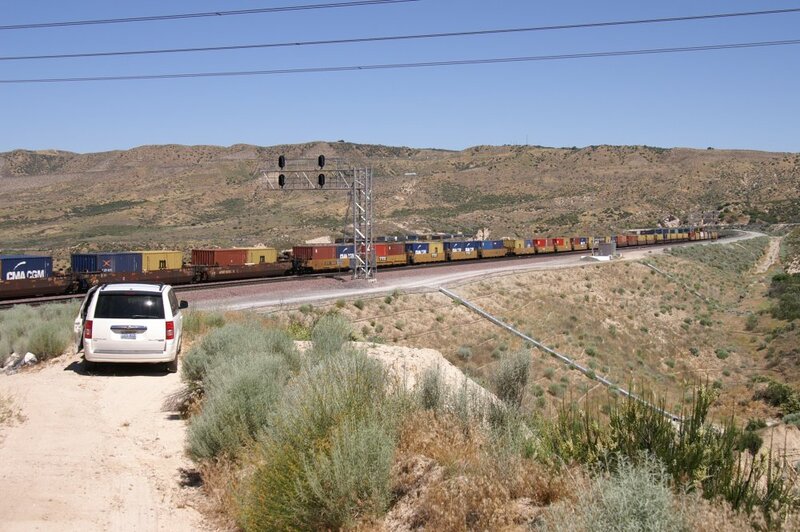 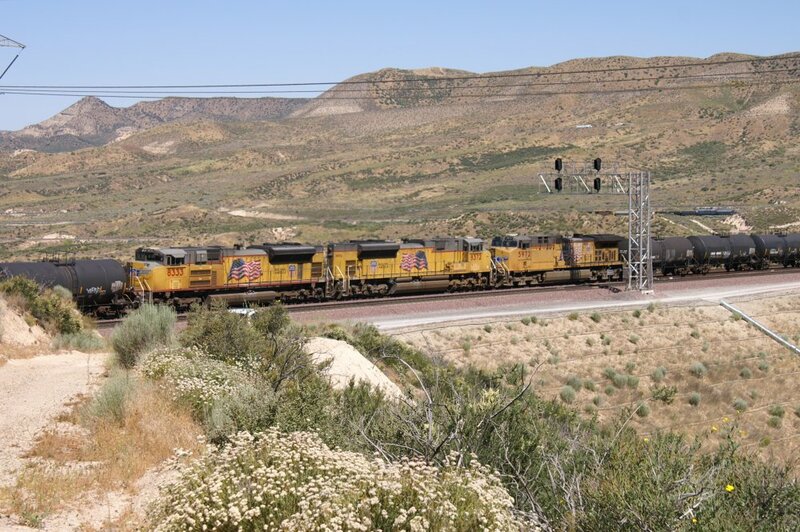 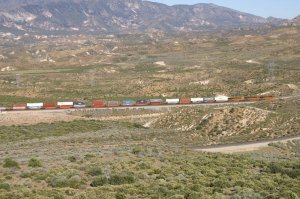 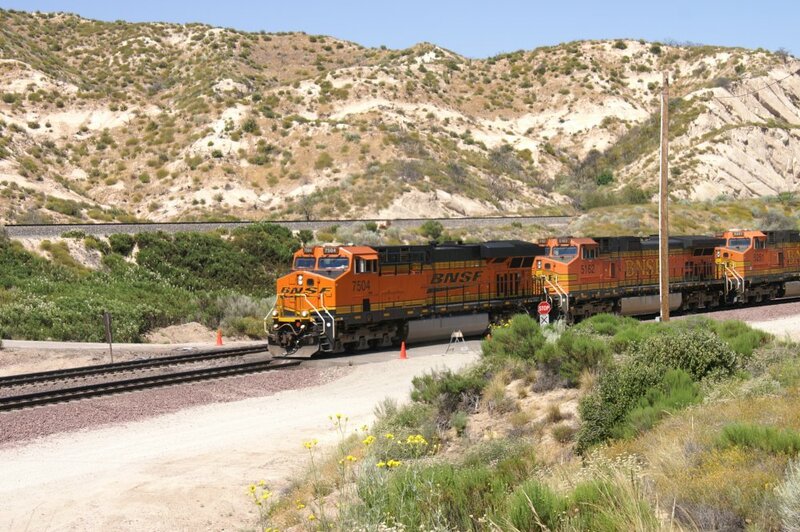 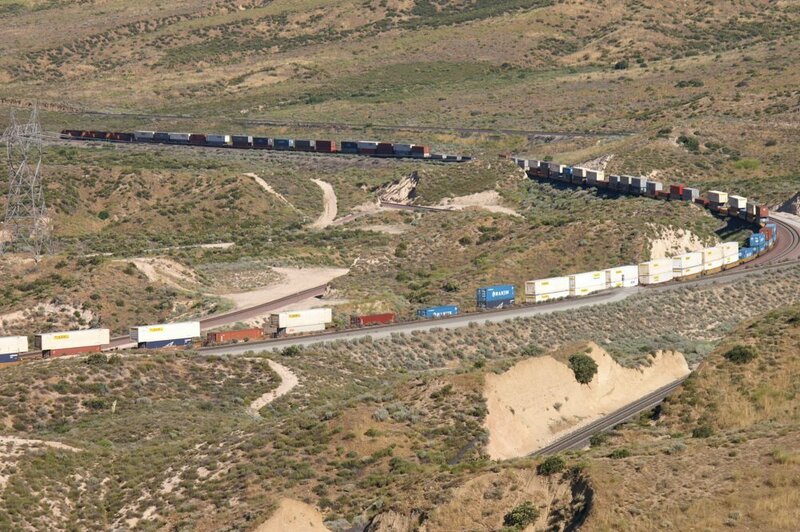 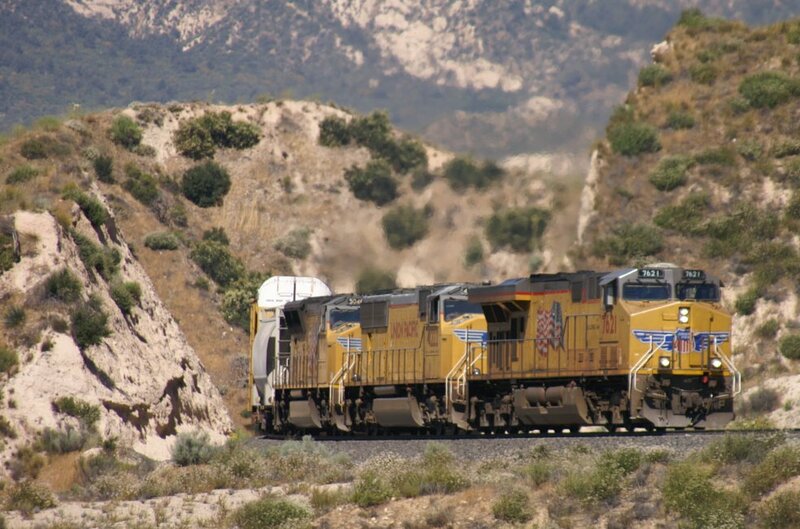 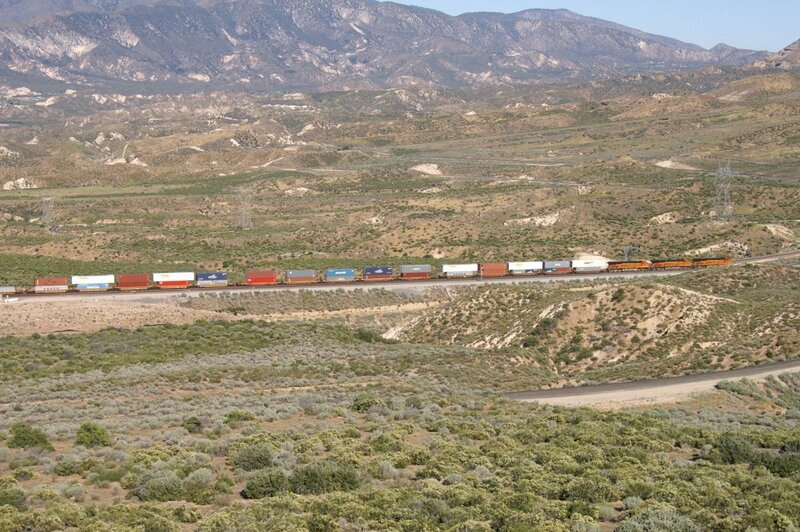 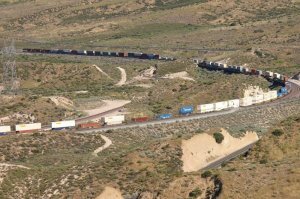 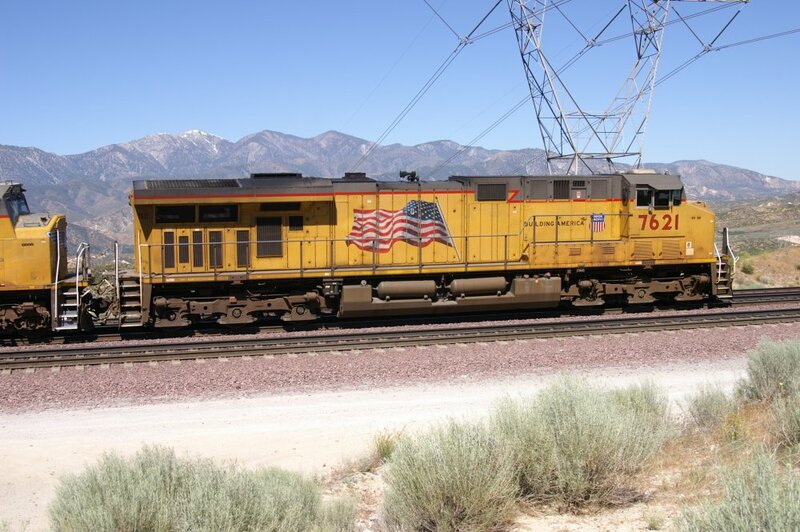 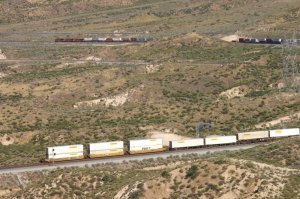 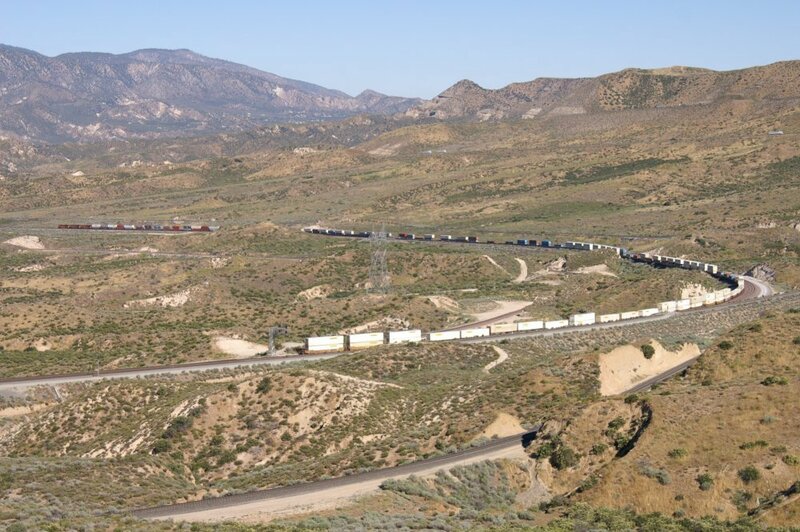 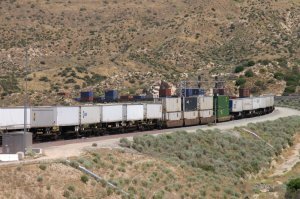 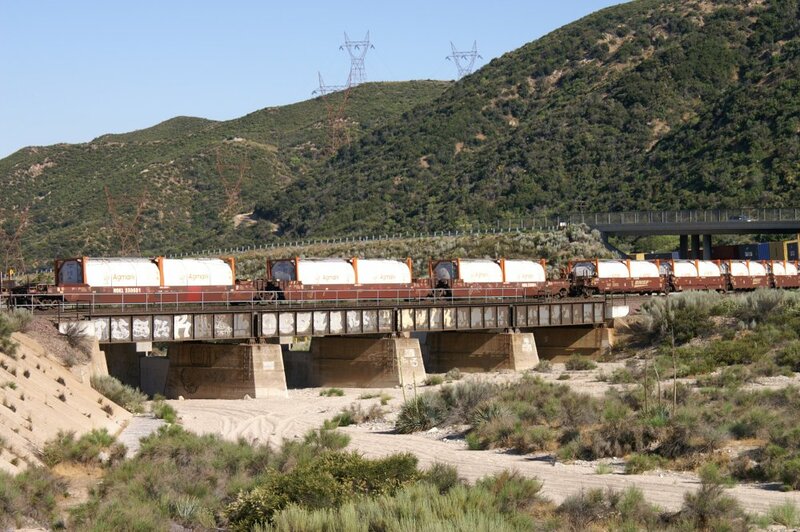 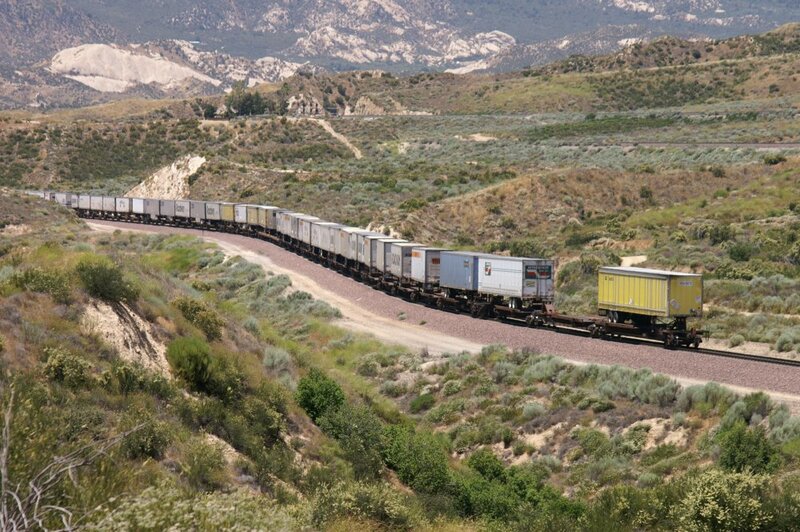 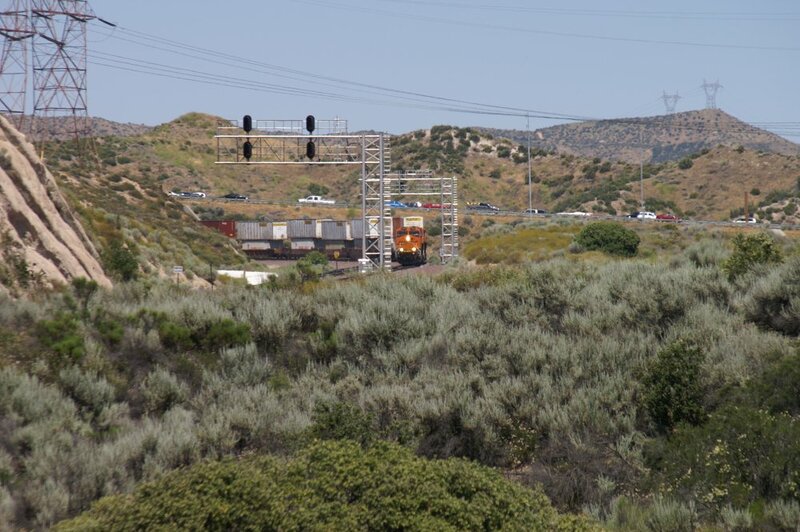 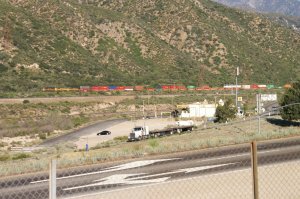 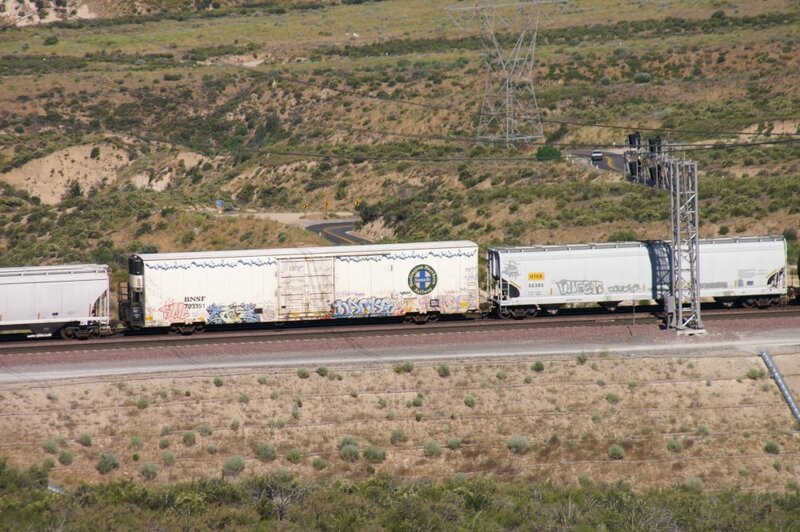 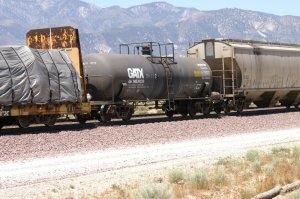 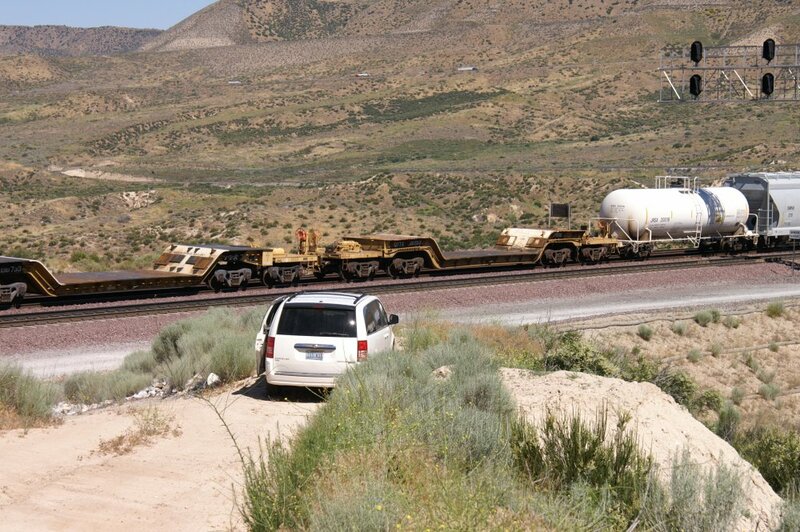 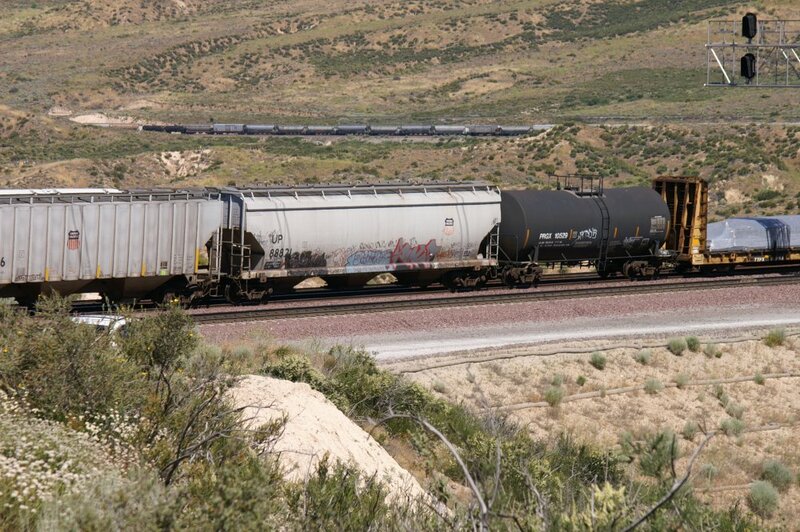 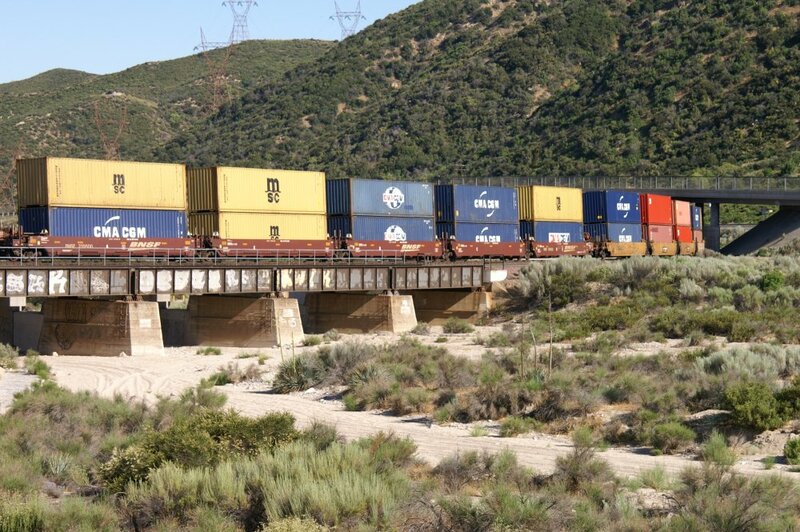 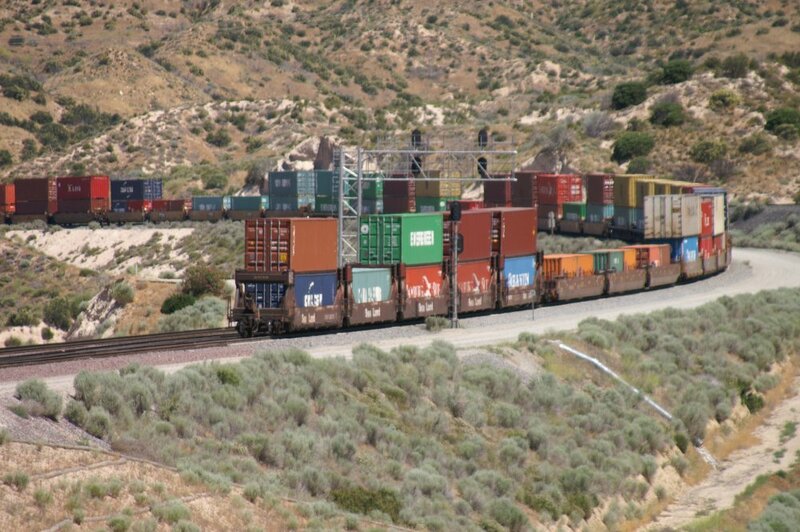 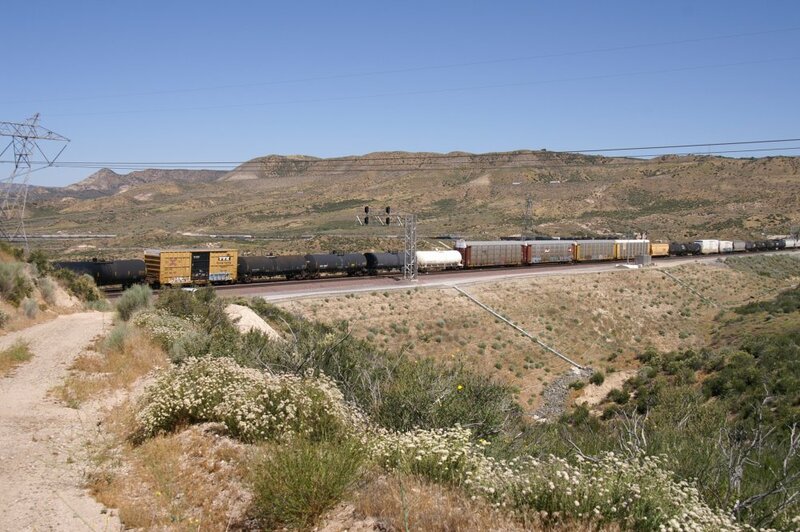 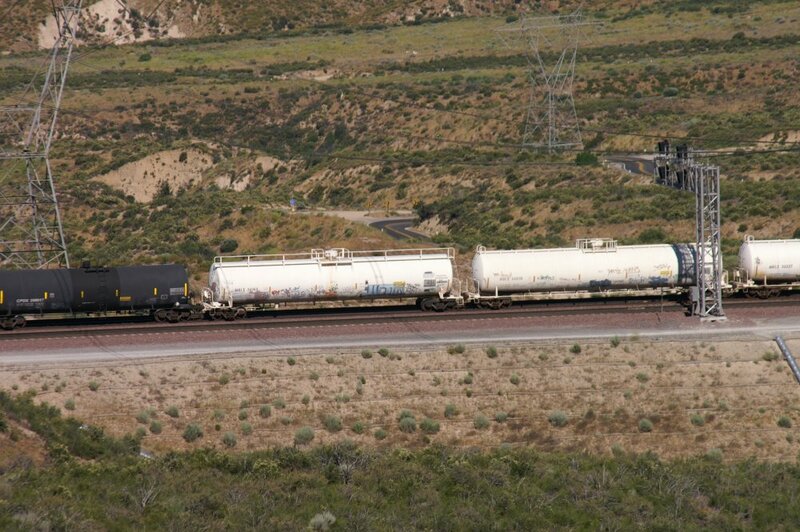 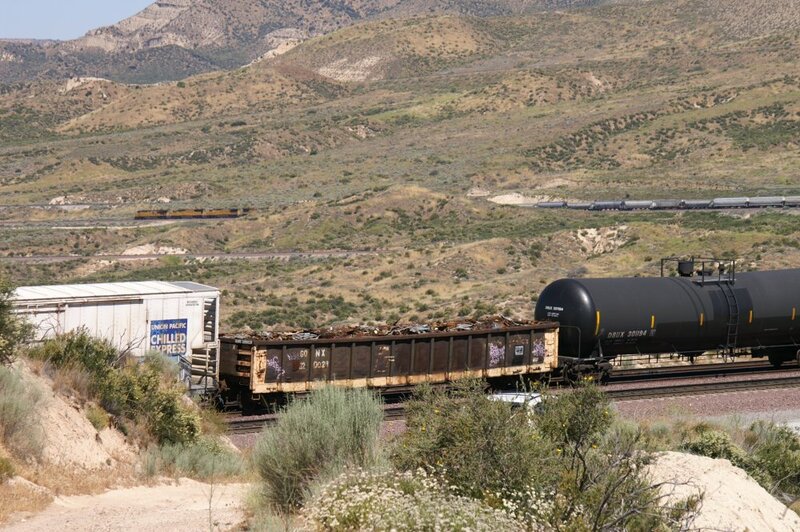 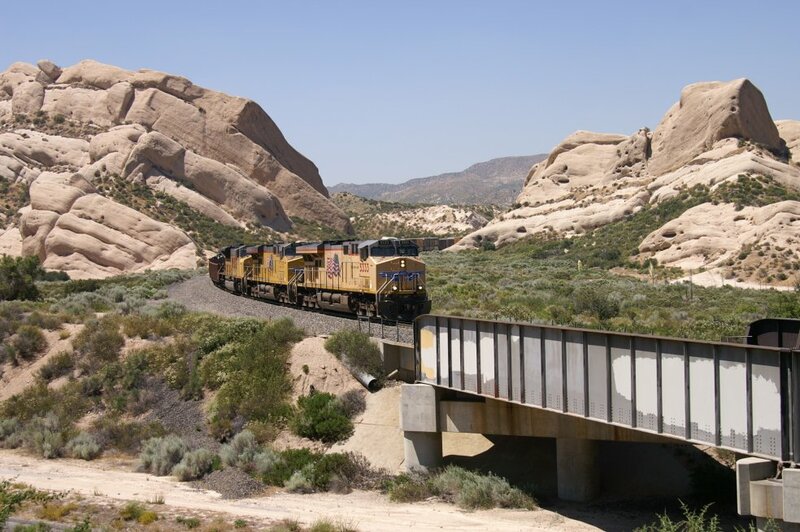 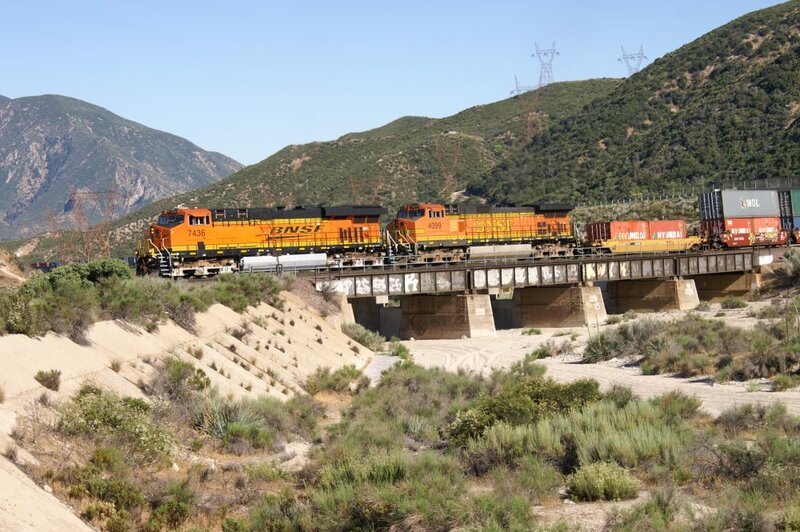 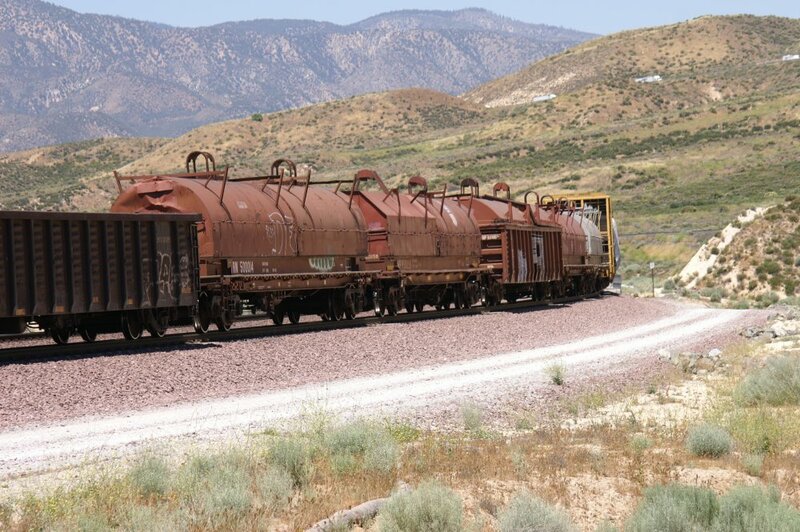 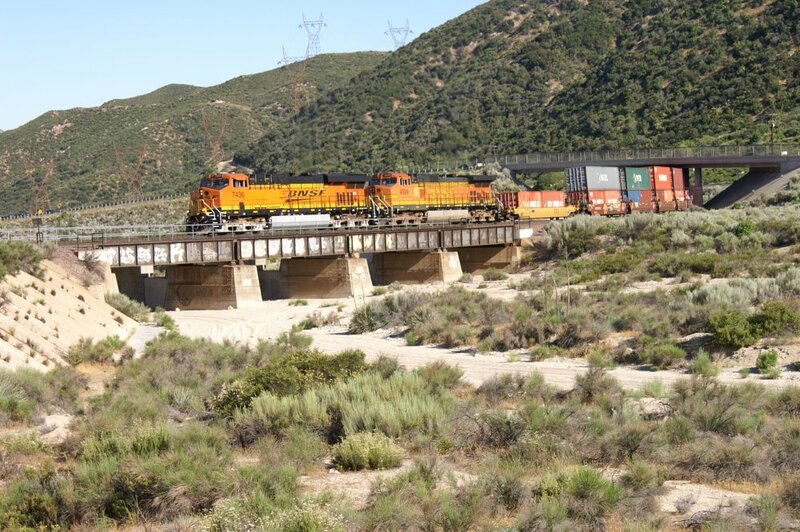 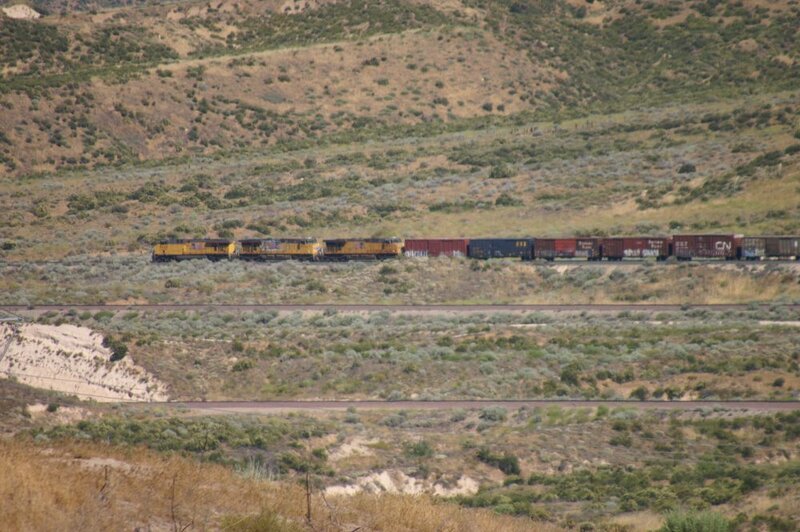 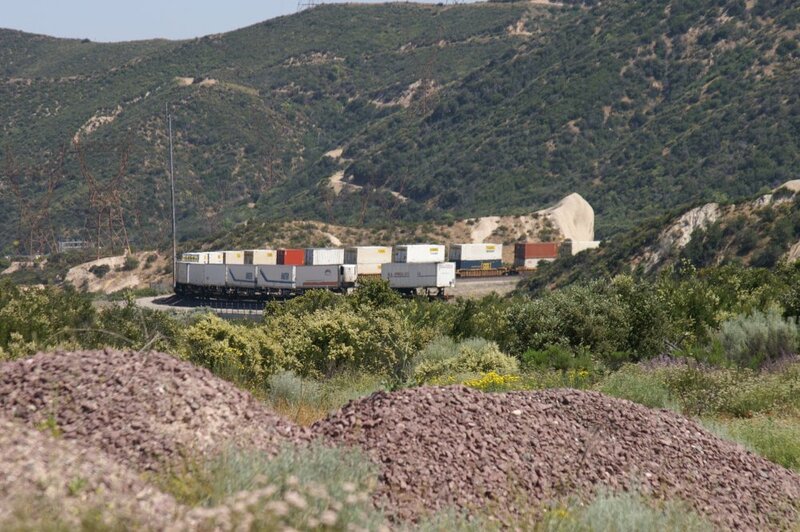 This was the only train while driving to Cleghorn road (129), enter I-15 and exit at 131 (Hwy 138). 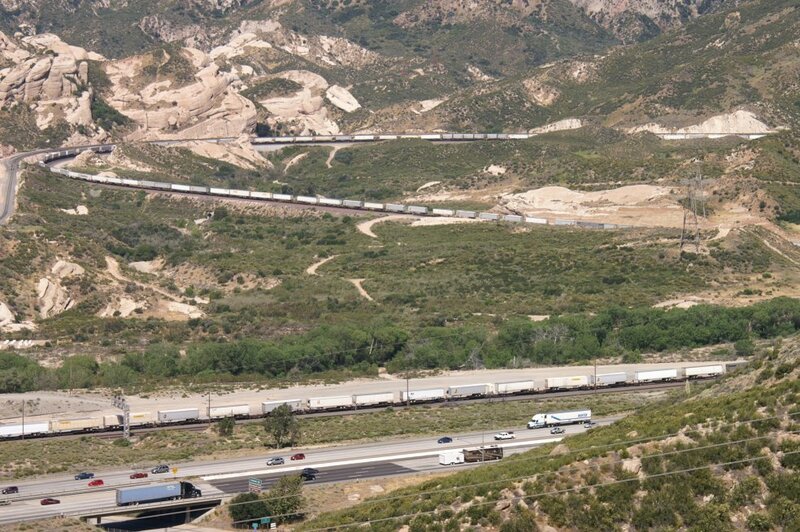 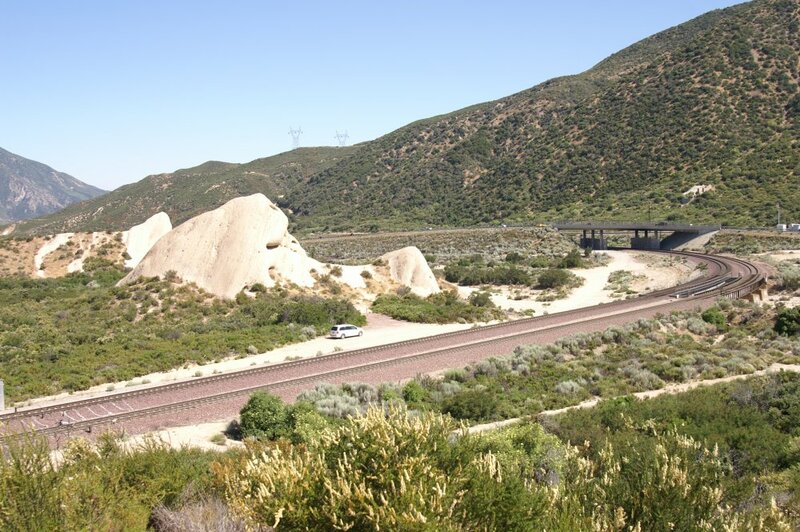 Interstate 15 exit 131 is our connection to Highway 138 to reach the Mormon Rocks (Sullivans Curve), Hill 582 and BNSF Summit. 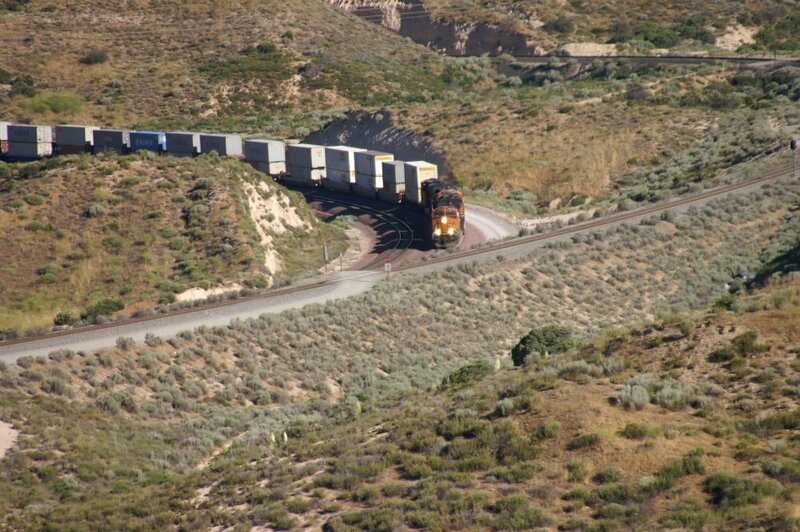 The locos will reach Hill 582 any second. 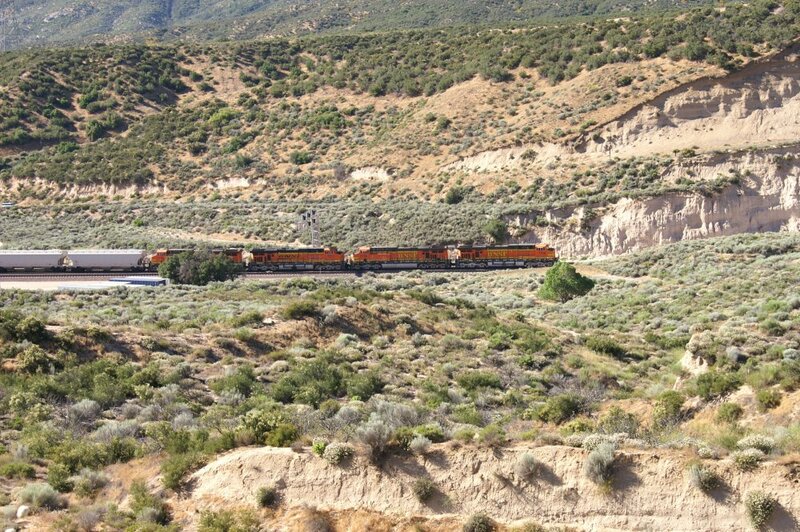 Last photo of Train 4 and this location. 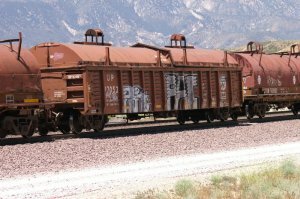 Once again, the quality of these photos is at the limit to be shown on this page. 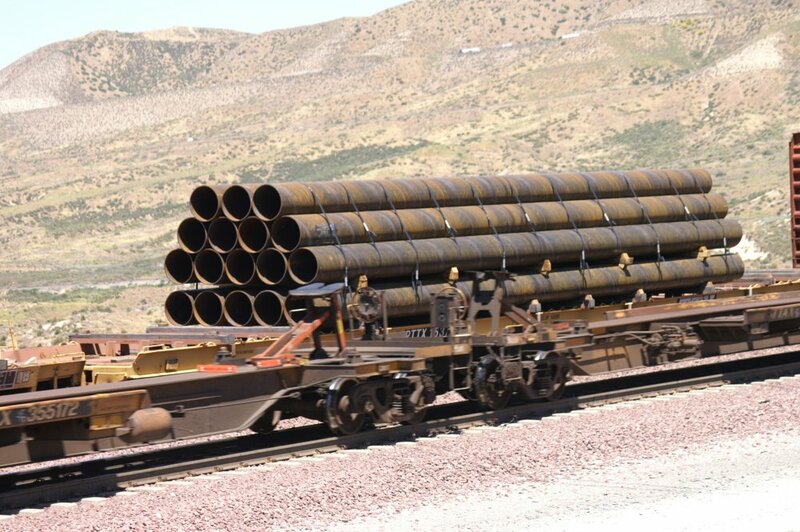 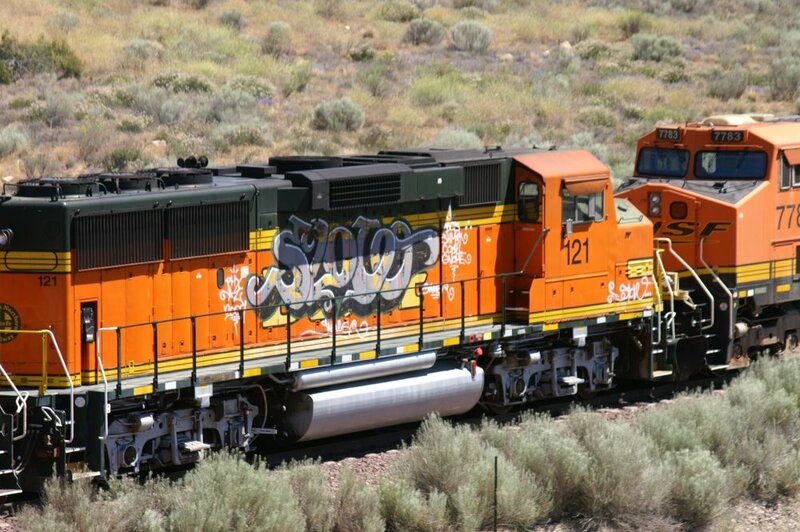 But it shows, how things can be while railfanning (nothing is perfect) !! 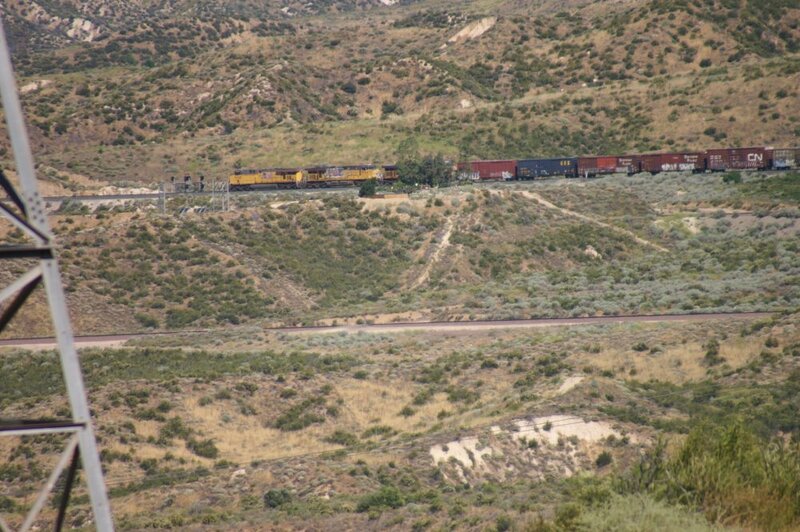 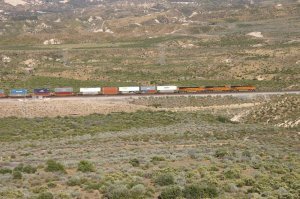 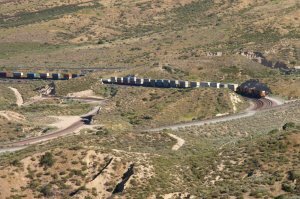 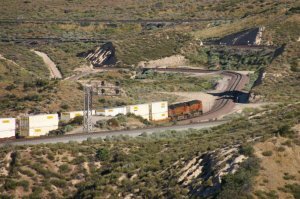 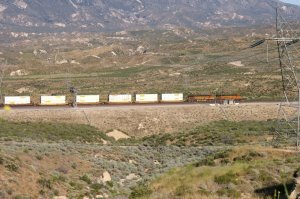 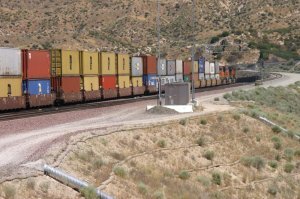 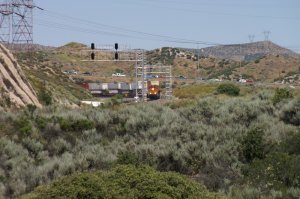 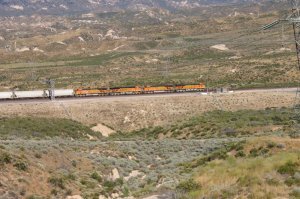 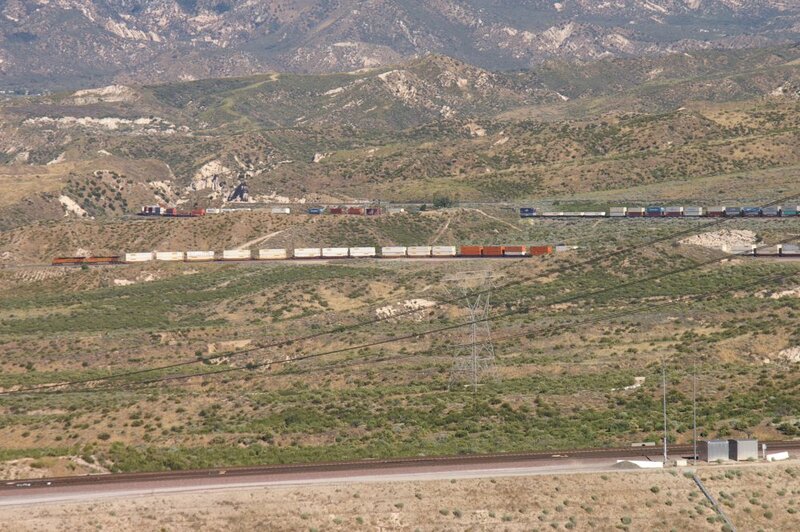 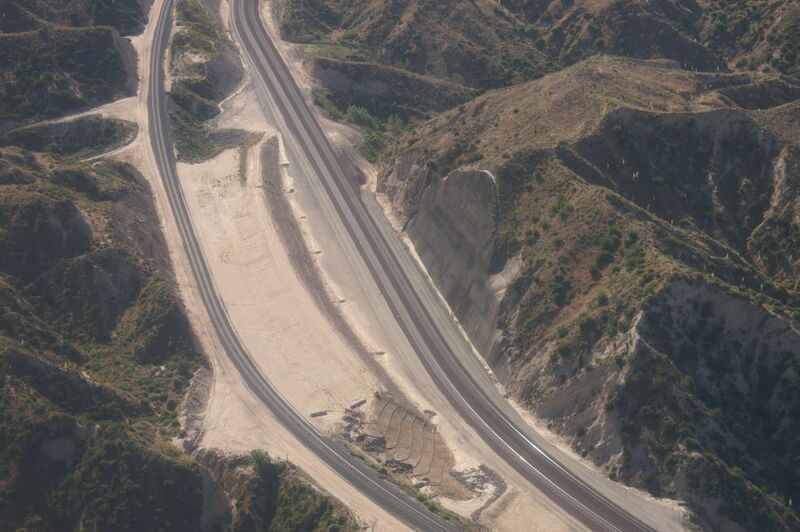 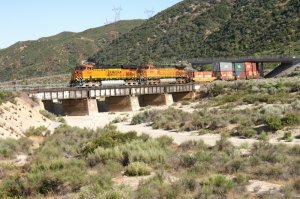 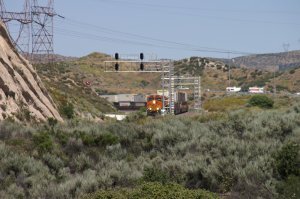 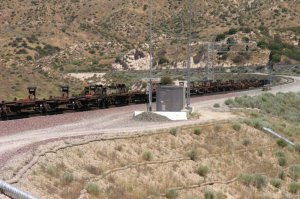 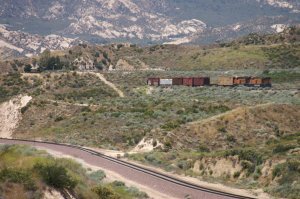 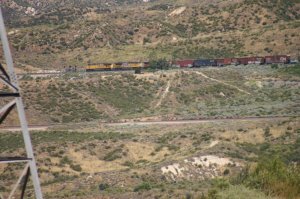 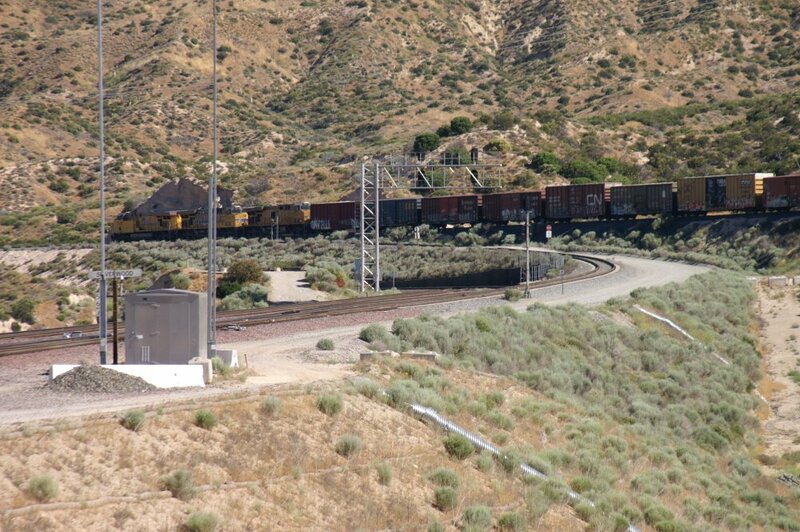 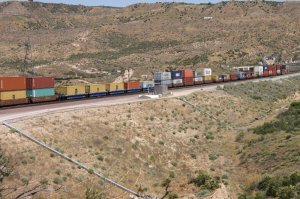 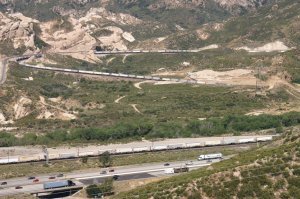 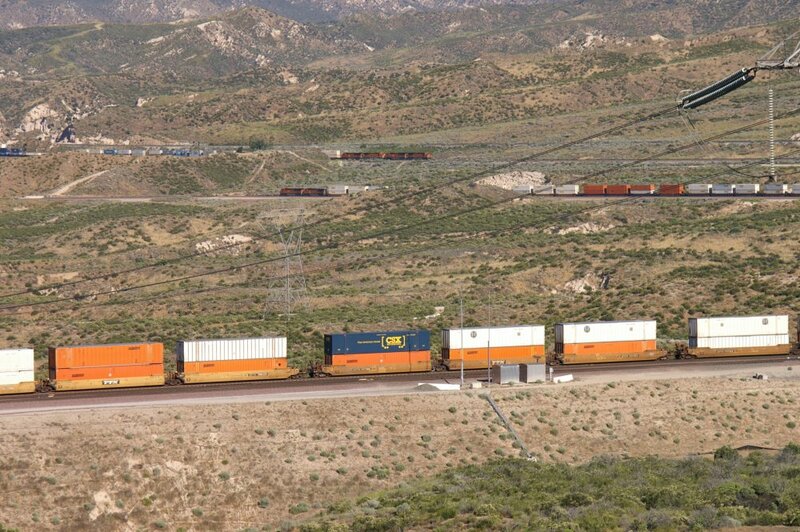 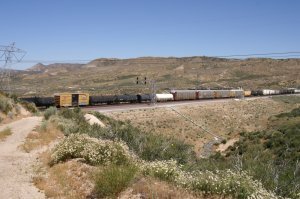 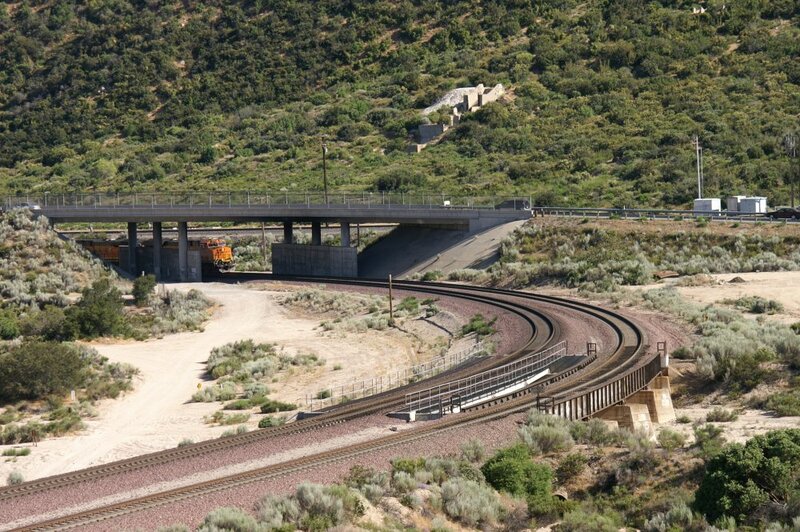 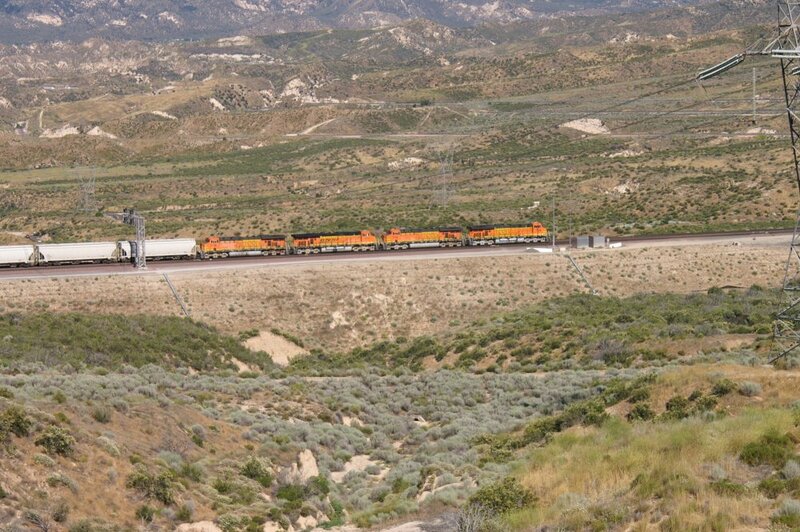 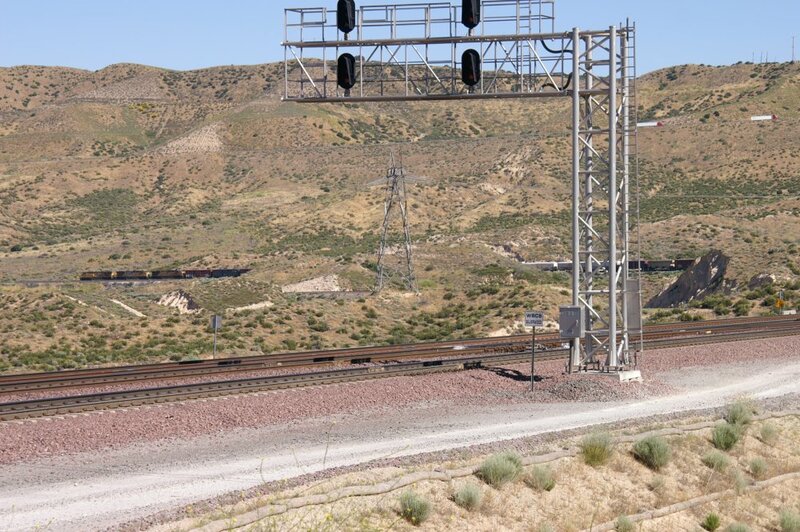 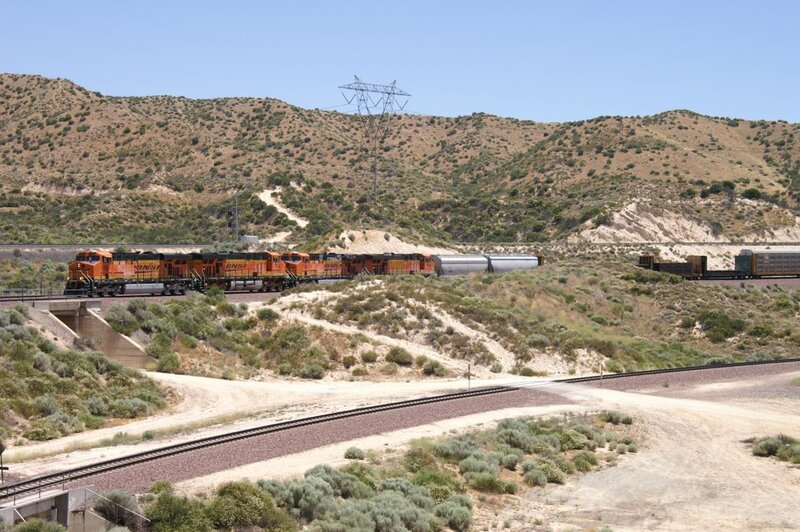 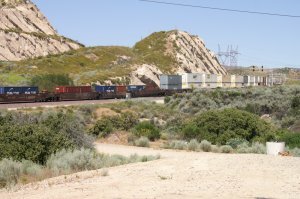 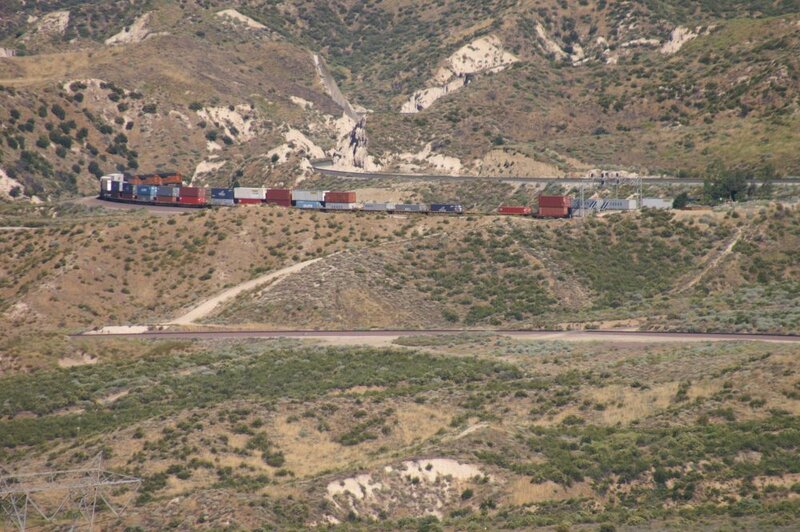 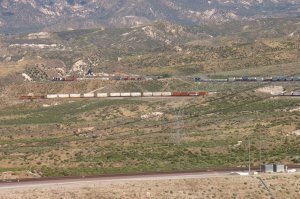 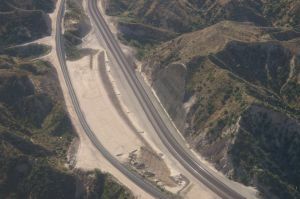 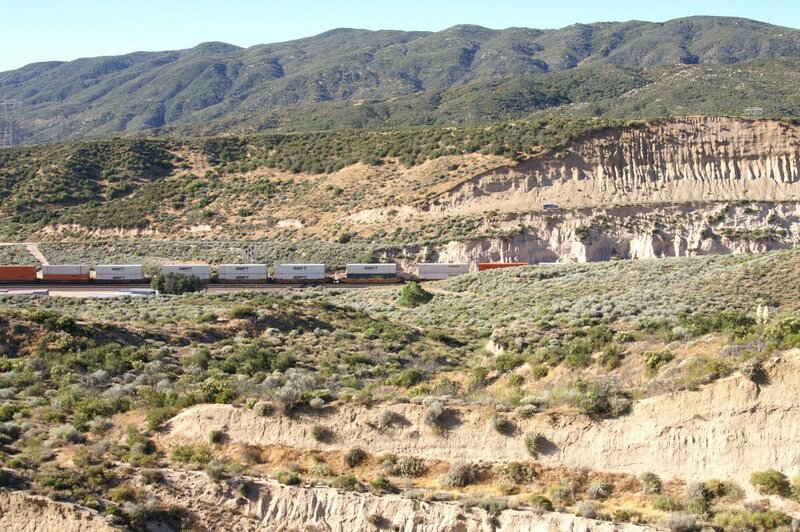 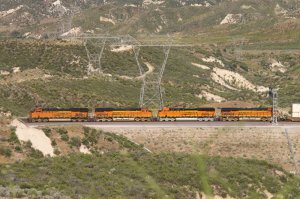 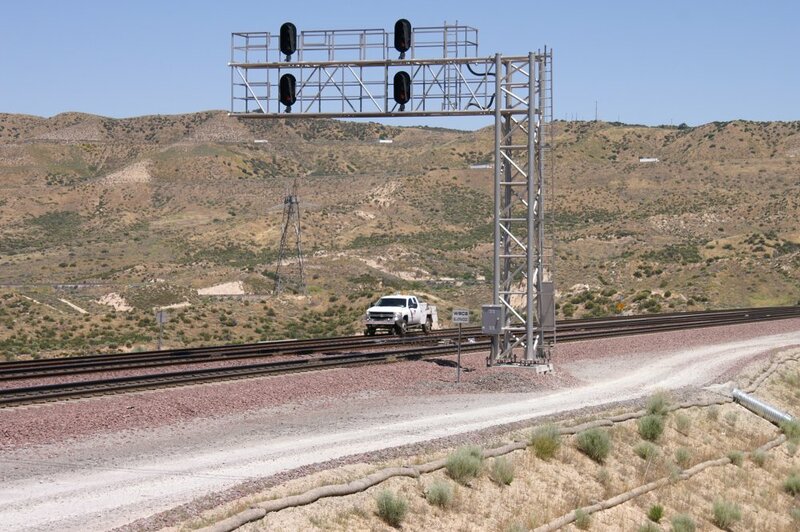 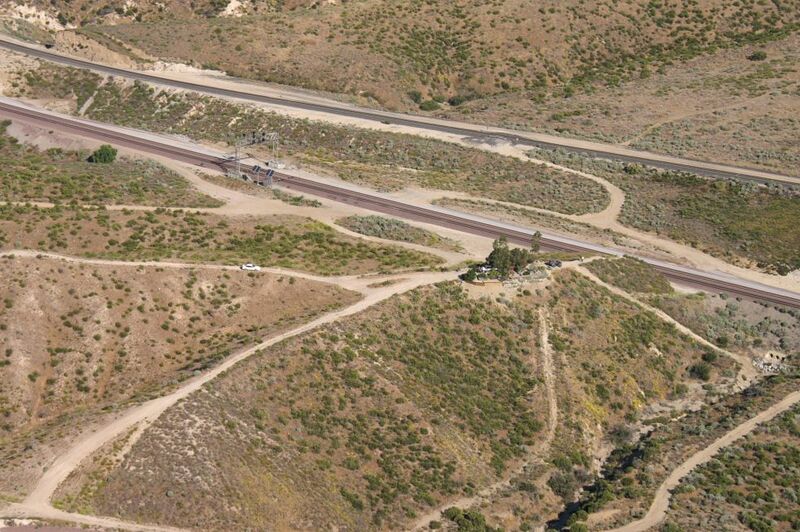 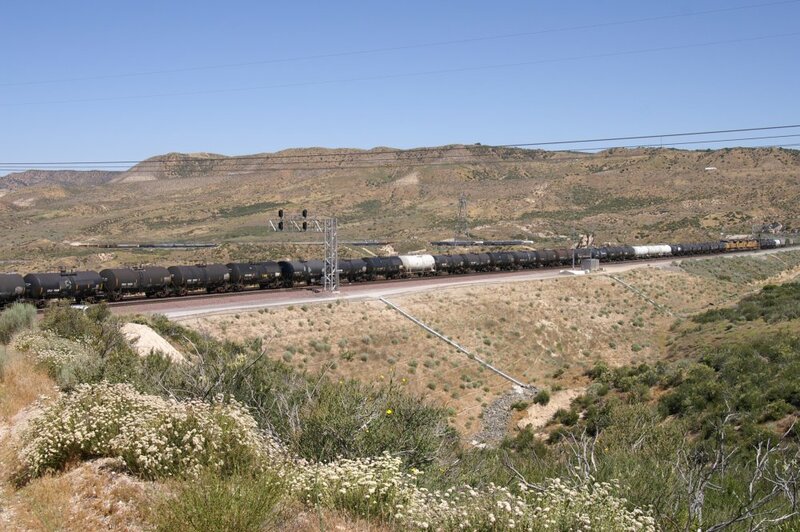 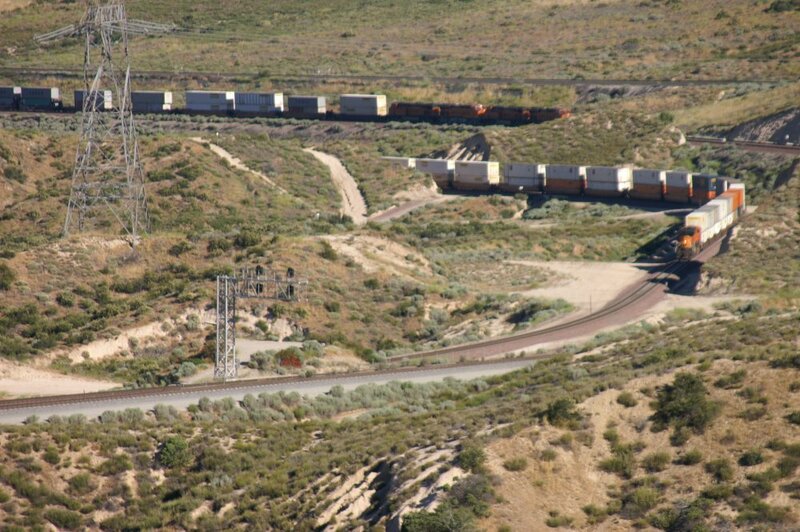 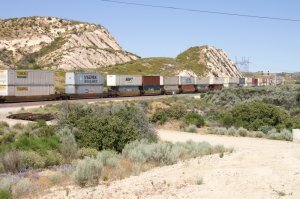 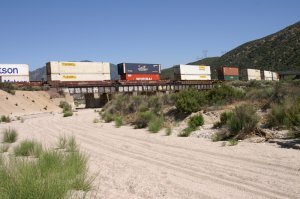 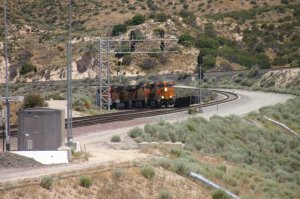 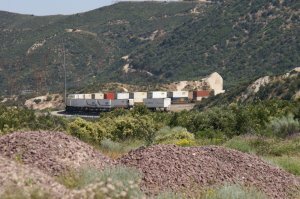 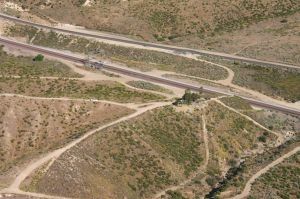 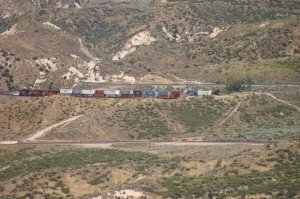 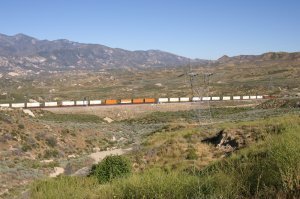 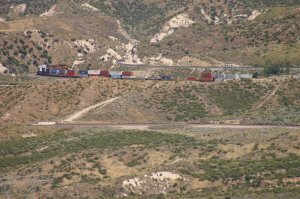 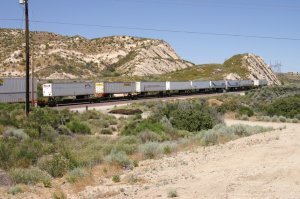 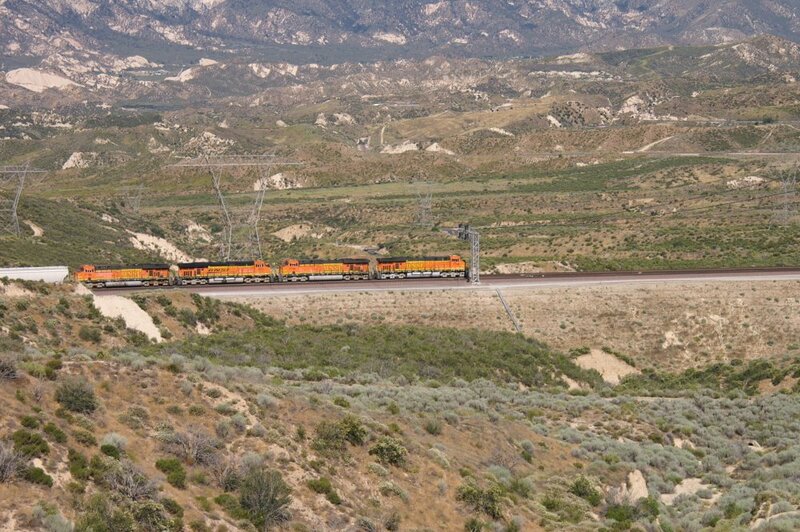 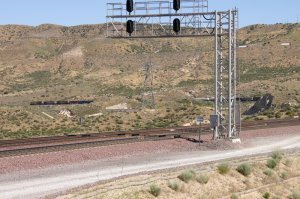 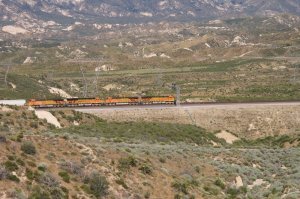 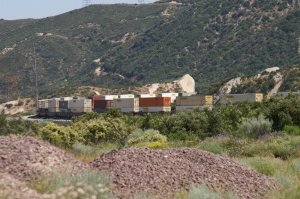 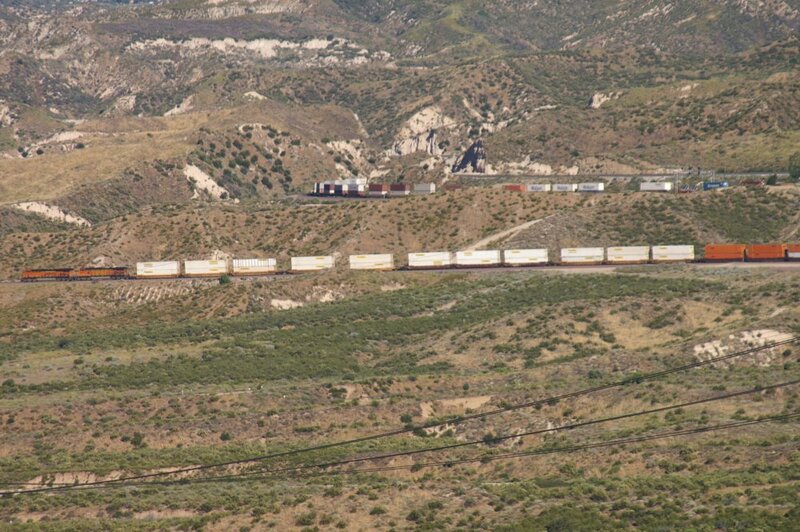 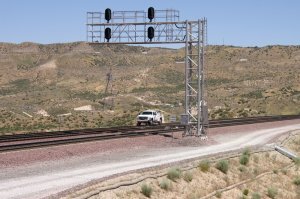 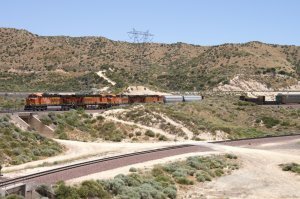 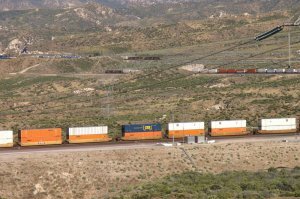 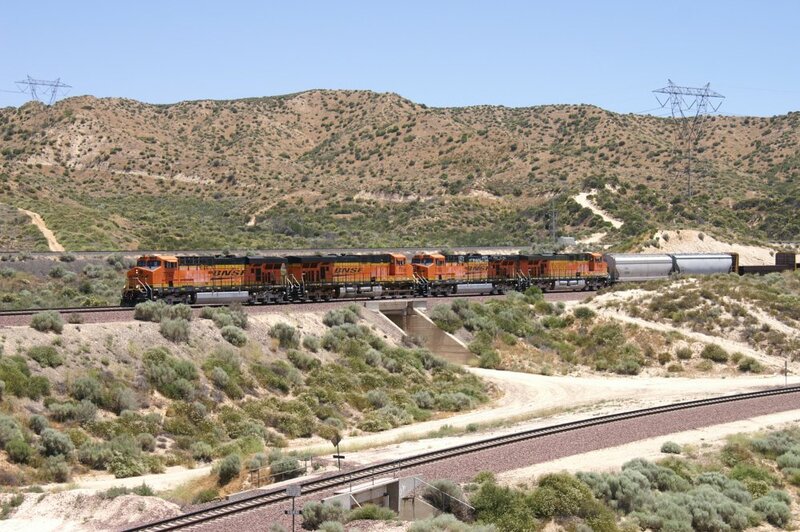 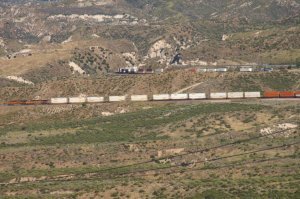 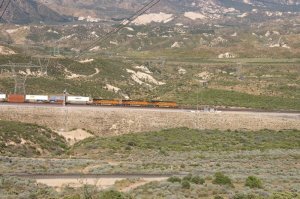 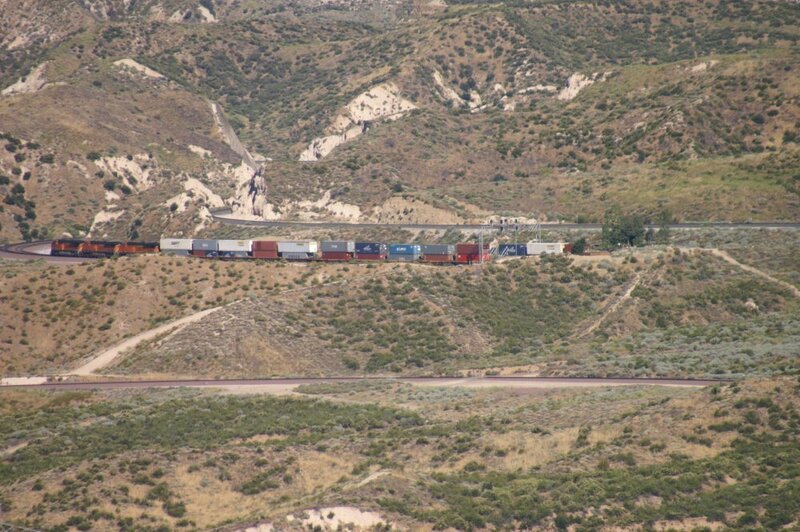 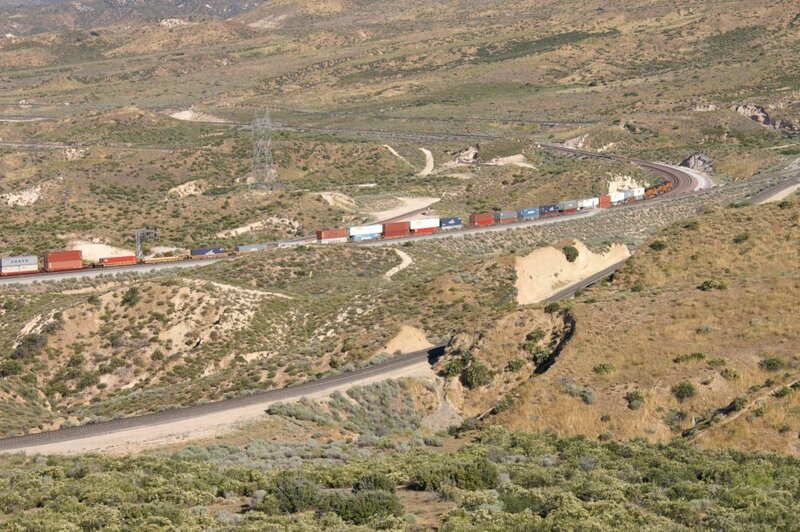 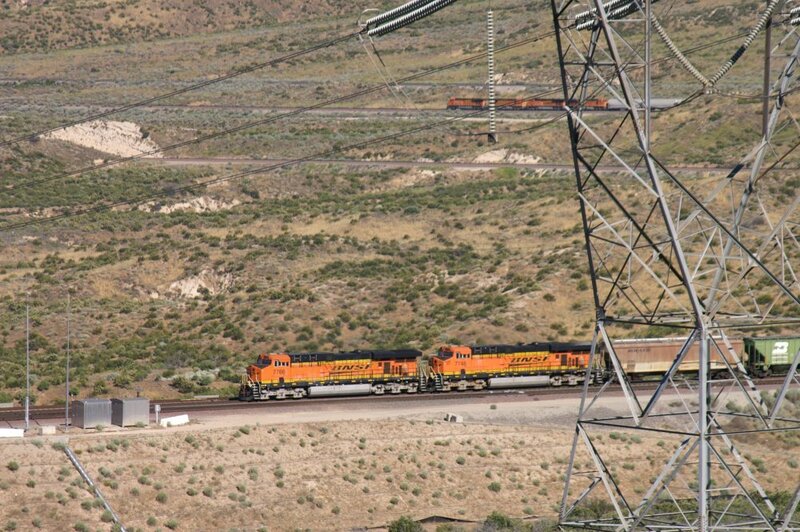 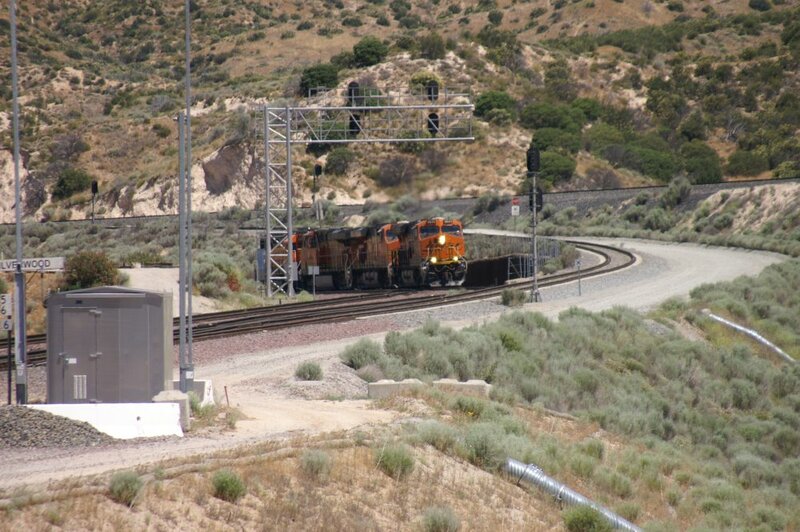 Overview of Silverwood with UP Connector between BNSF MT-1 and UP Colton-Palmdale Cutoff track. 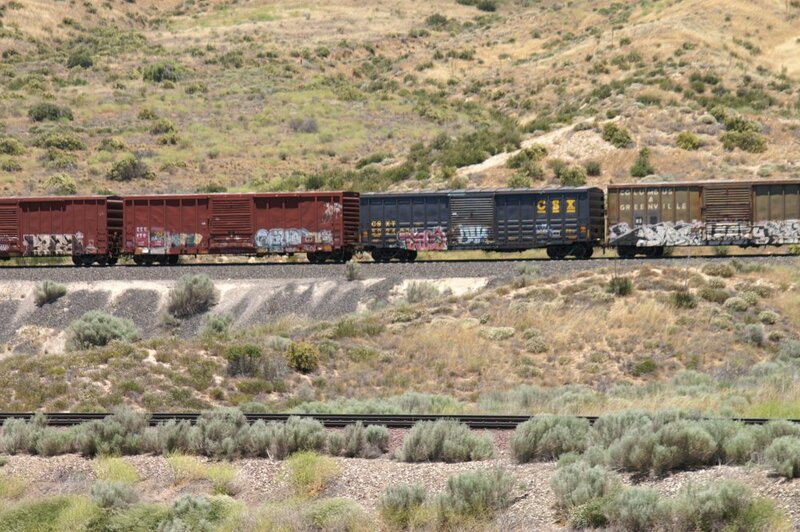 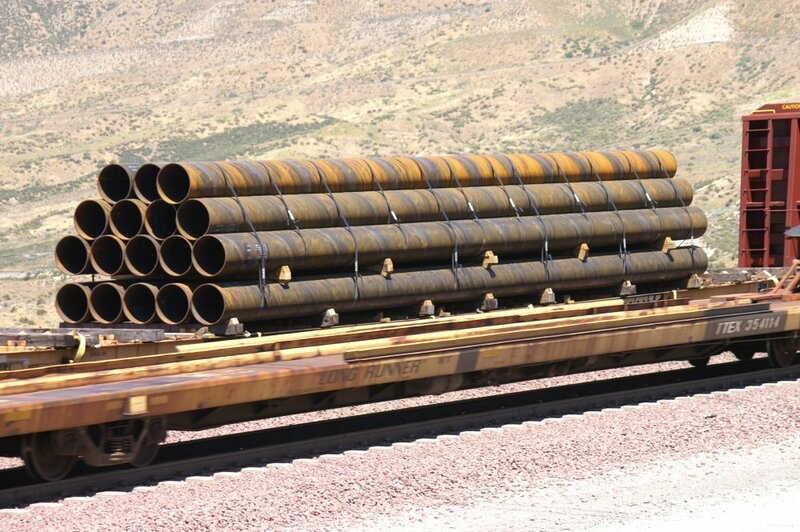 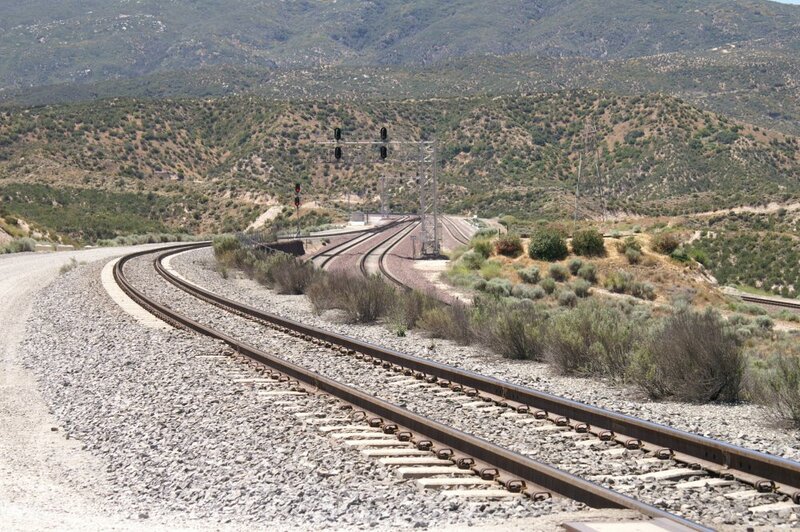 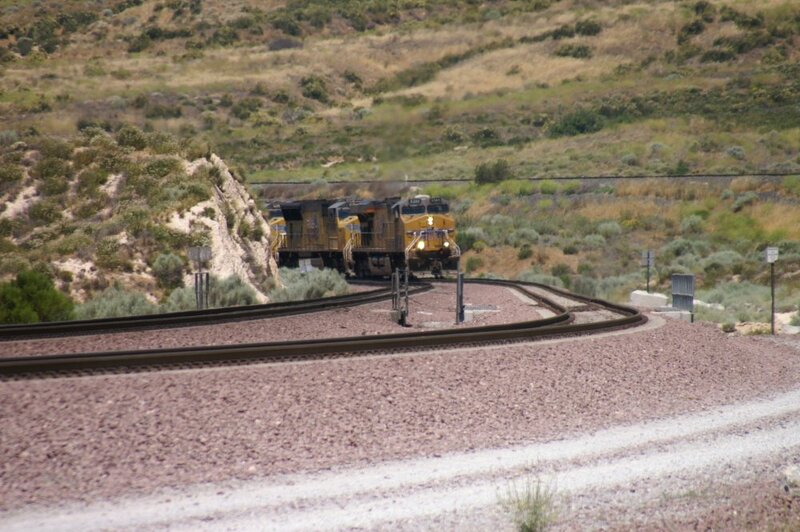 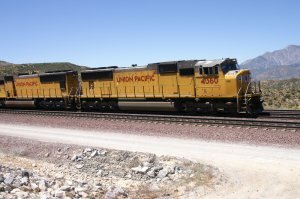 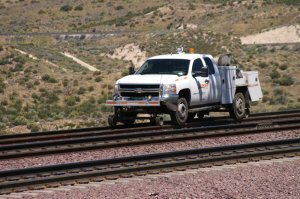 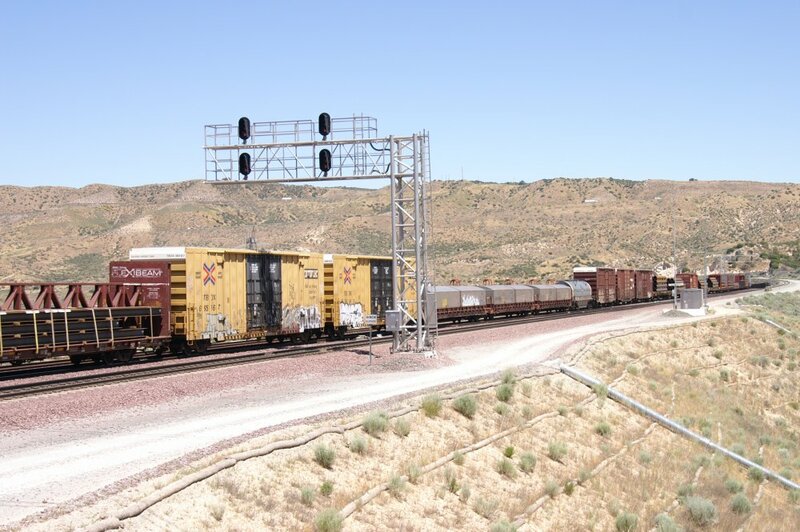 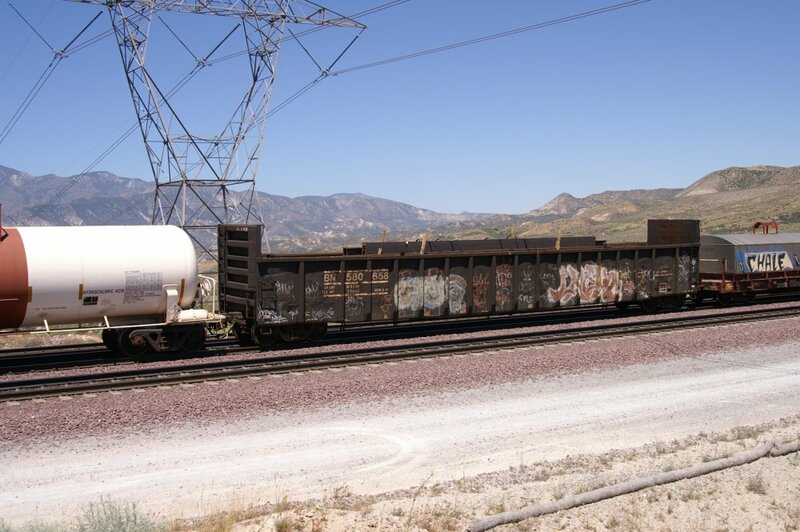 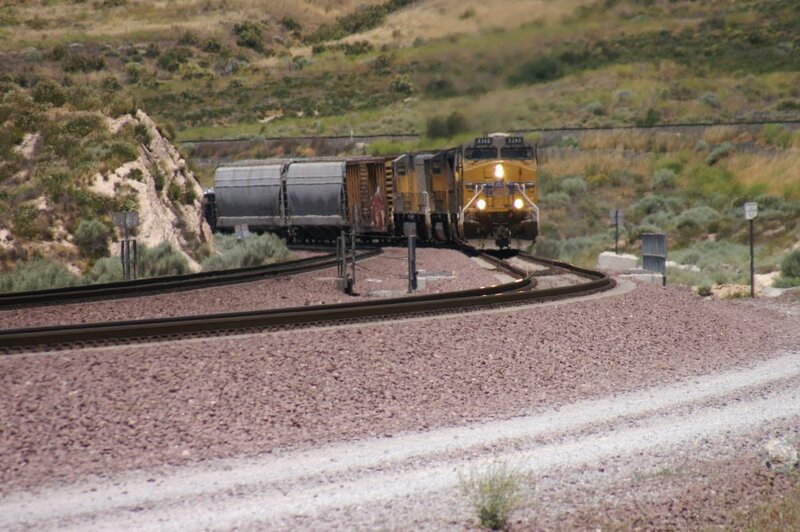 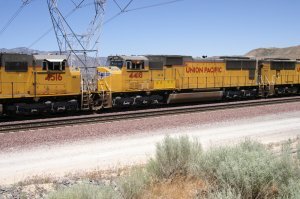 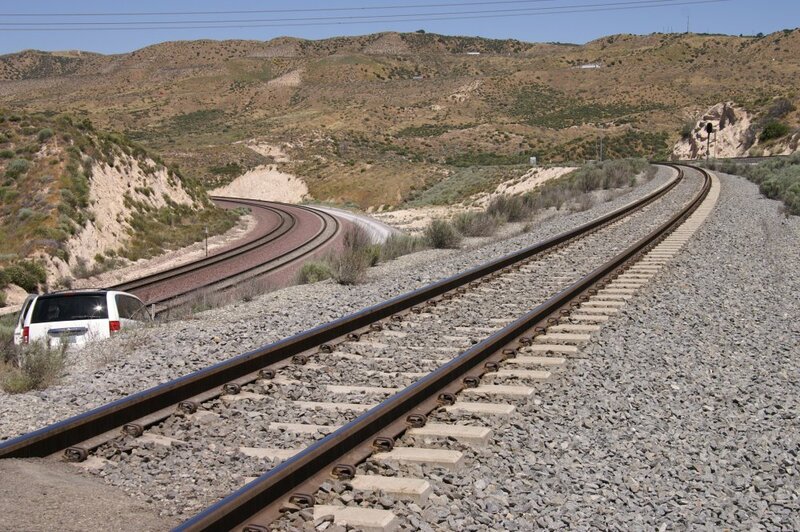 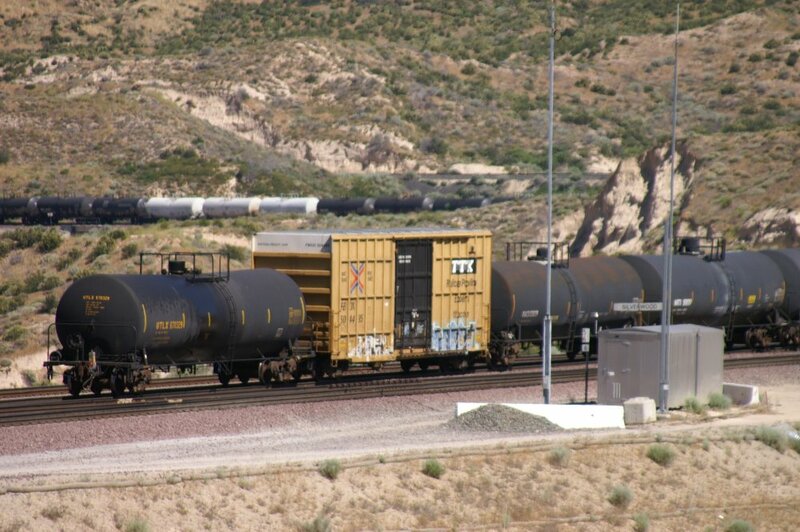 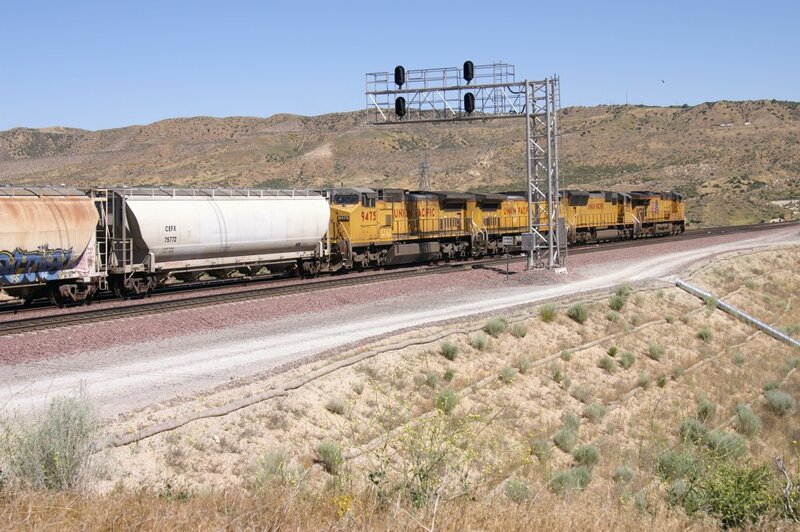 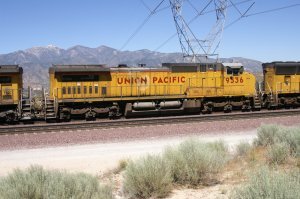 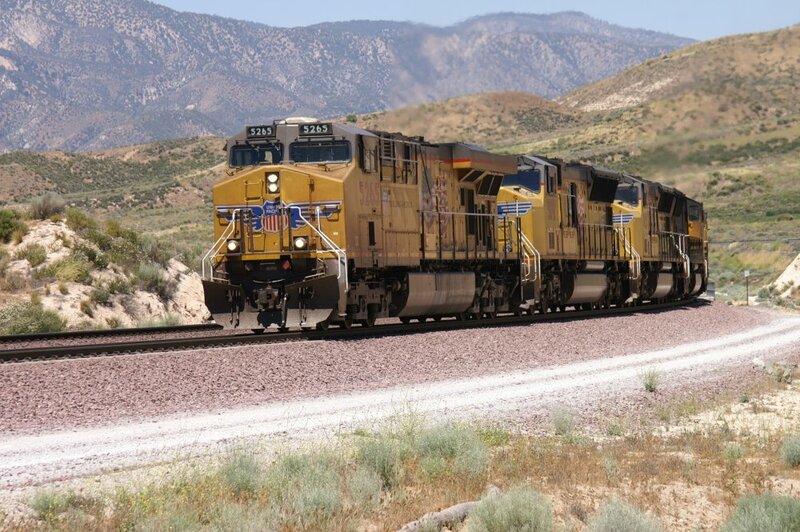 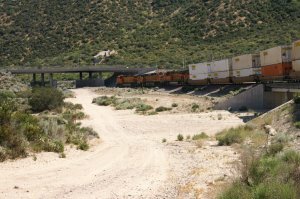 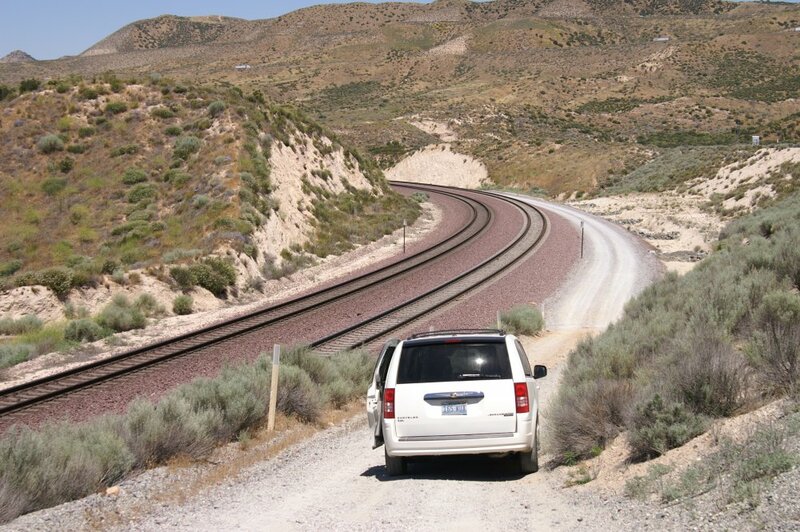 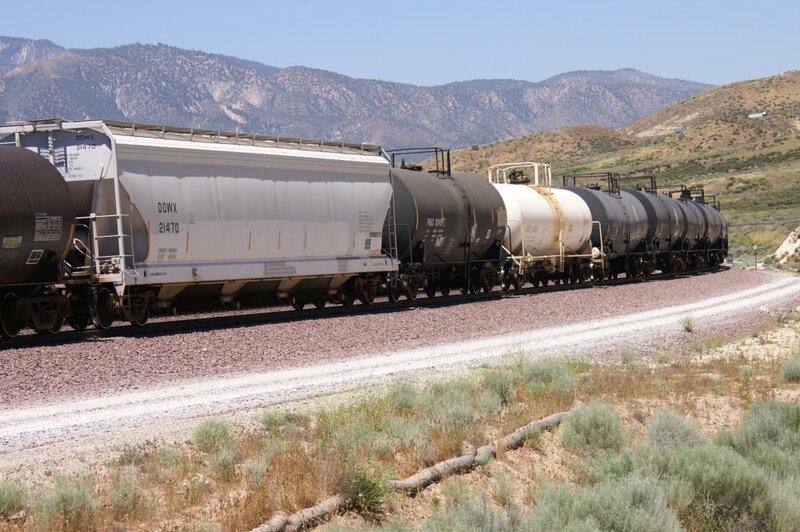 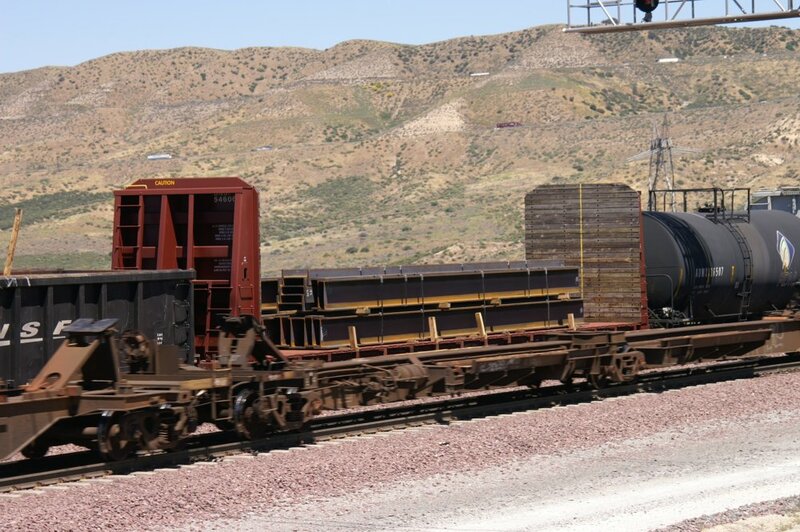 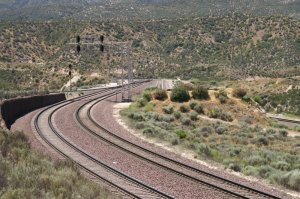 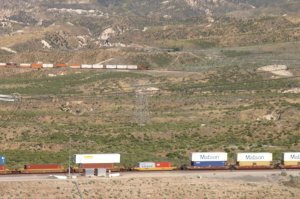 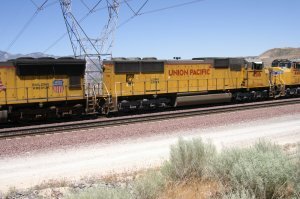 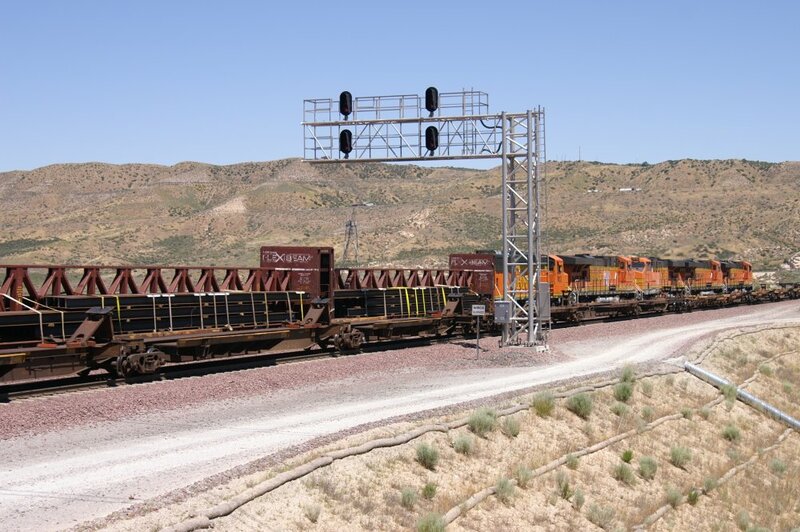 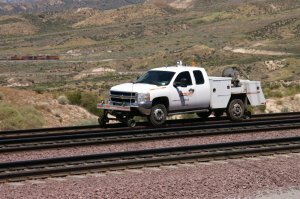 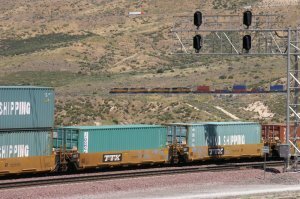 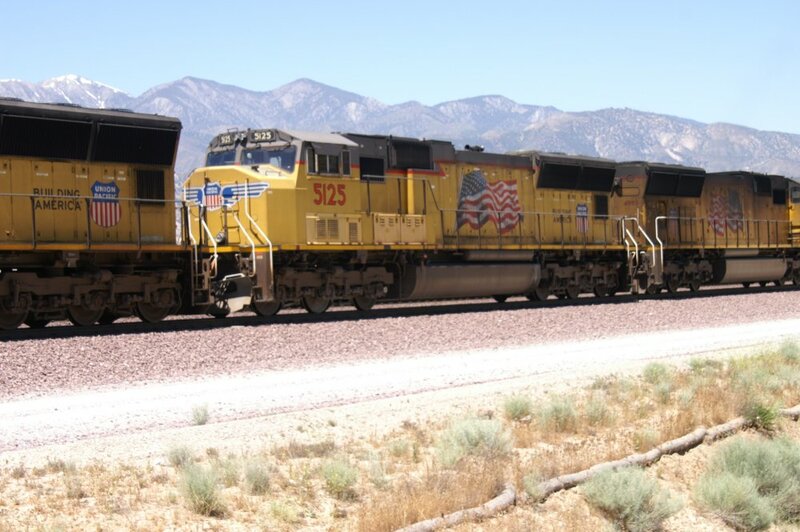 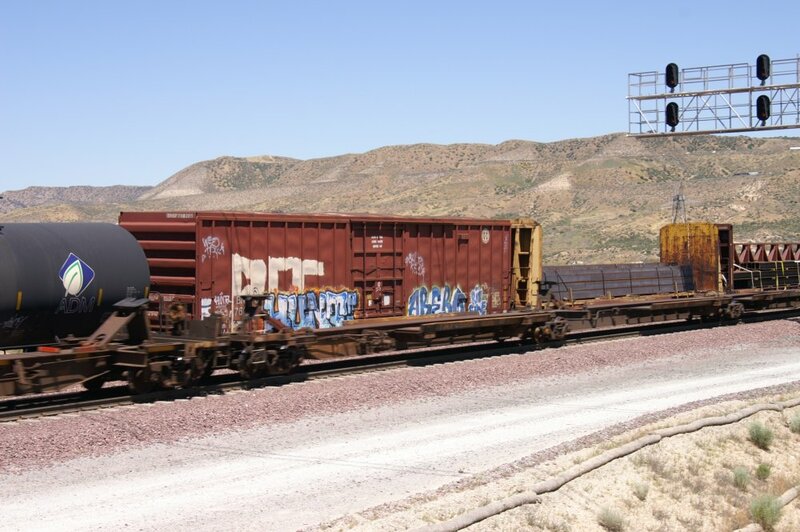 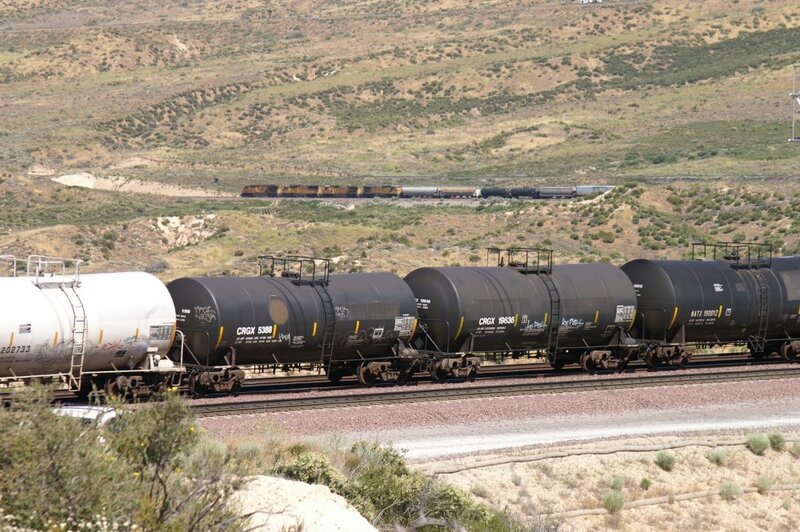 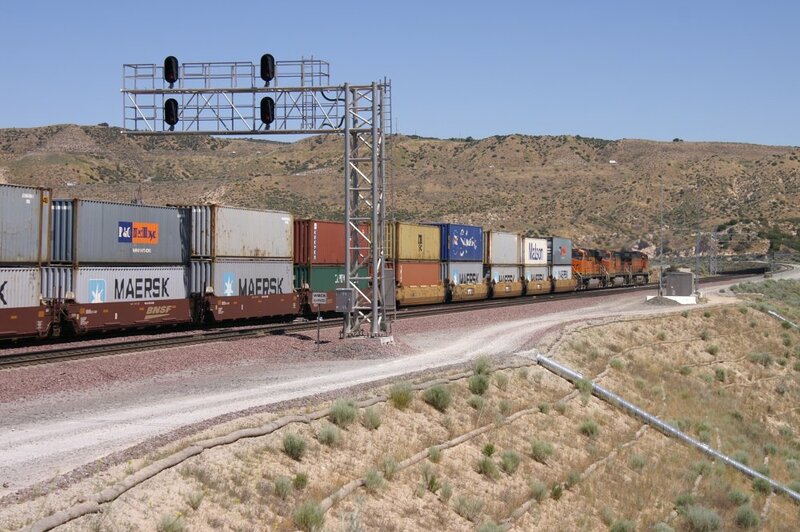 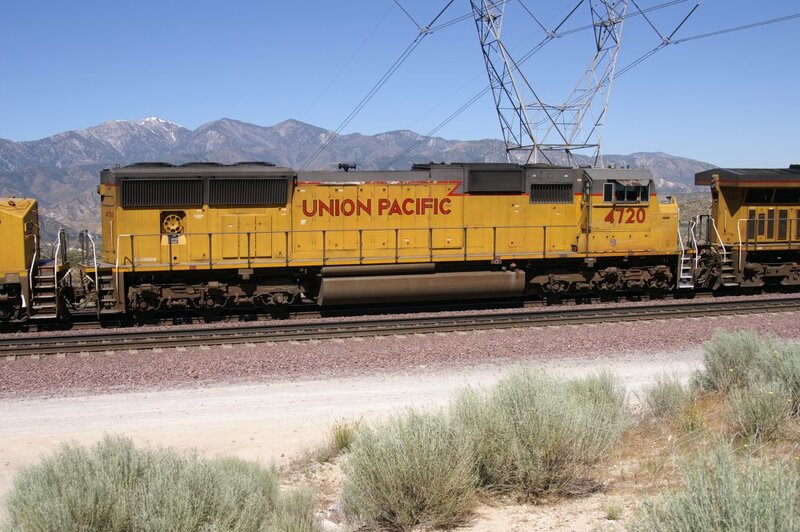 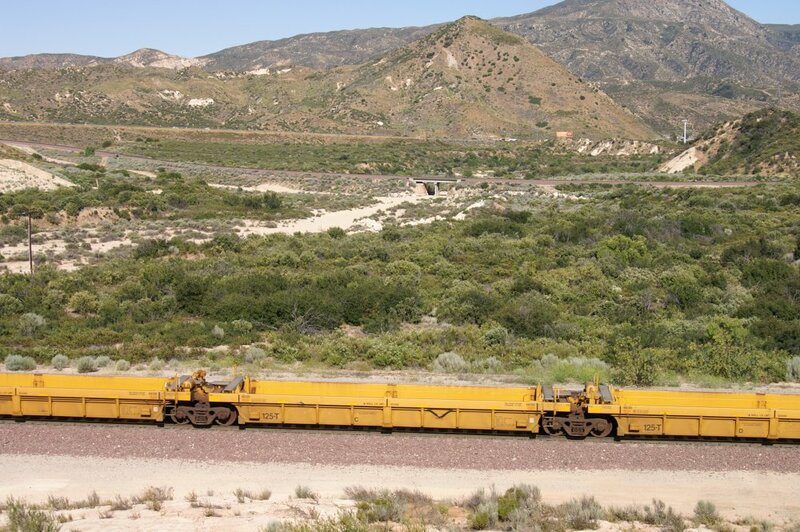 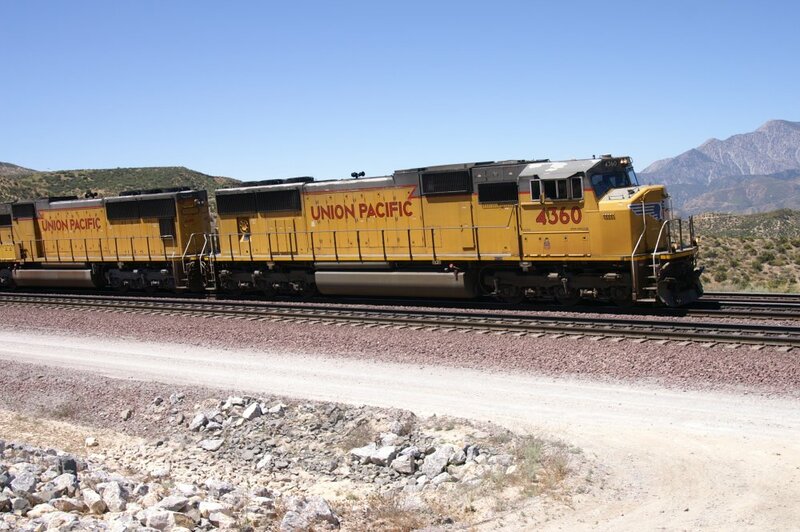 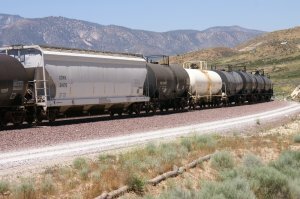 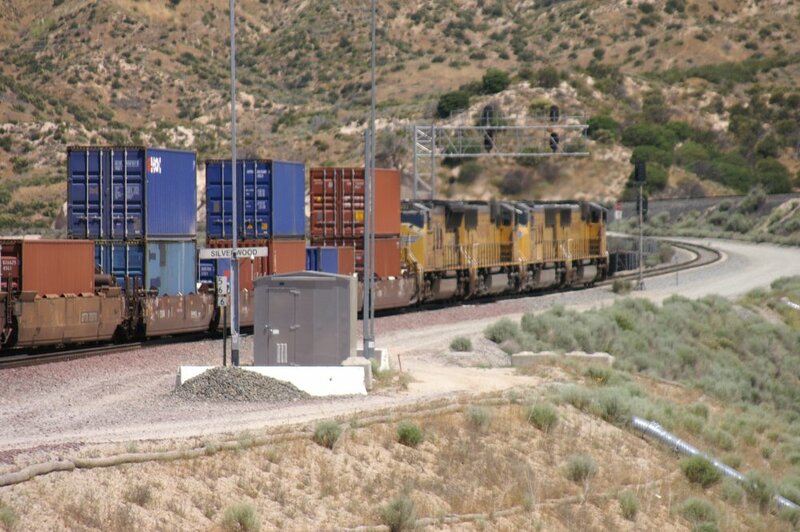 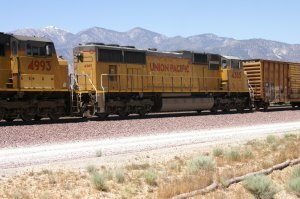 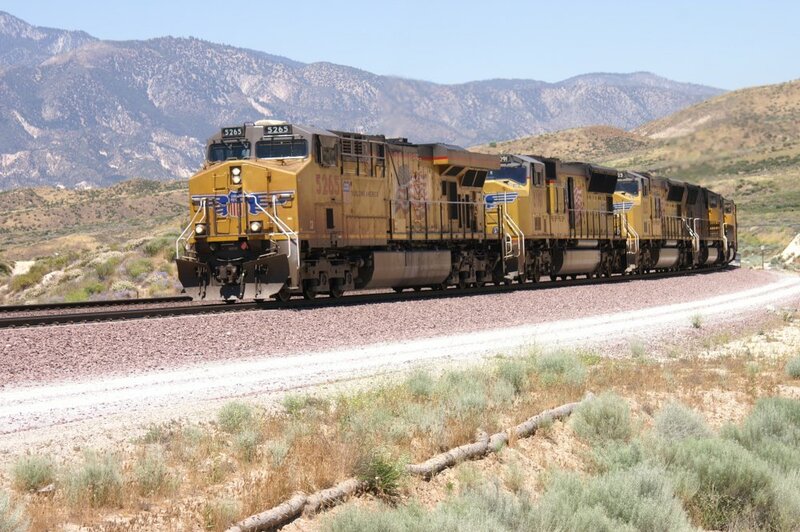 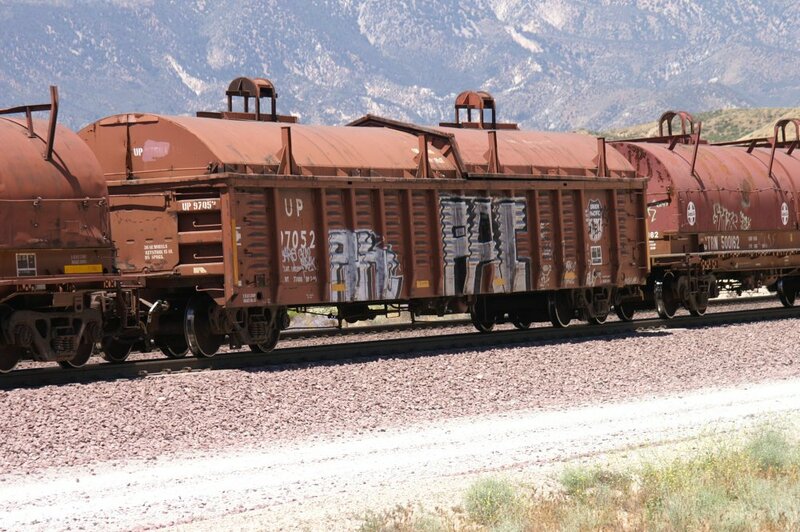 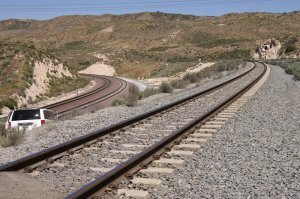 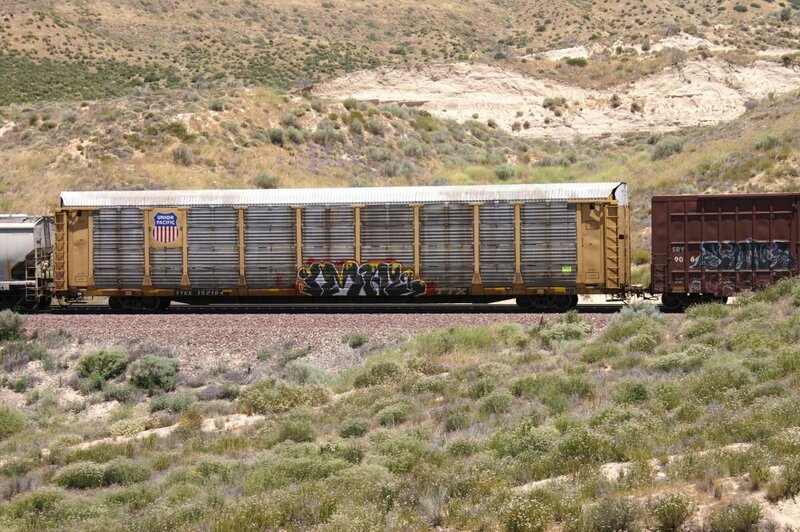 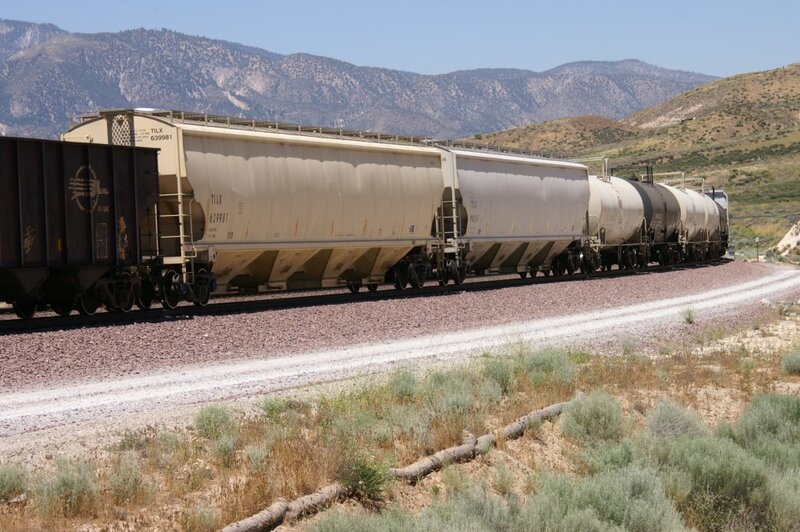 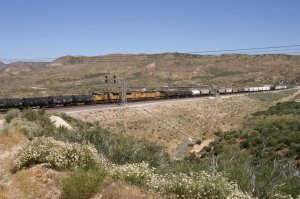 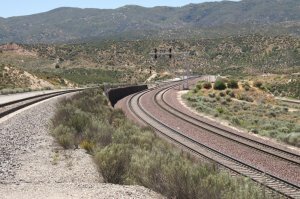 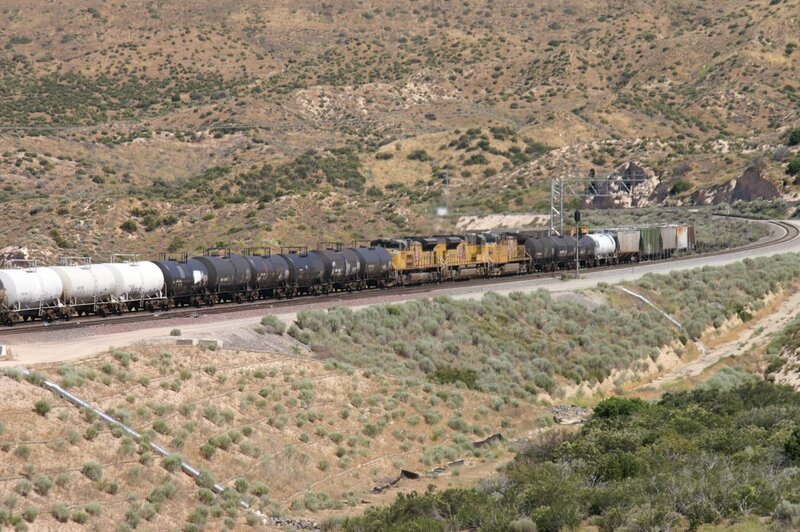 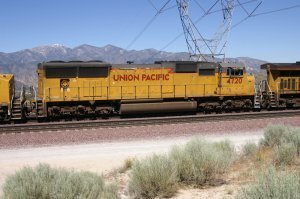 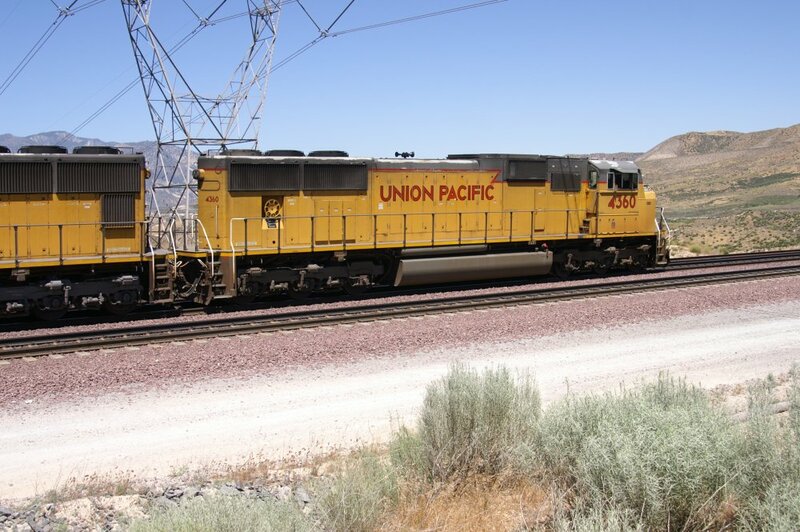 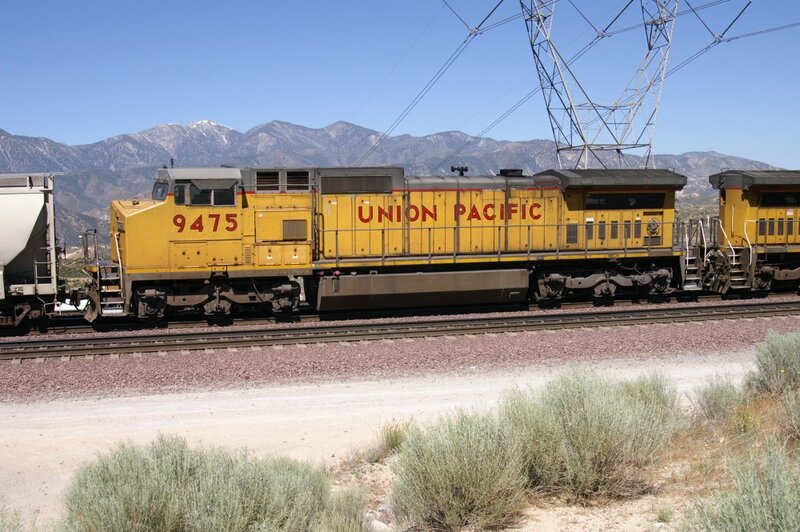 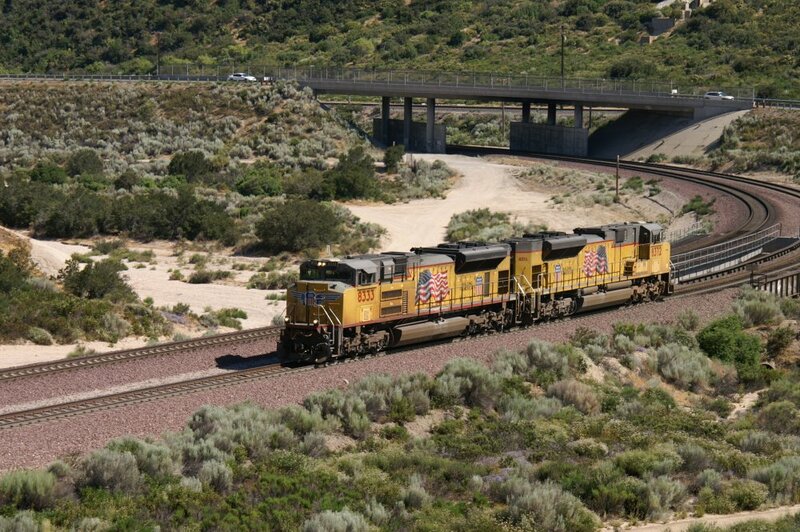 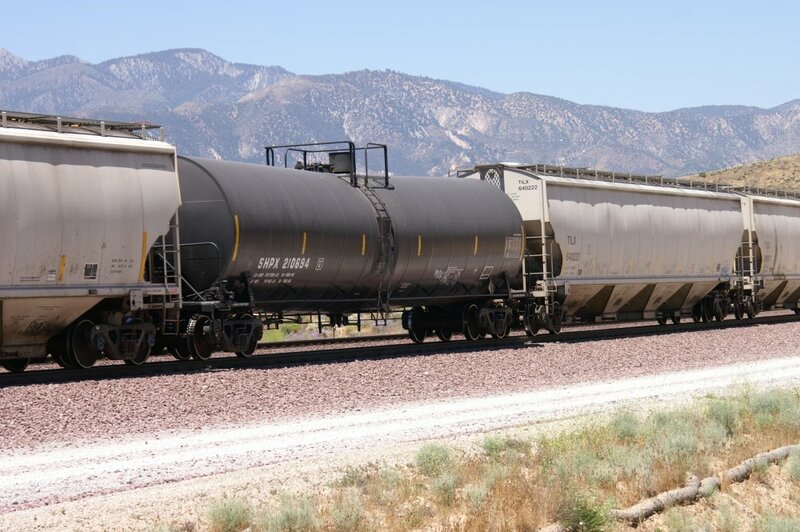 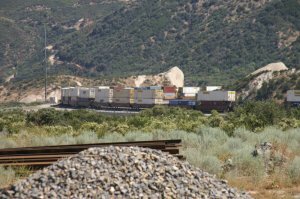 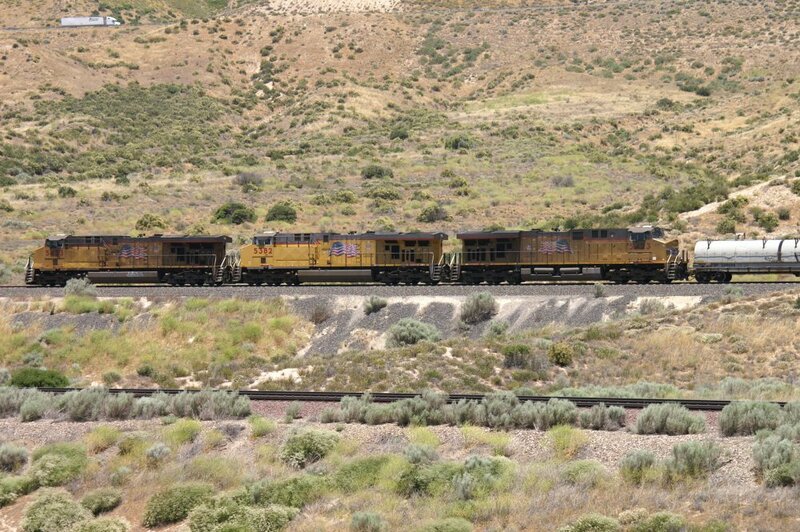 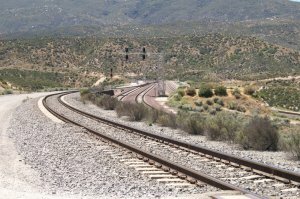 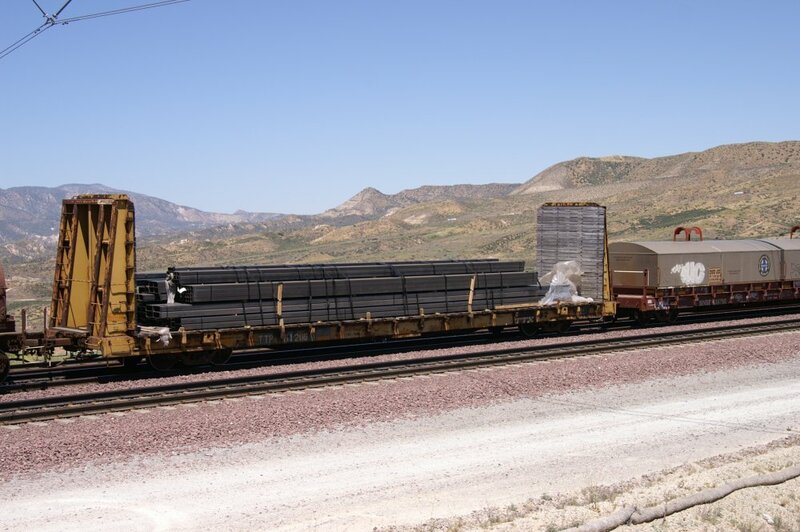 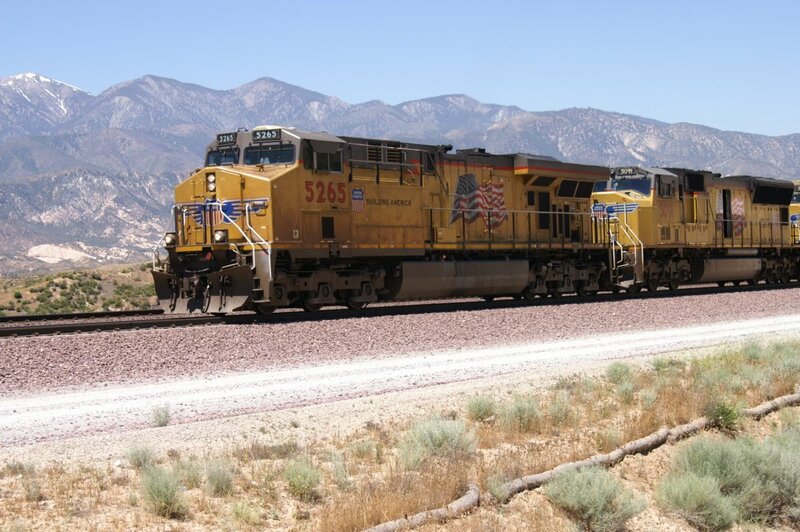 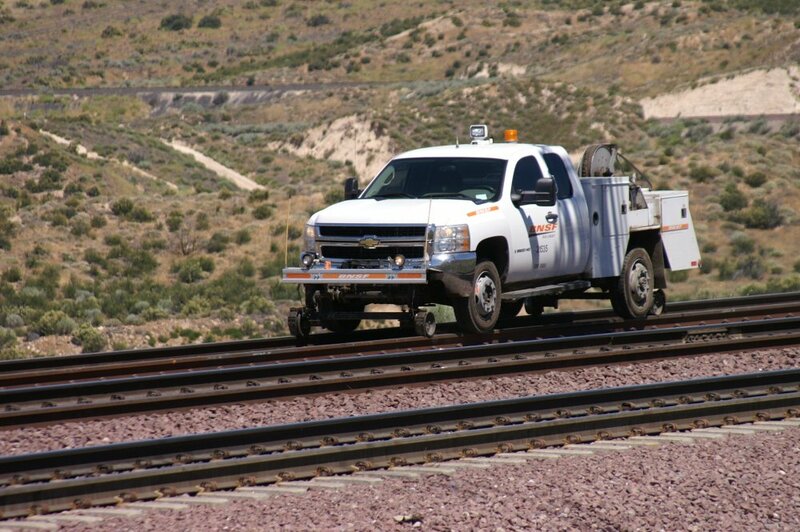 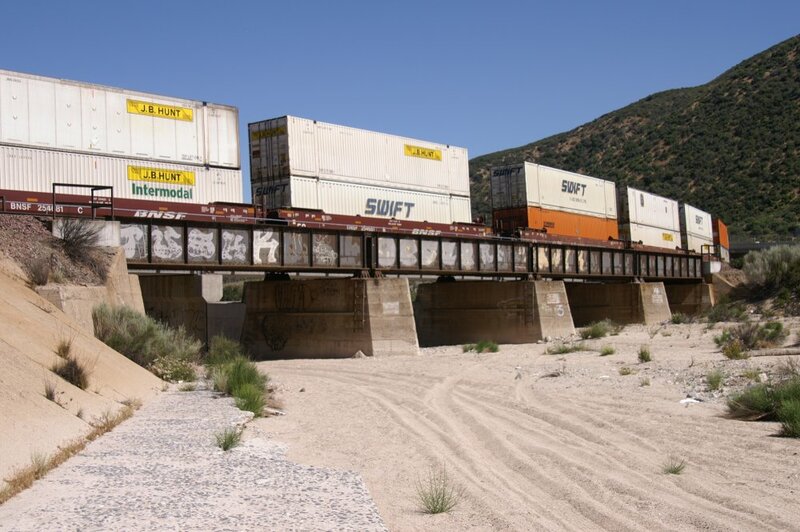 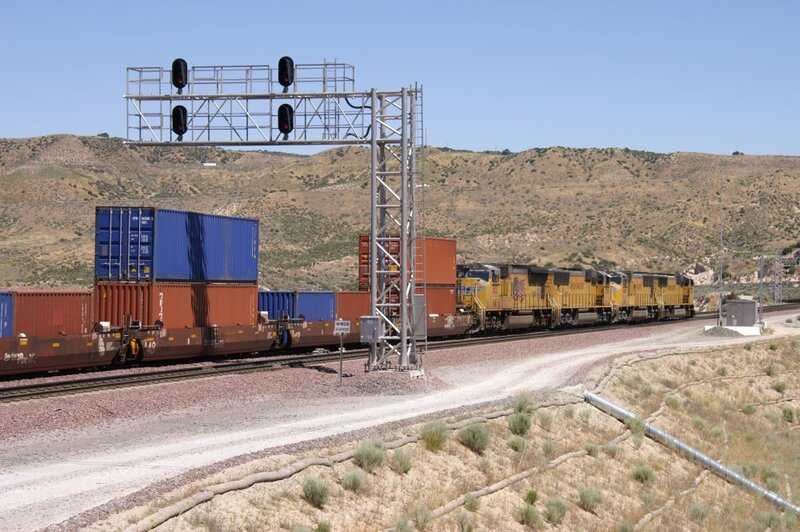 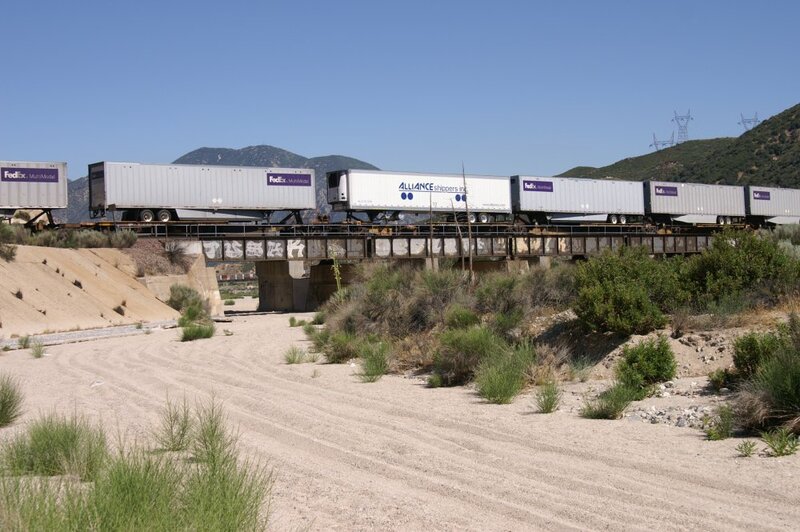 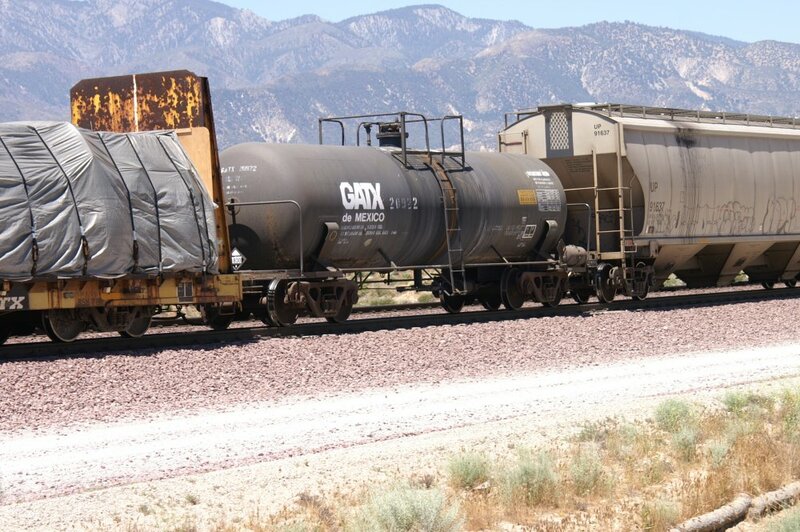 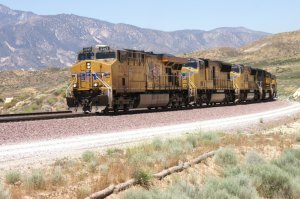 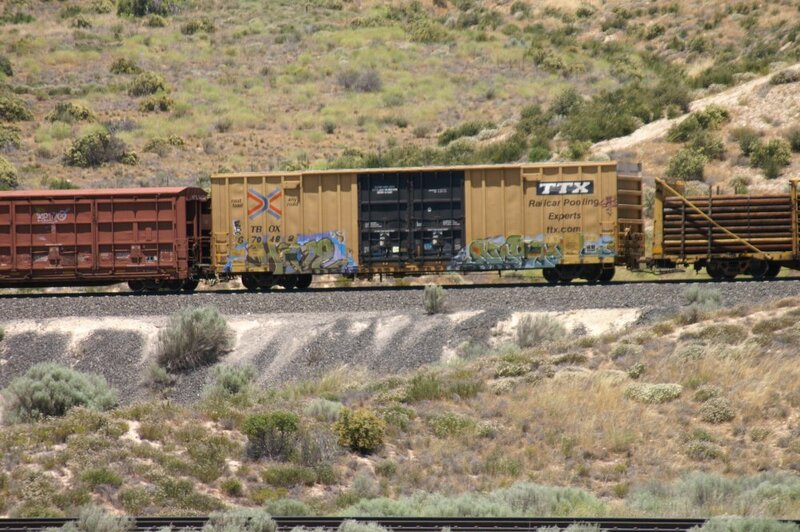 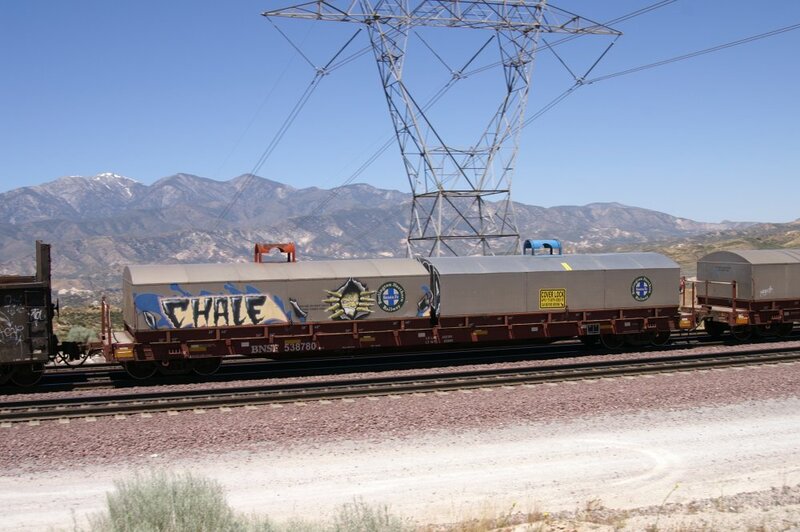 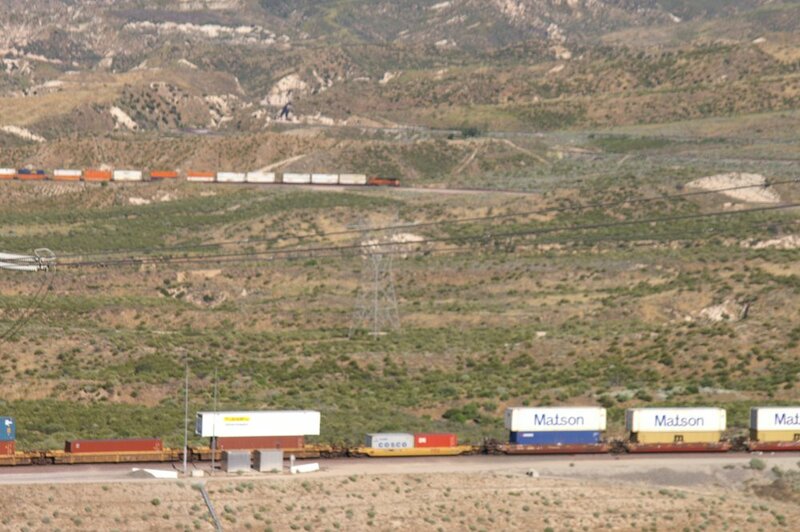 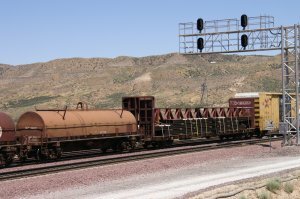 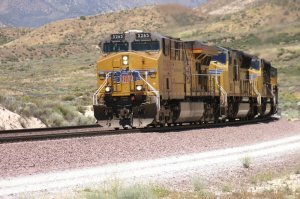 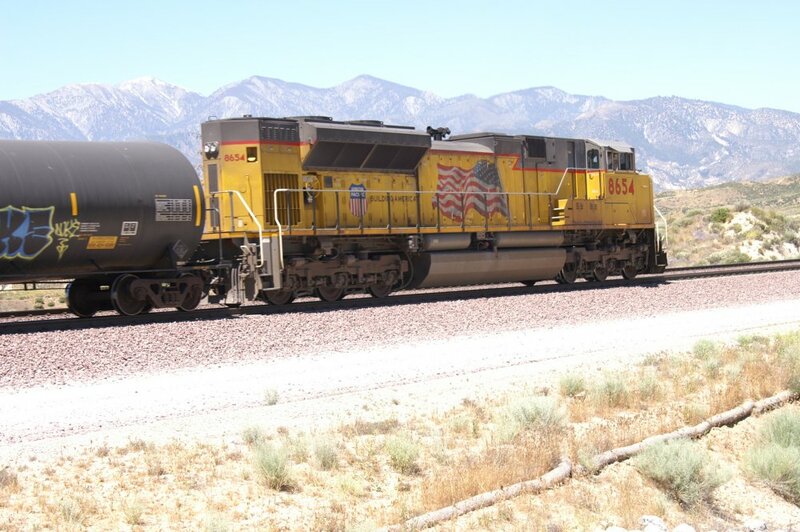 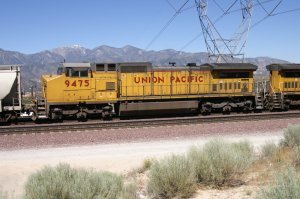 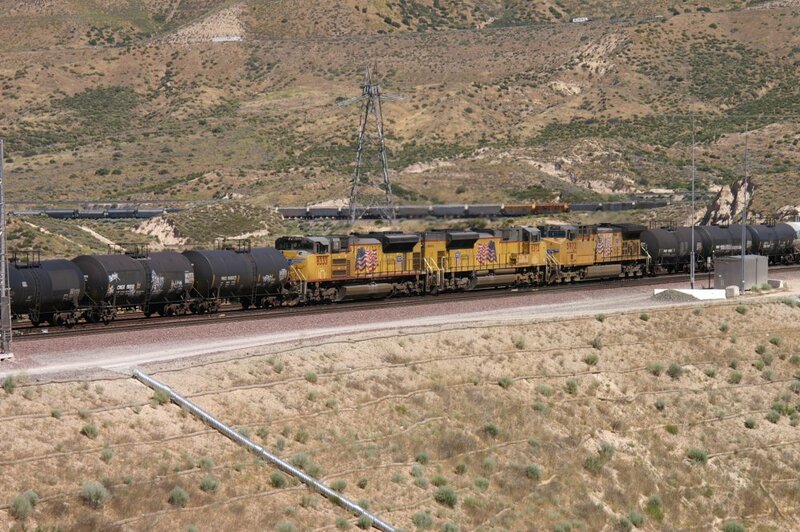 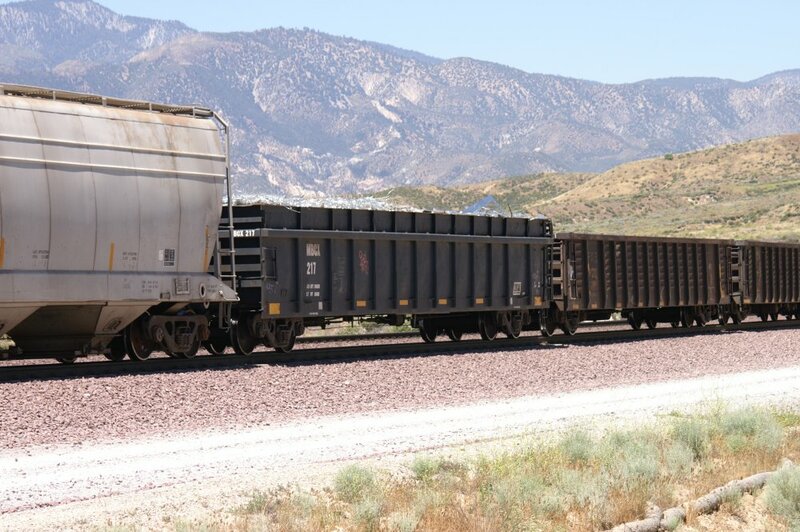 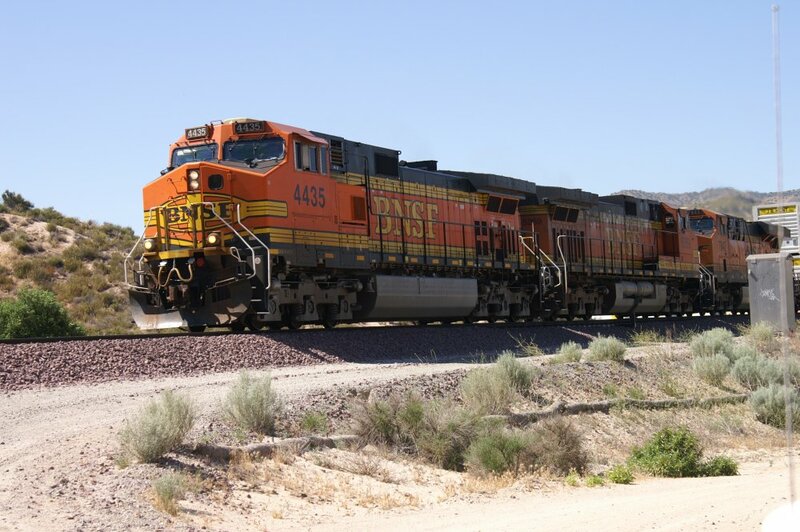 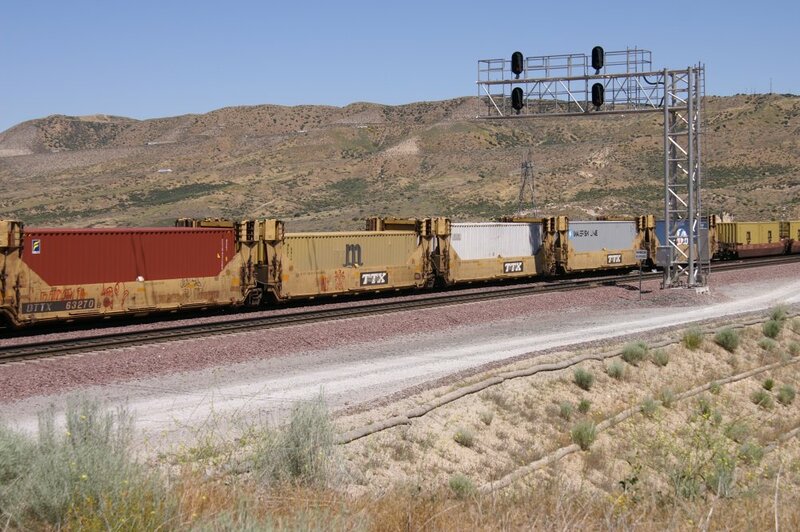 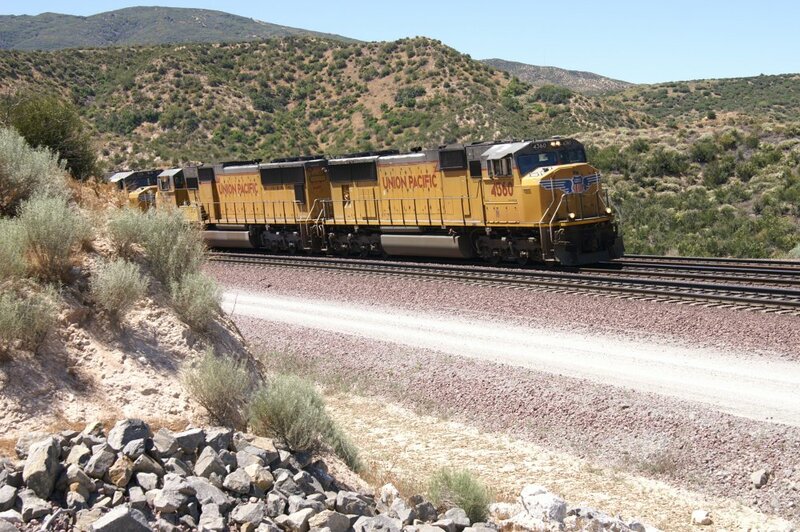 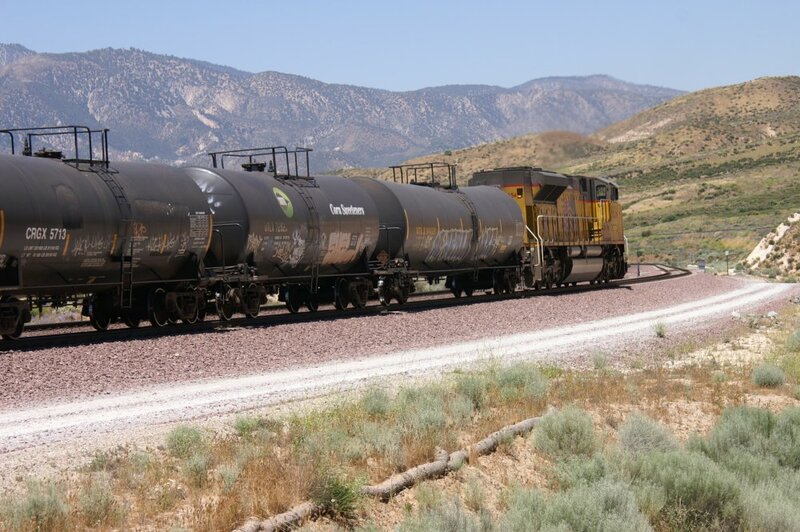 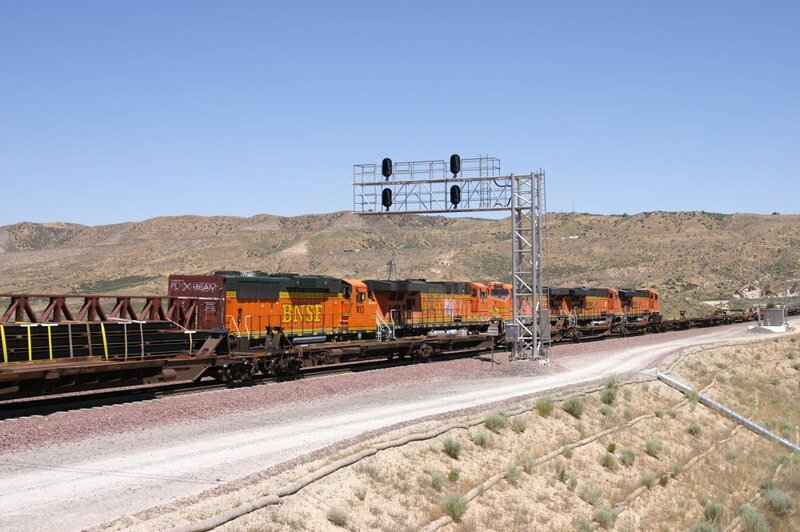 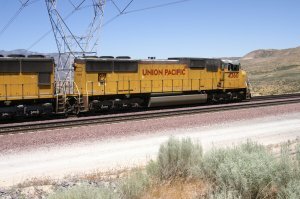 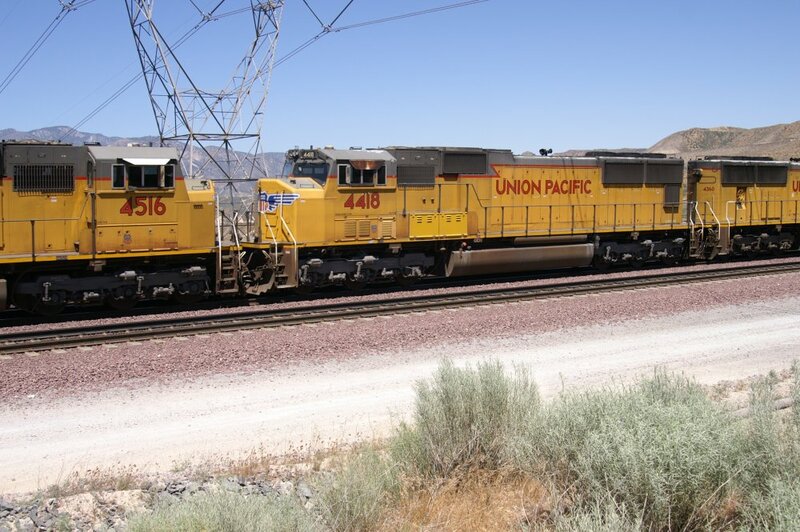 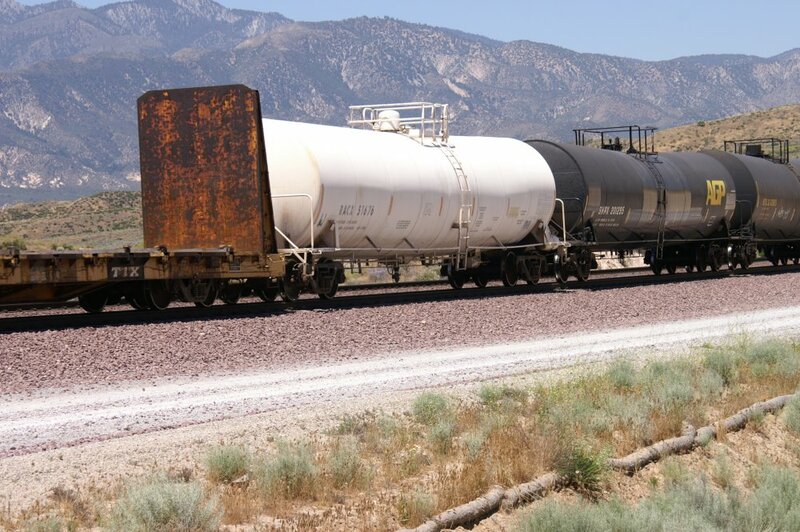 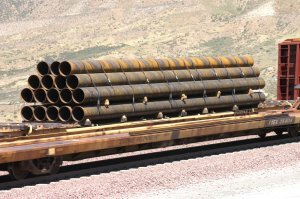 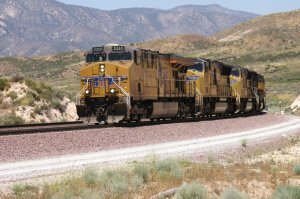 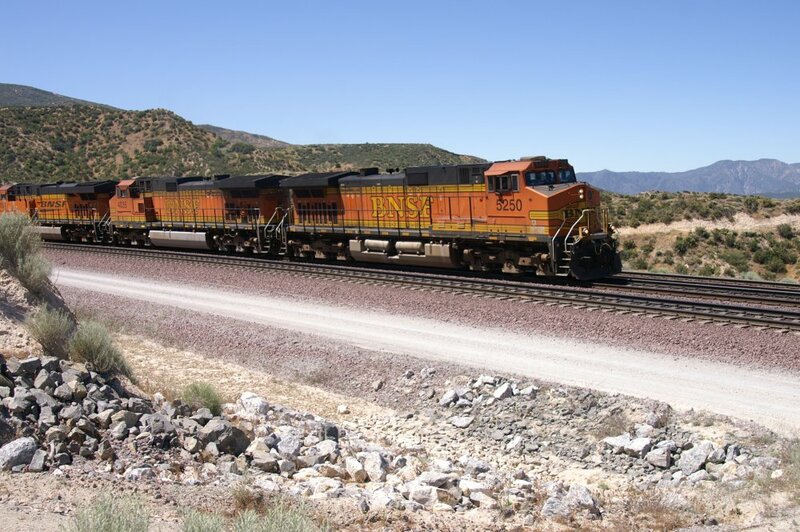 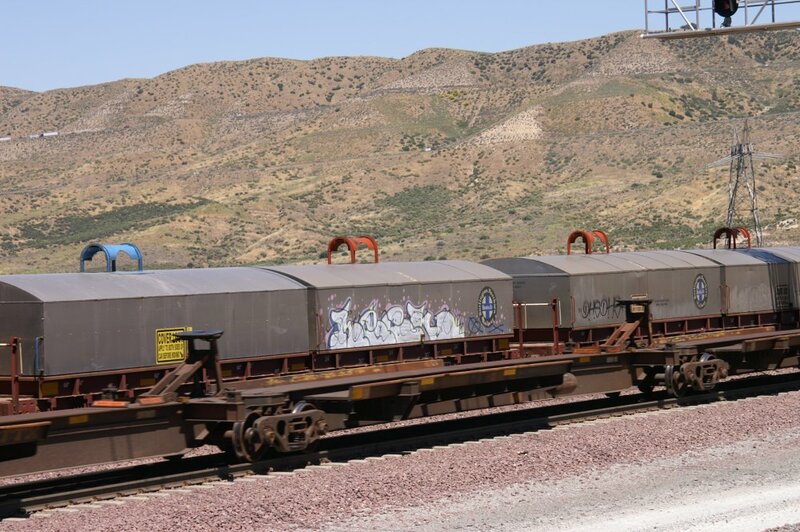 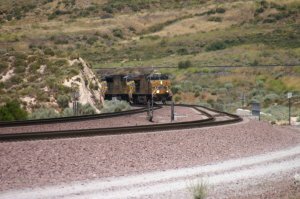 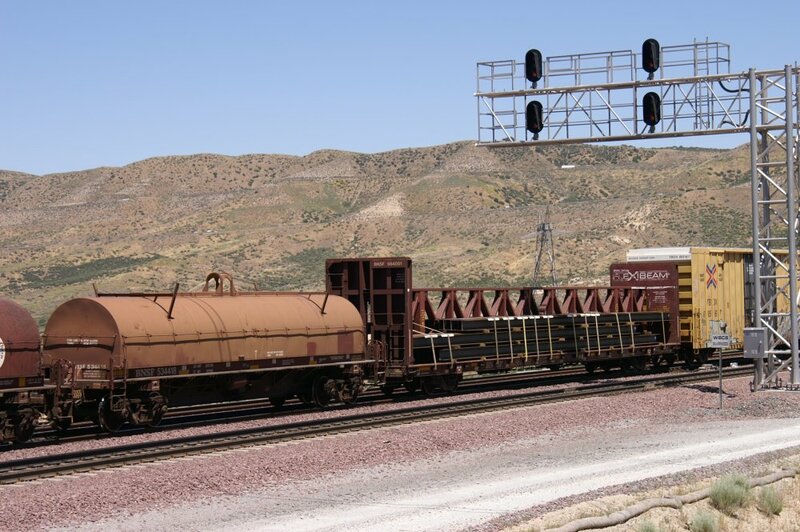 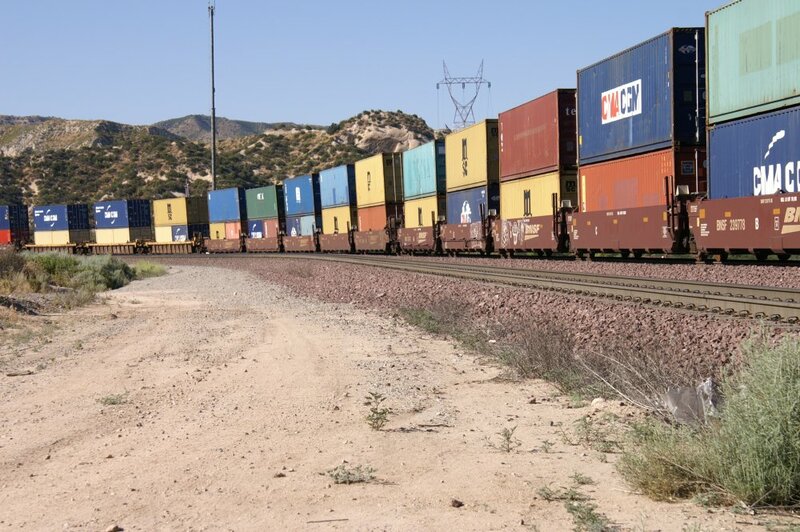 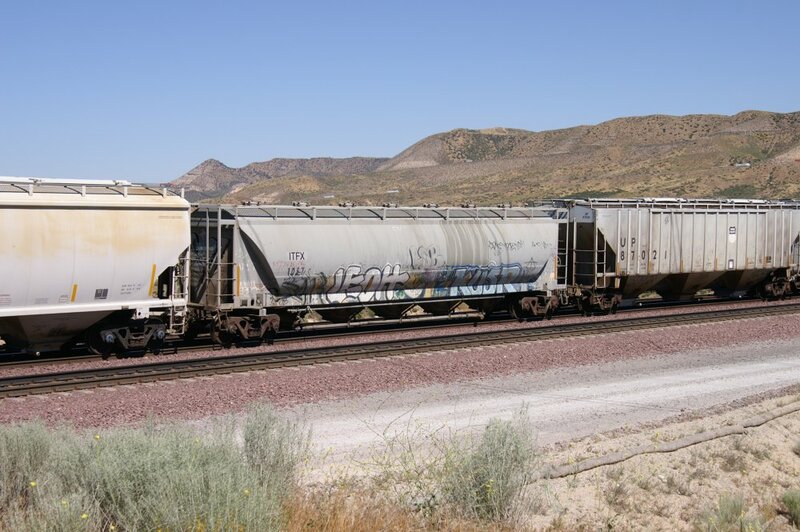 With this connecting track, Union Pacifc is able to switch uphill trains from the UP cutoff to the BNSF tracks heading for Barstow and Daggett. 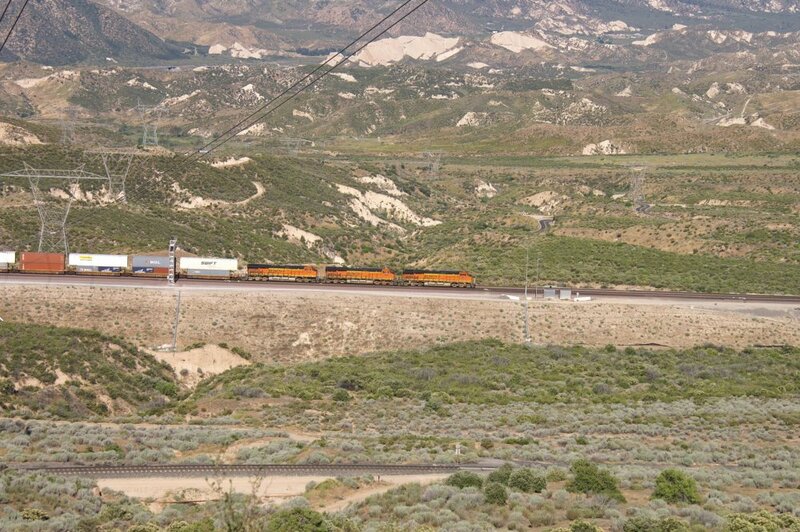 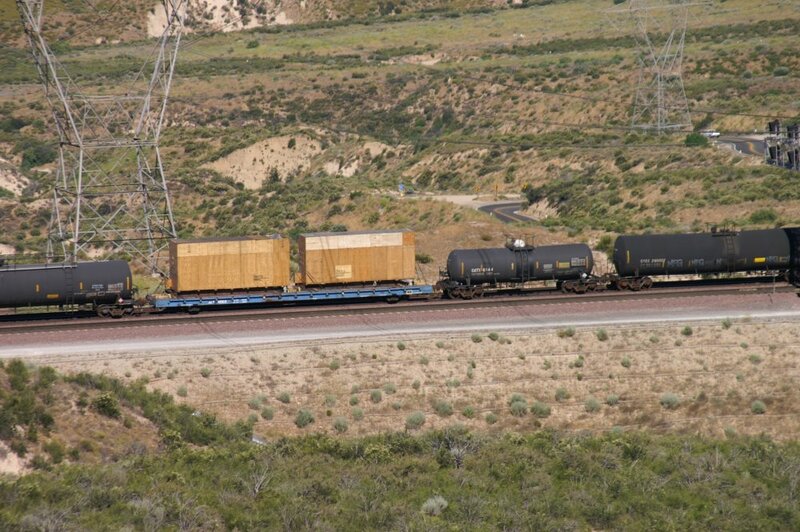 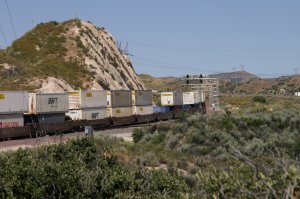 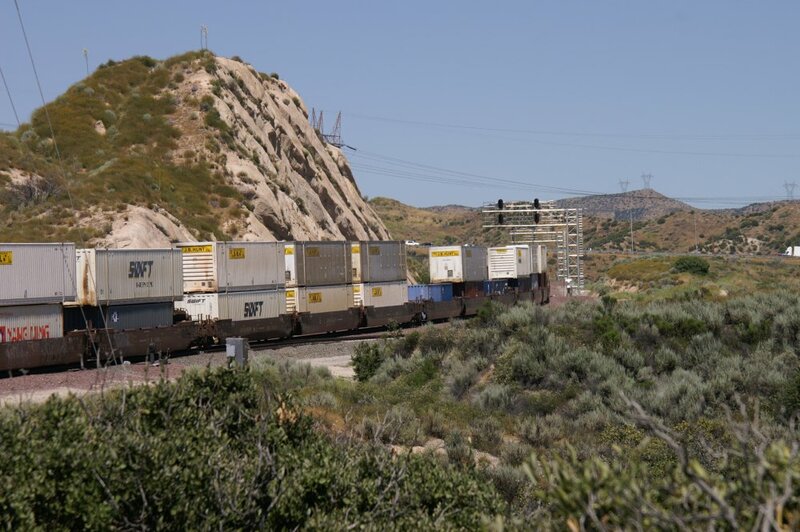 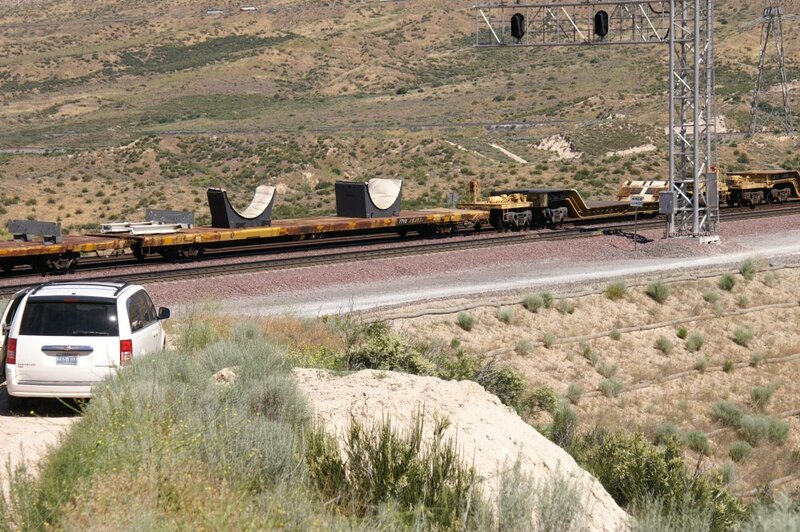 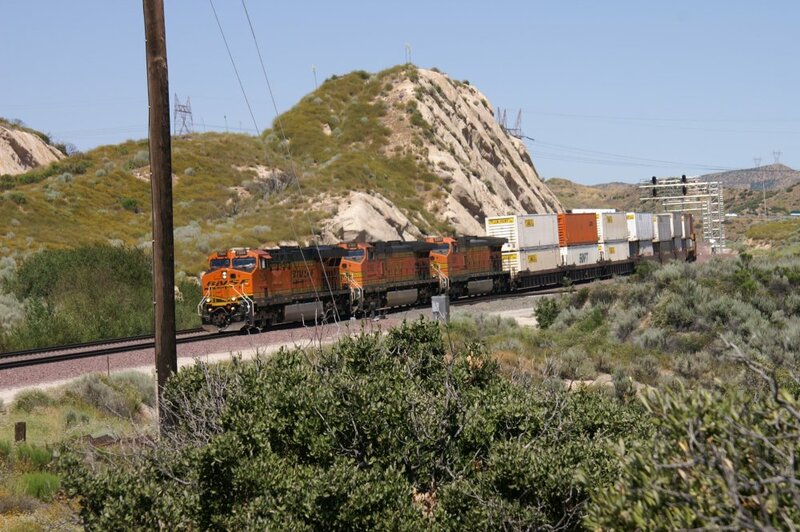 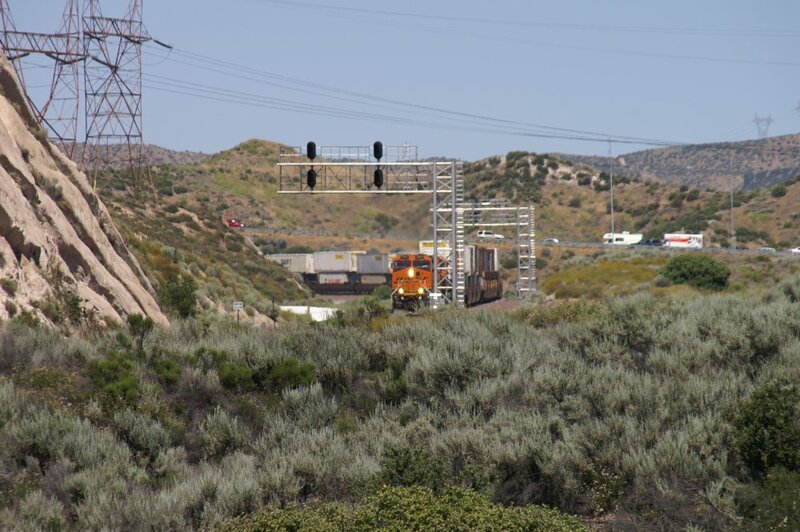 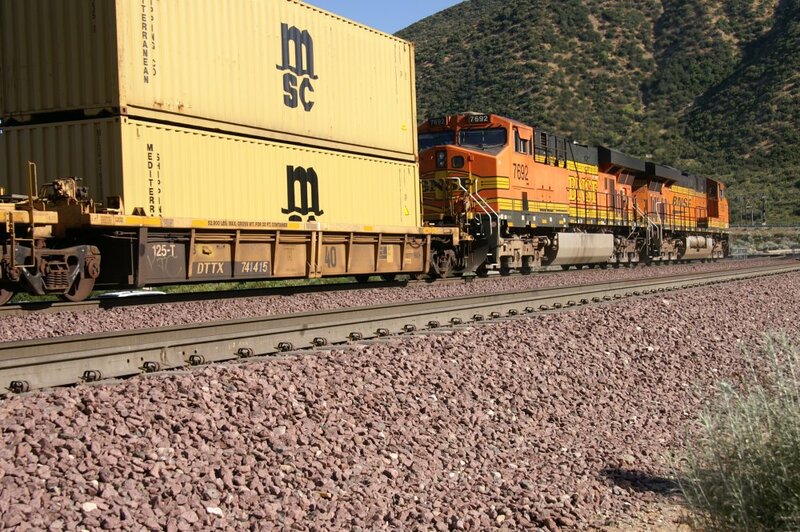 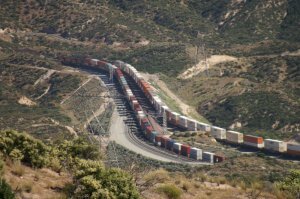 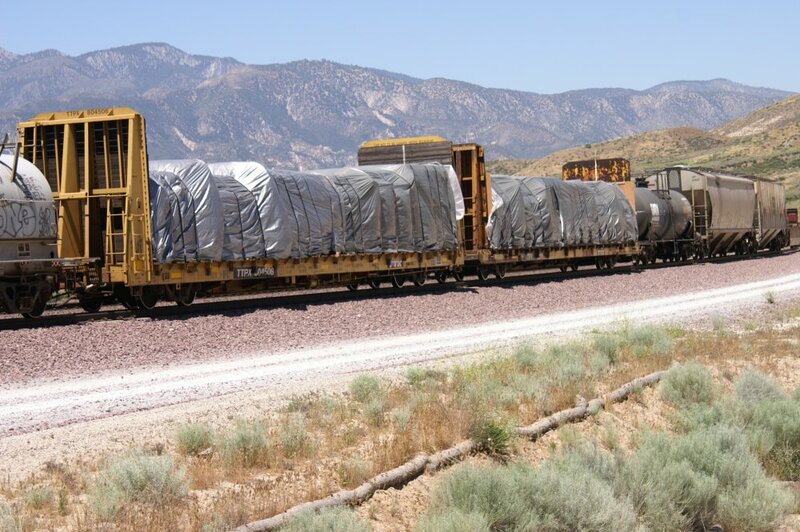 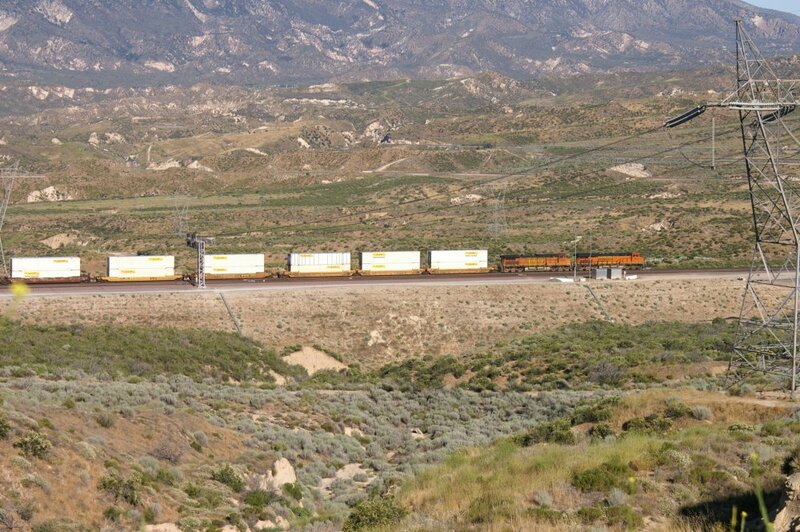 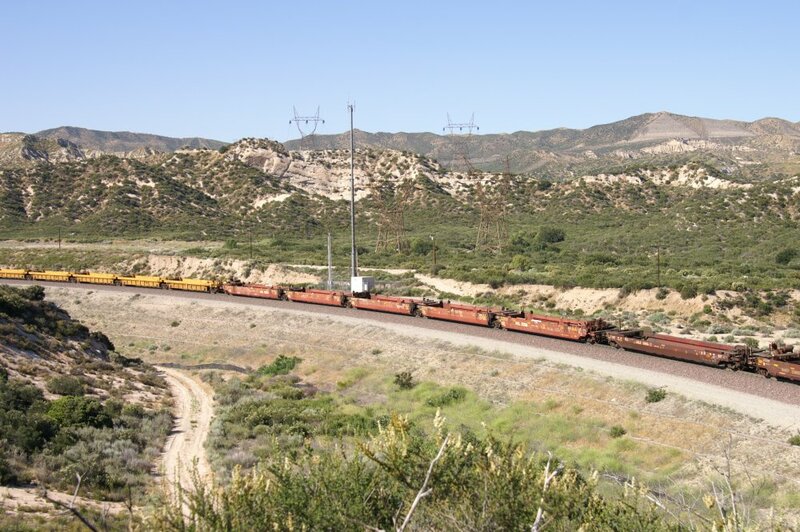 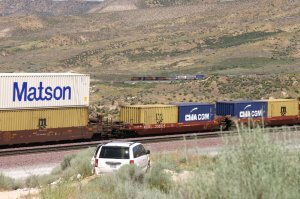 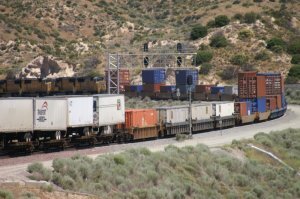 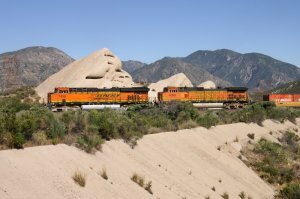 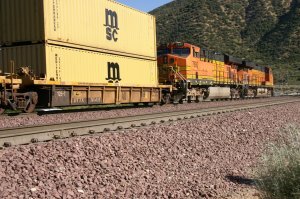 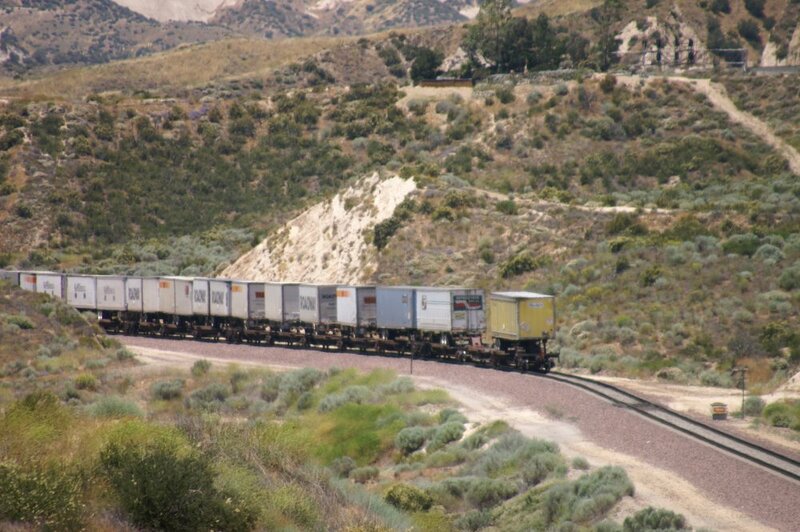 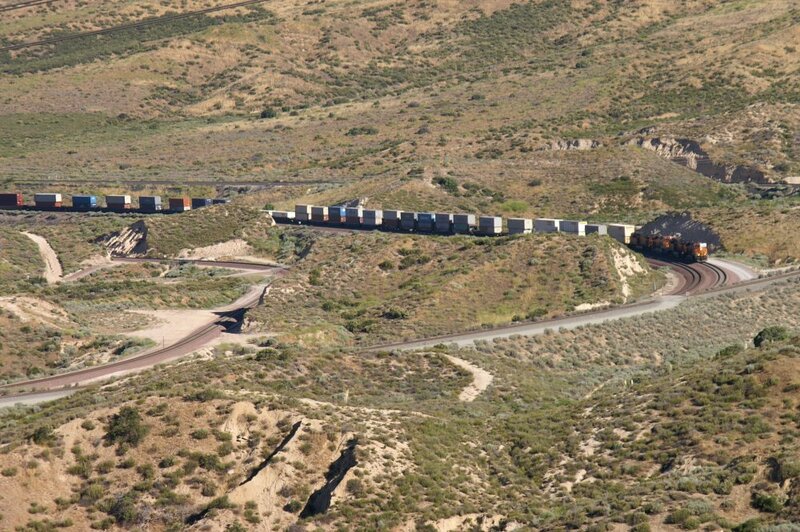 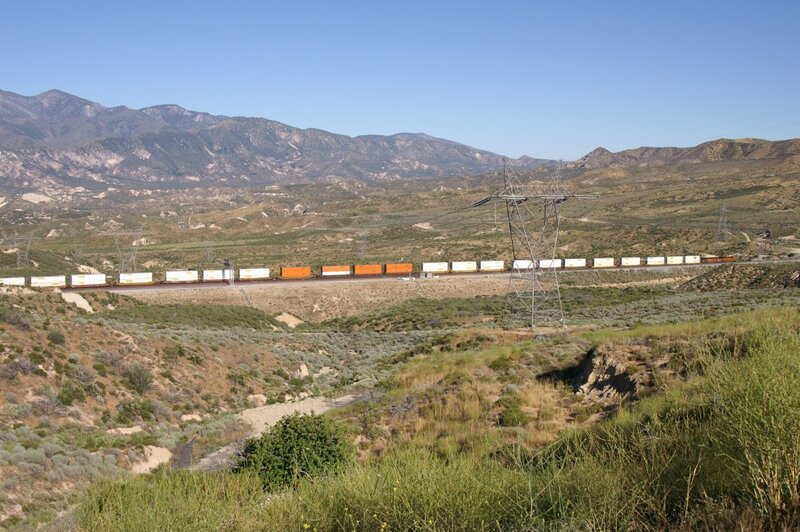 UP Trains coming from Dagget can switch from BNSF to UP tracks going down to Colton. 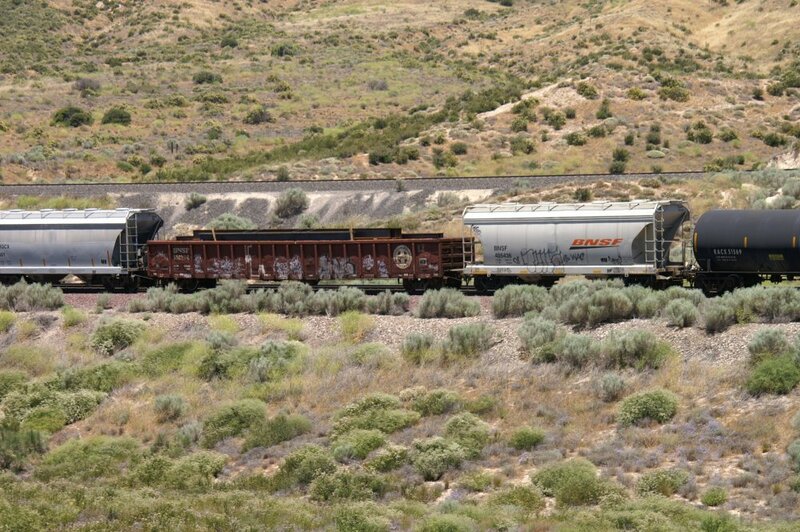 For the 6 photos below, I left my last photo stop and drove down along the BNSF tracks. 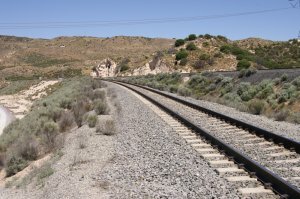 I had to cross the connector (see 21031). 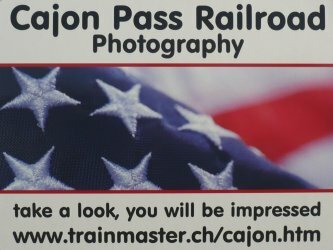 After this UP EB Train, I was able to go to my next photo stop. 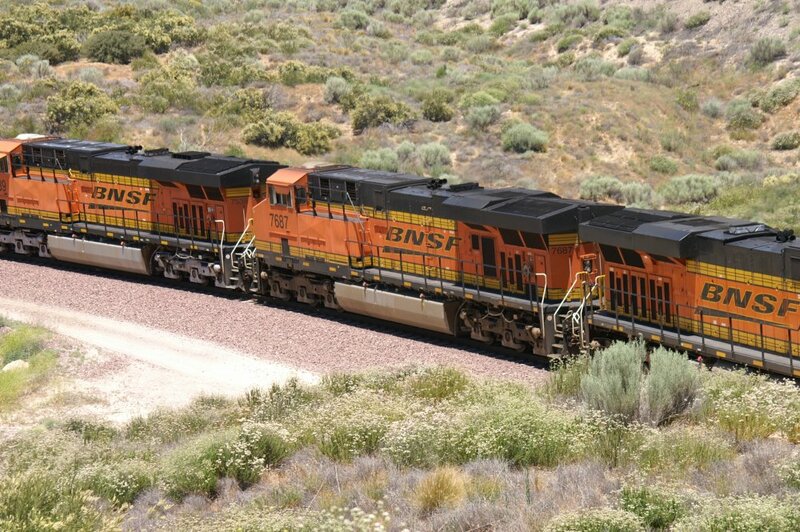 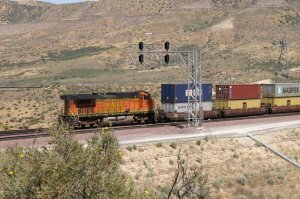 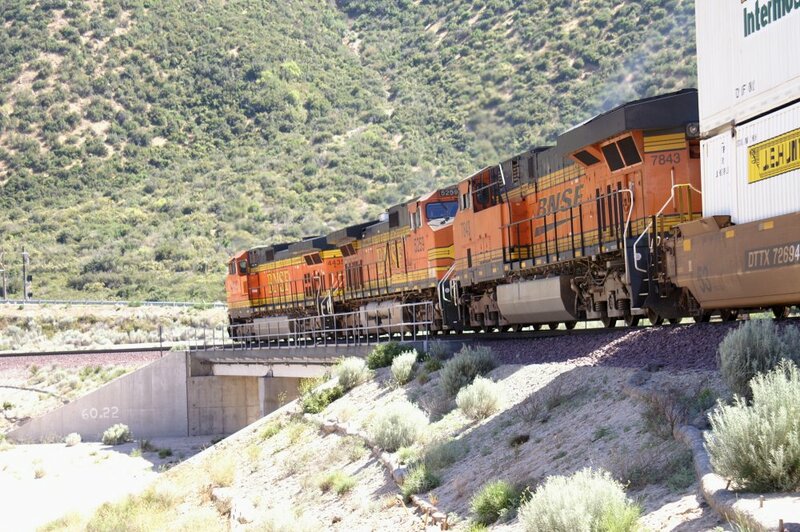 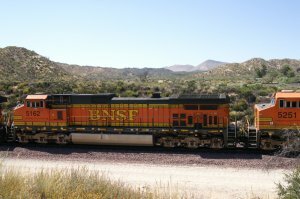 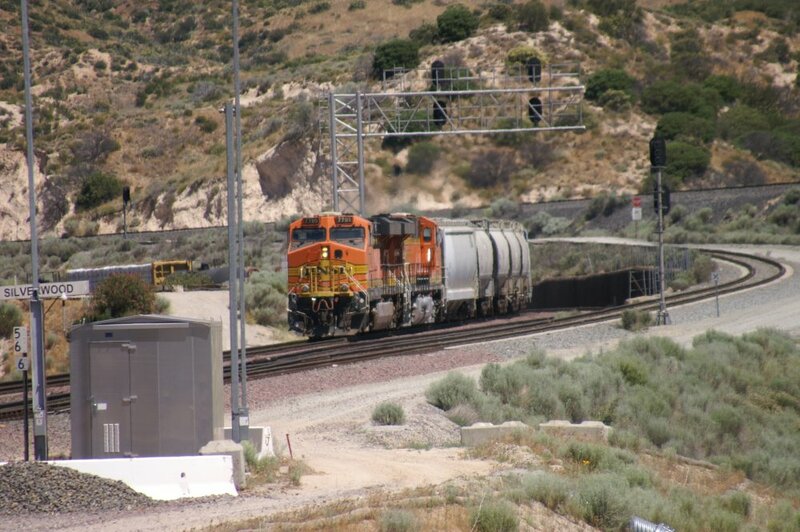 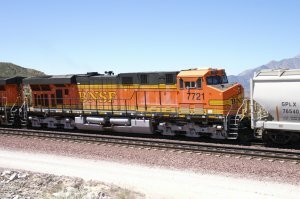 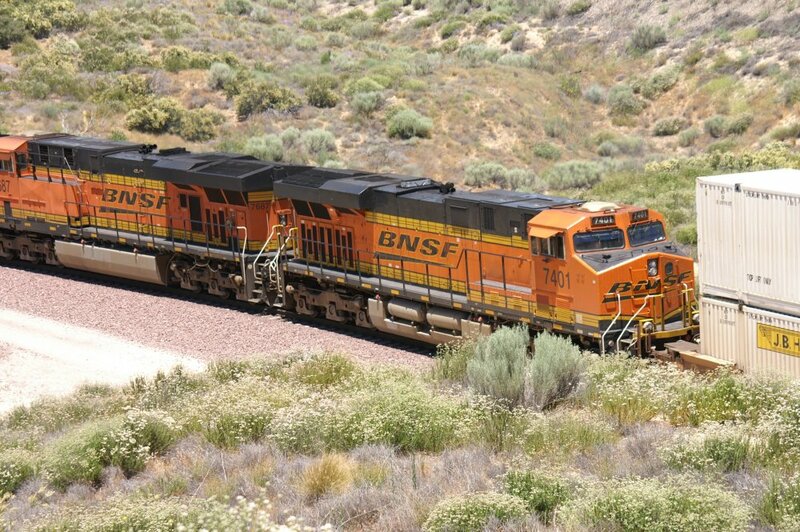 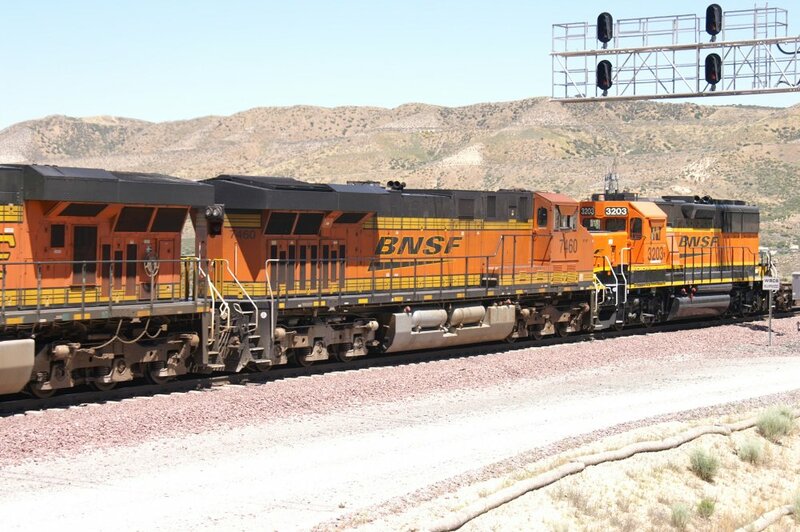 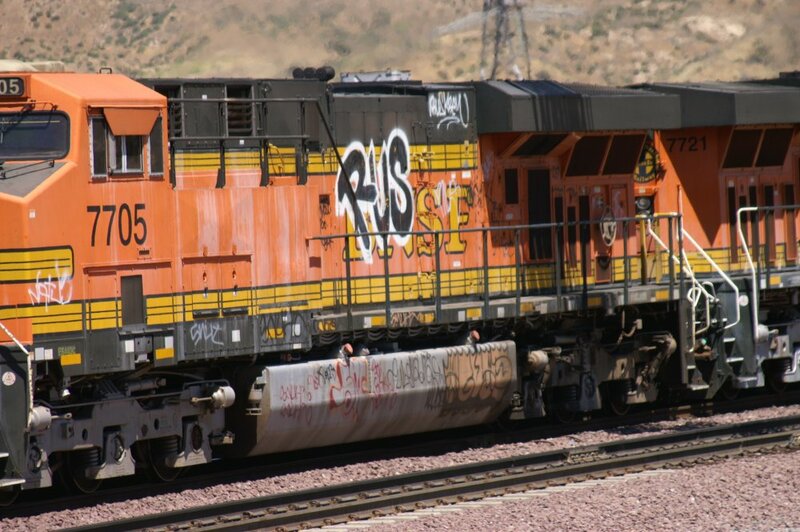 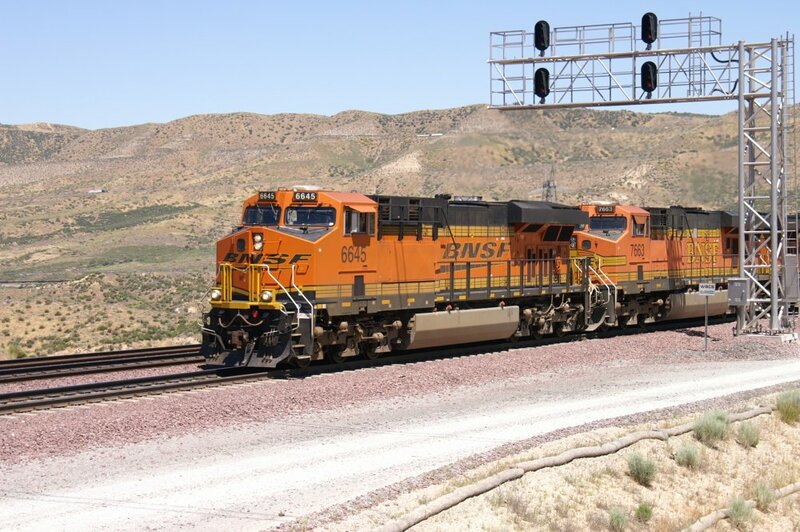 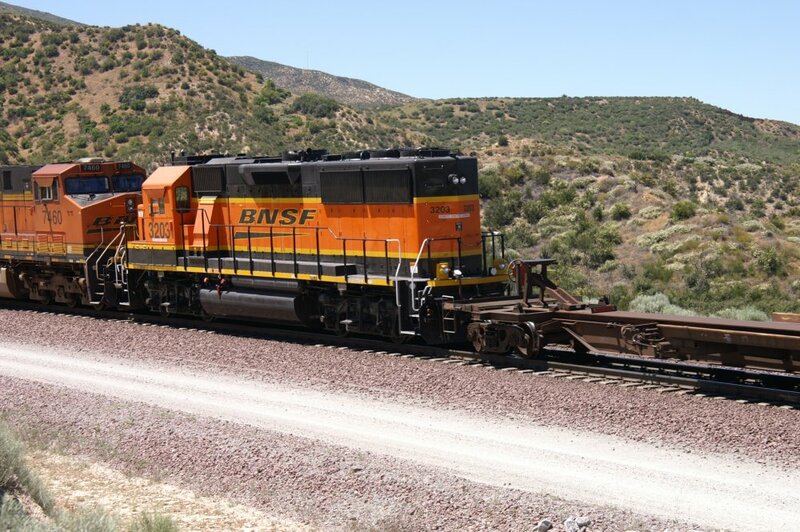 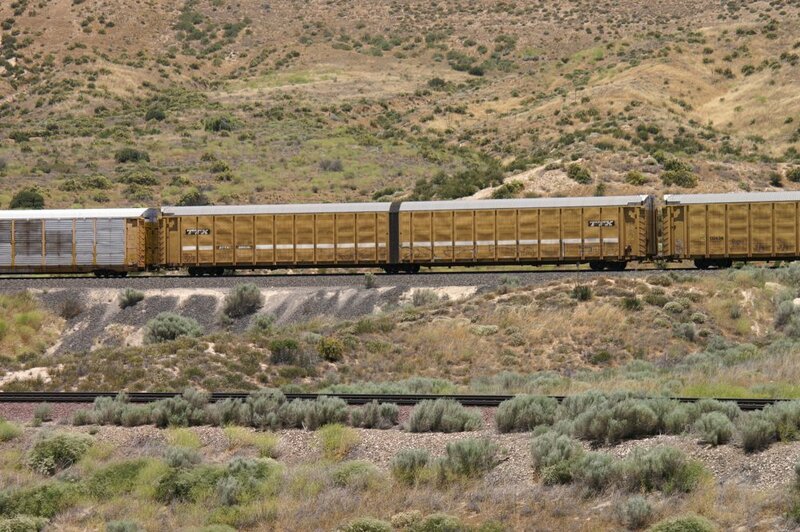 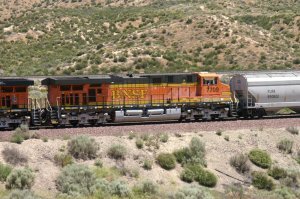 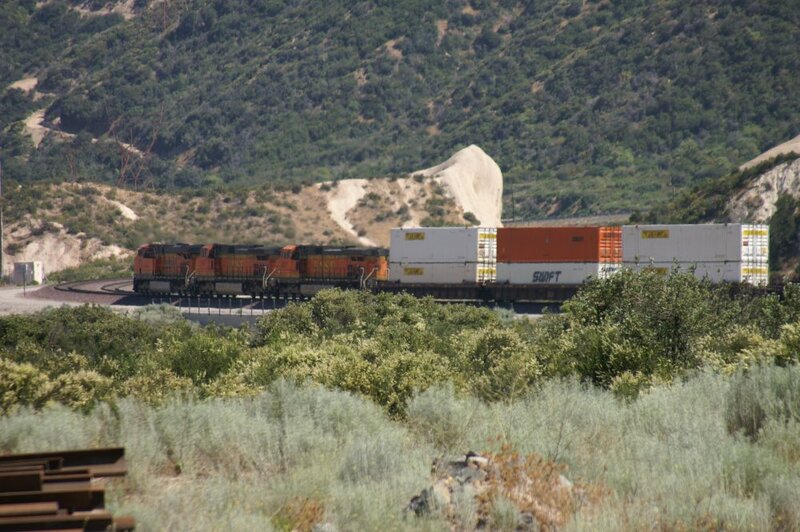 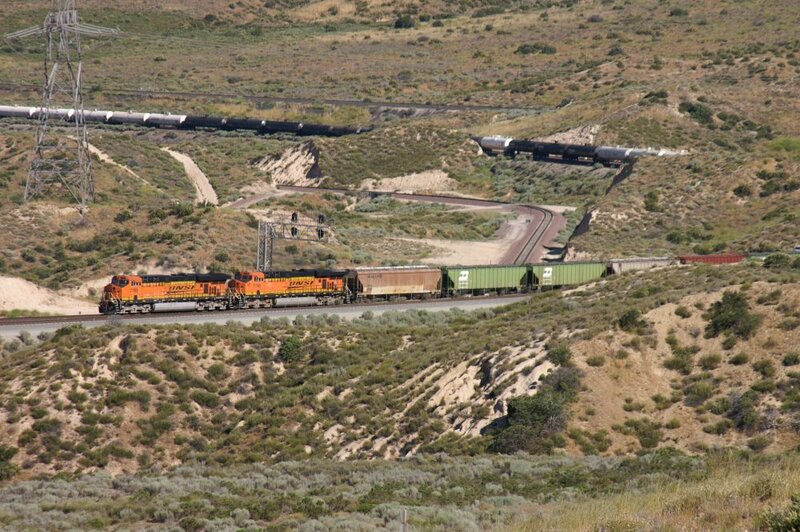 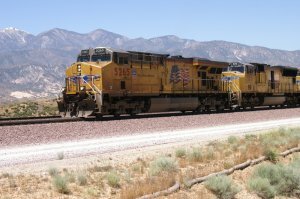 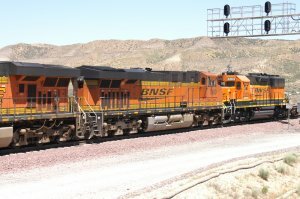 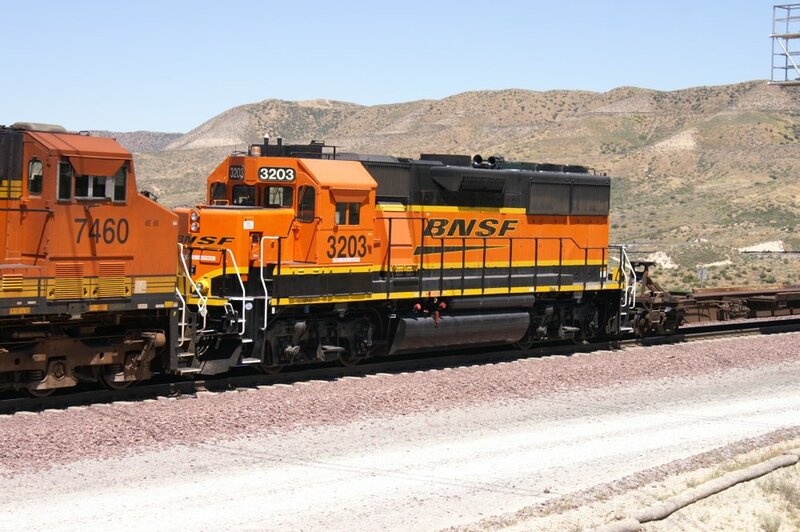 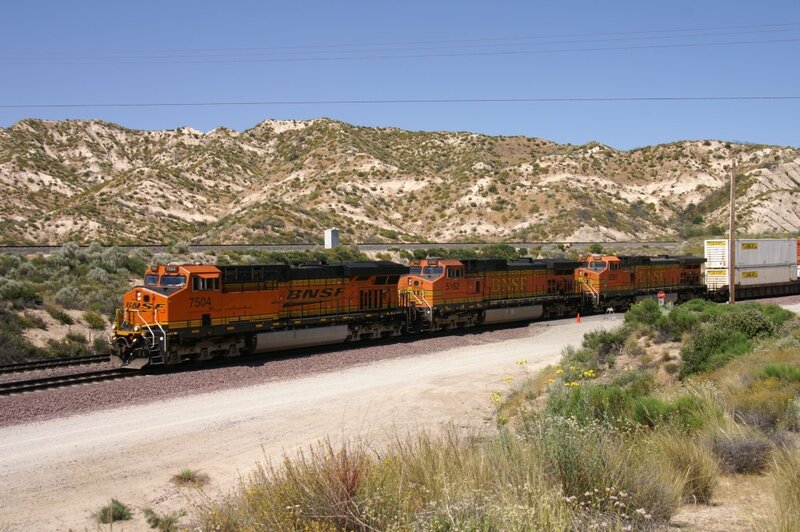 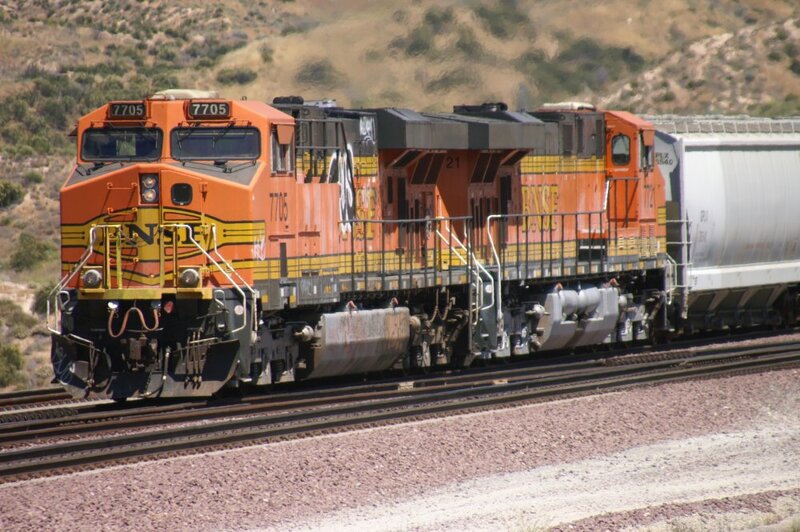 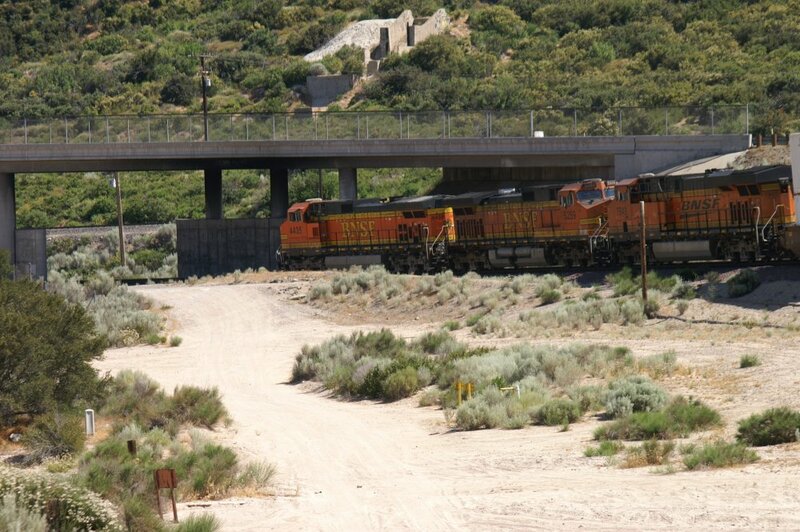 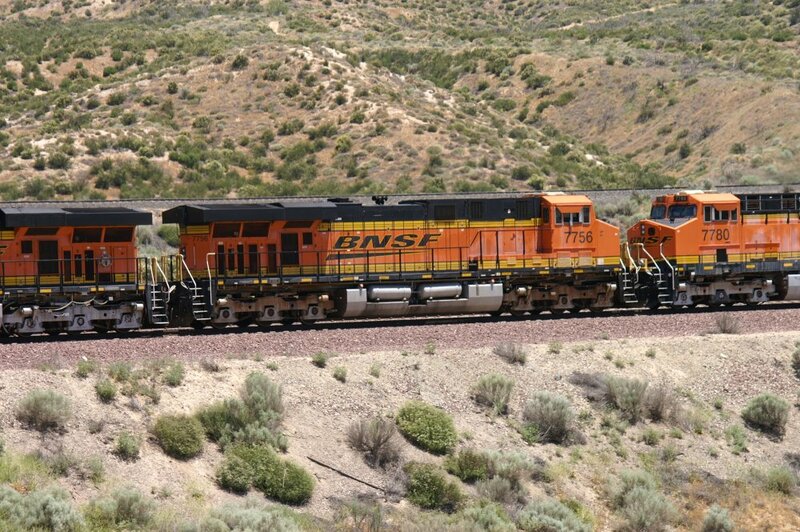 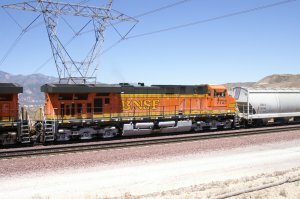 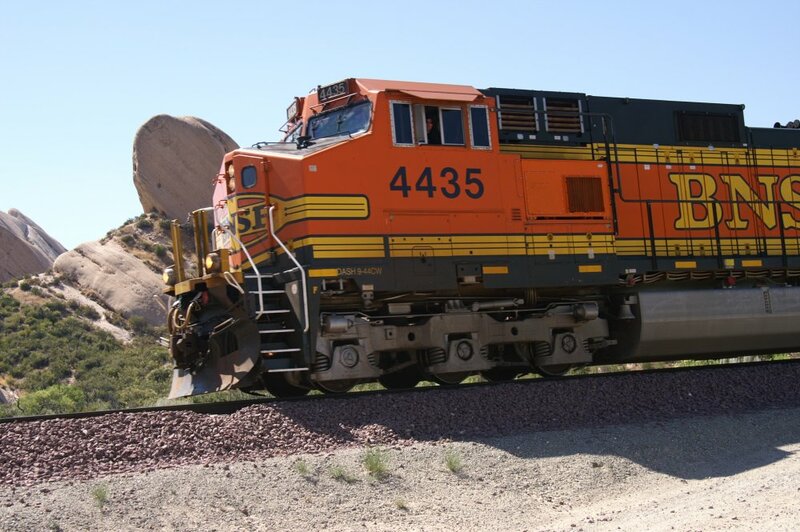 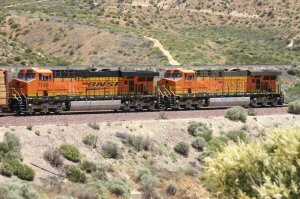 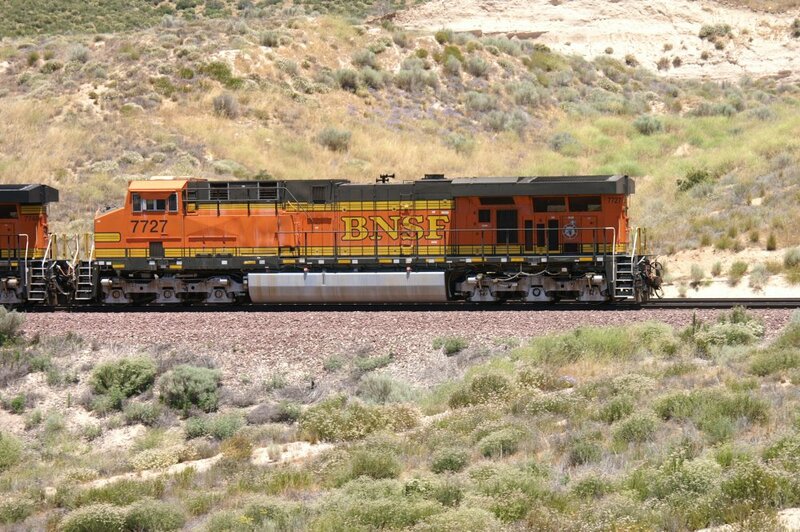 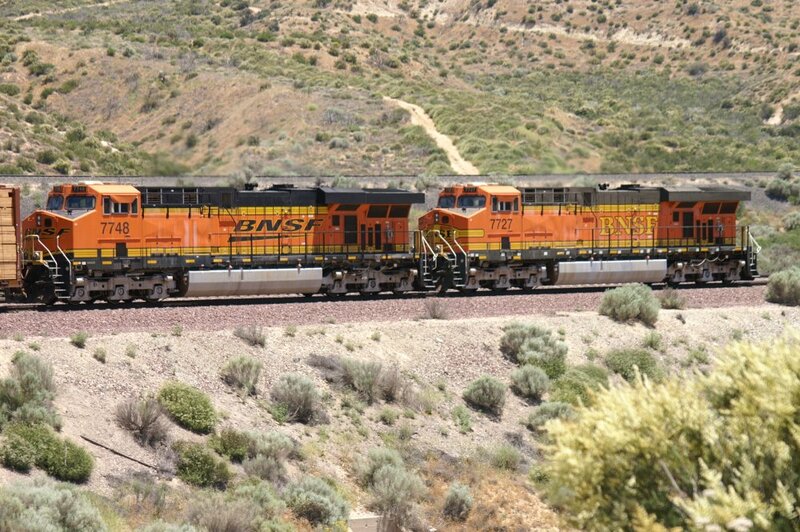 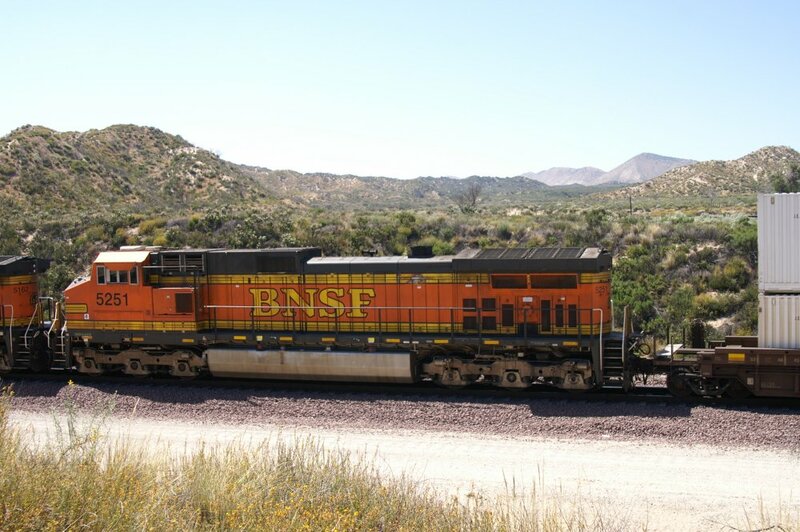 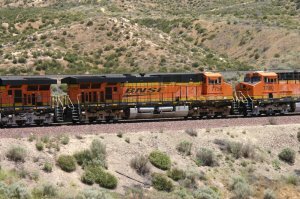 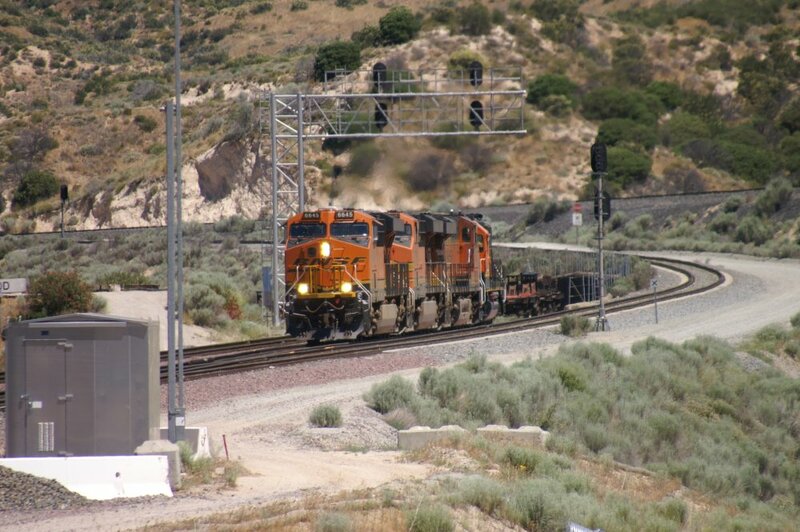 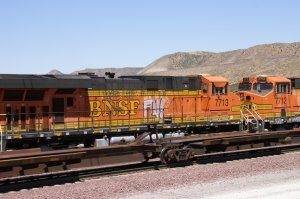 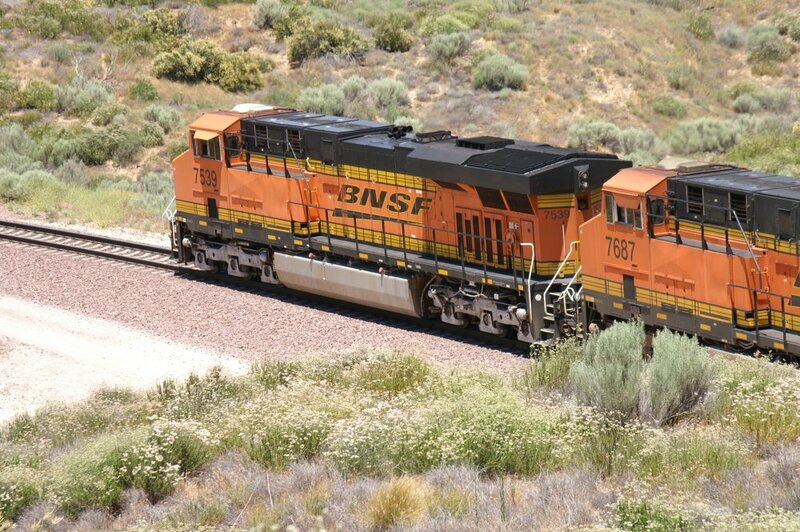 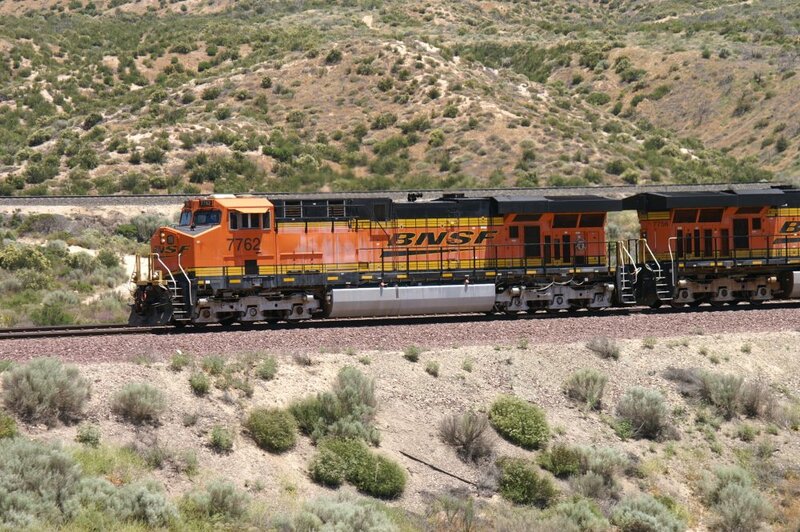 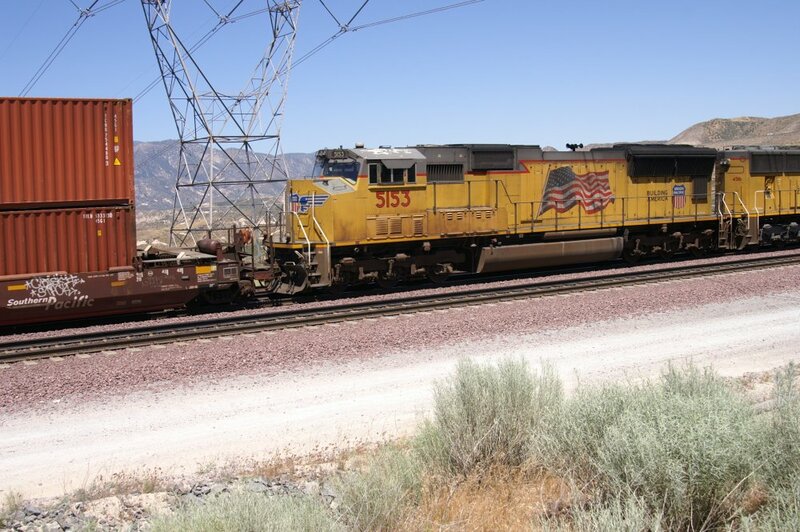 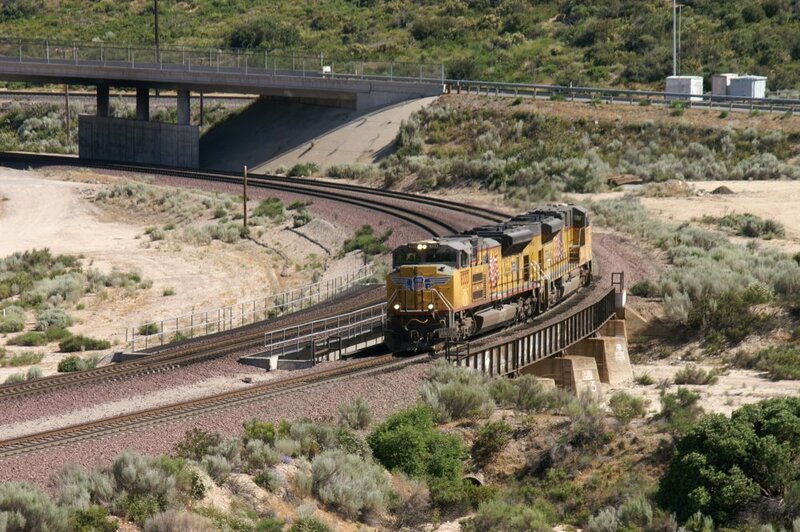 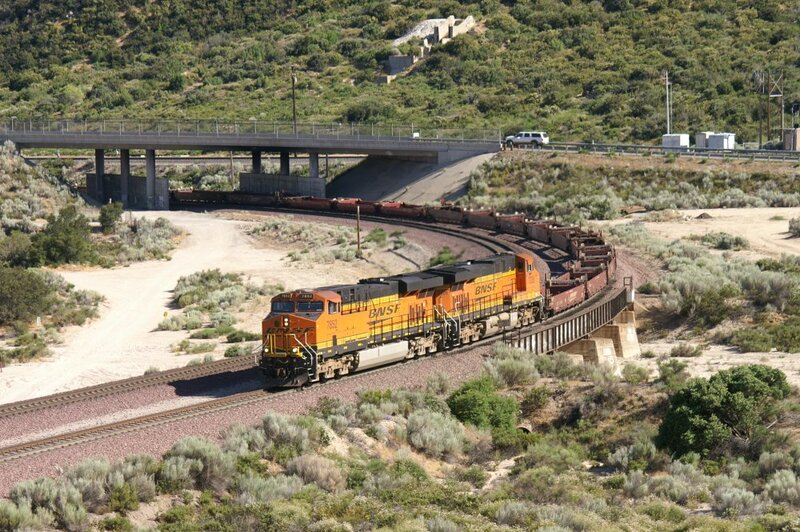 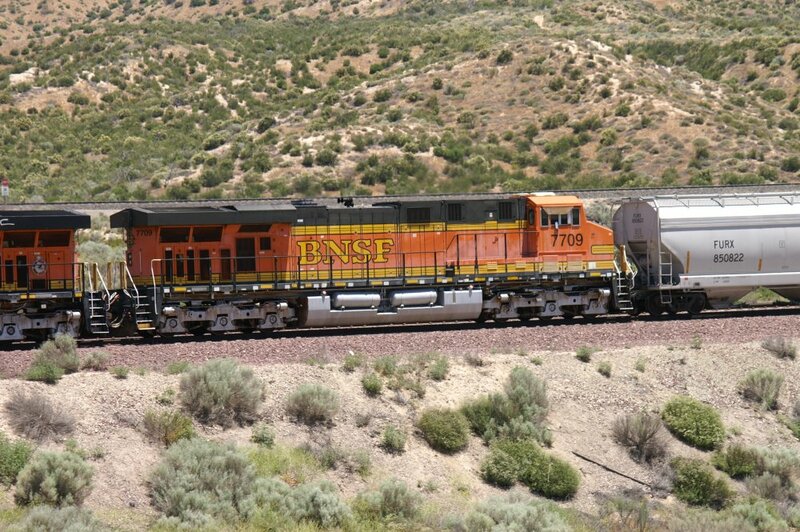 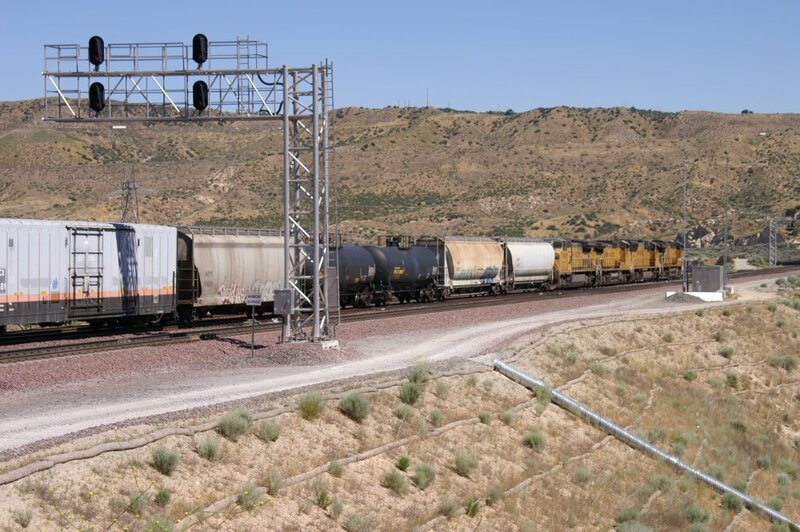 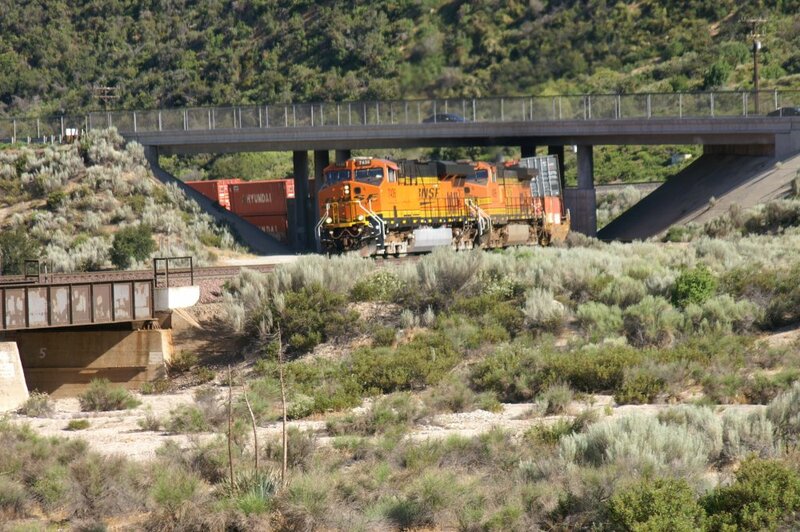 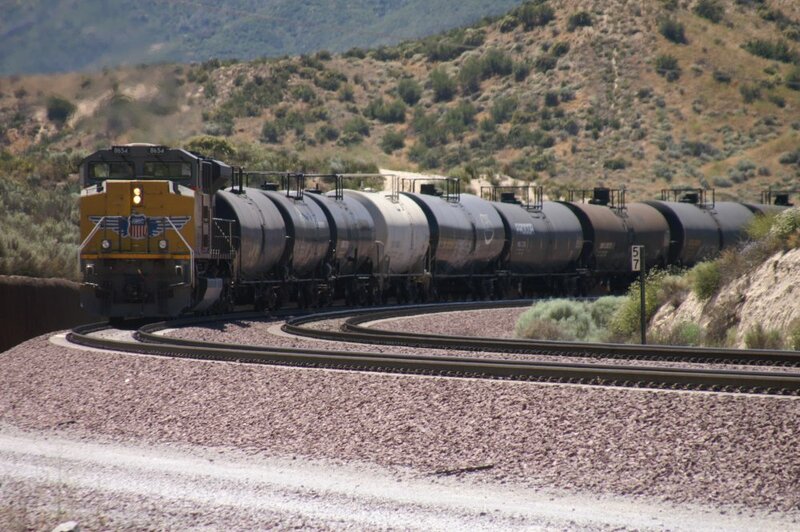 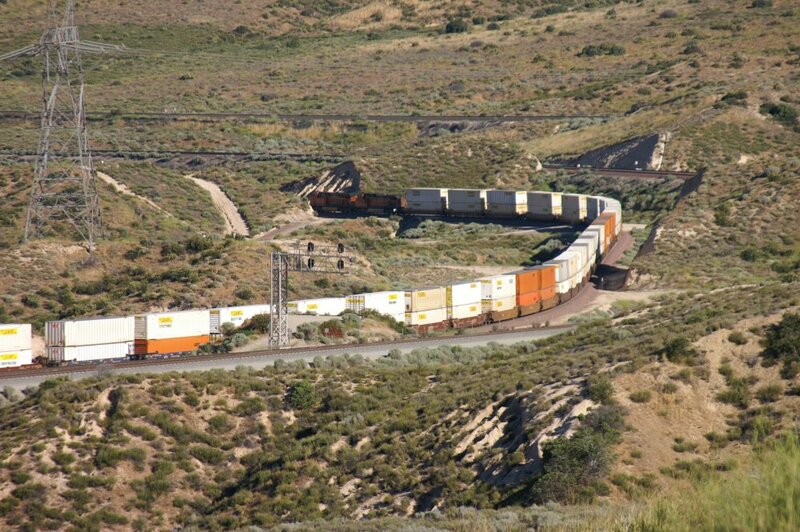 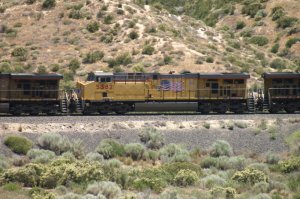 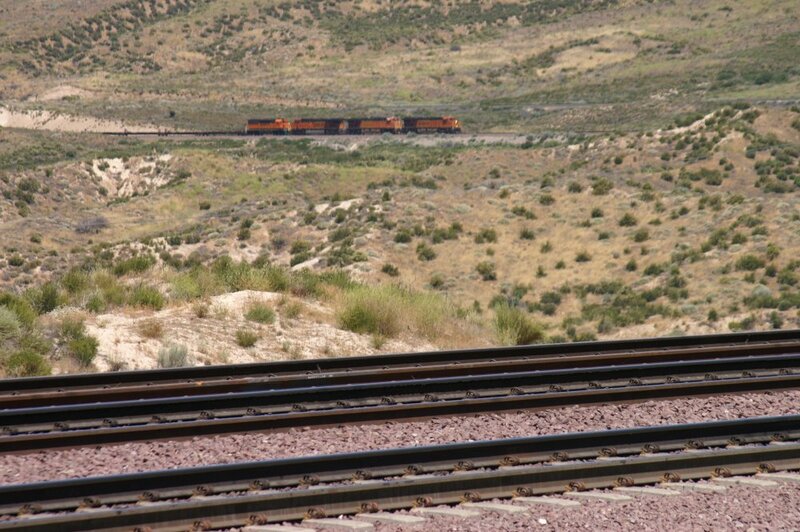 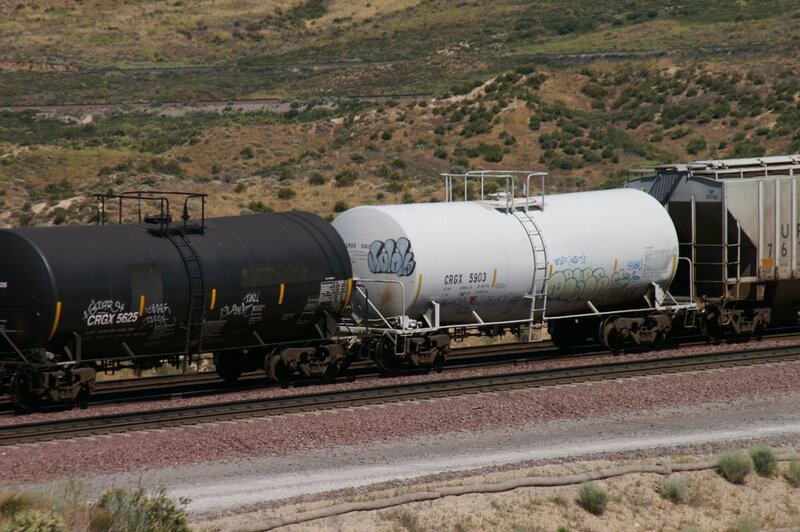 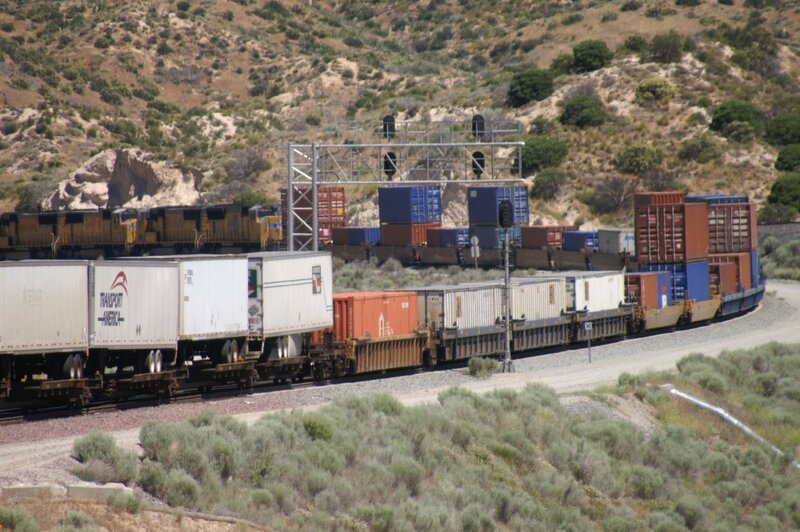 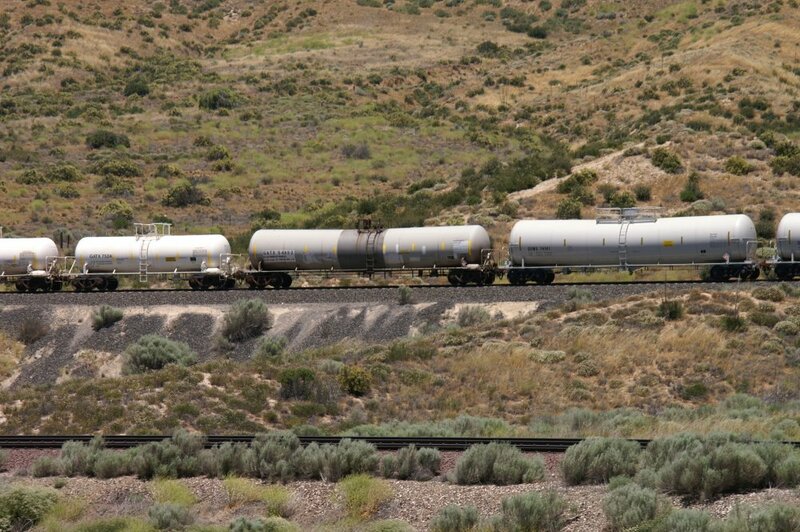 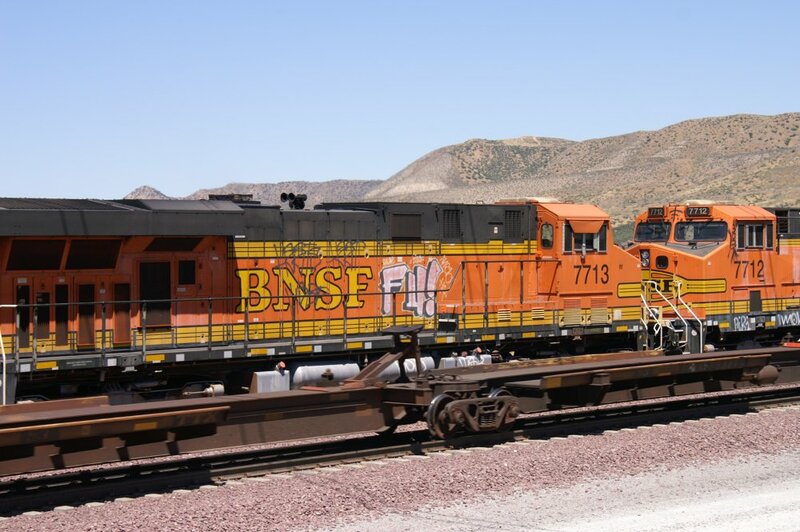 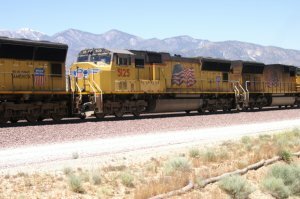 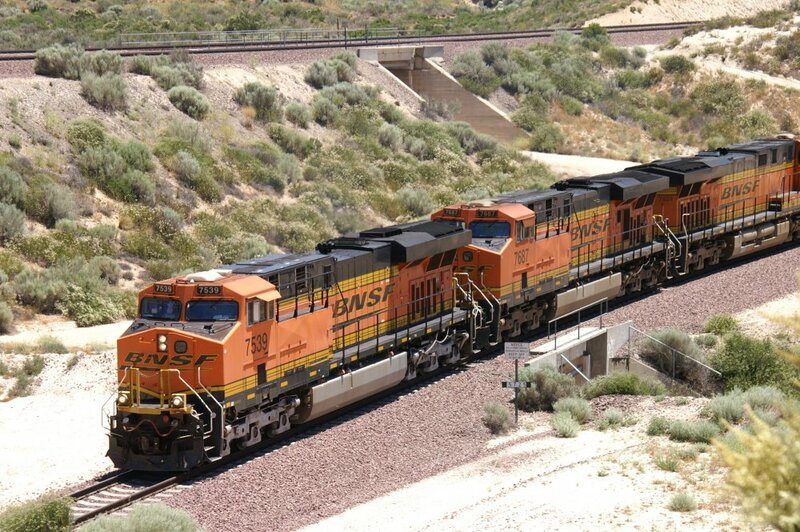 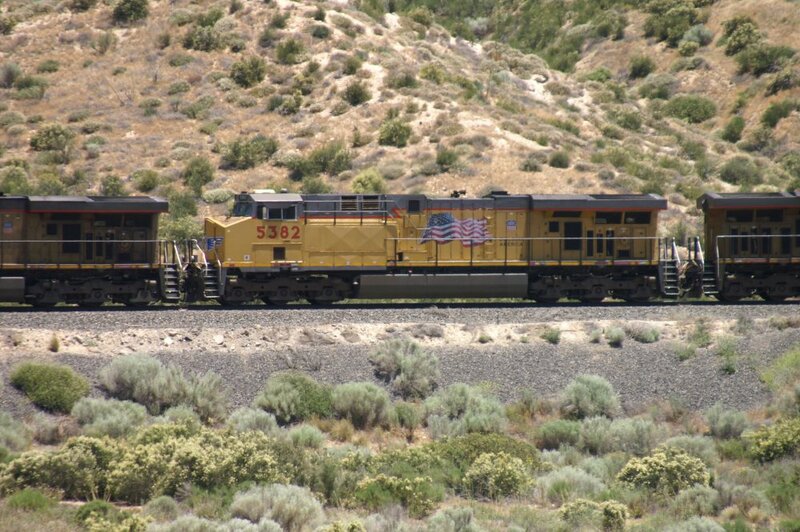 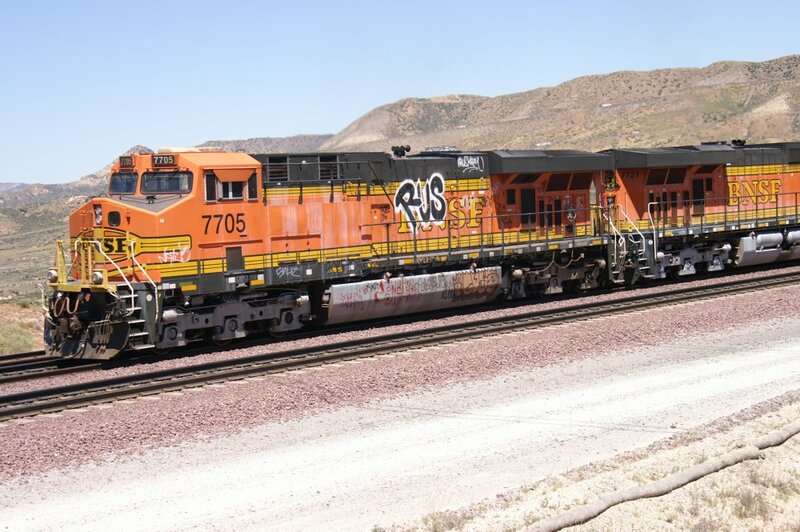 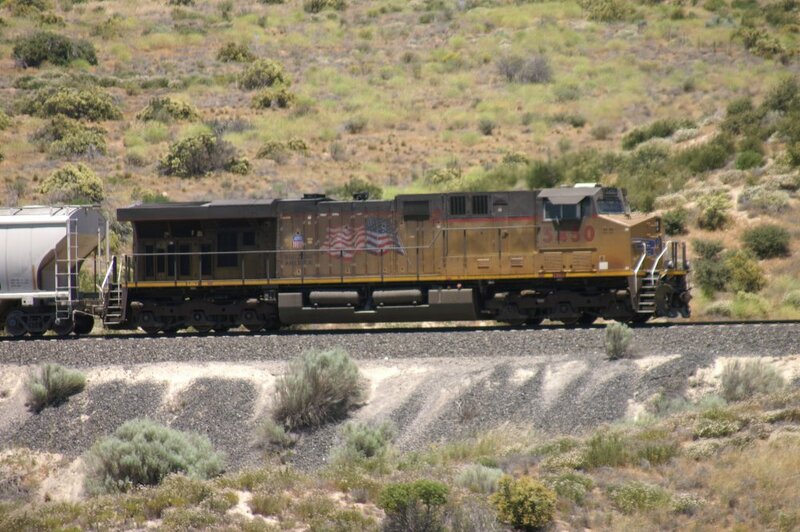 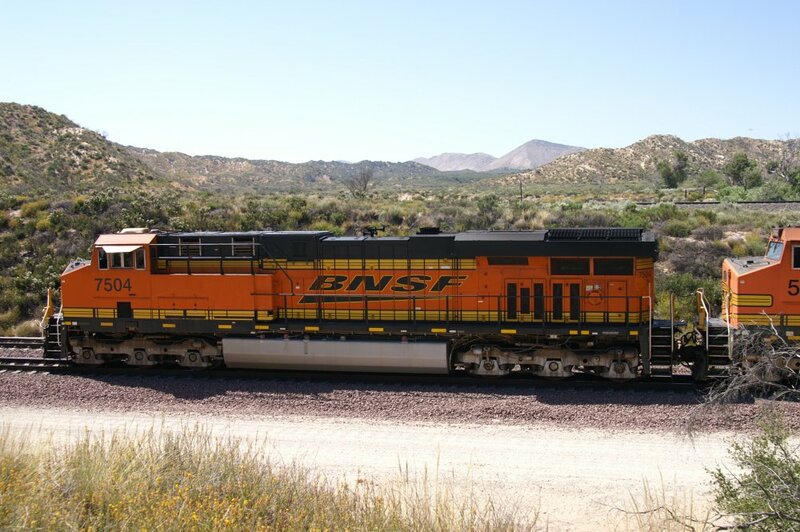 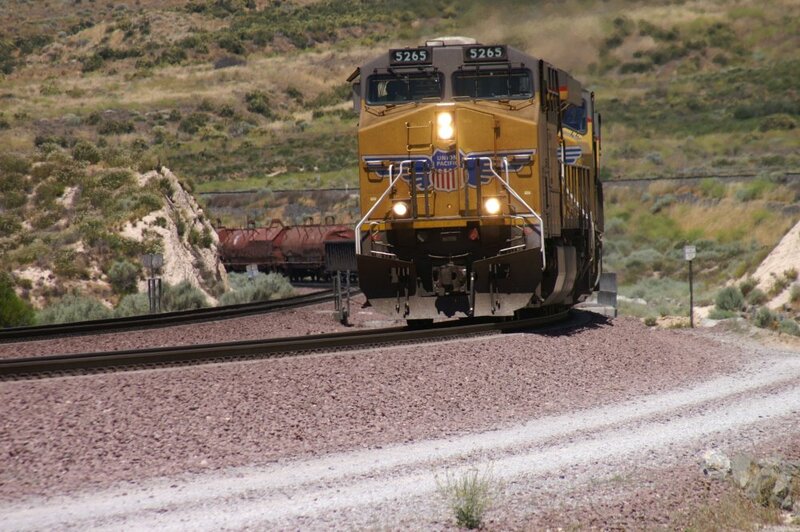 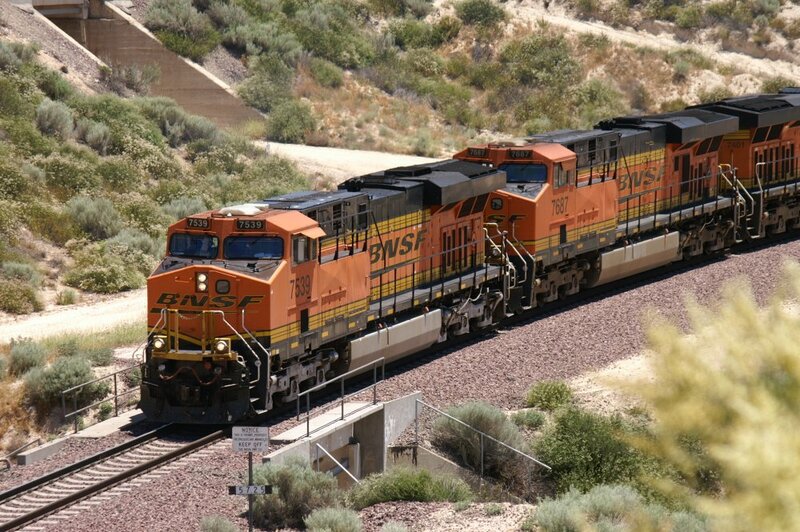 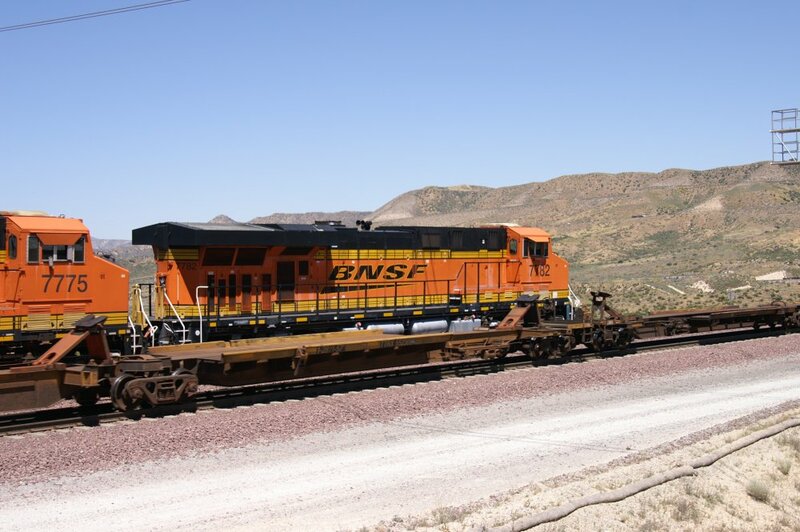 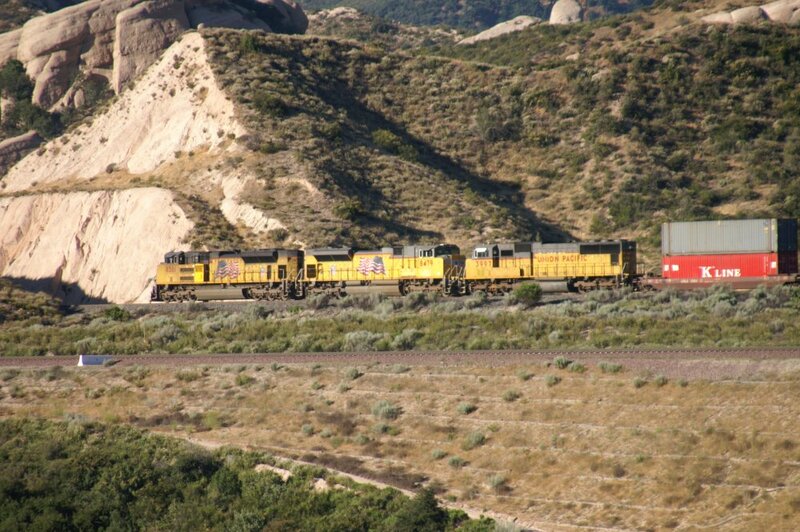 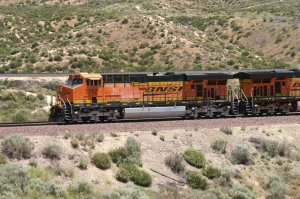 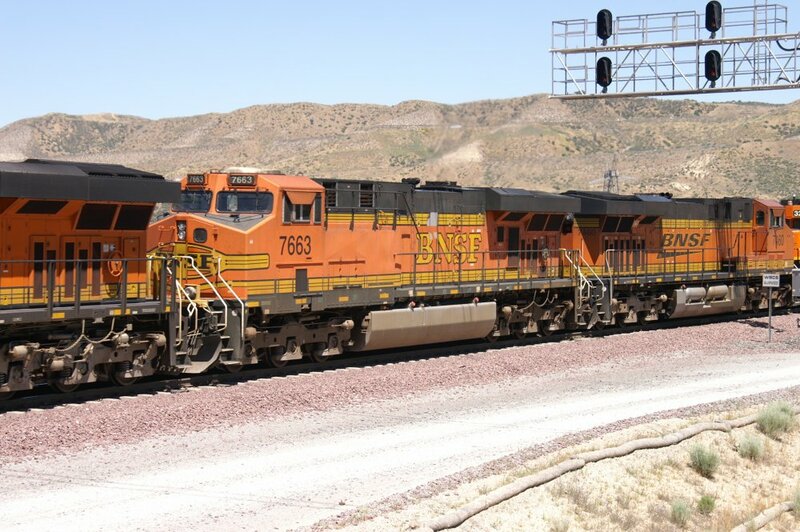 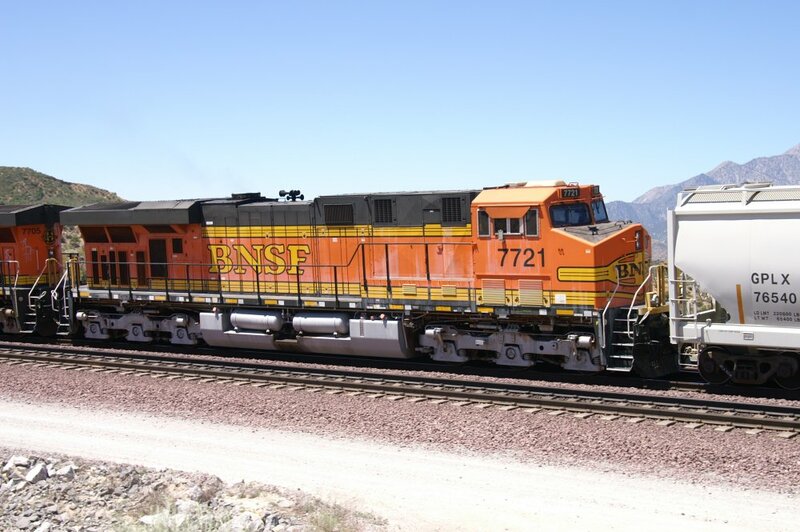 I was driving along BNSF MT-1 until USFS 3N45, made a left turn, under BNSF MT-1/2 and over MT-3. 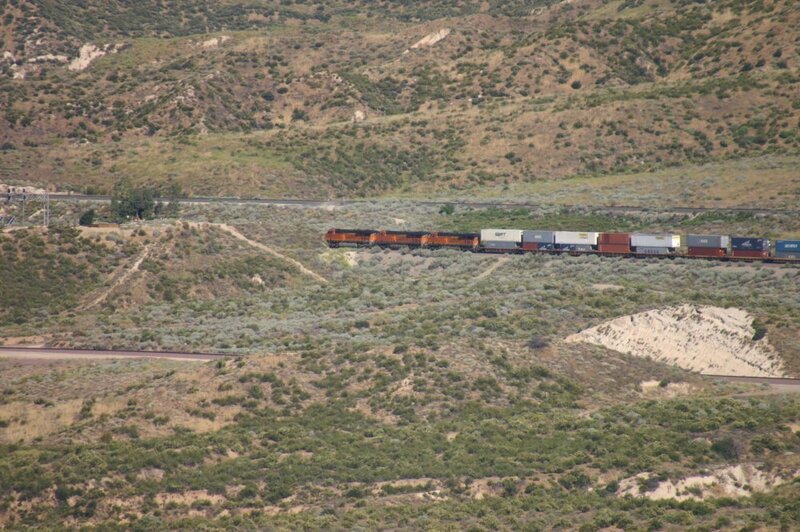 Afterwards a right turn and up above MT-3 to the Silverwood Lookout Platform. 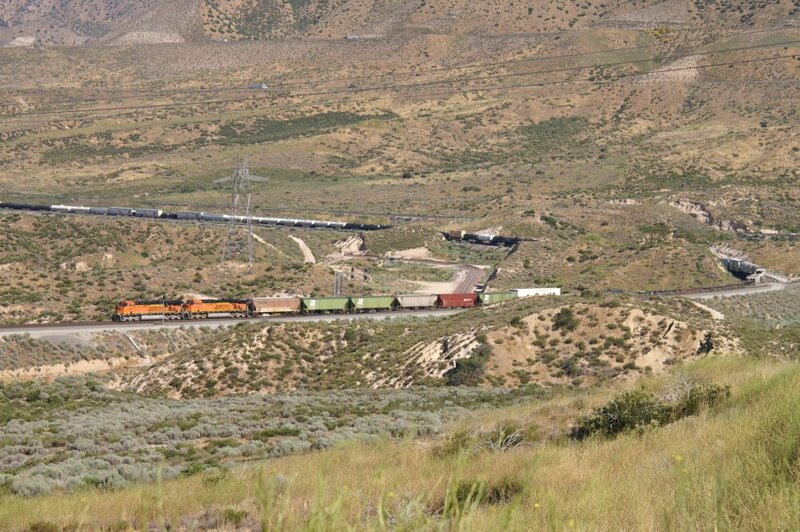 The locos are just below Hill 582. 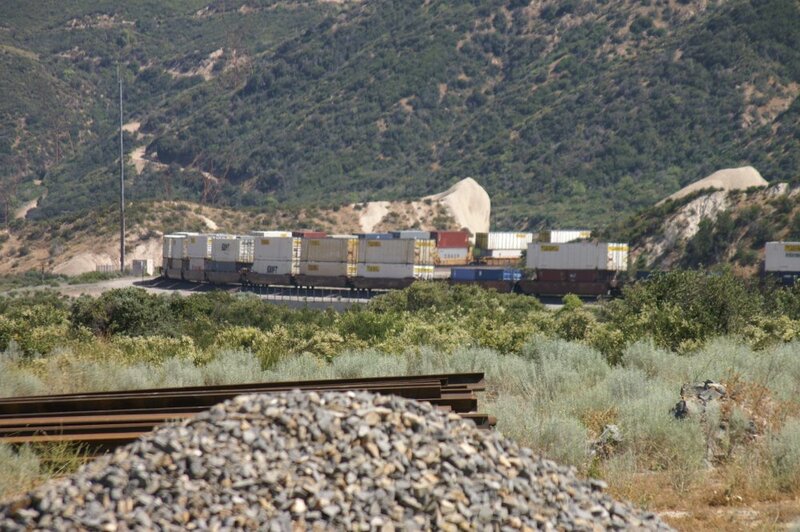 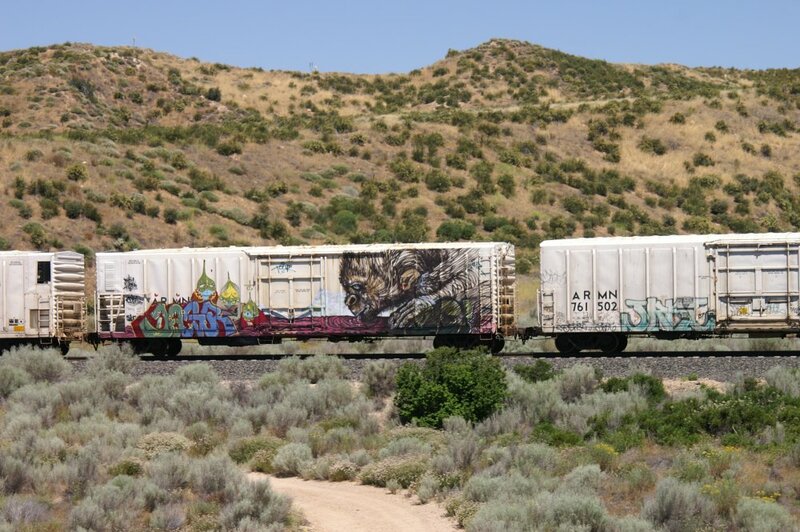 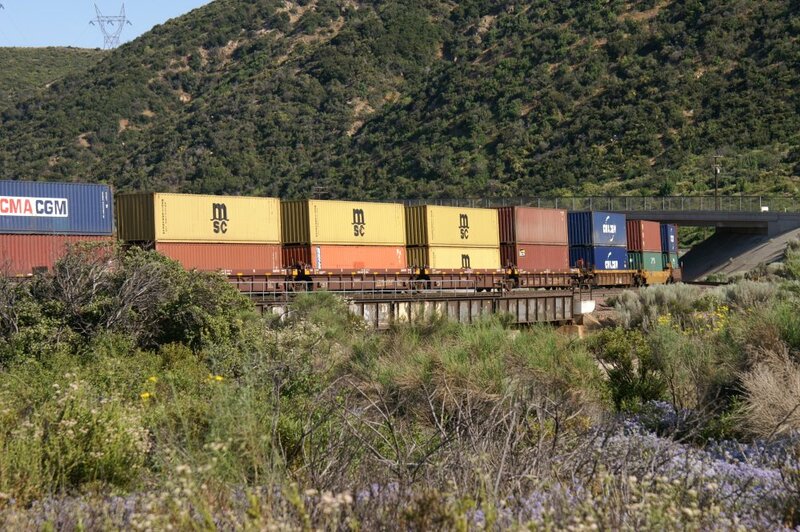 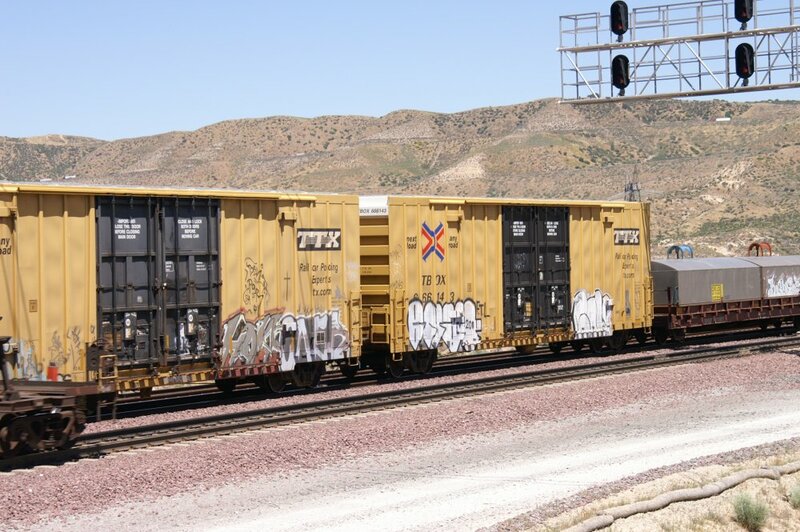 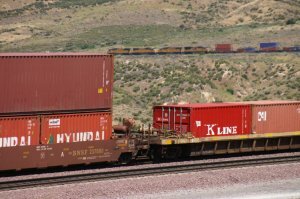 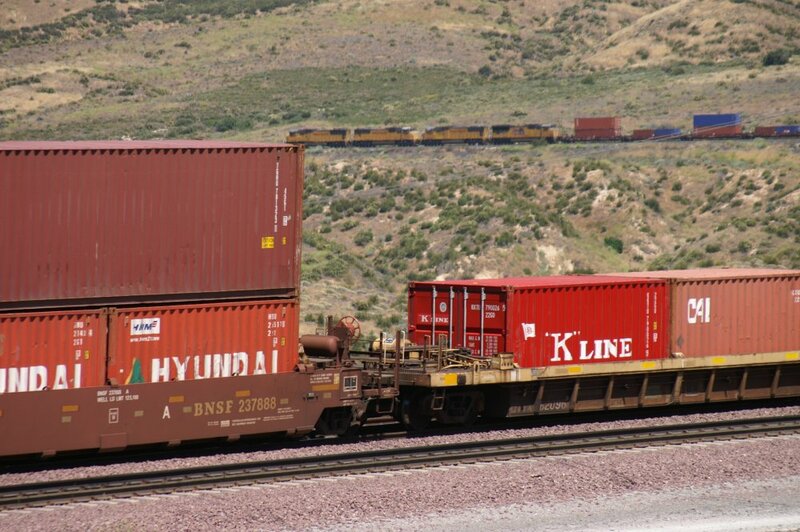 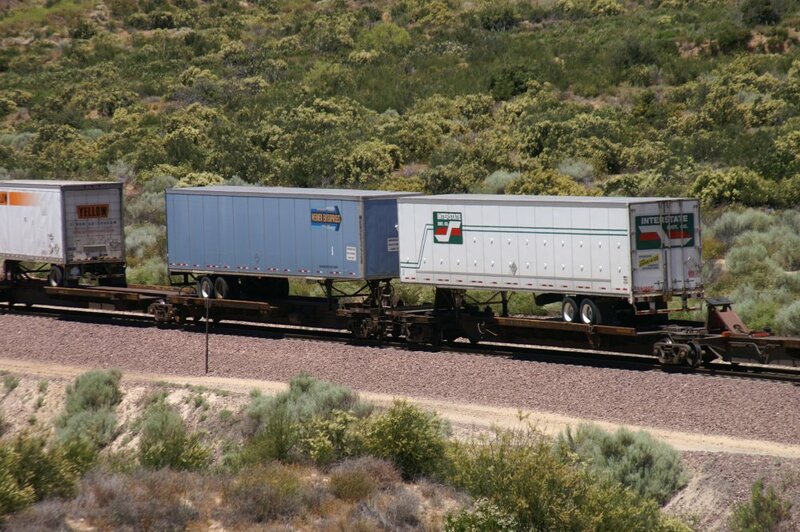 Lucky, behind the Container Cars we have Trailer on Flat Cars. 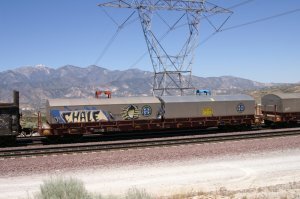 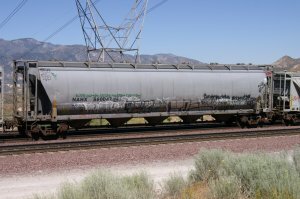 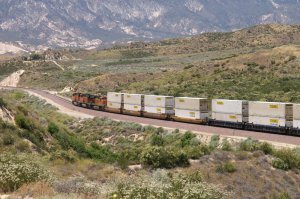 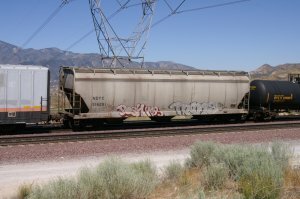 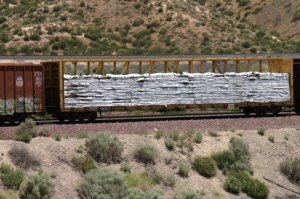 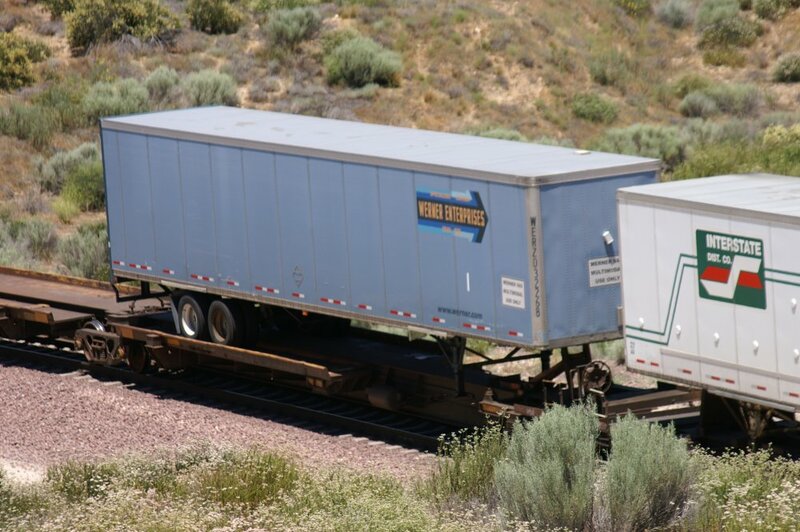 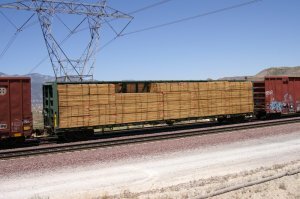 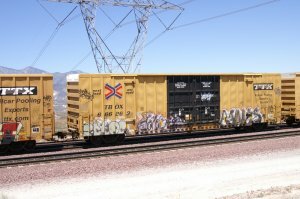 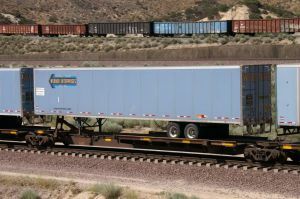 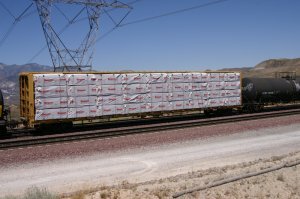 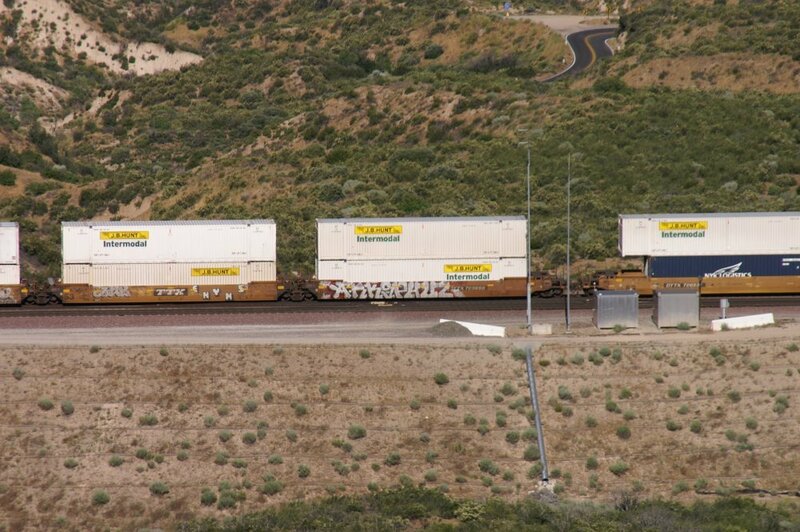 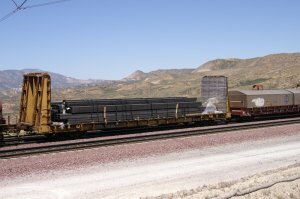 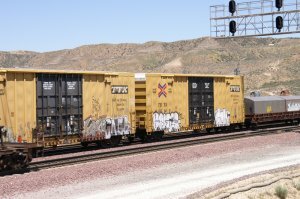 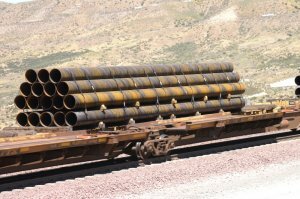 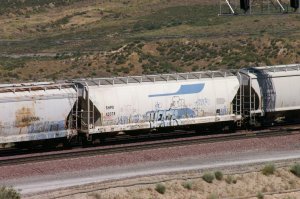 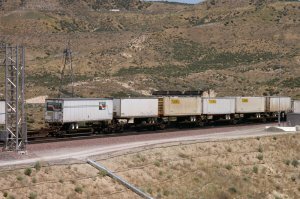 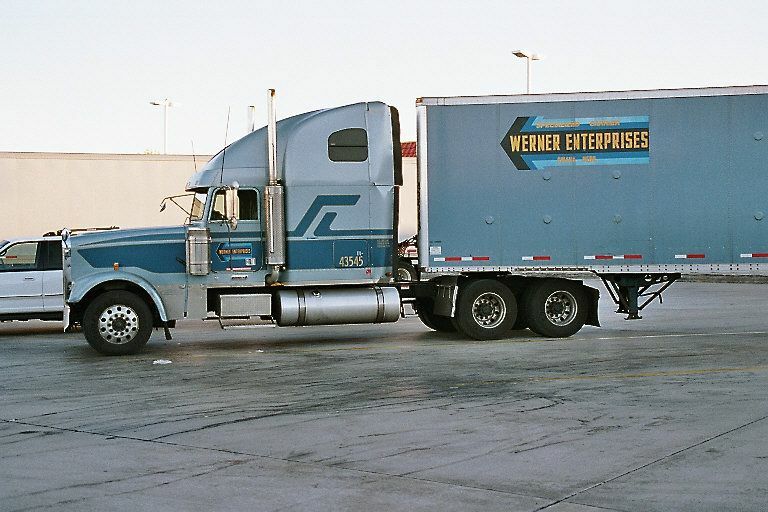 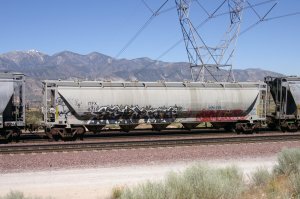 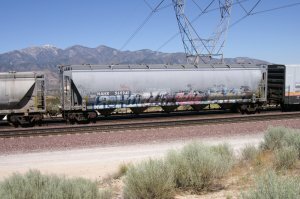 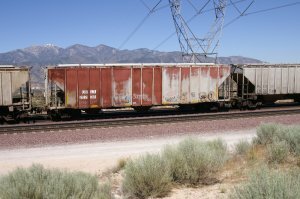 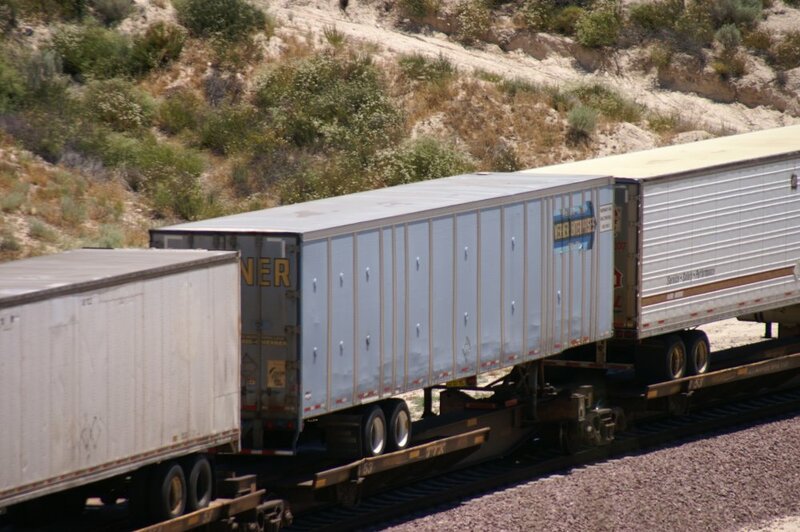 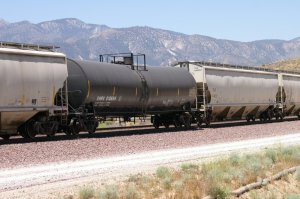 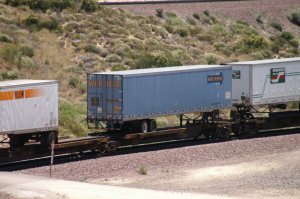 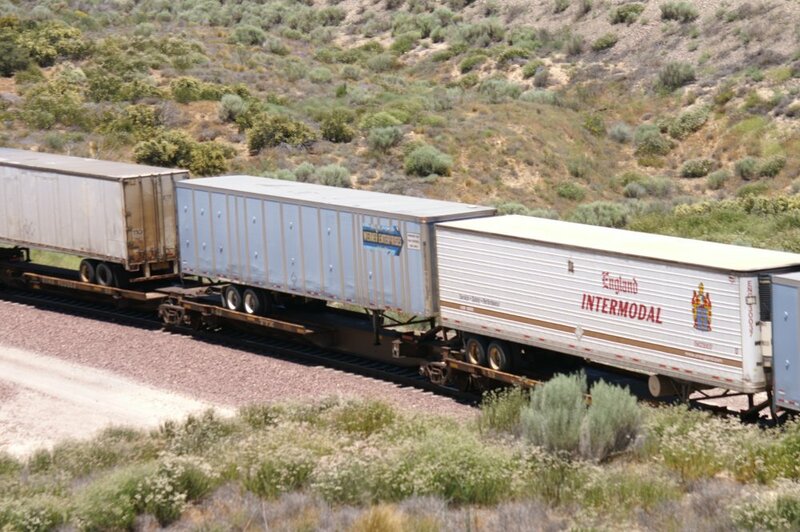 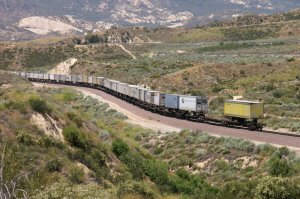 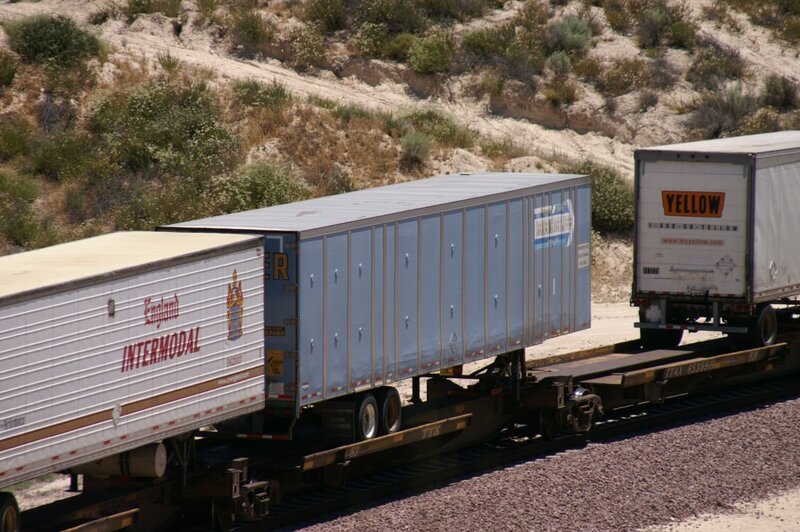 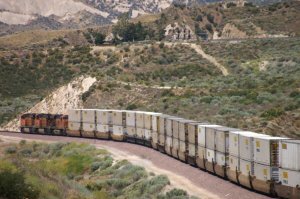 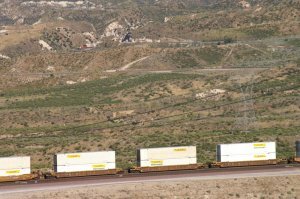 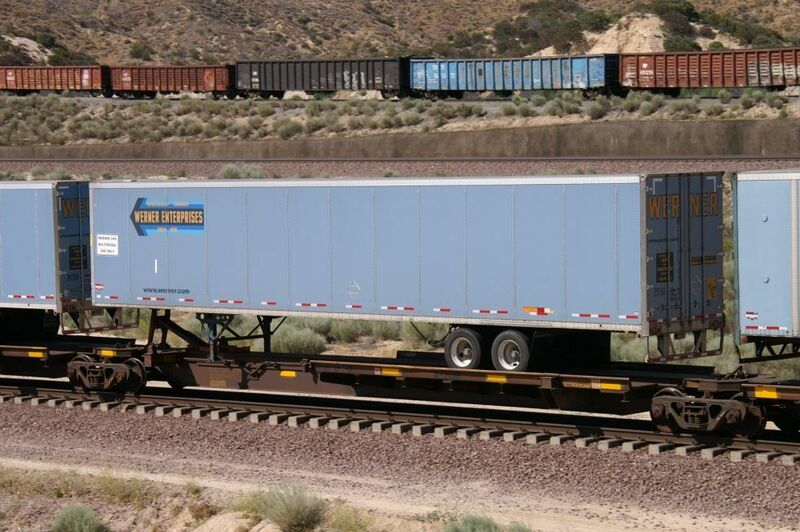 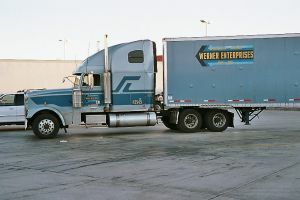 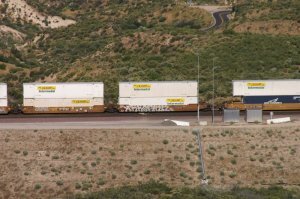 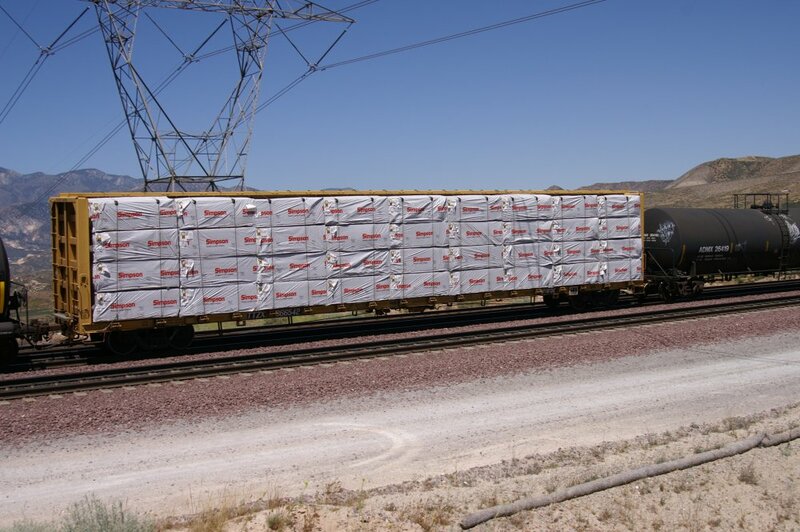 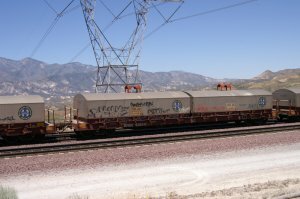 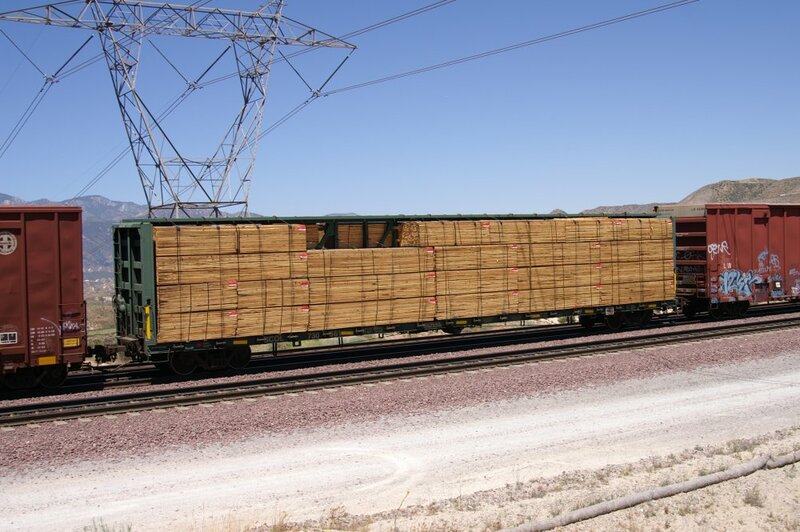 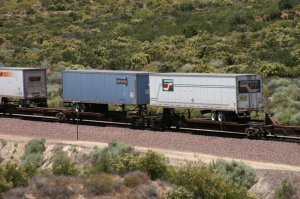 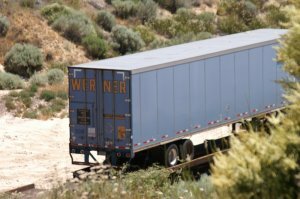 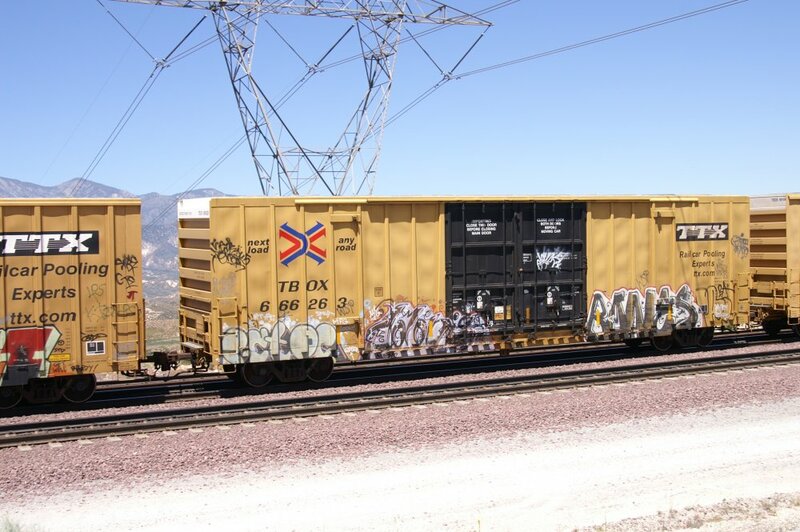 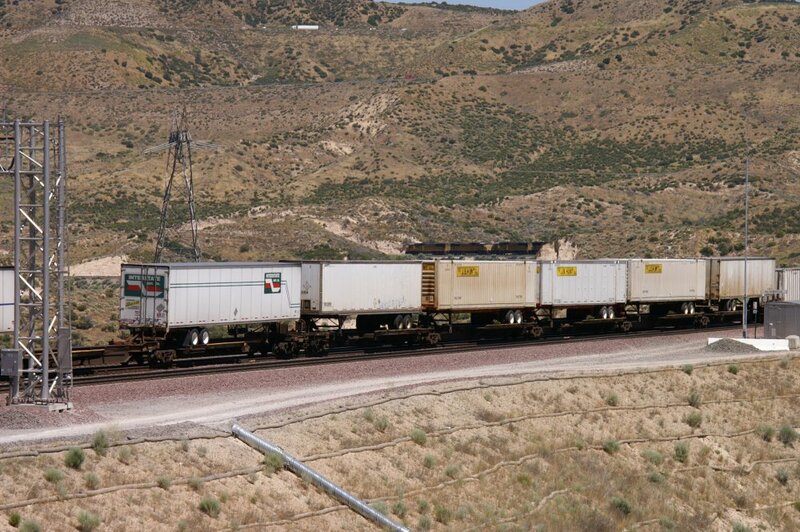 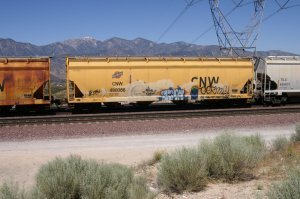 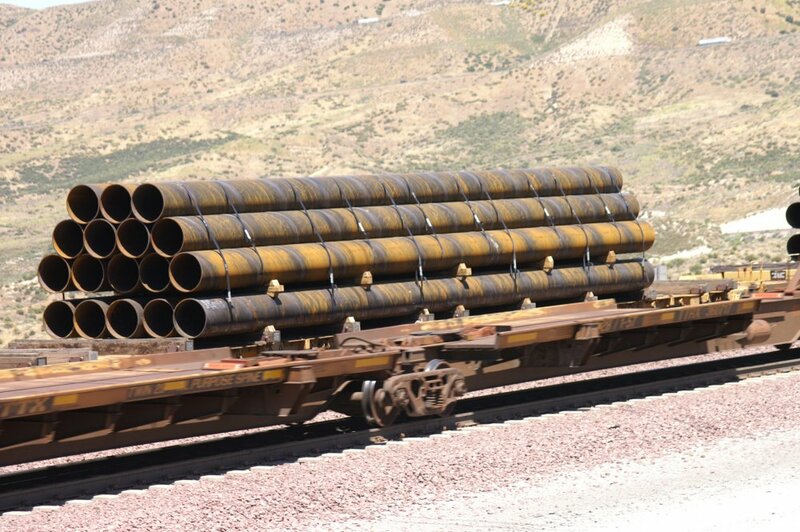 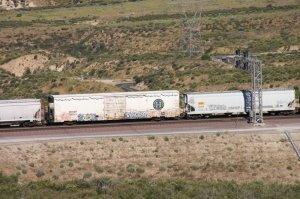 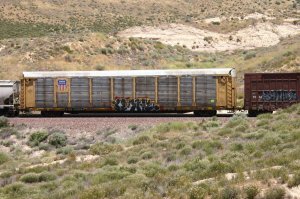 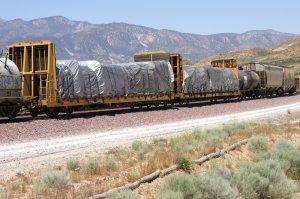 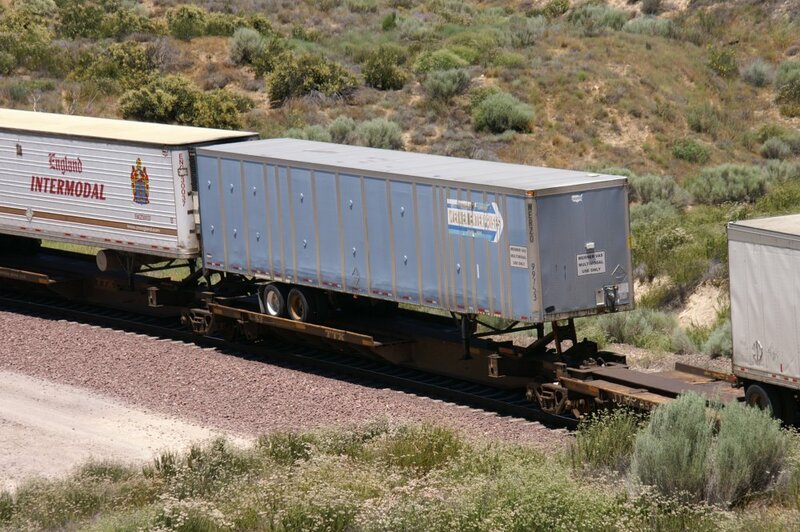 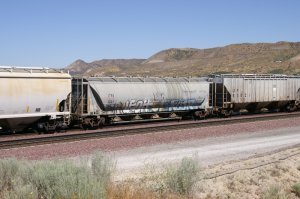 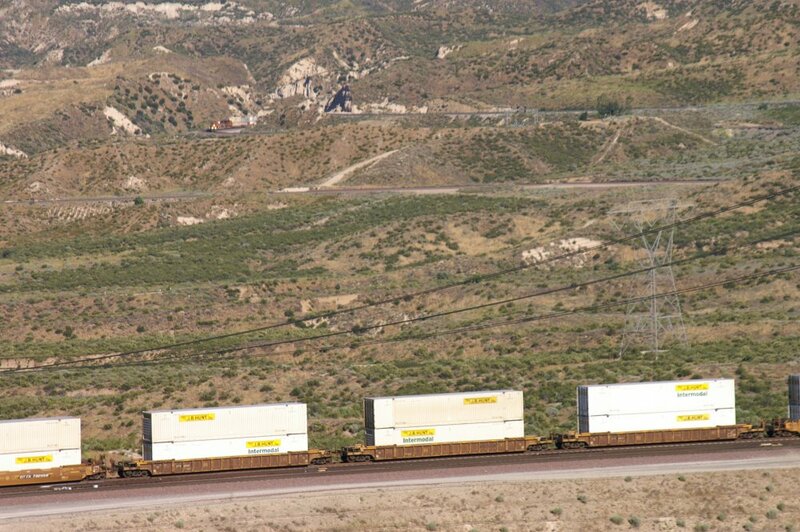 On the photos below are several Werner Enterprises Trailers on Flat Cars. Sorry about the different views but my camera cannot stop taking pictures if there are Werner Trailers !! 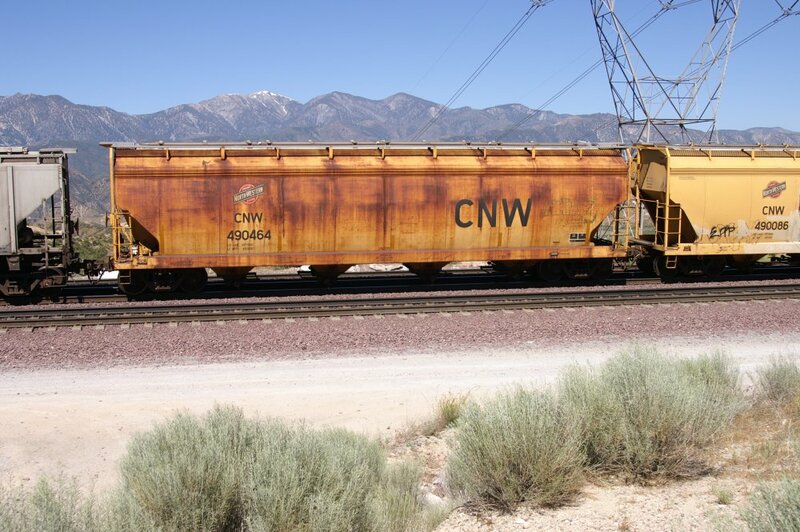 CP Walker is also having a crossover between BNSF MT-1 and MT-2 near the signal bridge. At this location, I met a gentleman from the US Forrest Service. 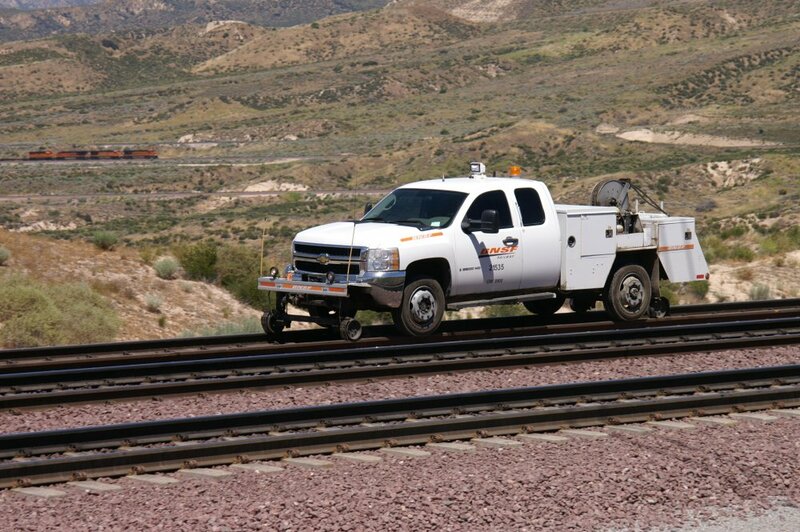 He said, no problem in taking pictures but do not cross any tracks. 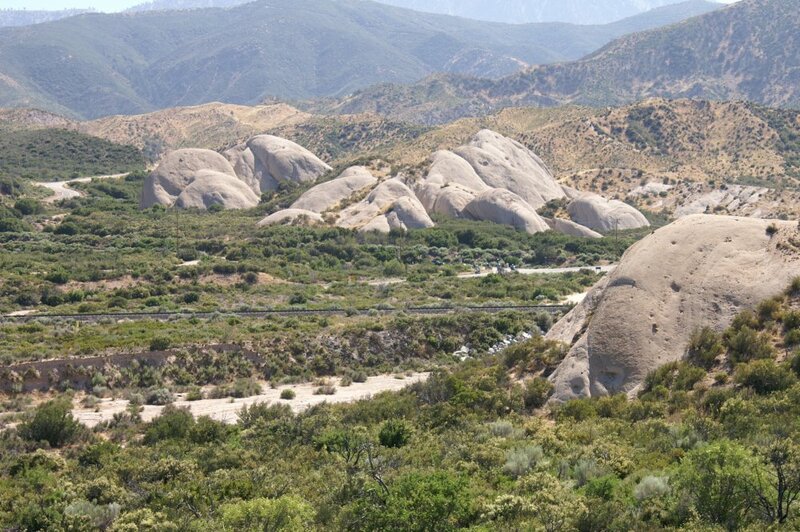 So, I did not have full flexibility in running around and I decided to move to the Mormon Rocks. 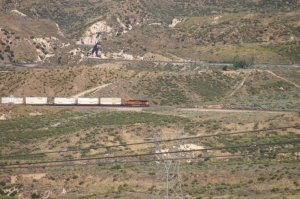 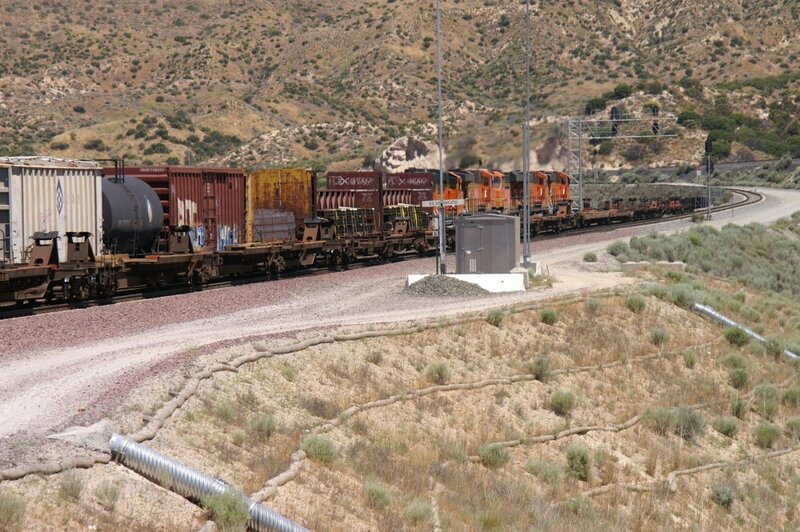 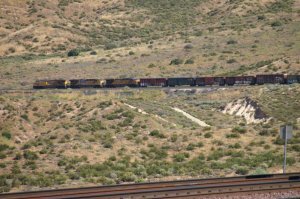 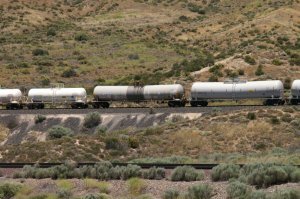 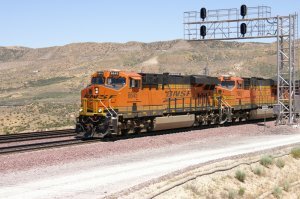 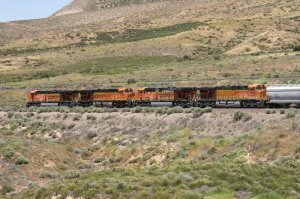 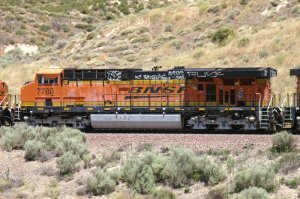 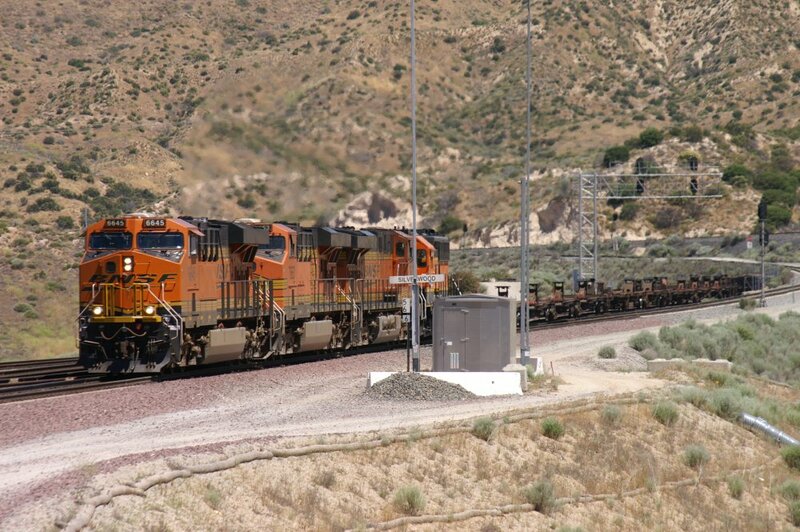 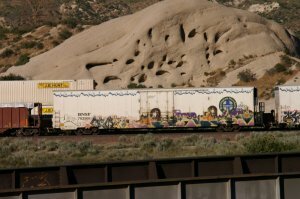 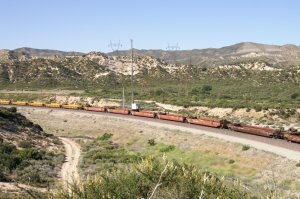 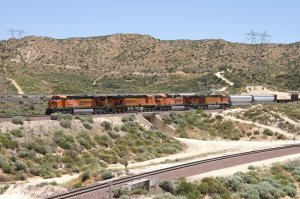 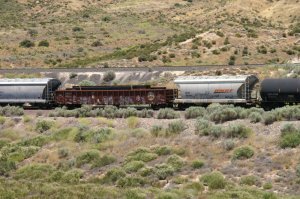 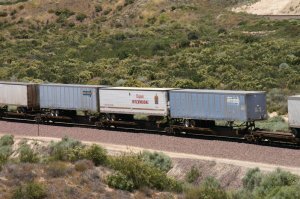 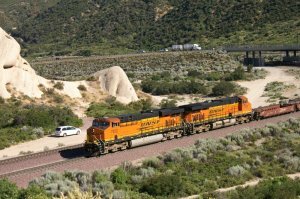 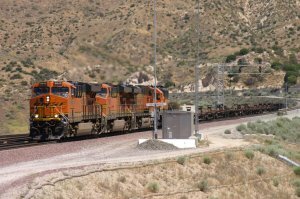 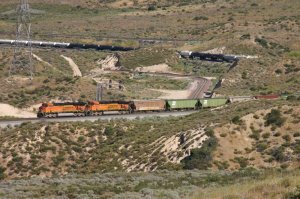 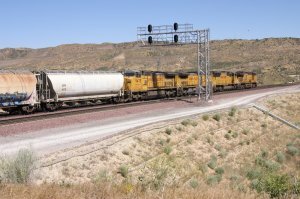 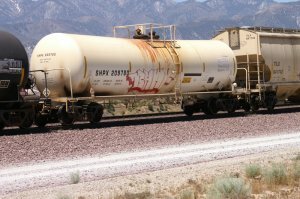 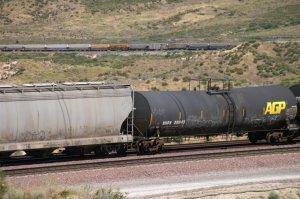 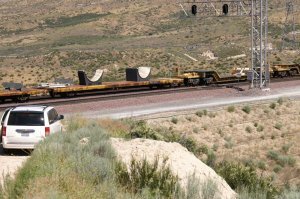 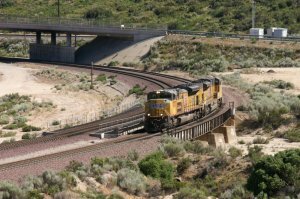 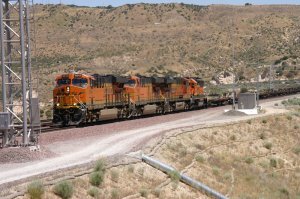 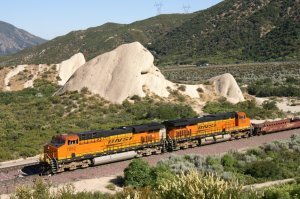 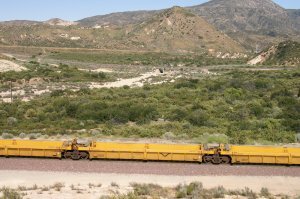 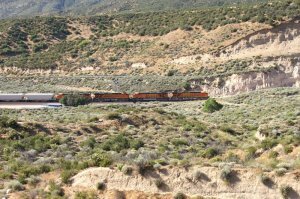 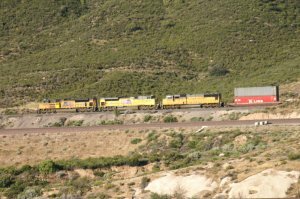 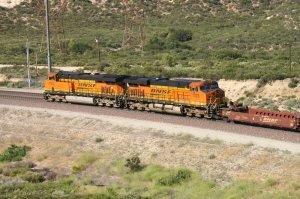 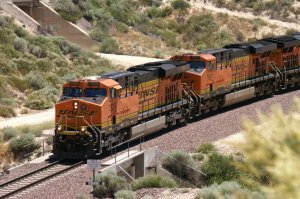 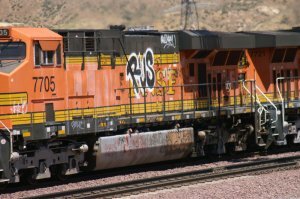 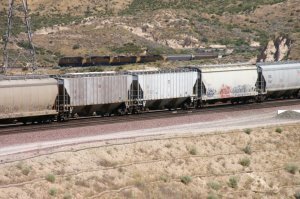 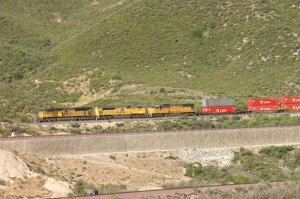 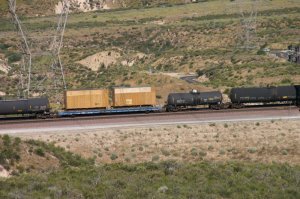 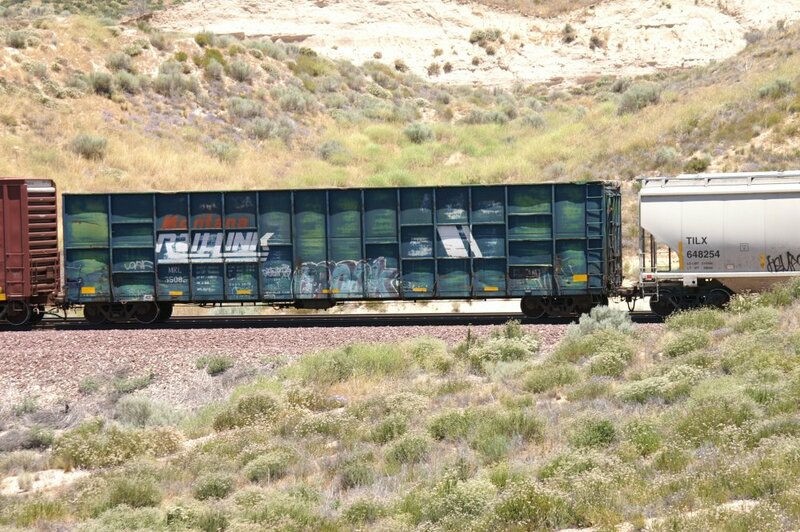 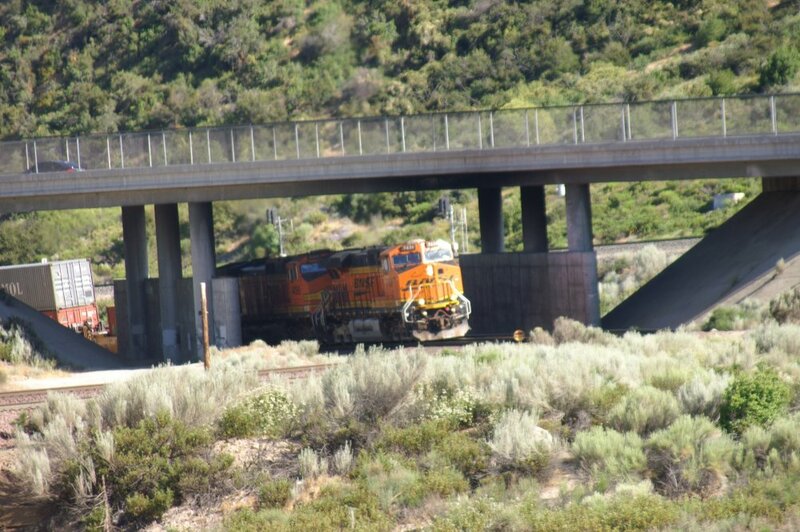 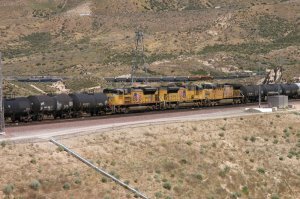 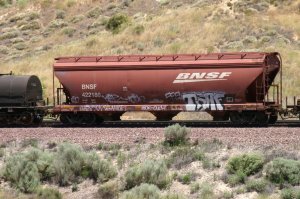 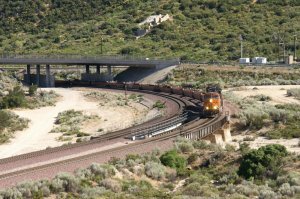 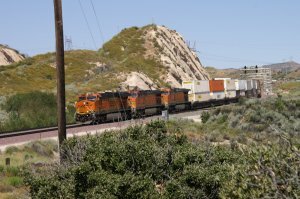 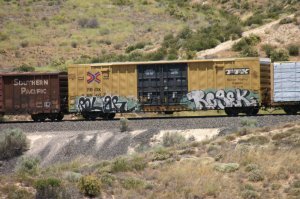 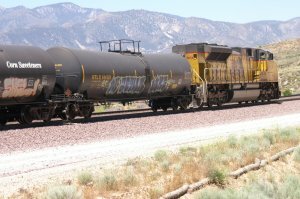 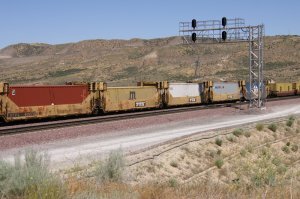 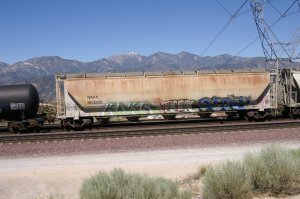 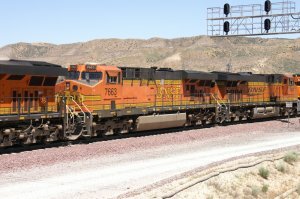 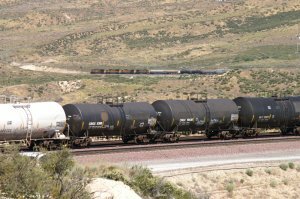 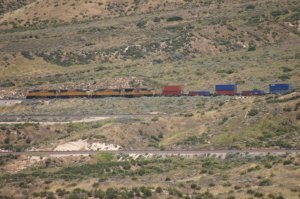 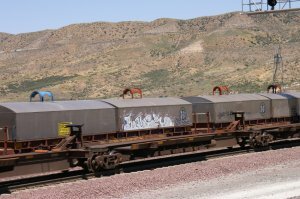 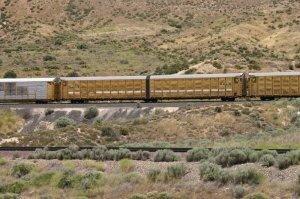 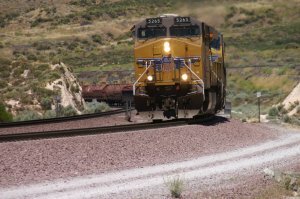 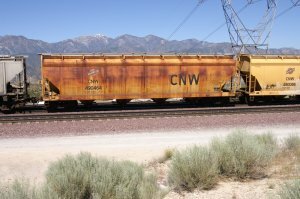 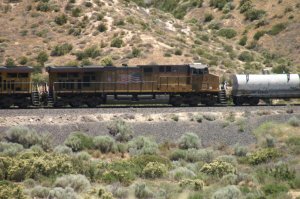 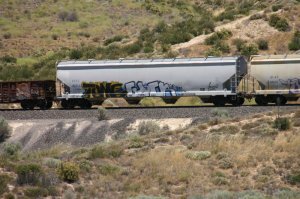 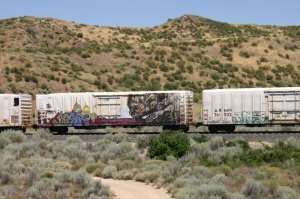 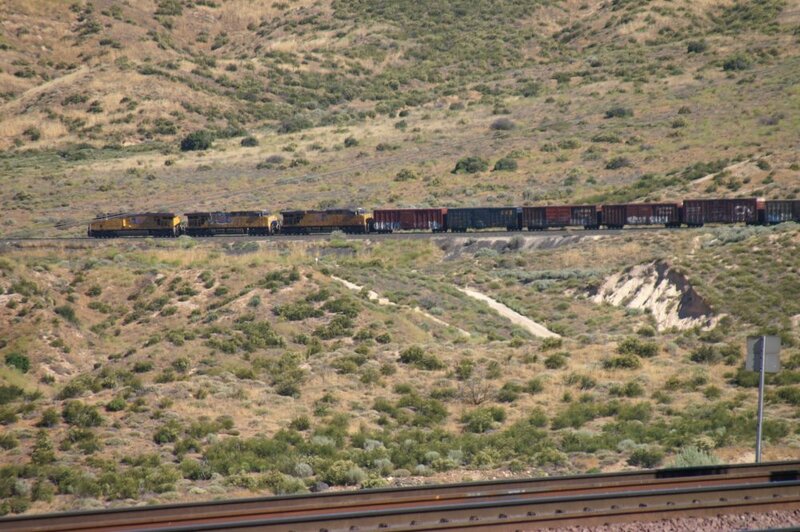 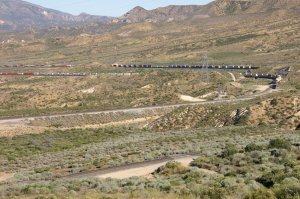 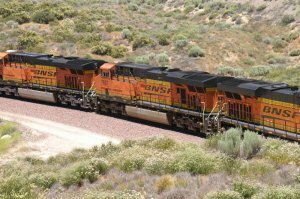 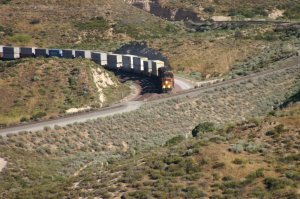 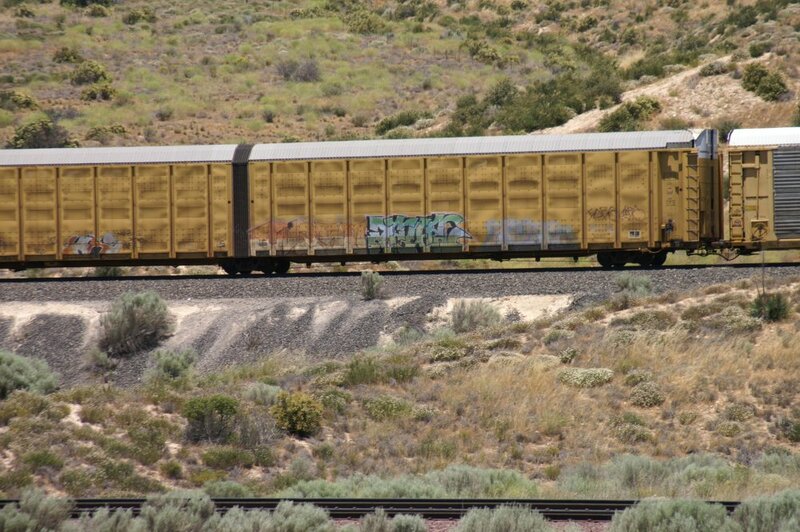 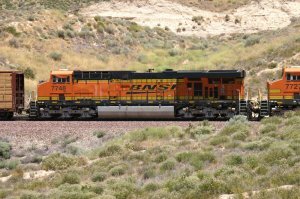 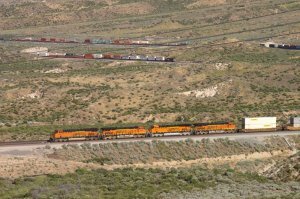 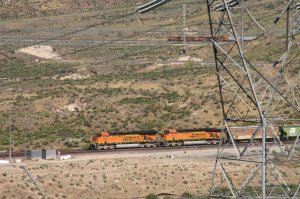 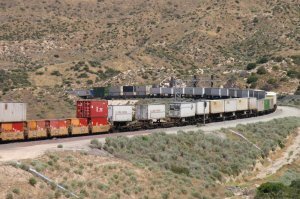 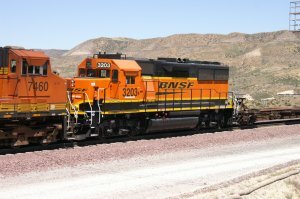 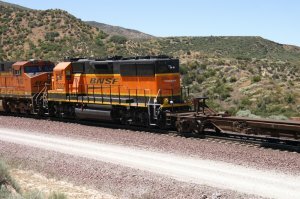 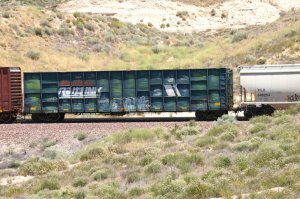 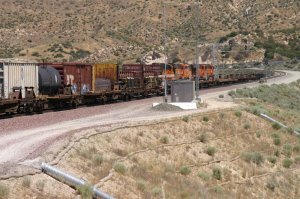 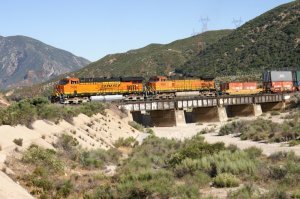 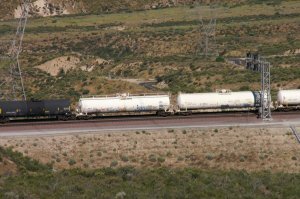 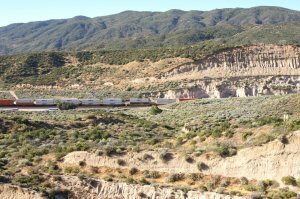 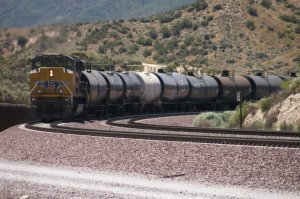 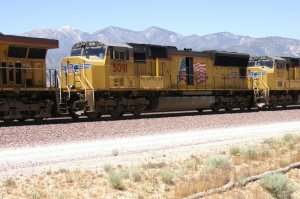 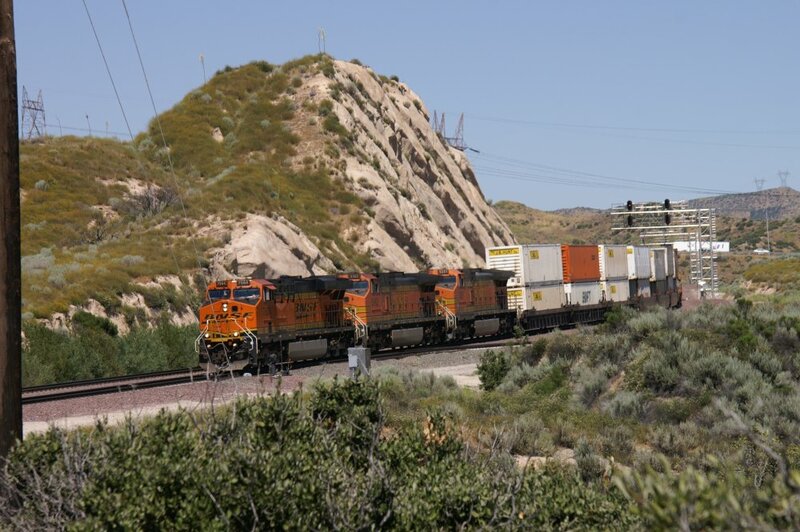 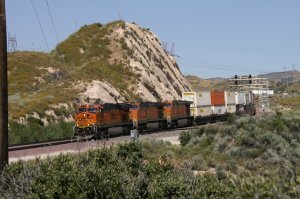 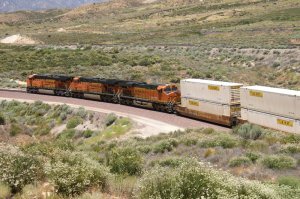 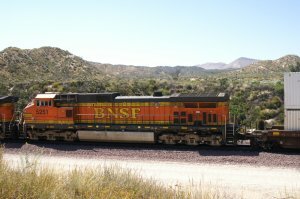 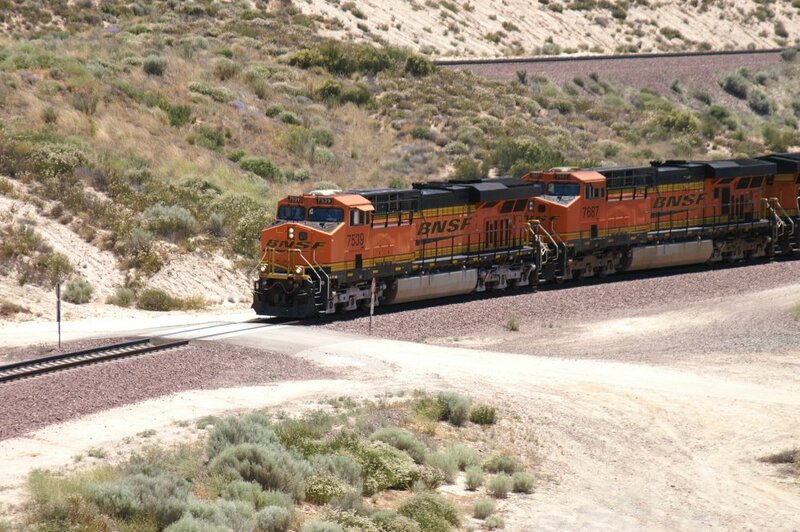 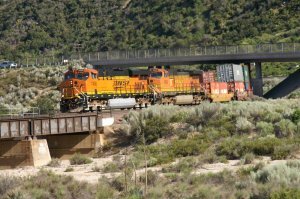 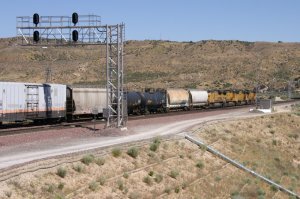 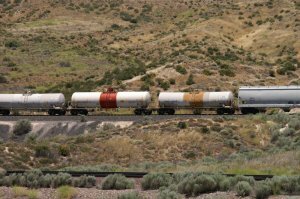 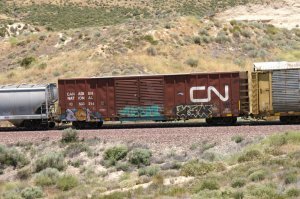 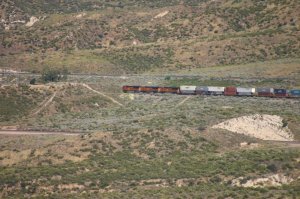 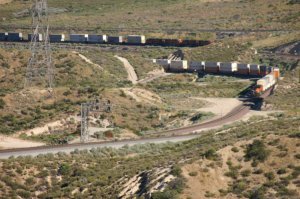 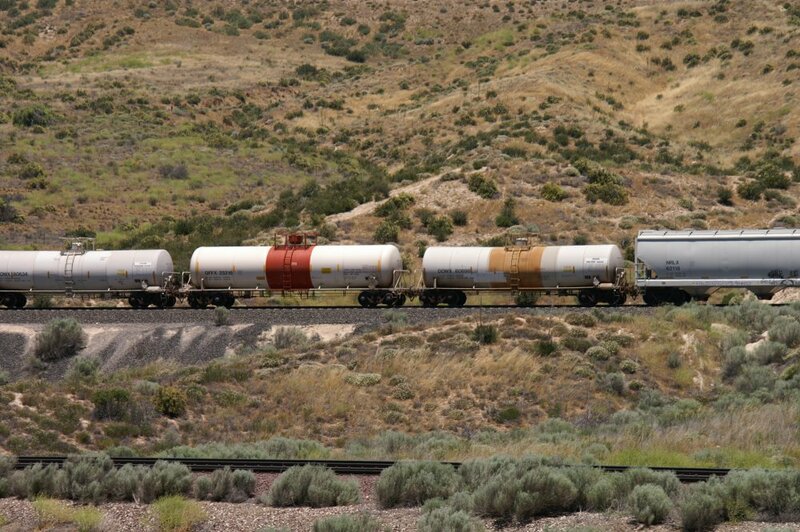 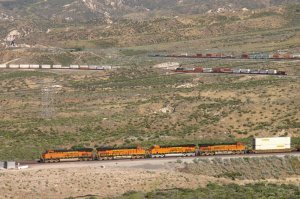 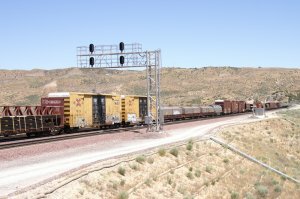 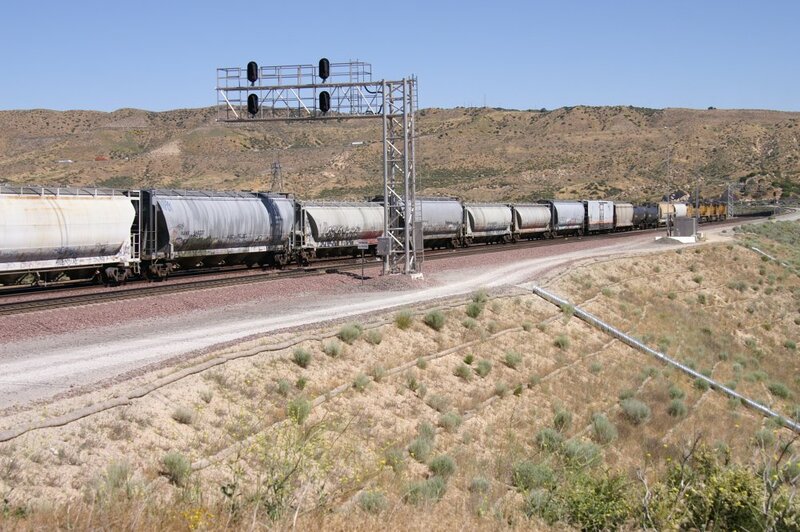 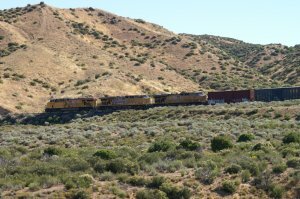 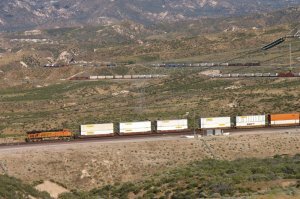 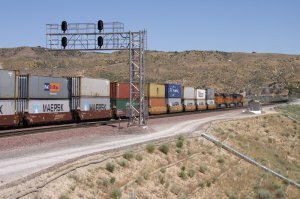 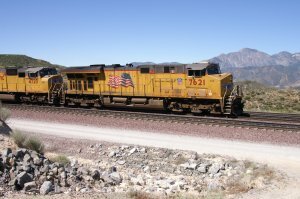 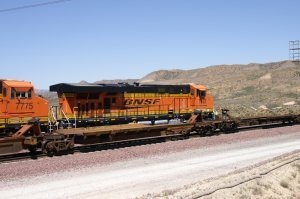 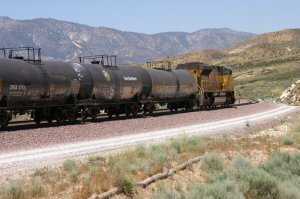 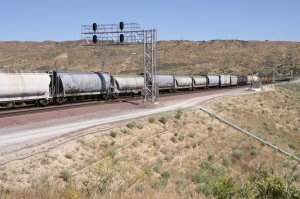 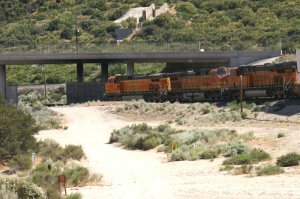 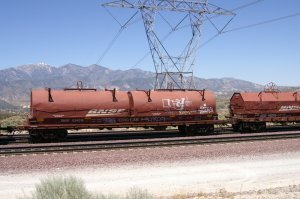 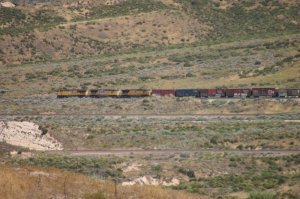 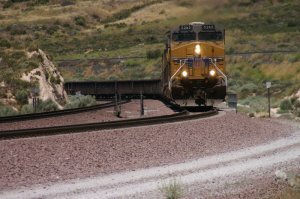 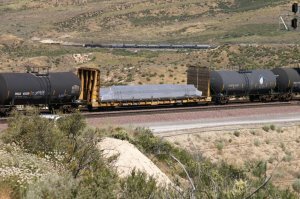 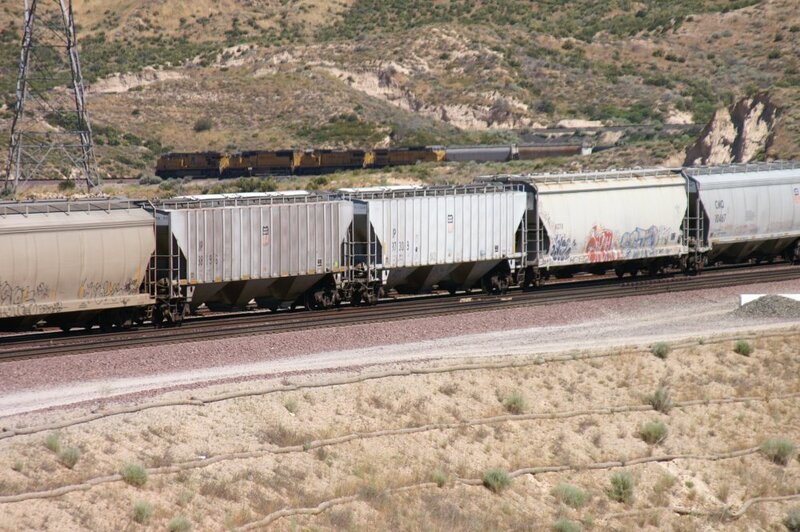 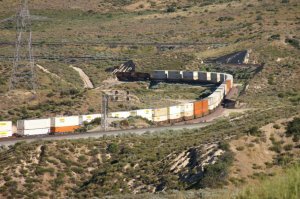 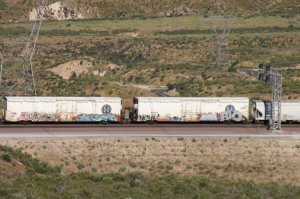 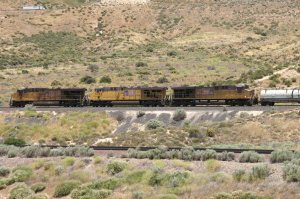 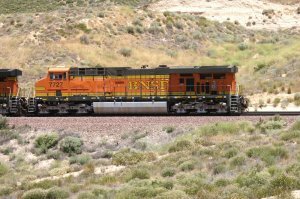 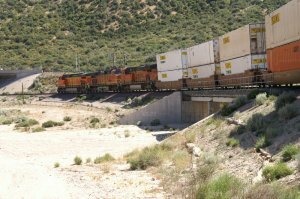 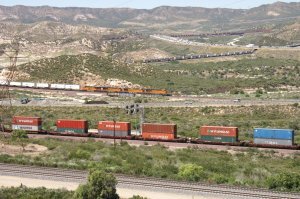 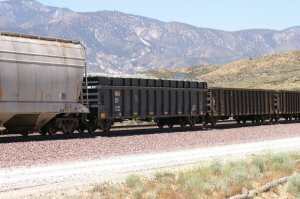 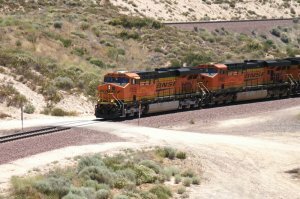 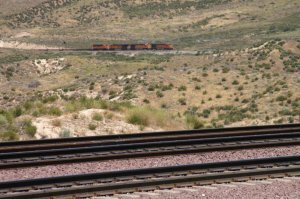 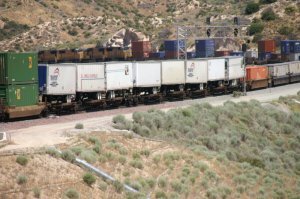 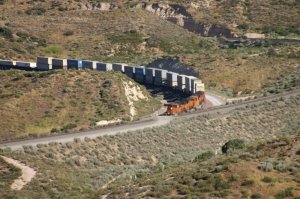 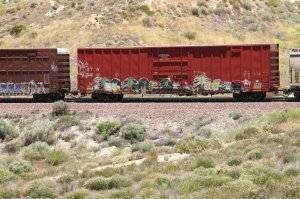 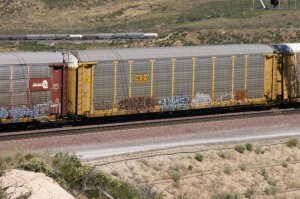 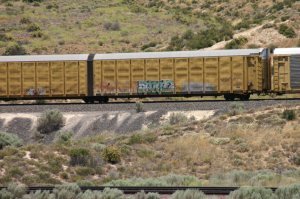 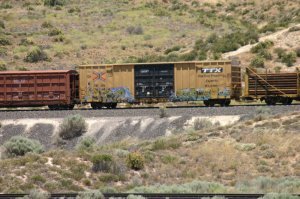 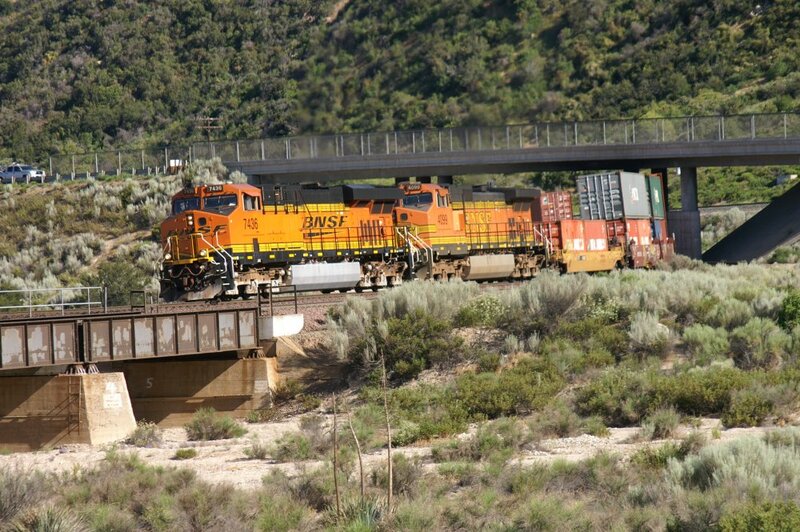 When I was arriving at the Mormon Rocks area, a BNSF WB showed up and I had just no time to go on the other side for the good sunlight. Therefore, photos 21159 to 21164 were taken from the shadow side. 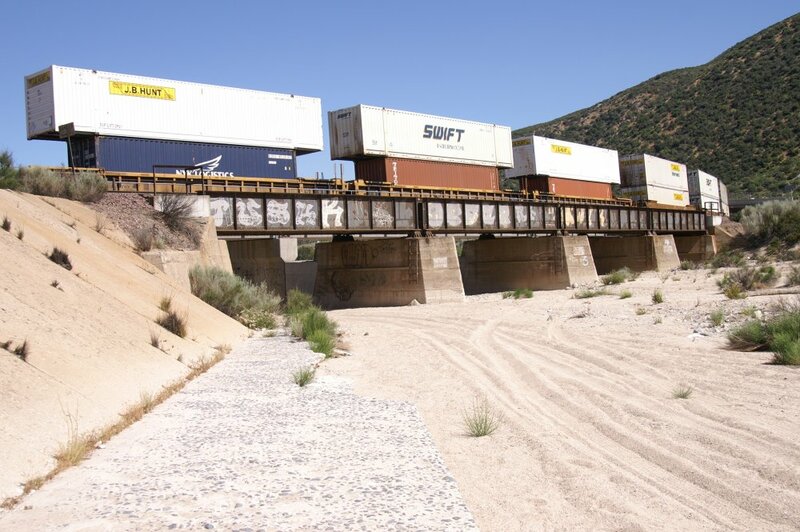 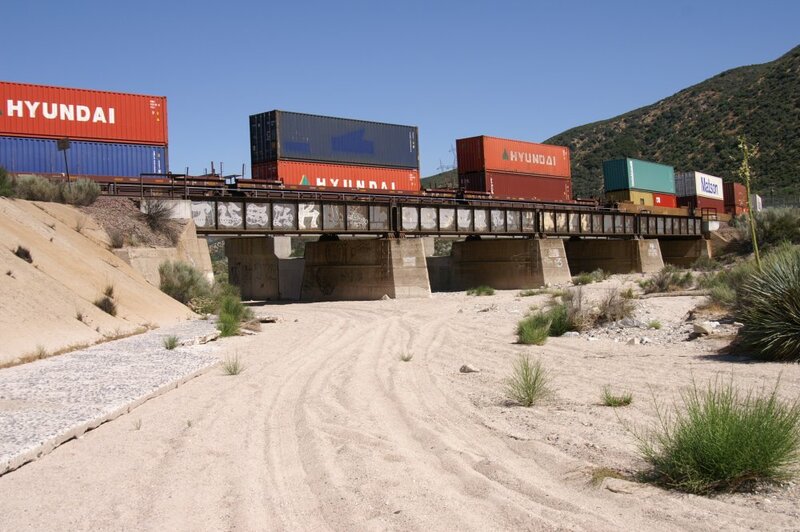 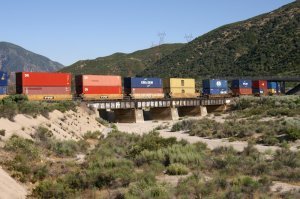 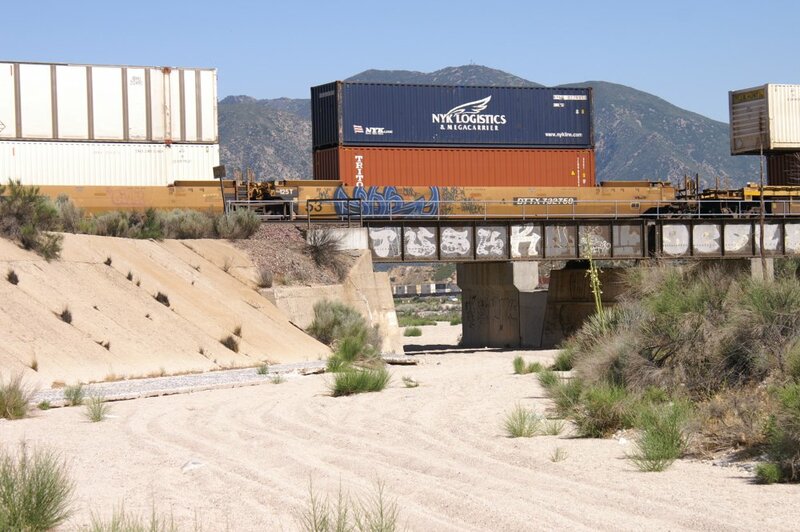 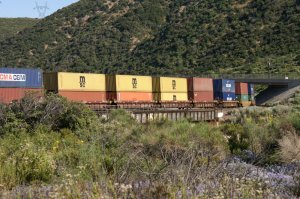 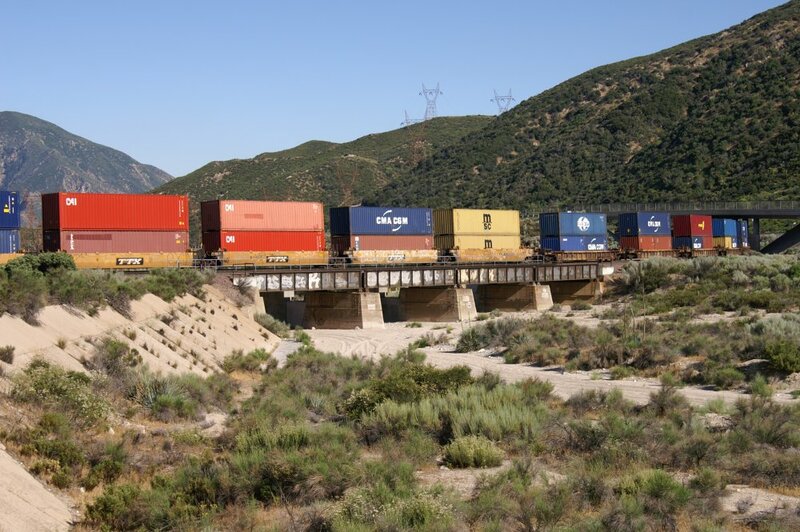 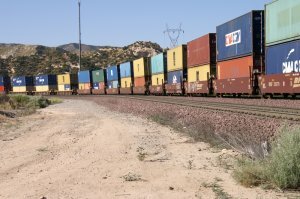 As it was once again an intermodal train, I decided to run under the Cajon Creek Bridge to the other side, the sunny side as you can see on the 6 photos below. 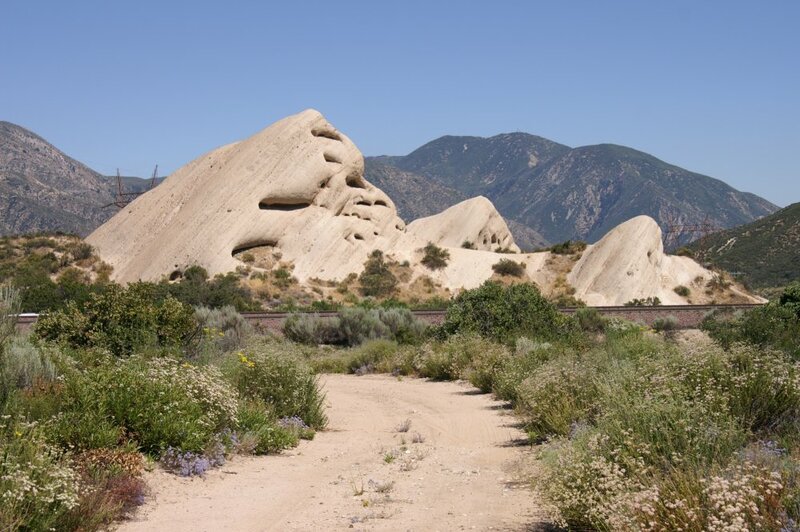 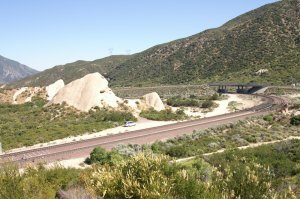 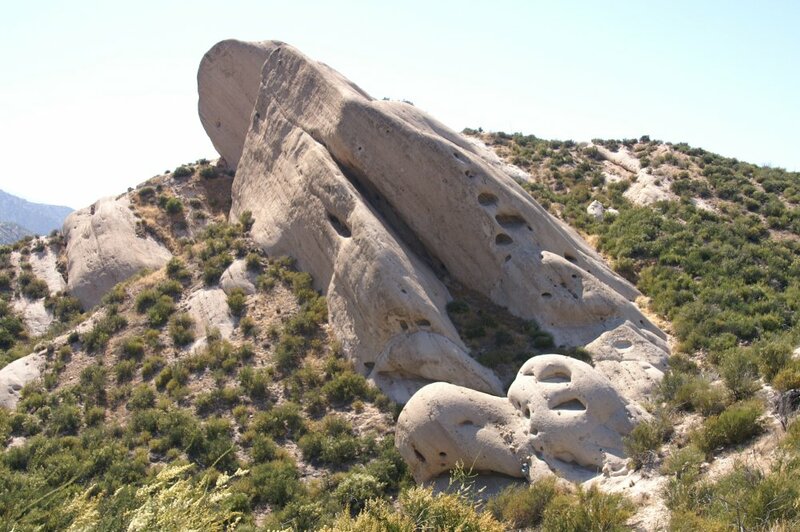 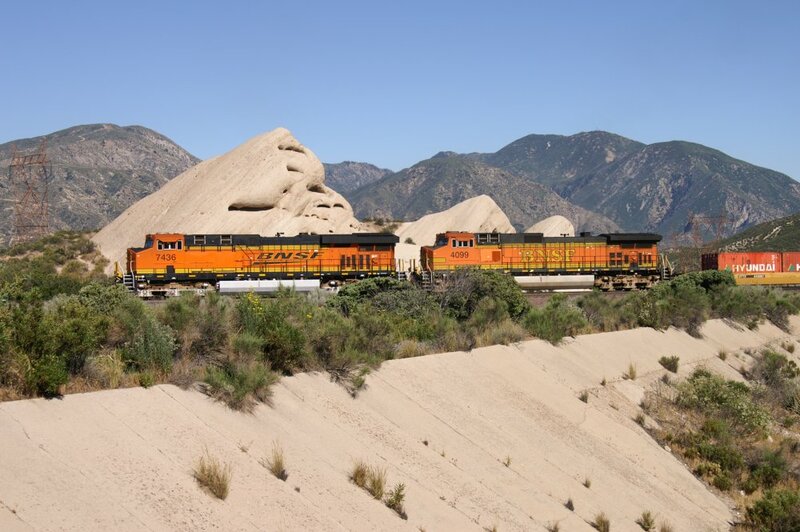 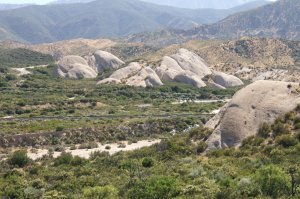 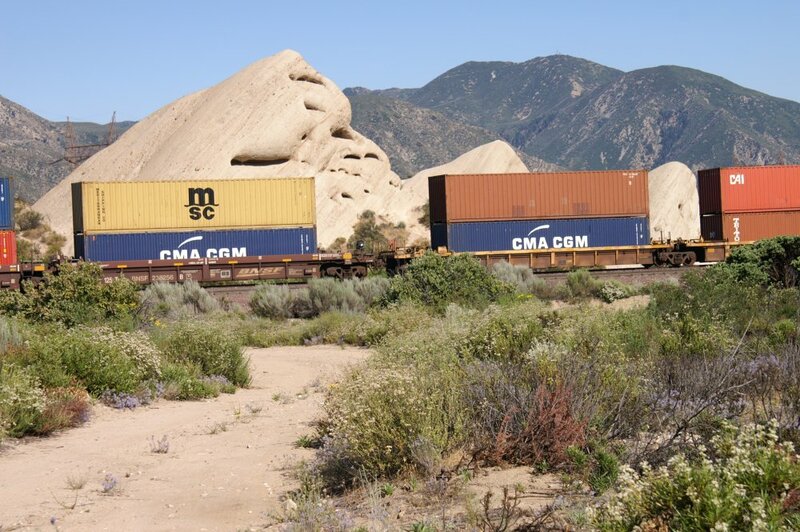 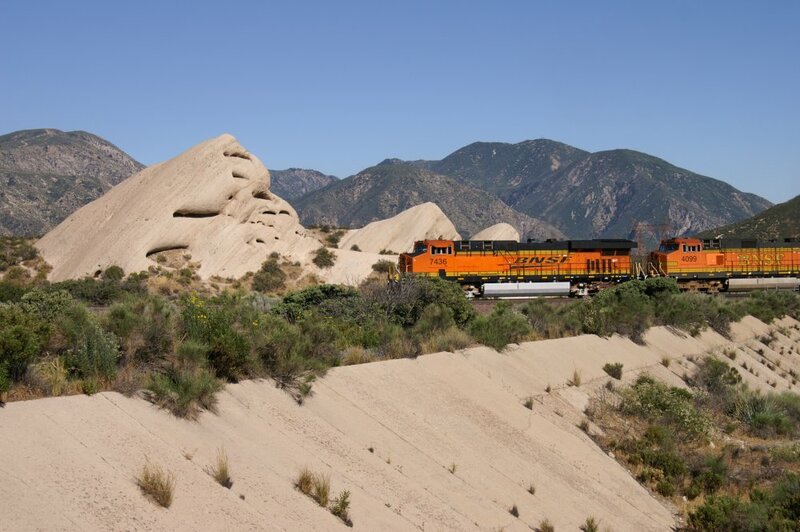 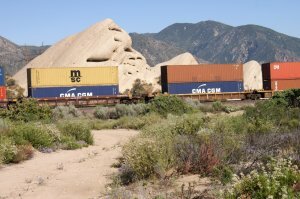 While waiting for another train, I took some photos of these special rock formations: The Mormon Rocks. 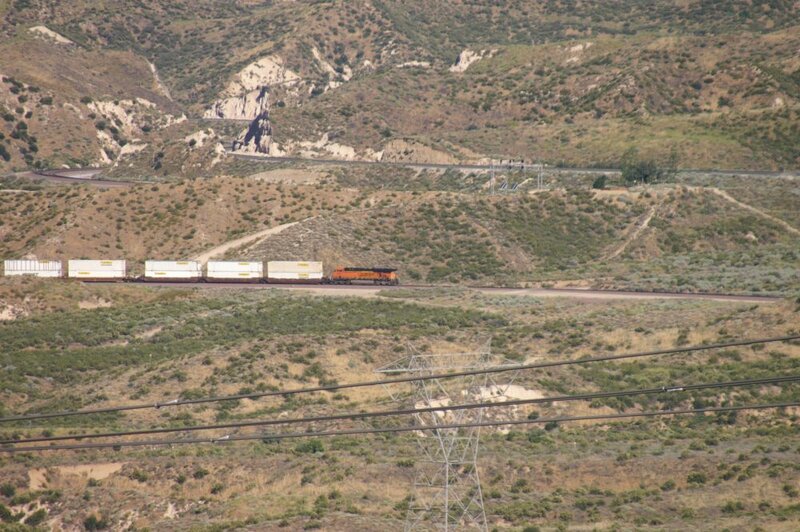 I did also change my position and went uphill. 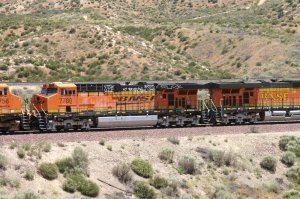 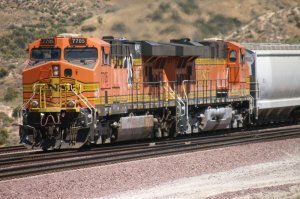 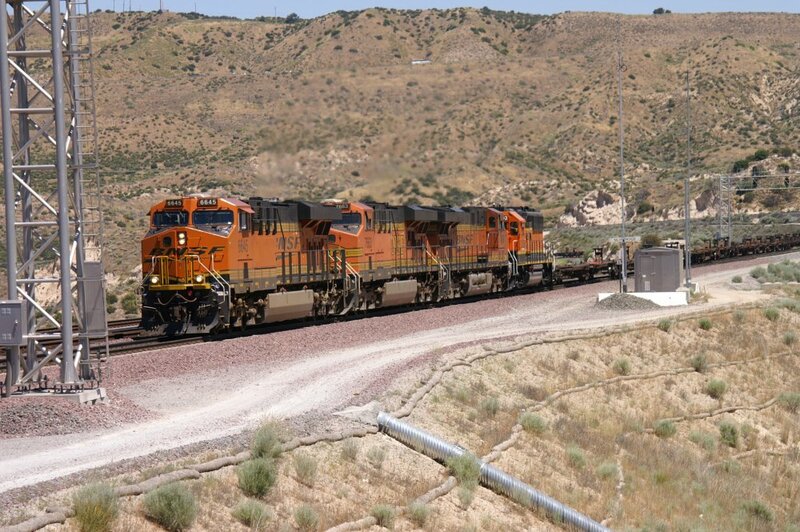 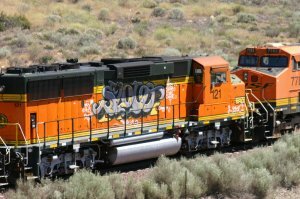 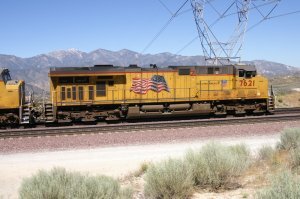 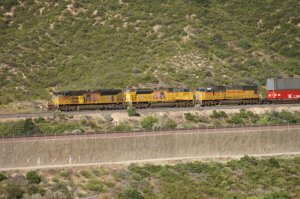 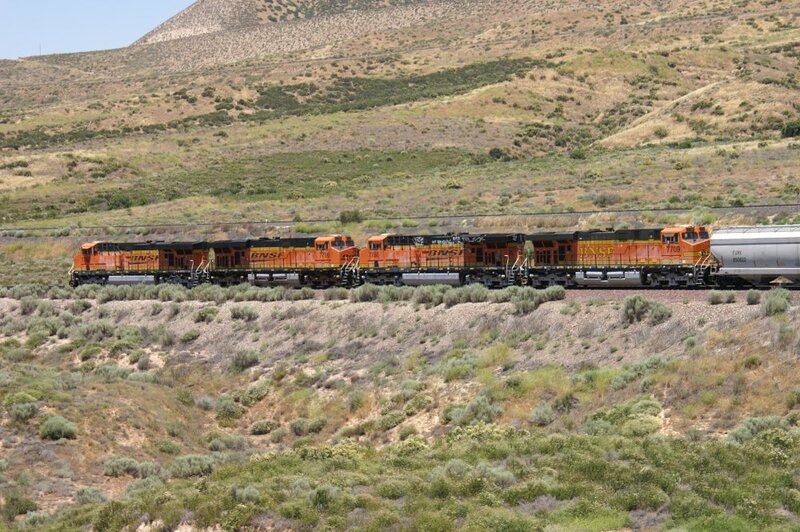 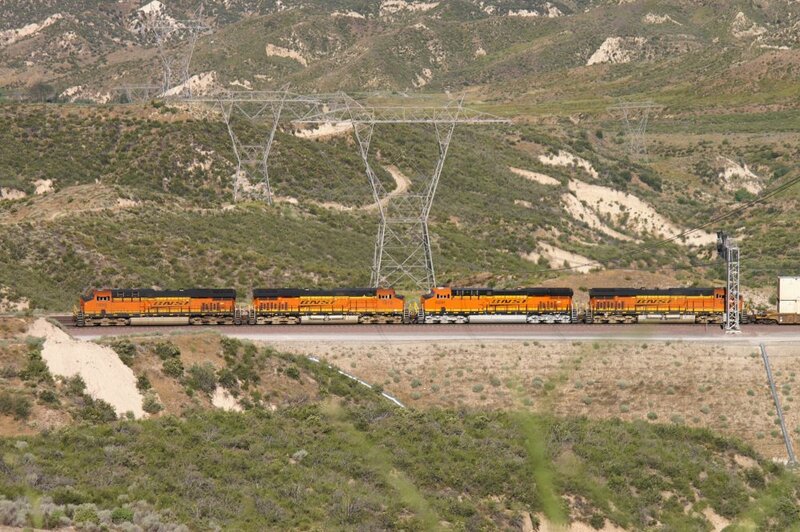 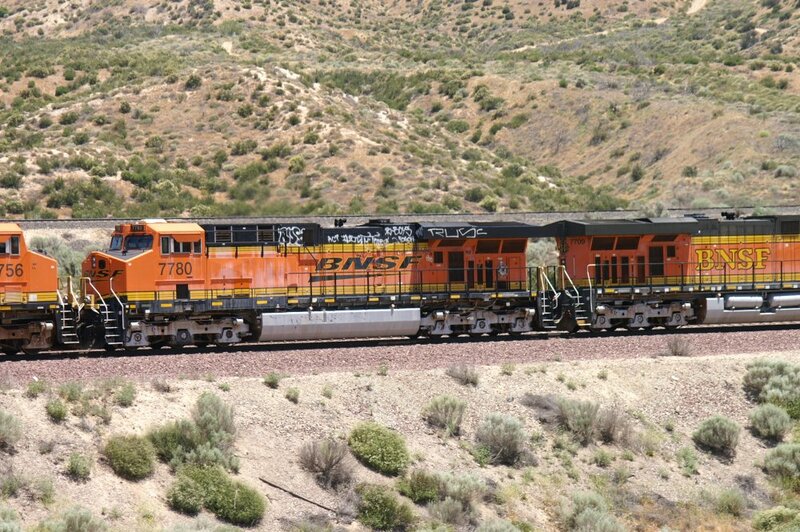 This UP helper set went uphill EB on BNSF MT-1 at 15.32 h. We got 2 EMD SD70ACe diesels. 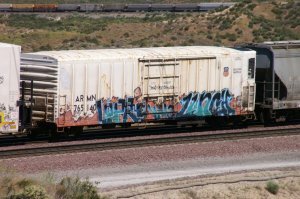 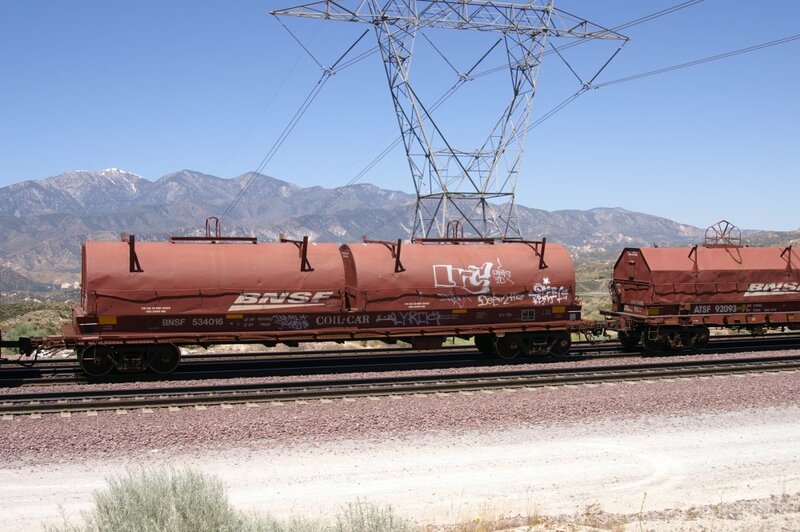 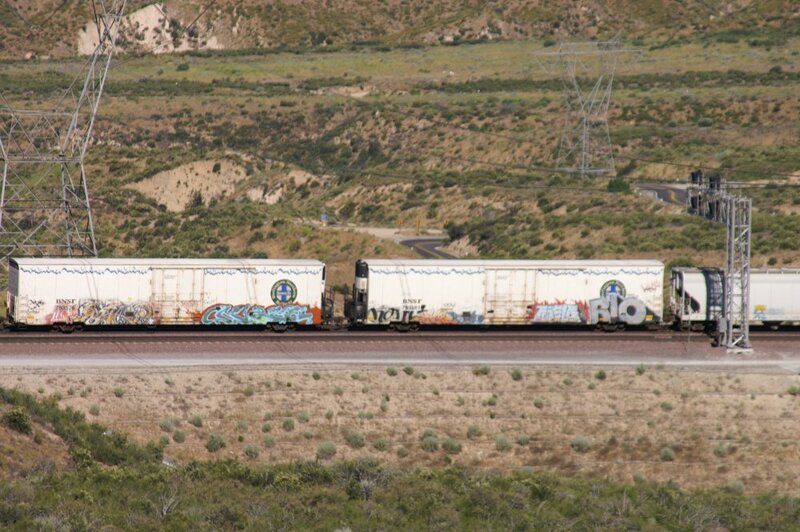 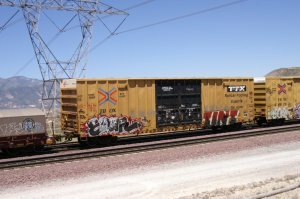 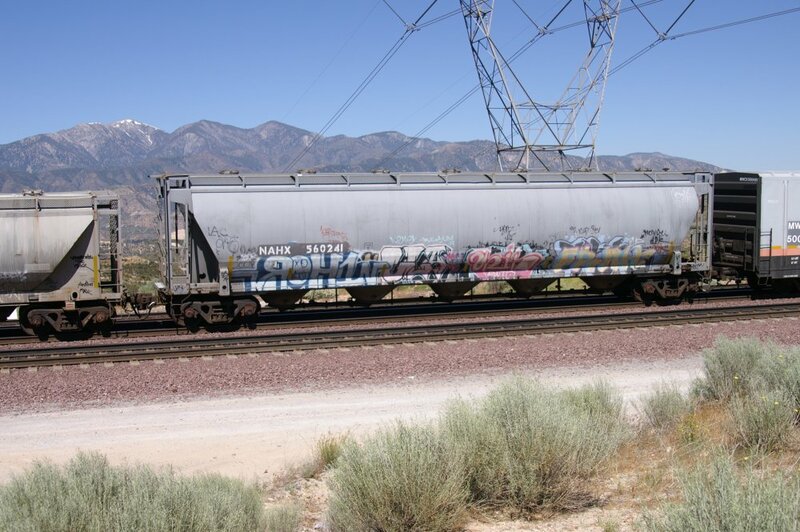 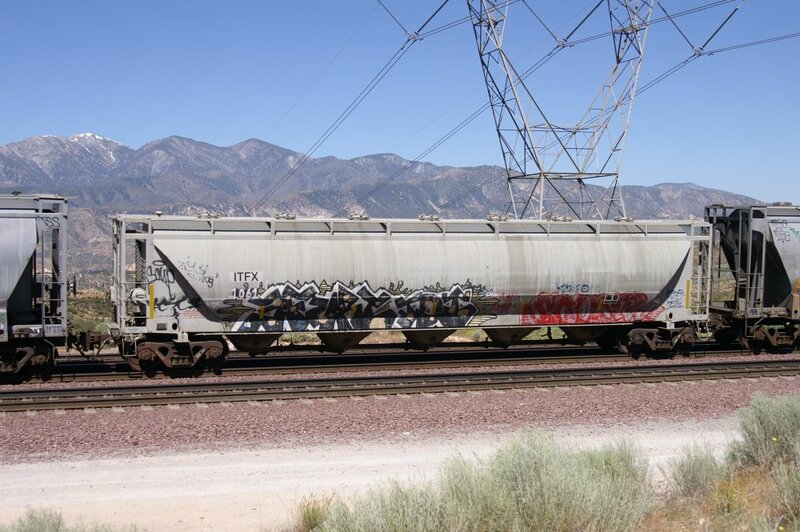 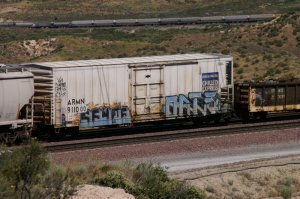 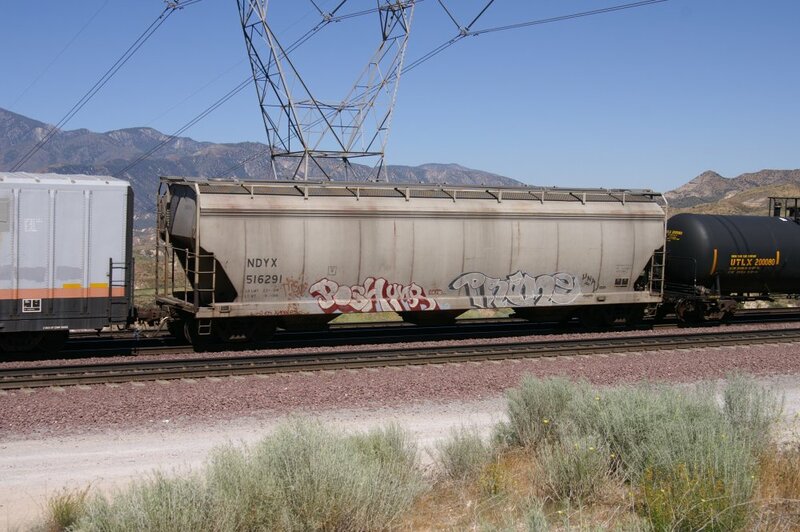 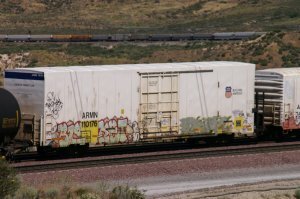 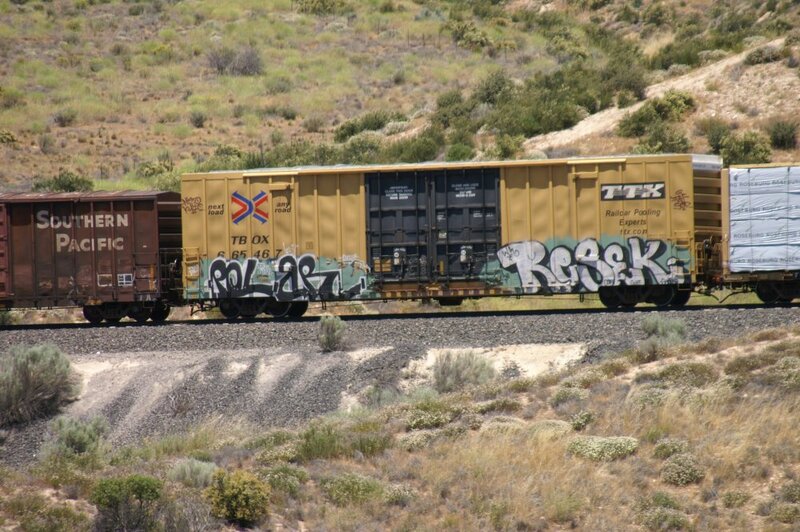 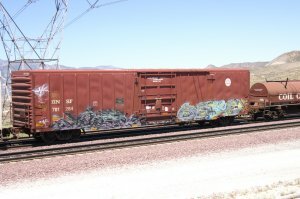 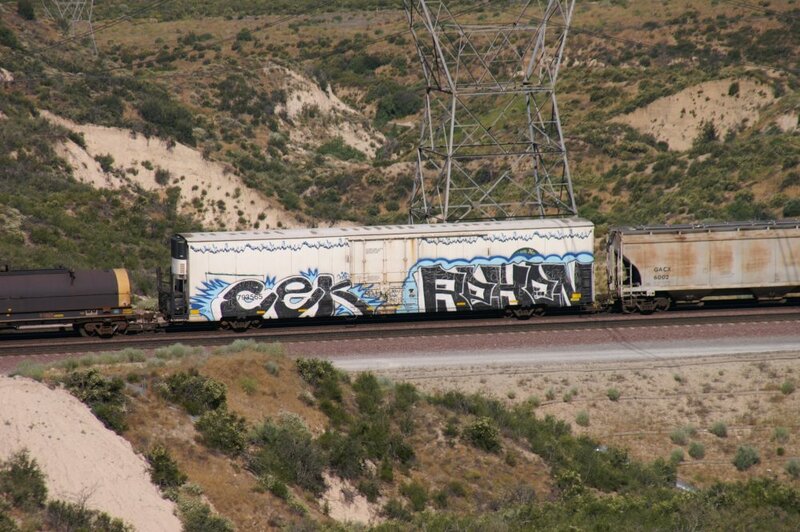 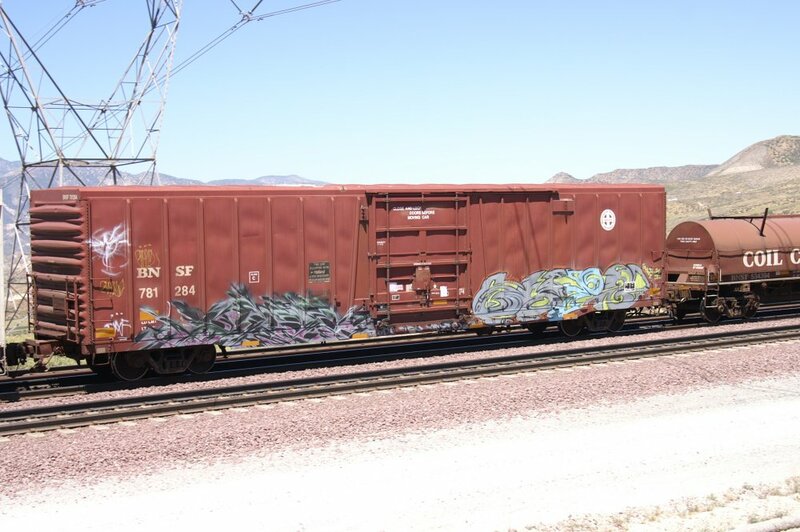 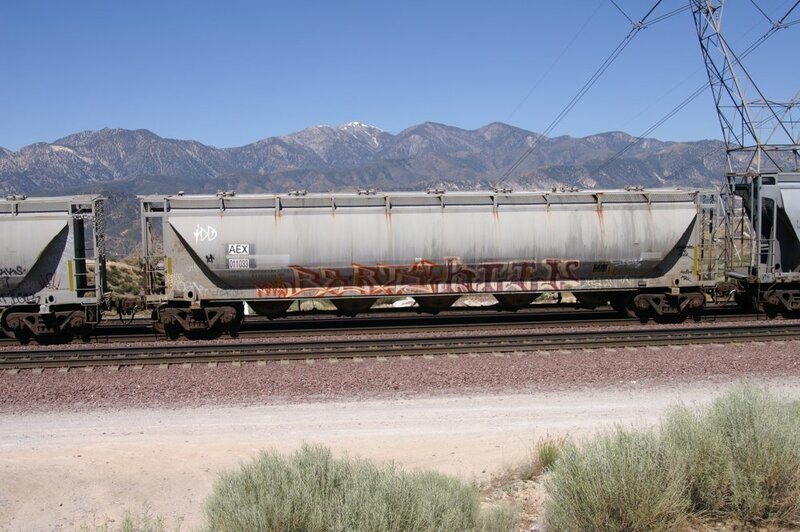 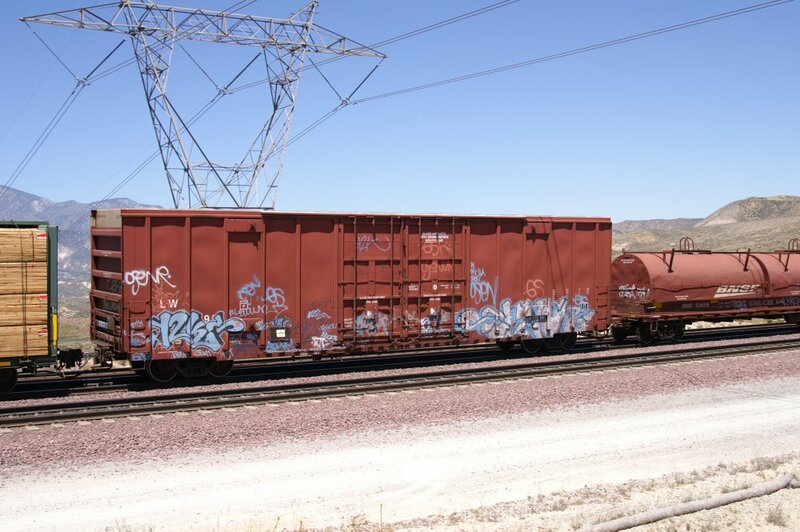 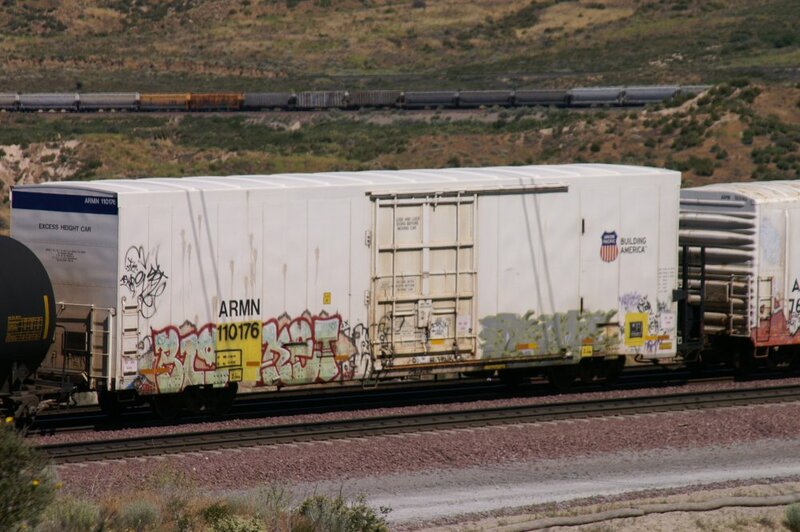 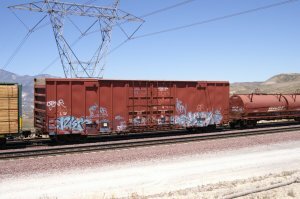 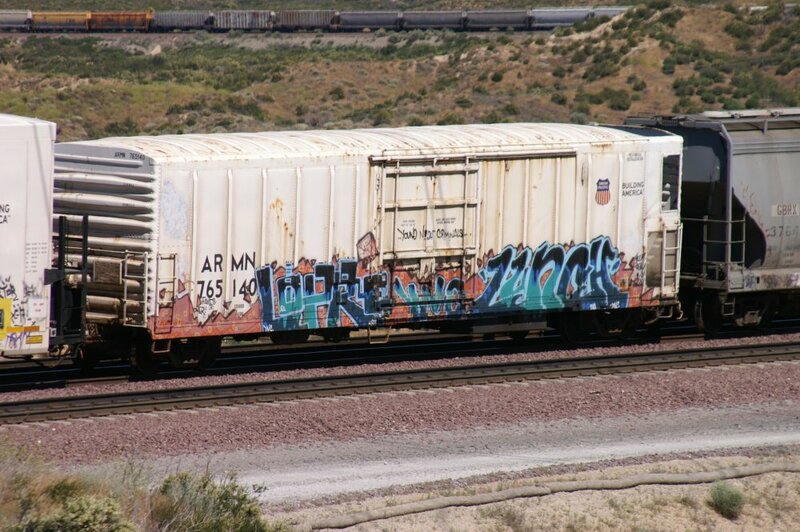 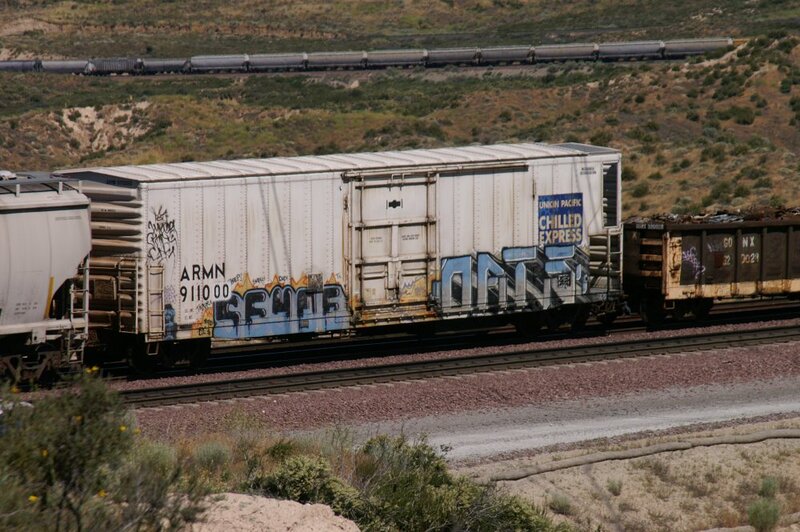 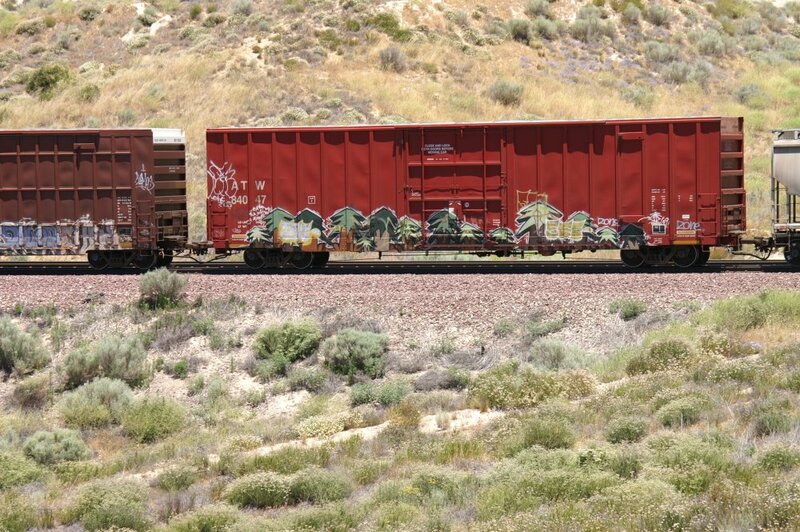 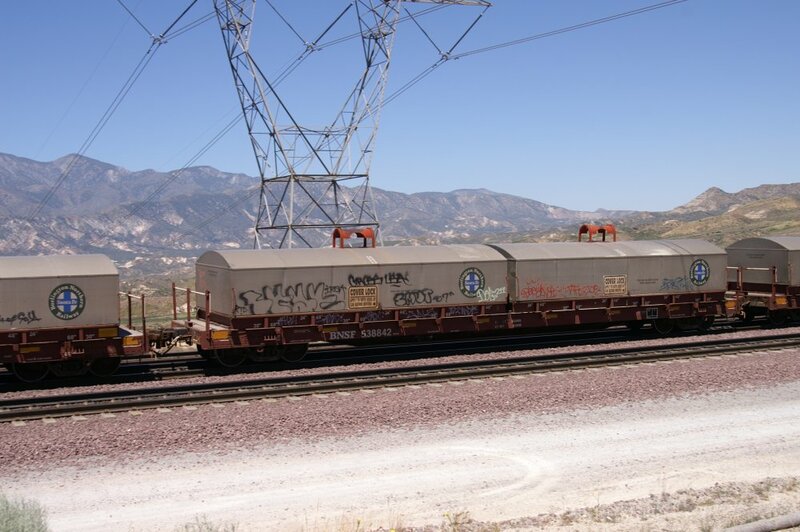 Next, at 17.23 h, was a BNSF EB bare table (empty intermodal cars). Well, I had to wait for almost an hour to get this BNSF EB. 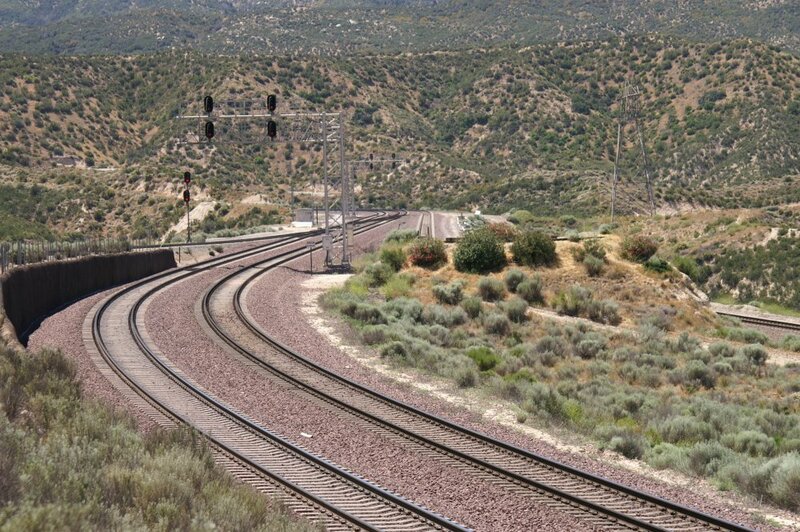 Afterwards, I went down for the next train. 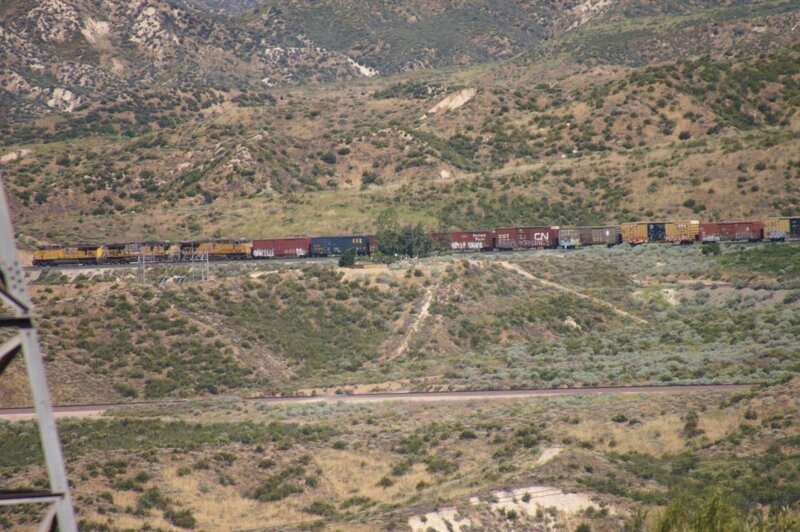 Today I went to 6 different locations within 10 hours. 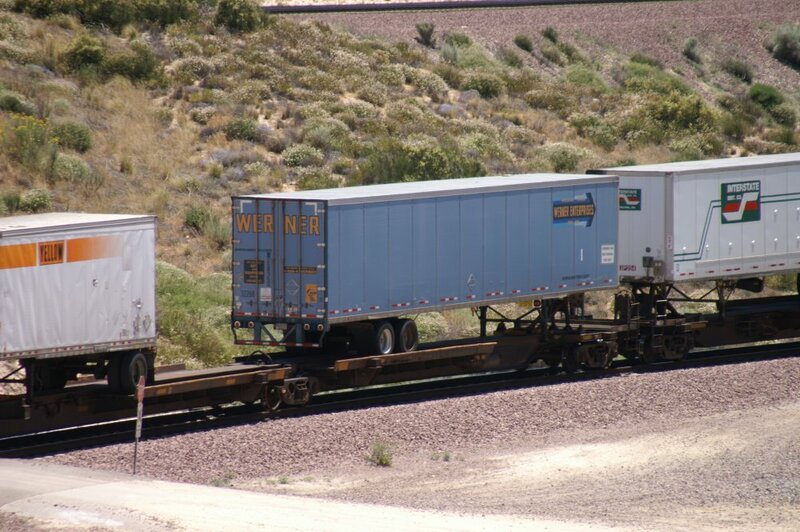 Once again, I was pleased with all the trains and some Werner Trailers as well.